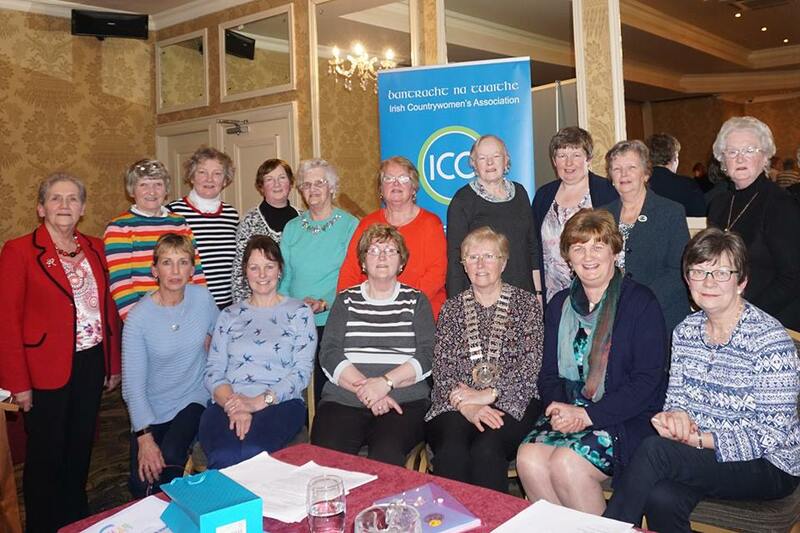 ​Ladies from all Guilds gathered at Kilmore Hotel last Wednesday, 13th February 2019 for the ICA Federation meeting. 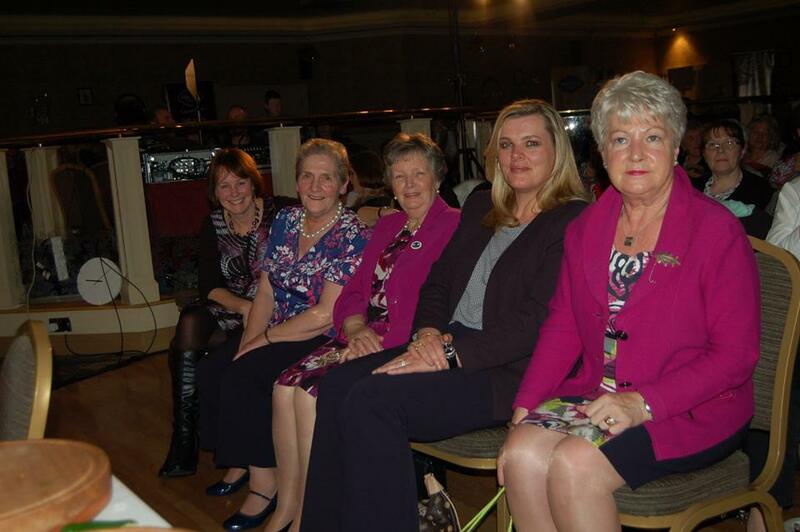 Guest of honour on the night was Regional President, May Campbell. May addressed the meeting and outlined the structure of ICA. 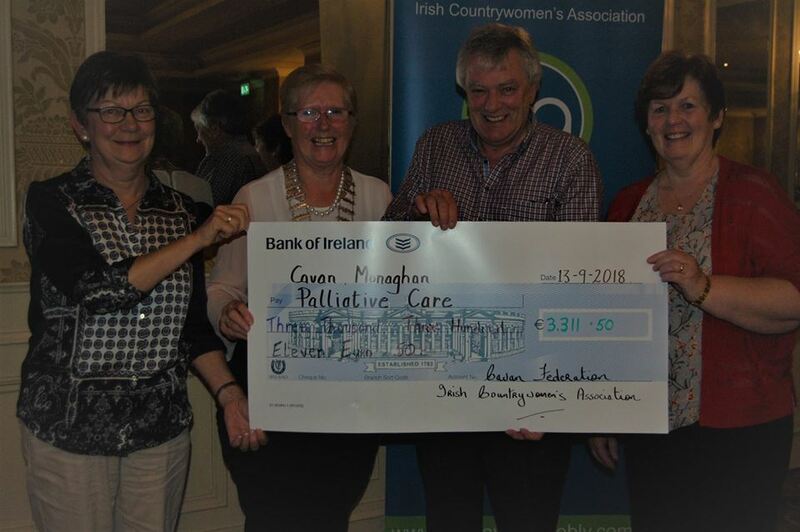 Jimmy O'Donnell, Cavan/Monaghan Palliative Care, was delighted to receive a cheque for €3,311.50 from Cavan Federation ICA, at a meeting in Kilmore Hotel on Thursday, 13th September 2018. 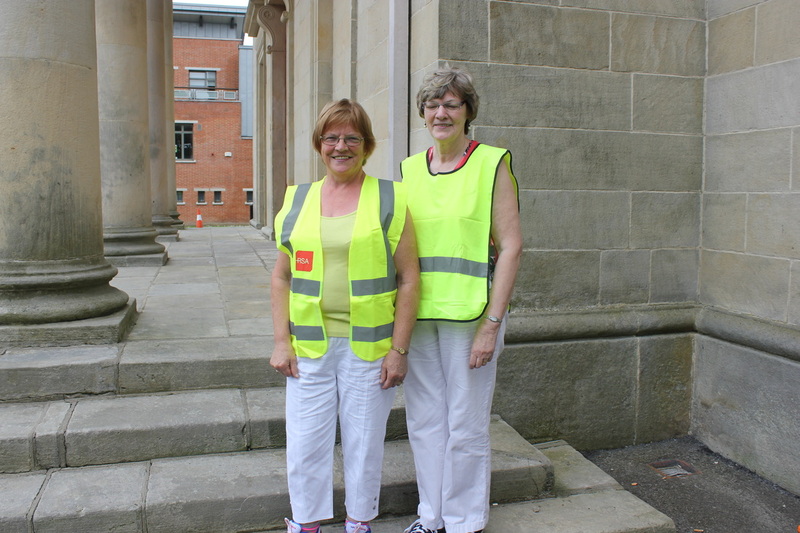 The funds were raised from the Annual Walk held in May last. 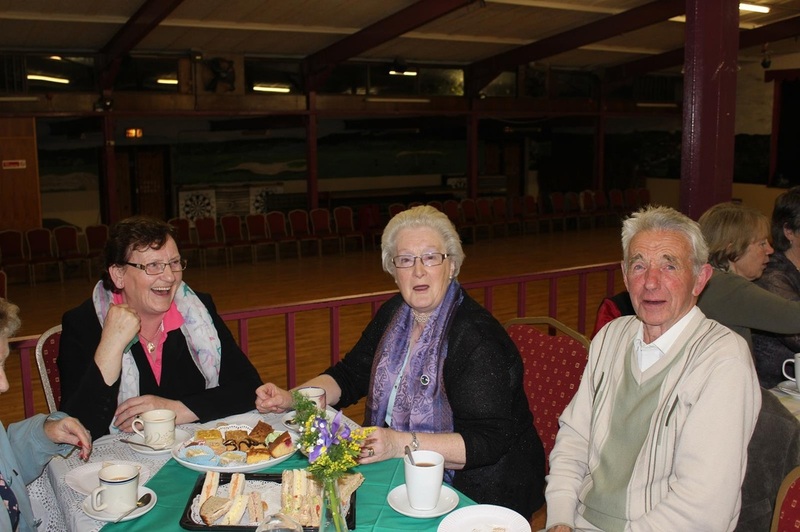 Winifred Acheson, Federation Treasurer, Mary Duffy, Federation President, Jimmy O'Donnell, Cavan/Monaghan Palliative Care, and Maureen Murray, Federation Sports Promoter. 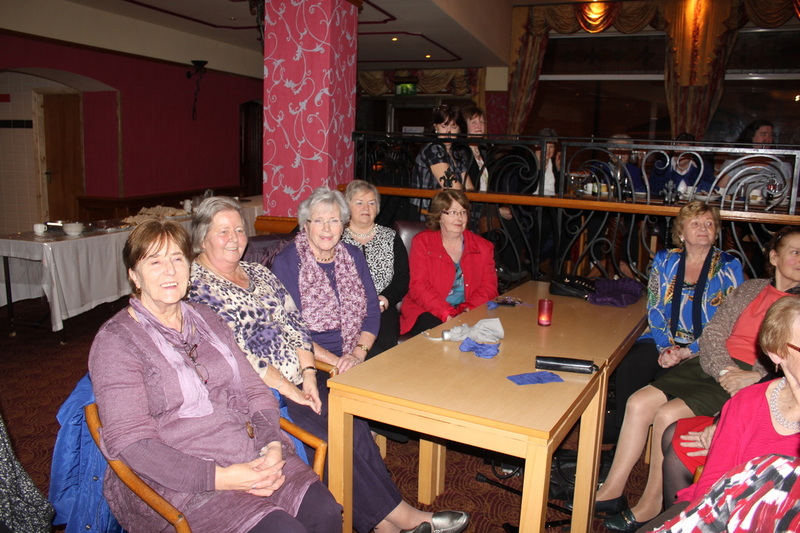 Cavan ICA Guilds met in Clifferna on Thursday last,14th June for the annual Fun Night. 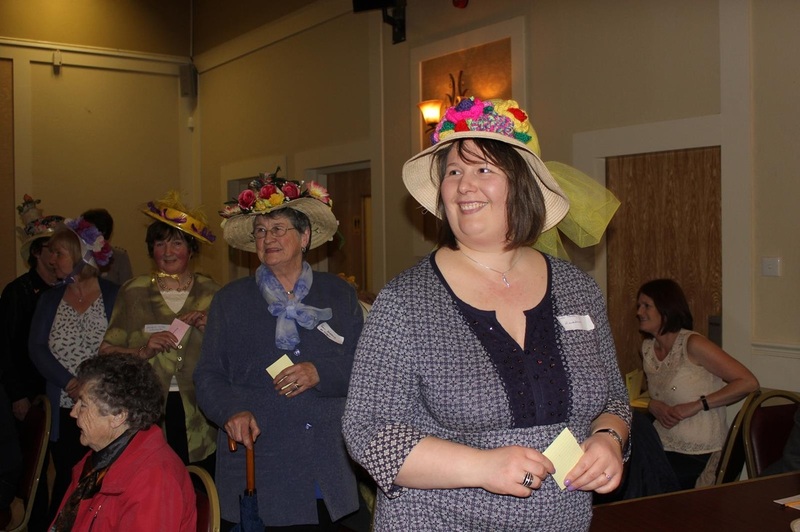 The Table Quiz was held and a competition for Fun Fascinator. 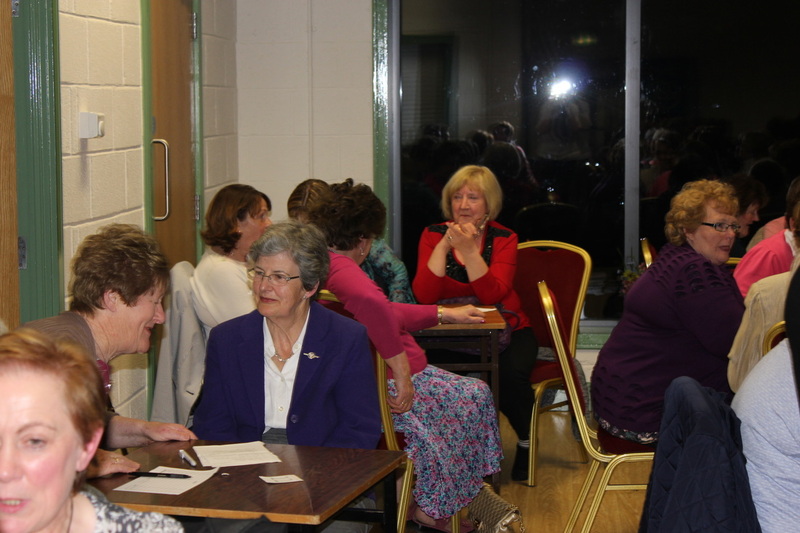 A huge 'Thank you' to Quizmaster, Larry McGinn, who set and asked the questions, and really tested the ladies at times! 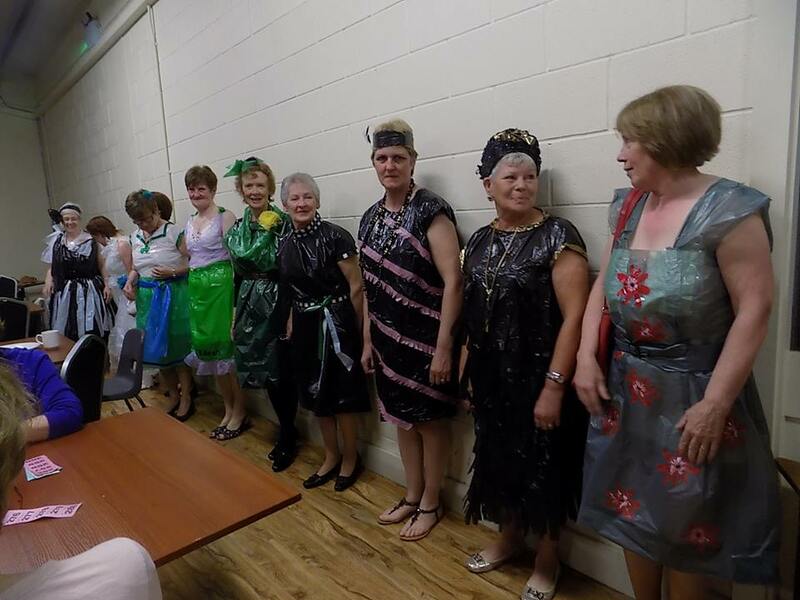 Congratulations to Killeshandra Guild, who was in First place, Shercock Guild (and Margaret Smith, Crosserlough) in Second place and in Third place was Maghera Guild. 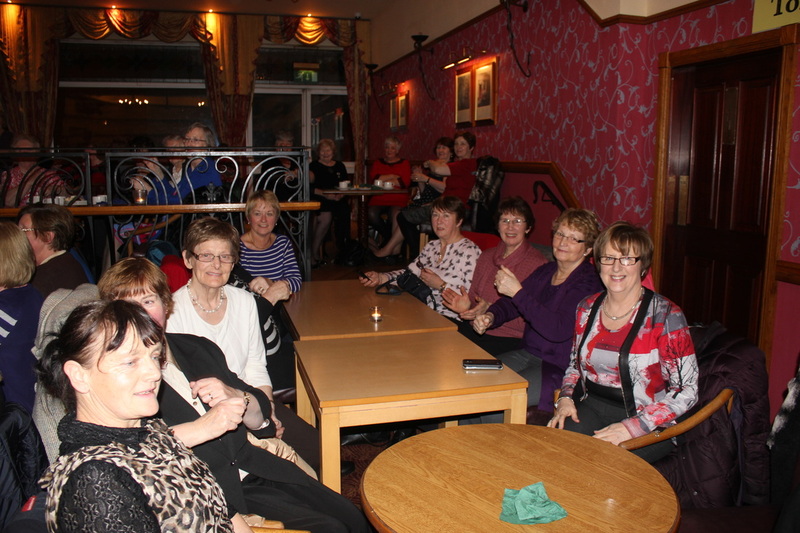 ​A very enjoyable evening was had by members and friends from various ICA Guilds in Cavan. 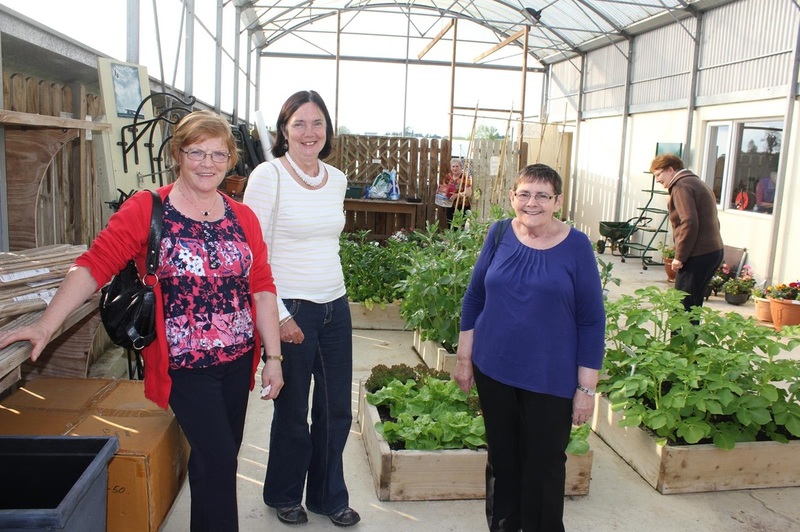 Over one hundred ladies were welcomed to the Bord Bia Award winning garden and lifestyle centre by Federation President, Mary Duffy and also by horticulturists and owners, Roslyn and Niall. Roslyn informed those present about bees or the lack of bees! She showed us plants that are good for attracting bees into the garden. 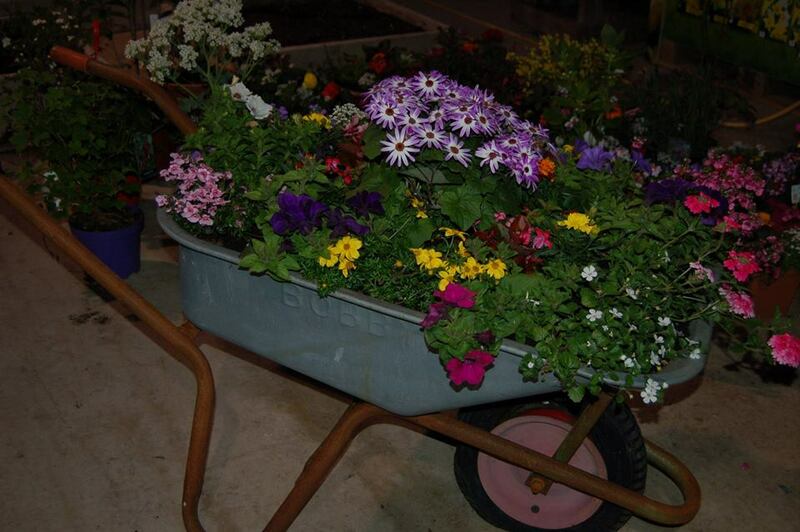 Beautiful displays of potted plants and hanging baskets were admired by all. 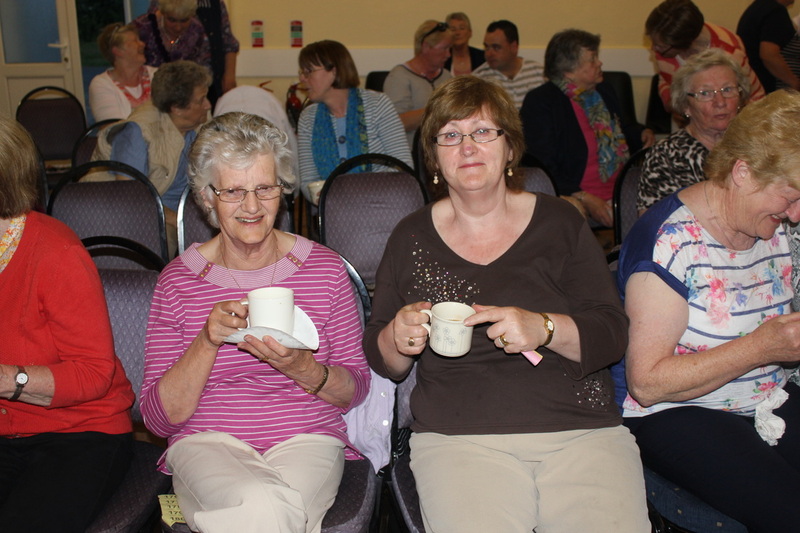 A welcomed cup of tea and beautiful homemade scones and cakes were enjoyed by everyone. 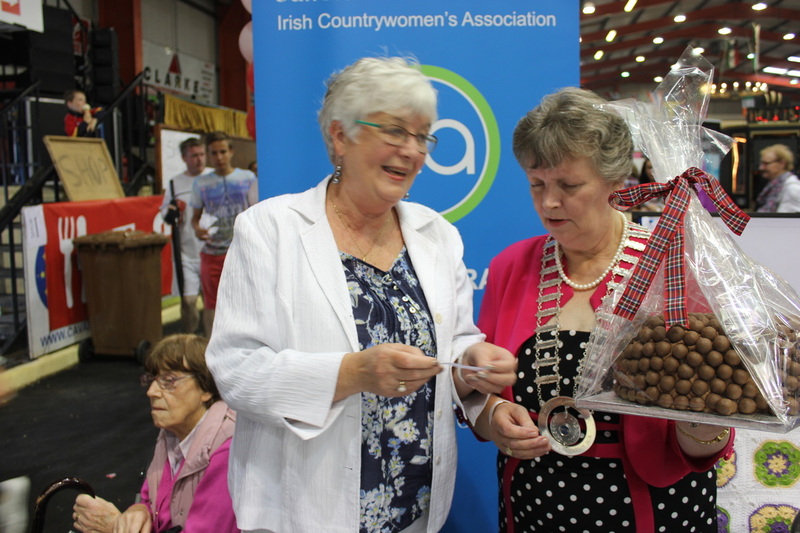 Many winners went home with prizes after a raffle was held, and one lucky lady won two tickets for Bloom, sponsored by Tullyvin Garden Centre. 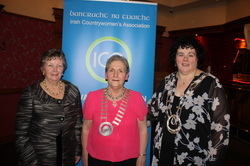 Cavan Federation ICA AGM was held on Wednesday, 25th April last in Hotel Kilmore. 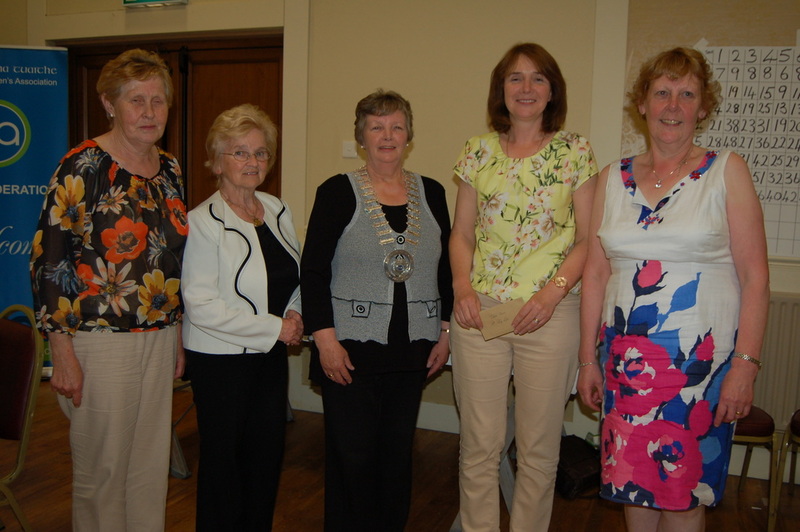 Congratulations to newly elected Federation President, Mary Duffy a member of Killeshandra Guild. 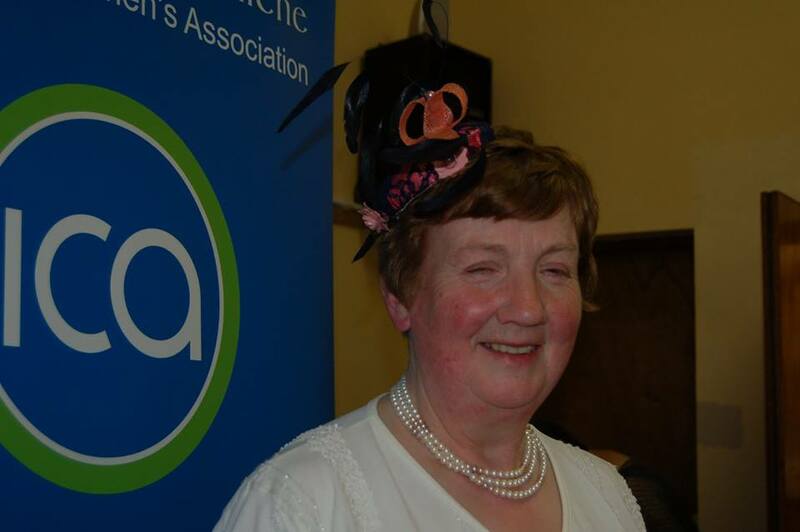 Sincere 'Thank you' to Anna Rose McCormack, outgoing President for all her hard work and great leadership over the years. 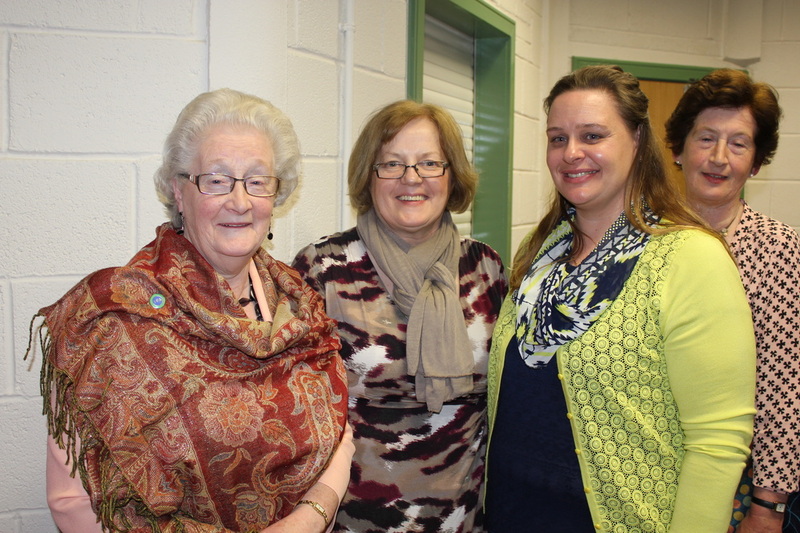 As a 'Thank you' Mary Duffy made a presentation to Anna Rose. 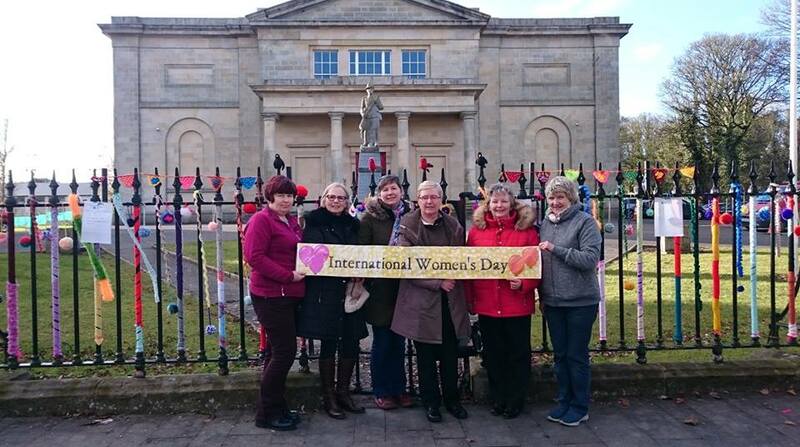 ​Cavan Federation ICA hope all you ladies had a Happy International Women's Day last Thursday, 8th March 2018. 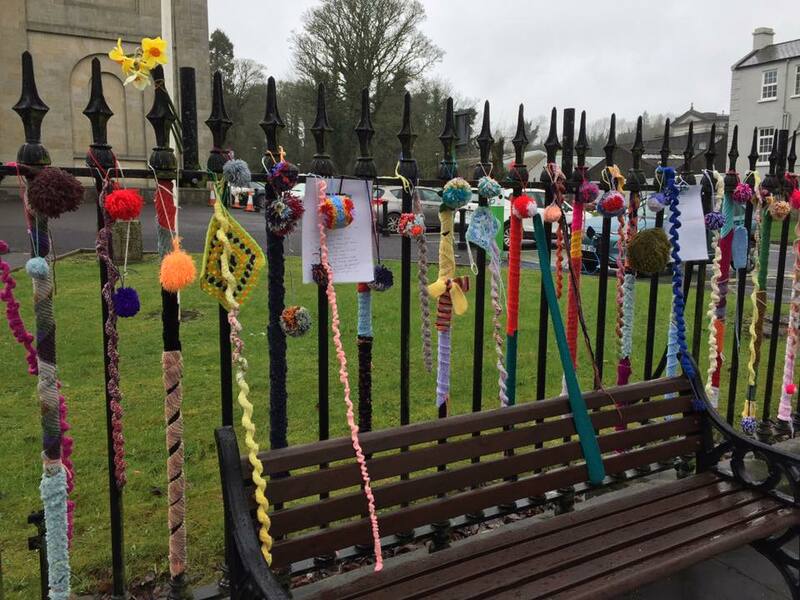 Here are some photos from that day outside Cavan Courthouse, where a group of ICA ladies decorated the railings with Yarn...Yarnbombing is what this activity is called. Well done ladies! 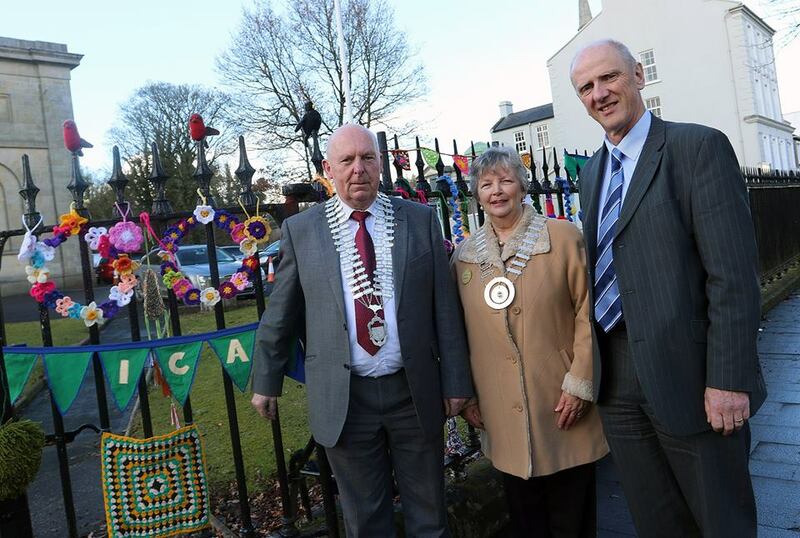 The Birds and the circles were knitted by Hazel Gumley, Cavan Guild and Federation Competition Secretary. The Circles represent the 19 Guilds in the county. 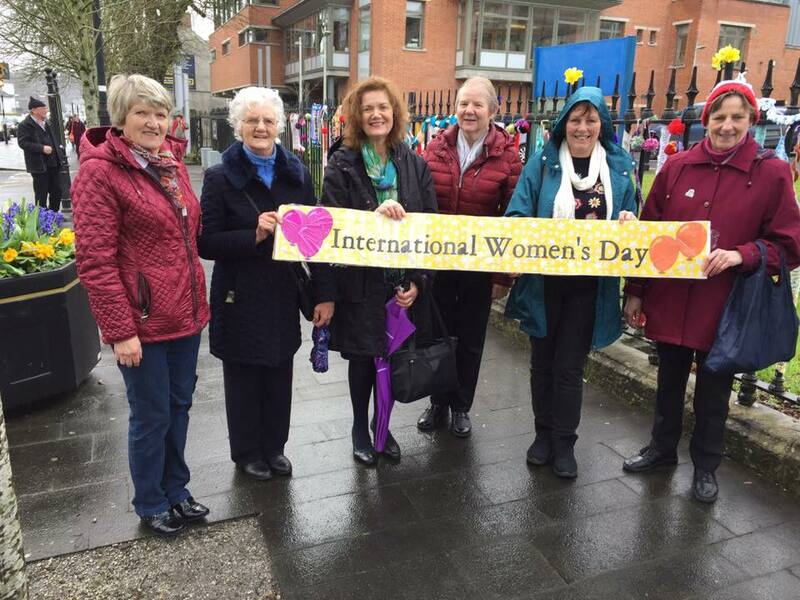 ​International Women's Day will take place on 8th March. 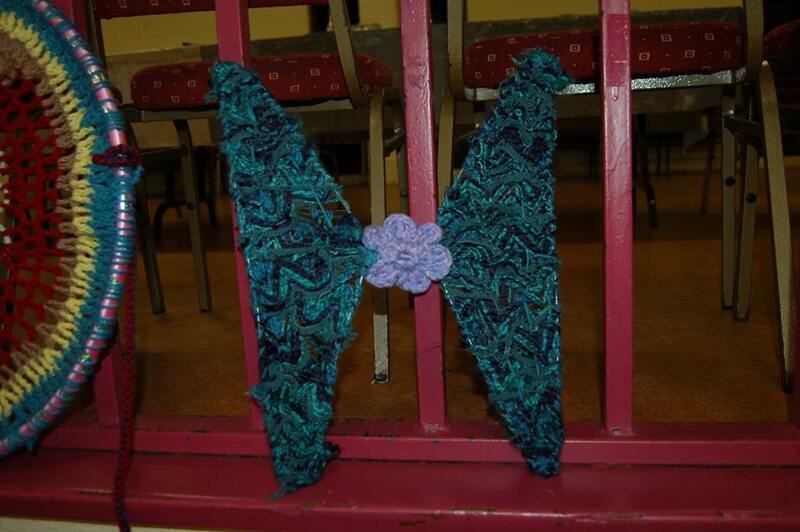 Guilds presently are busy knitting and crocheting long pieces of yarn to hang on the railings of Courthouse in Cavan. 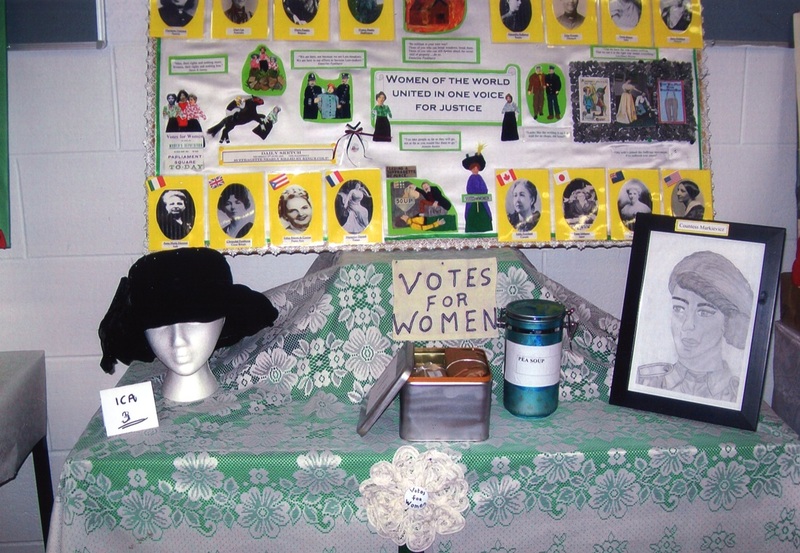 Photographs below give an idea of the type of work going on in the Guilds to support International Women's Day. 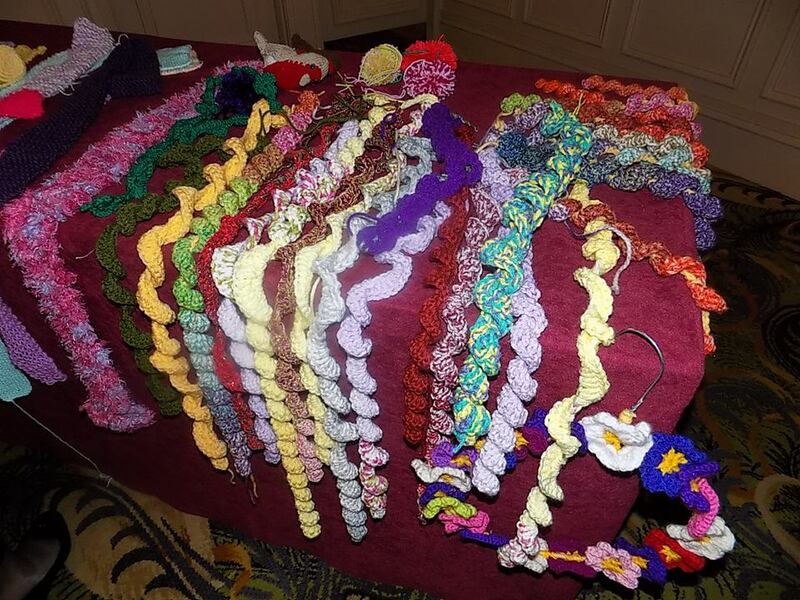 ​Susan Potts, Drogheda Guild, Co Louth attended the Cavan ICA Federation Meeting in Ballinagh Hall on Wednesday, 8th November 2017 informing members about Yarn Bomb, an idea she encountered in Portugal, while on holiday. 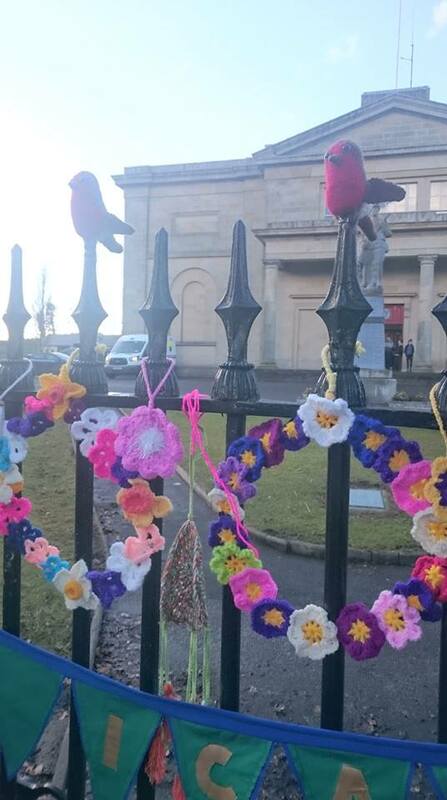 Yarn Bomb is about knitting or crocheting displays and hanging them from trees, railings, etc. 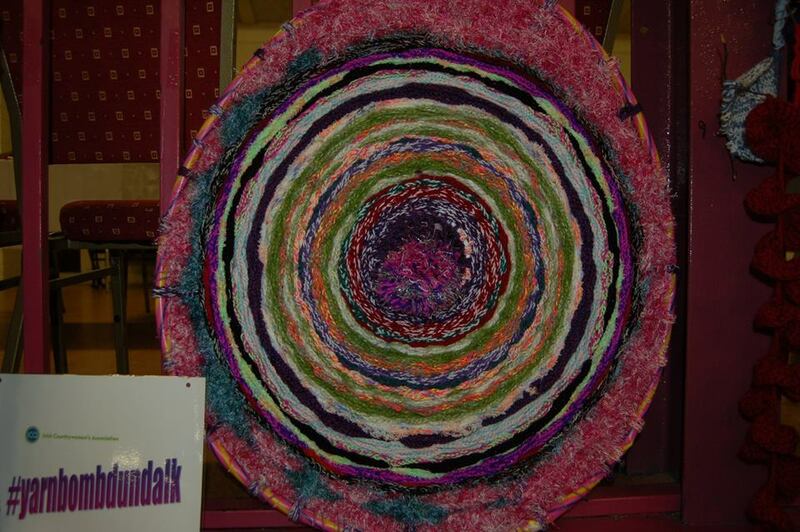 Photographs of some of Susan's work are below to give an idea of what Yarn Bomb is all about. 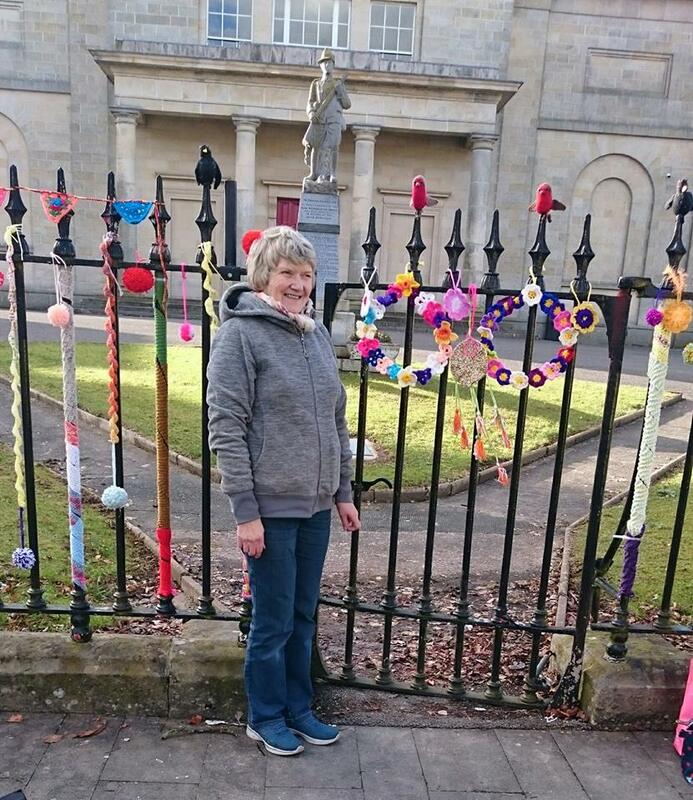 Susan was encouraging Cavan ICA Guild members to pick up on this relatively new idea, to get knitting and decorate some section of a main town in Cavan. 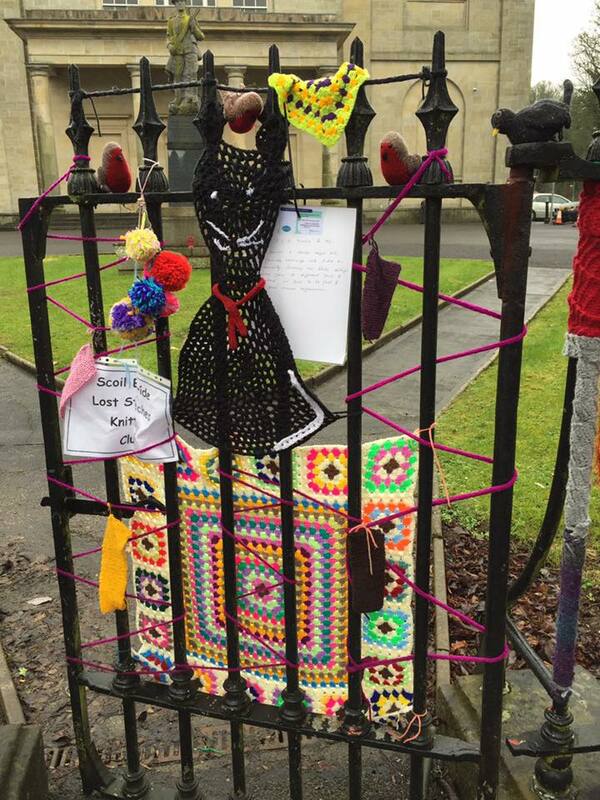 The Wolly Works are usually displayed for about 2 weeks from 8th March, International Women's Day and to be taken down by 18th March. 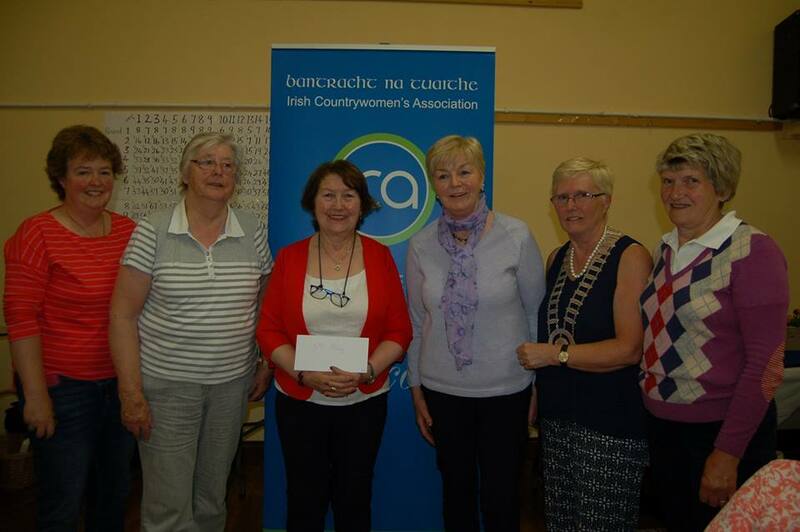 ​Jimmy O'Donnell, Cavan-Monaghan Palliative Care attended the ICA Federation Meeting on Wednesday, 13th September 2017 to receive a cheque for €4,880 from ICA Federation. The proceeds go to much need care in the counties. 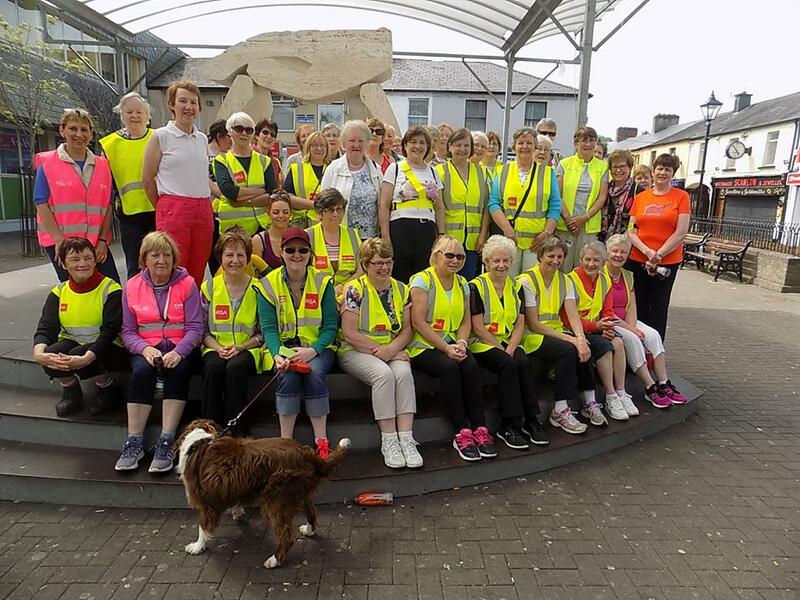 The money was raised by ICA ladies following the annual walk back in May 2017. 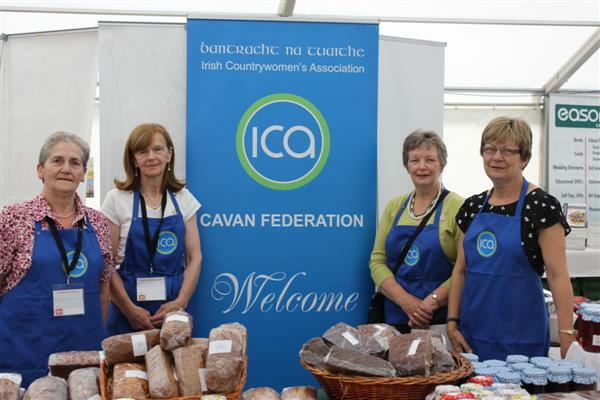 Pictured above are Maureen Murray, Sports Promoter, Annarose McCormack, Cavan ICA Federation President, Jimmy O'Donnell, Cavan/Monaghan Pallative Care and Tess Brady, Treasurer, Cavan ICA Federation. 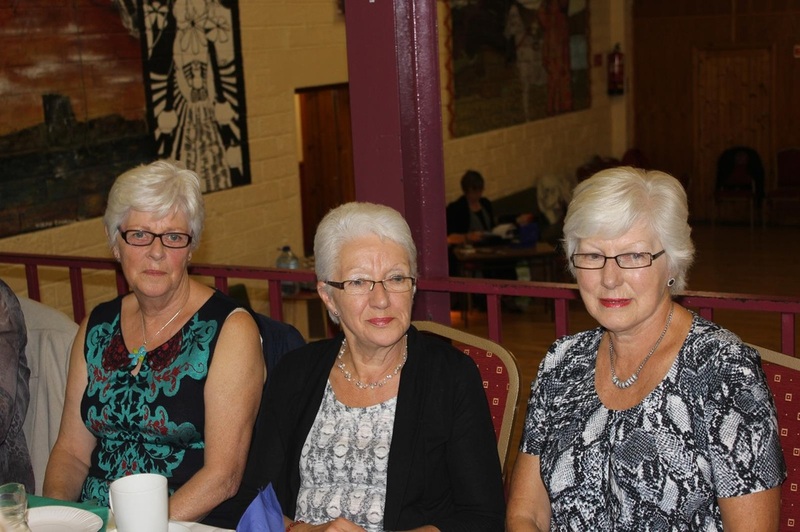 ​Cavan Federation ICA 'Fun Night' was held in Castlerahan Community Centre on Thursday night last, 8th June and as usual a great night's entertainment was enjoyed by all. 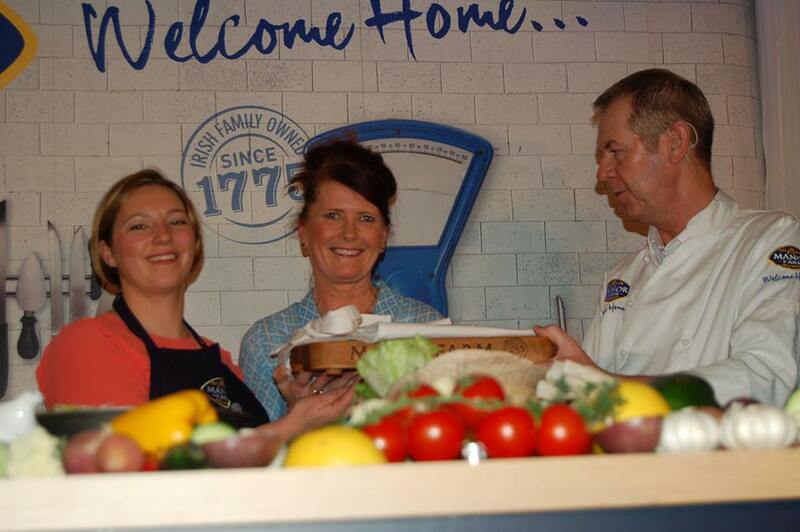 Congratulations to Lyla Dolan, Cloverhill who won the ALDI Brown Bread Competition. Best of luck to Lyla as she goes forward to the next stage of this national competition. 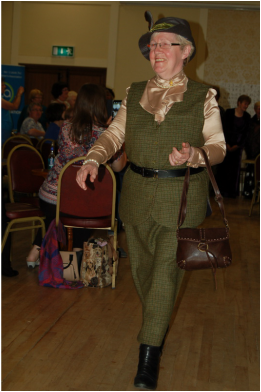 Leila Beattie, Bruskey Guild, was in 2nd place. 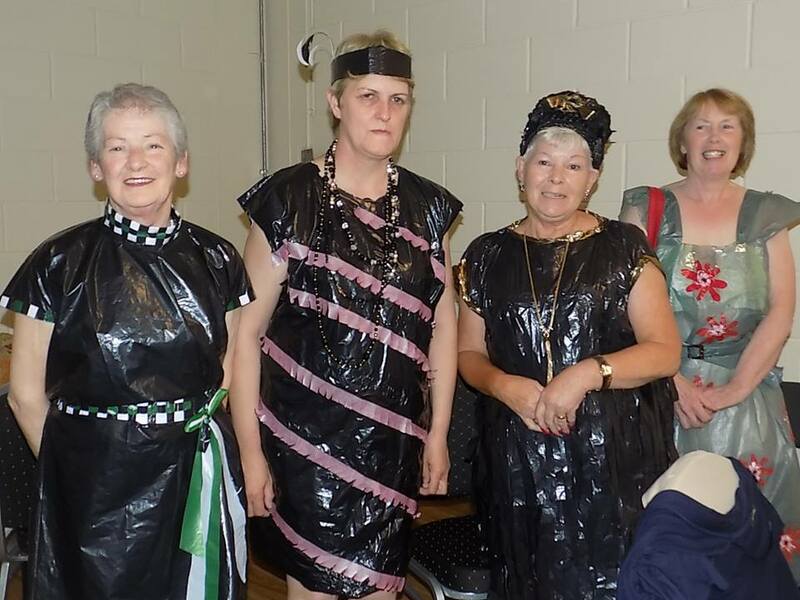 Well done to all the ladies who dressed up in various colours of bin bags - black, white, green....very creative indeed! 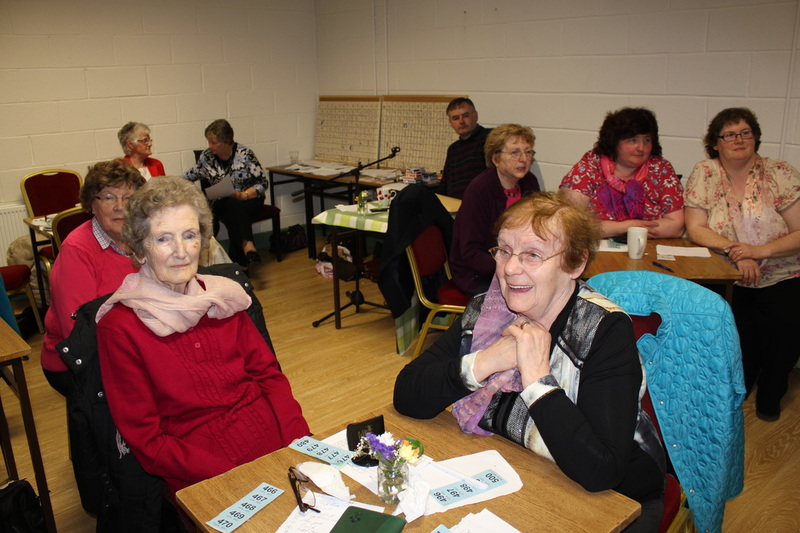 Thanks to Quizmaster Larry McGinn who led the Table Quiz. 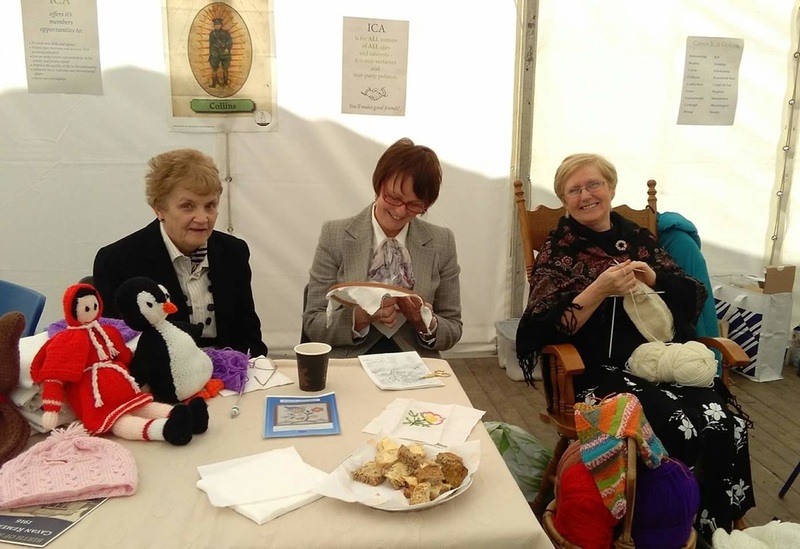 Congratulations to Crosserlough Guild winning team, Bruskey Guild was in 2nd place and joint 3rd were Killeshandra and Maghera Guilds. 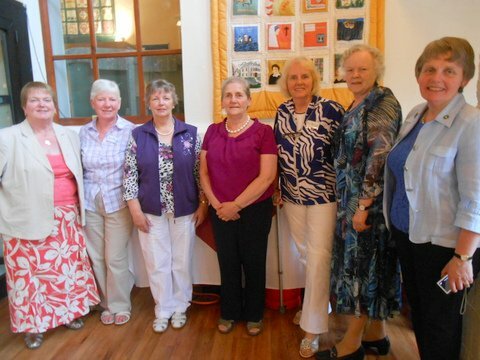 And a huge THANK YOU to the ladies of Castlerahan Guild who made us so welcome with tea and scones. 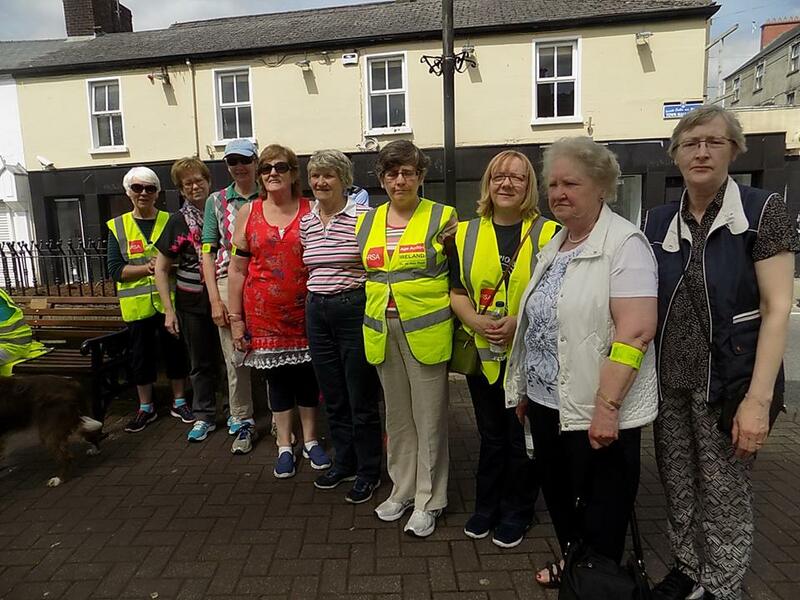 Well done to the 50 or so ladies from various ICA guilds of Cavan who took to the streets of Cavan town for the Annual Palliative Care Walk, to raise much needed funds for a very worthy cause. An enjoyable day was had by all, with kind weather and welcomed cuppa in the Farnham afterwards. 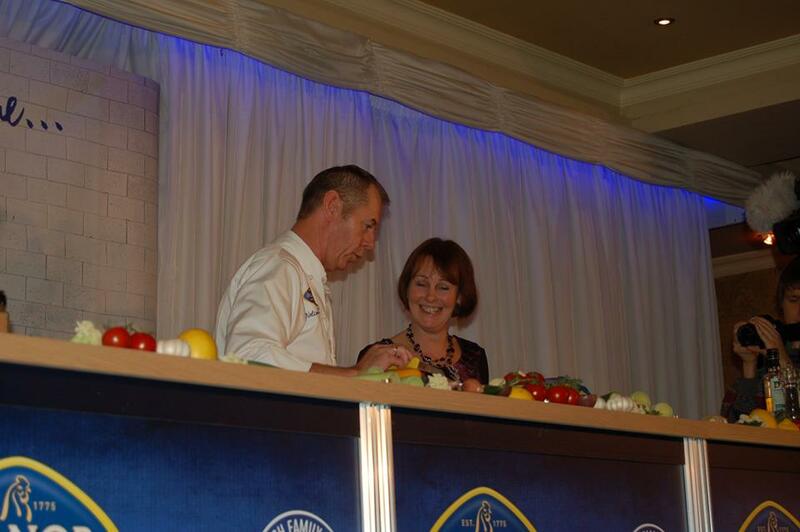 Photos below were taken at the Manor Farm Cookery demonstration which took place in Hotel Kilmore Cavan on Wednesday 7th December. Lots of Spot Prizes were given out and everyone enjoyed the delicious chicken pieces, drinks and goodie bags. 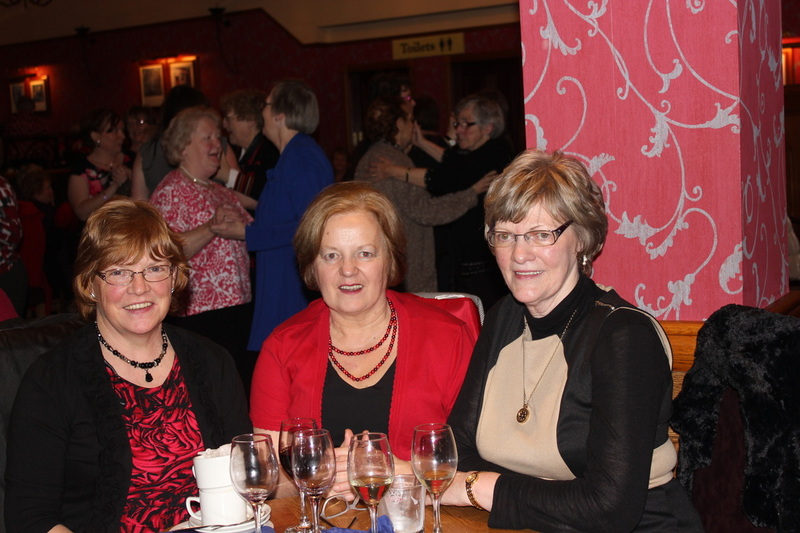 A very enjoyable evening - proceeds going to An Grianan. 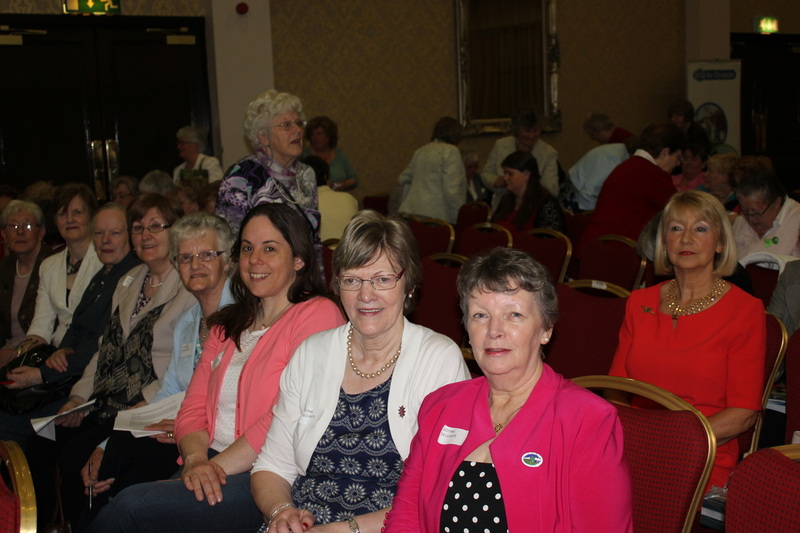 National President Marie O'Toole was in attendance also Mary McNamara National Treasurer and Niamh Donegan Manager of An Grianan. 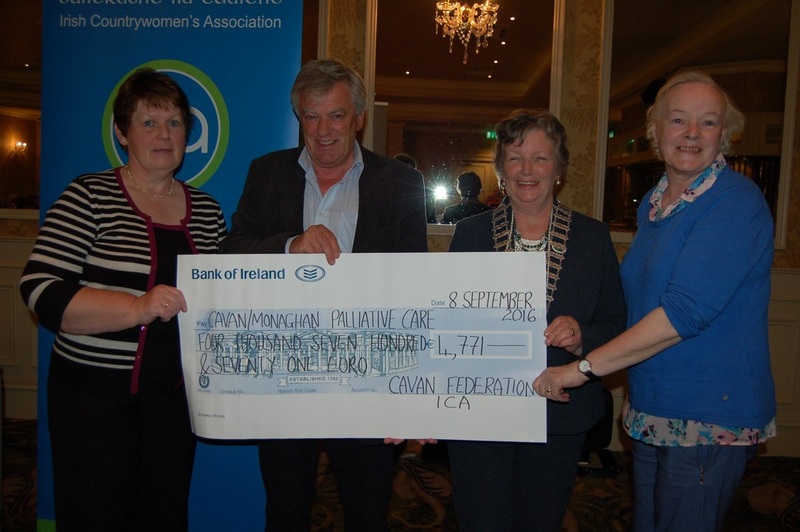 ​At the Cavan Federation ICA September meeting Jimmy O'Donnell, Palliative Care, Cavan/Monaghan, was overwhelmed and delighted to accept with great gratitude a cheque for €4,771, raised by the Annual Charity Walk in May by members of Cavan ICA guilds. 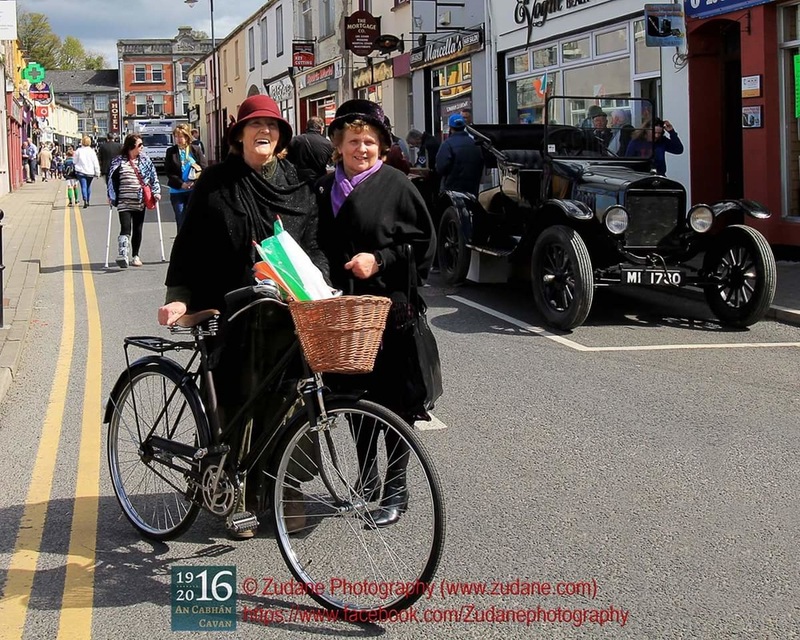 Cavan Federation participated in the 1916 Commemorative Celebrations in Cavan town on Saturday 23rd April 2016. 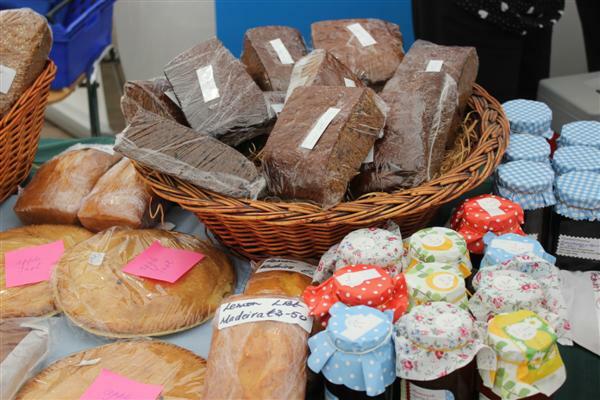 A selection of the home made breads available for tasting. 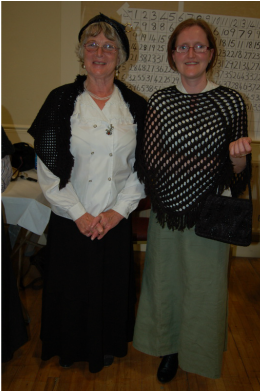 Concepta and Marie taking part in the parade. 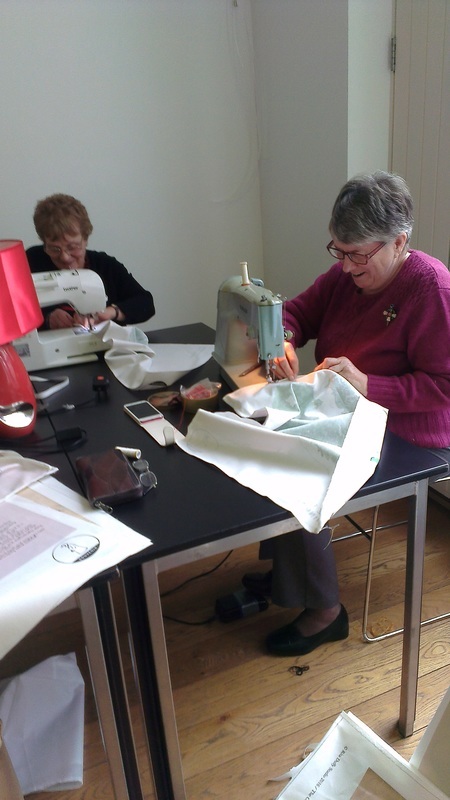 Artist Rita Duffy organised a "Sew In" at Johnson Central Library in Cavan on Saturday 6th February where members helped with cutting and hemming tea towels for the Souvenir Shop Project - 1916 Celebrations. 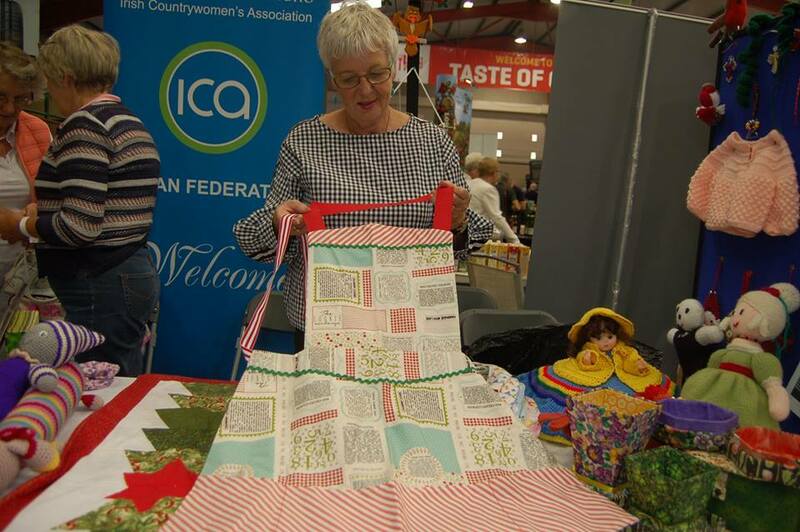 Federation President Anna Rose McCormack cutting the tea towels in preparation for sewing. It’s been seventy years since Glenn Miller vanished over the English Channel as he flew to Paris to entertain the troops during the Second World War. Did he crash? Was he shot down? Will the mystery ever be solved? Brought to the stage in a brand new musical spectacular, is the life, fame and vanishing of America’s most famous big band leader. Music legend TOMMY STEELE, Britain’s first rock n’ roll icon who became the UK's greatest ever song and dance man, commands the stage as only a very great star can in this extraordinary tale of the world’s most famous big band leader, featuring a spectacular 16 piece orchestra plus a full supporting company of sensational performers and dazzling choreography. Tommy’s legendary career boasts countless hit singles, Hollywood movies and award-winning stage musicals such as Half a Sixpence, Hans Andersen and Singin’ in the Rain at the London Palladium, where he was recently honoured with a prestigious plaque celebrating the fact that he remains the theatre’s most successful ever star. ​Fairtrade Ireland is looking for Fairtrade Ambassadors! 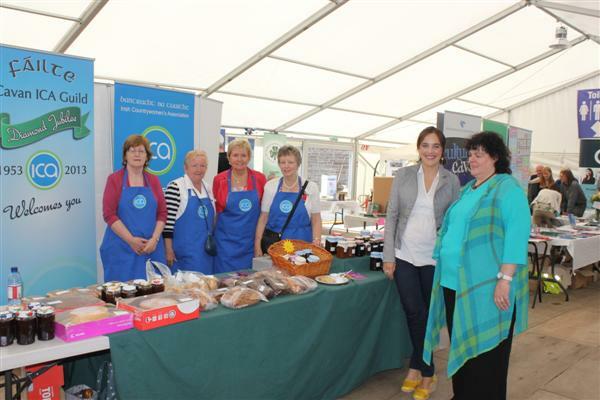 Fairtrade Ireland is looking for people who are interested in becoming Fairtrade Ambassadors – positive spokespersons and community influencers. Becoming a Fairtrade Ambassador is a simple way to promote global economic justice, ultimately leading to greater impact for farmers and workers in developing countries. 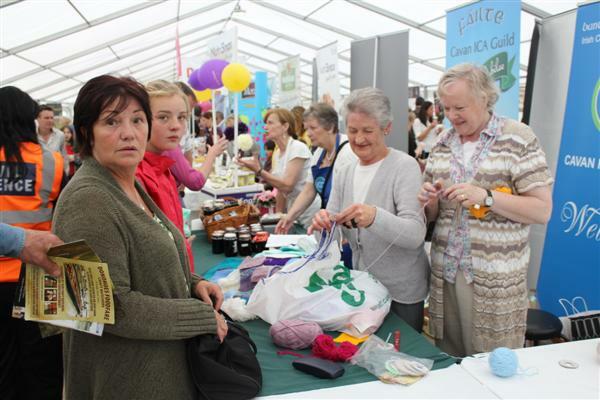 2016 is sure to be a wonderful year of Fairtrade 20th anniversary activities and we hope to expand our Fairtrade community in our fair island of Ireland. We aspire to have ever more people come together and fight the good fight to give greater voice for farmers and workers in the developing world. 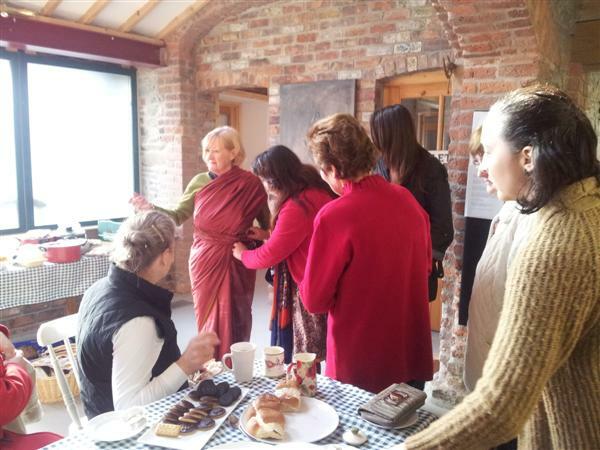 People could become Fairtrade Ambassadors in their town, college, workplace etc. 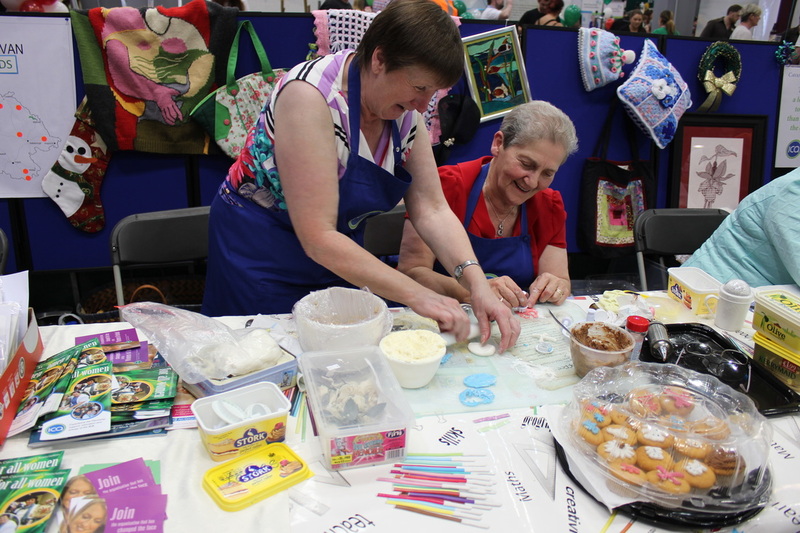 Fairtrade Ambassadors will be able to contribute to strengthening partnership between some of the most disadvantaged farmers and workers in the developing world and the people who buy their products, by organising their own Fairtrade activities and participating in those we are organising. 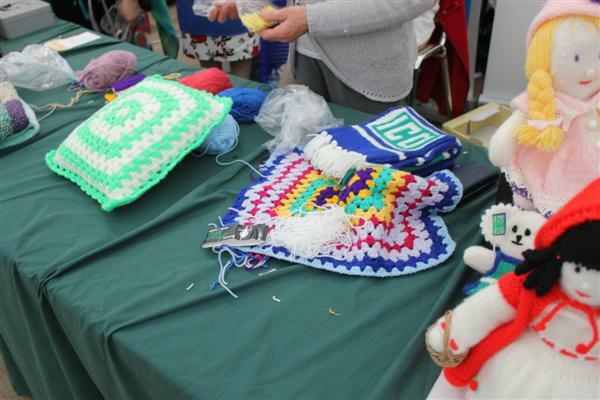 These can include a combination of educational events, online initiatives and community events. You can also help to expand Fairtrade community by telling your friends, family and neighbours to sign up to our Fairtrade Ambassador programme and by sharing/re-tweeting our call on your social media. With your help we are looking to make 2016 a memorable one and further the positive impact Fairtrade has on 1.5 million Fairtrade farmers and workers in 74 countries worldwide. 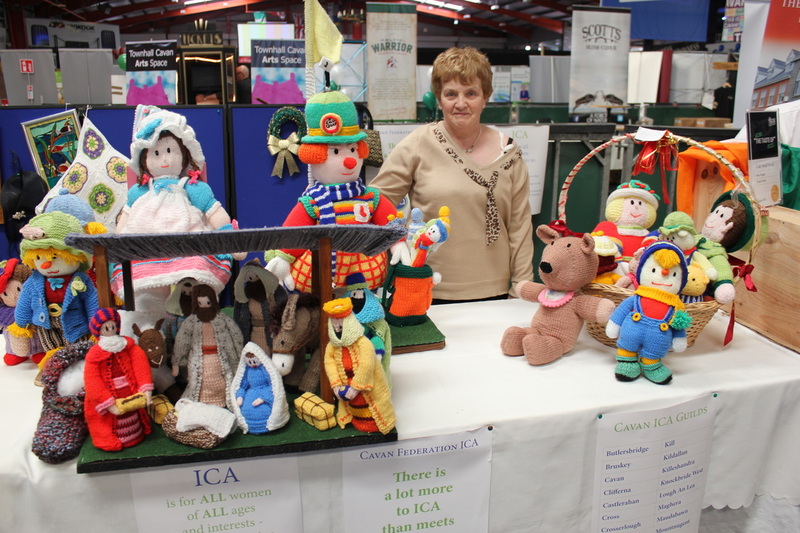 The Craft Cabin, Art and Craft Store situated in the Realta Centre, Ballyconnell are offering ICA members a 10% discount. 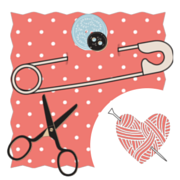 They stock a wide range of art and craft supplies for knitting; crochet; paper crafts; patchwork and many more. 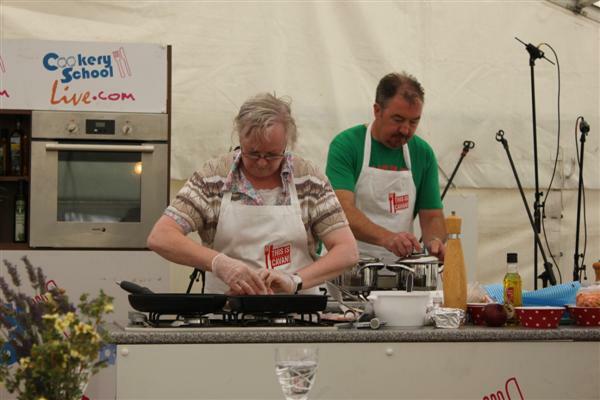 They also hold workshops and demonstrations. For more information contact 049) 952 7424. 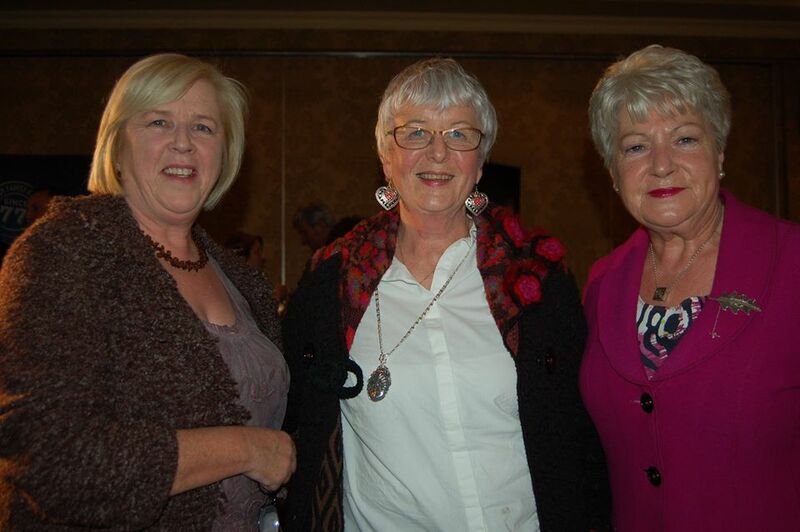 Pictured at World Rural Women's Day in Armagh City Hotel on Saturday 17th October. 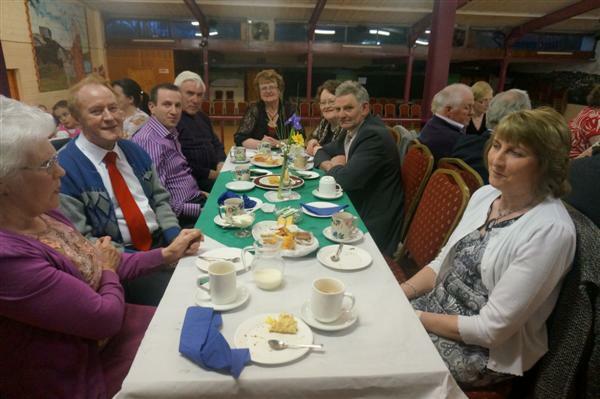 Members of Cavan Federation joined members of Longford Federation . 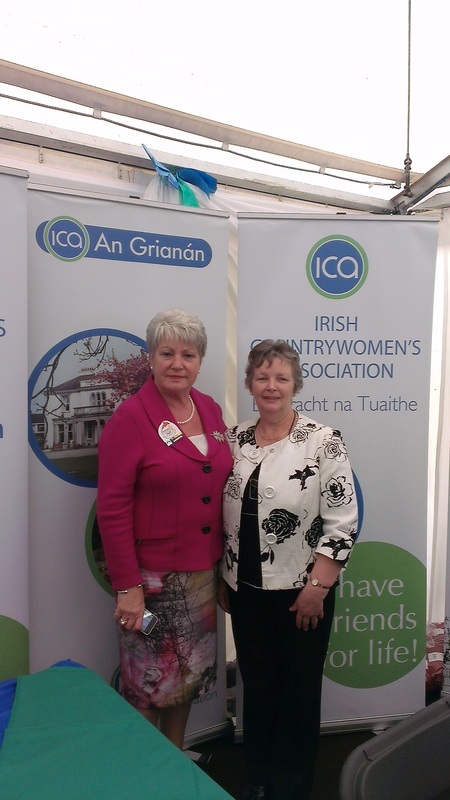 Marie O'Toole National President and Anna Rose McCormack Federation President at the ICA Stand in Ratheniska. 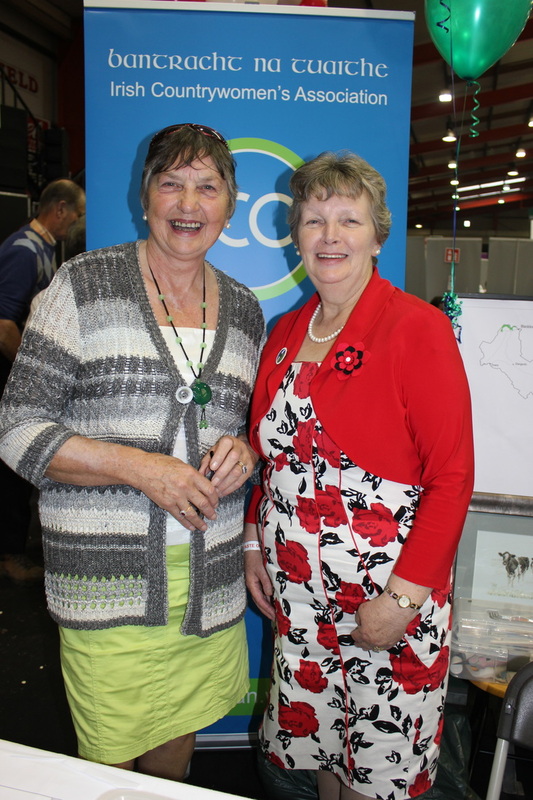 Federation President Anna Rose McCormack was on duty at the National ICA Stand on 22nd & 23rd September at the National Ploughing Championships in Ratheniska and met members from Kill, Crosserlough, Cross, Bruskey, Corlough guilds. 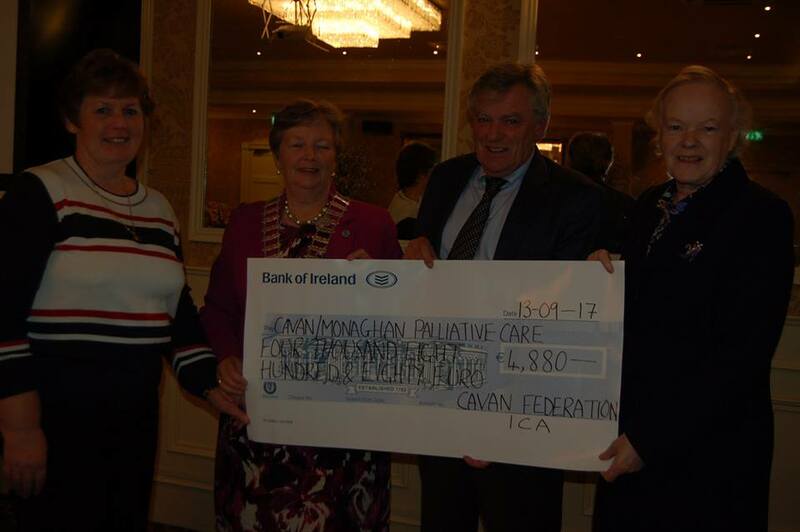 A cheque for €4,603.50 was presented to Jimmy O'Donnell, Cavan Monaghan Palliative Care at the federation meeting in Hotel Kilmore on Monday 7th September 2015. This money was raised by ICA members and friends. Thank you to all who participated in the walk, gave contributions and also to the Farnham Arms Hotel for sponsoring the refreshments after the walk. 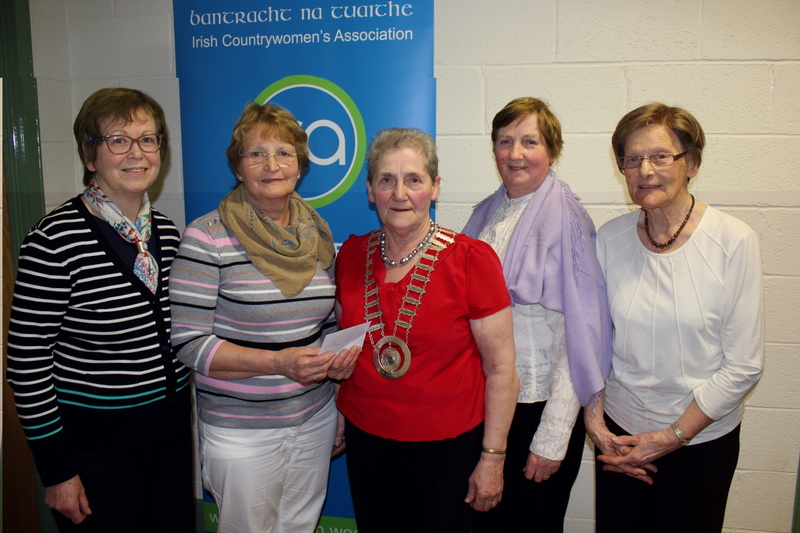 Anna Rose McCormack Federation President and Anne Minehane Sports Promoter presents a cheque to Jimmy O'Donnell Cavan Monaghan Palliative Care - the proceeds of Sponsored Walk by ICA members and friends. 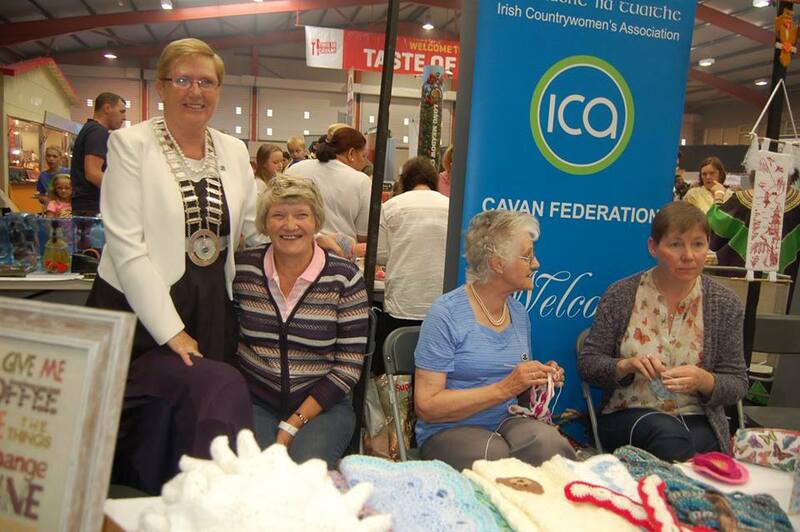 The 'Taste of Cavan' was a marvellous showcase for ICA with lots of interest in all the crafts and demonstrations; numerous enquires about membership and the fabulous Malteser Cake made by our National President certainly created lots of interest and added to the enjoyment and banter at the stand. 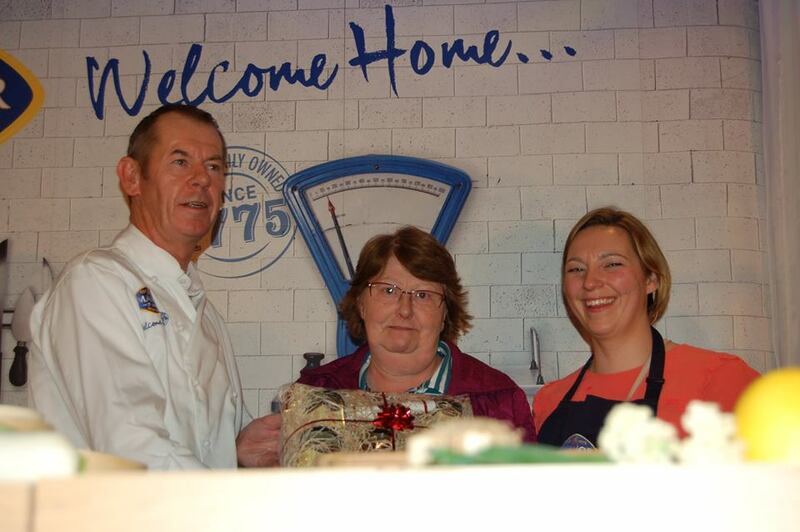 Congratulations to the winner Kay McCann from Crosskeys. The number of maltesers was 294. A surprise visitor! 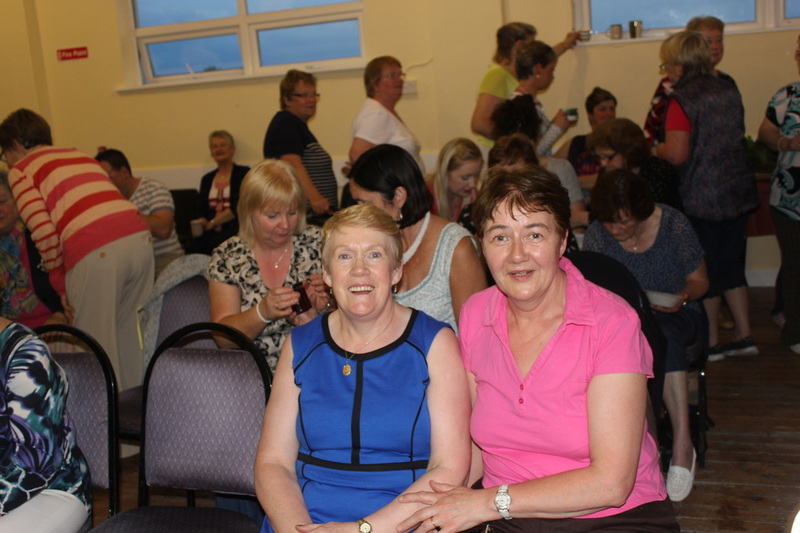 Mrs. Anita McNamara from Co. Wexford is pictured with Federation President Anna Rose McCormack. Anita is a grand-daughter of the founder of ICA Mrs. Anita Lett. 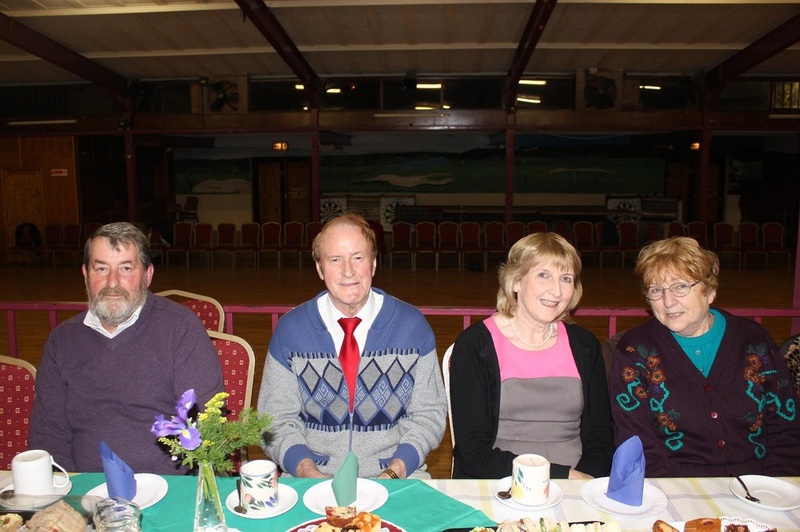 Councillor Winston Bennett; Paddy Smith Chairman Cavan Co. Council; MEP Mairead McGuinness; Anna Rose McCormack Fed. Pres., & Councillor Peter McVitty. Anna Rose McCormack Fed. Pres., Sophia Whyte Fed Sec., Marion Lyon Fed. 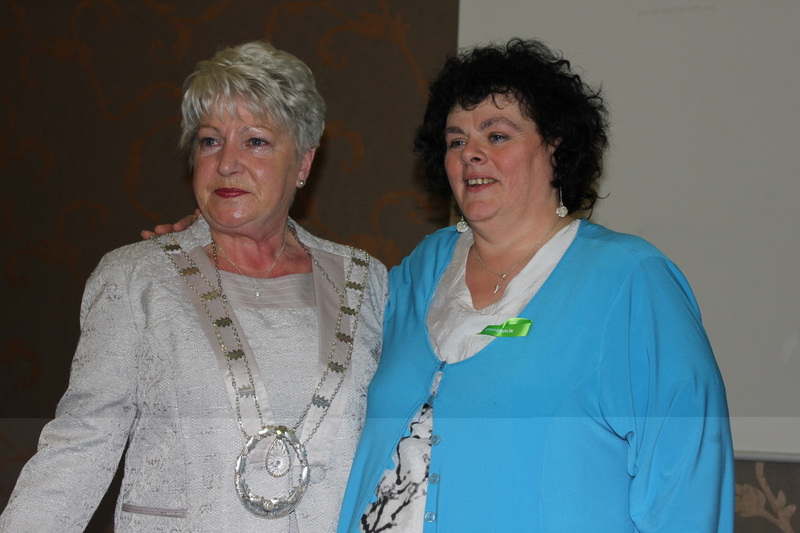 Treasurer & Marie O'Toole National President. 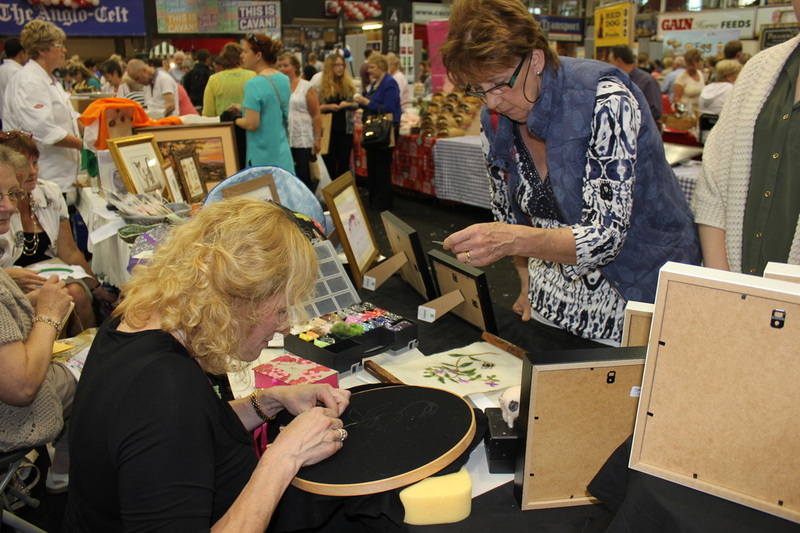 Carol Davis, Craft Promoter demonstrates Cross Stitch. 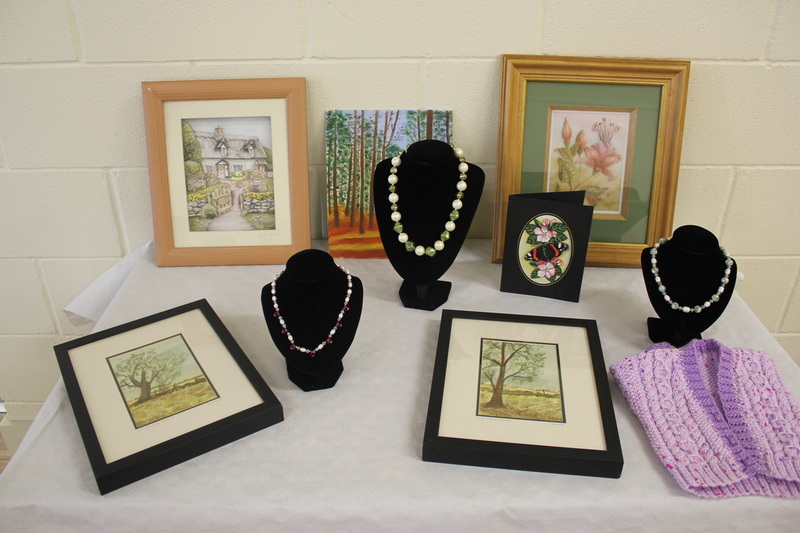 A selection of Carol Davis's cross stitch and black work. 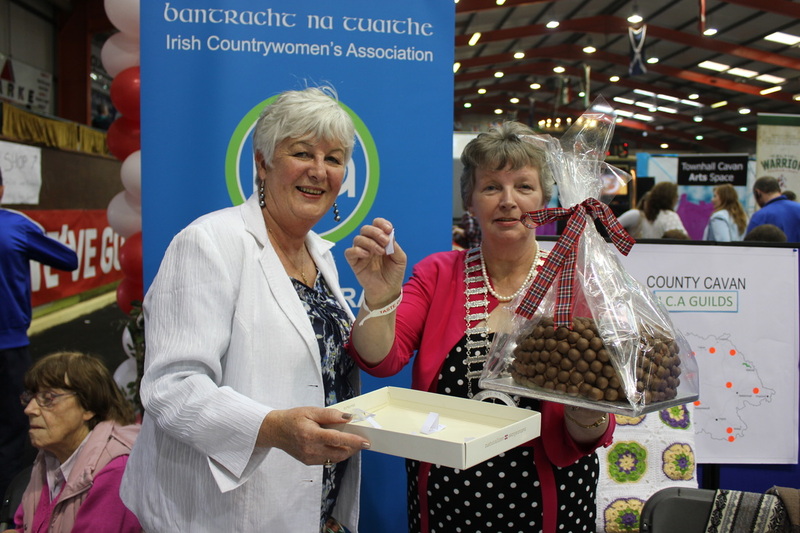 Marion Lyon Federation Treasurer and Anna Rose McCormack, Federation President making the draw for the winner of the Malteser Cake. 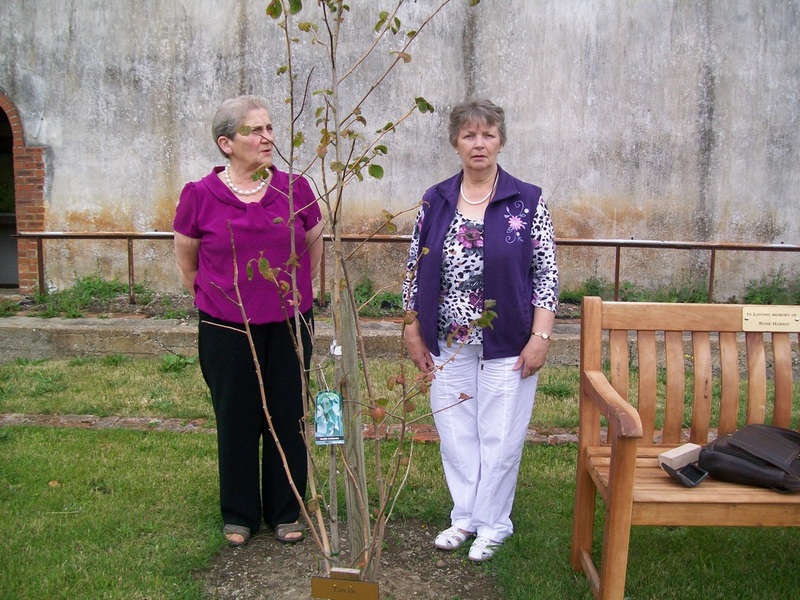 Anna Rose McCormack Federation President and Leila Beattie Vice-President viewing the Cavan Federation Handkerchief Tree planted at An Grianan. 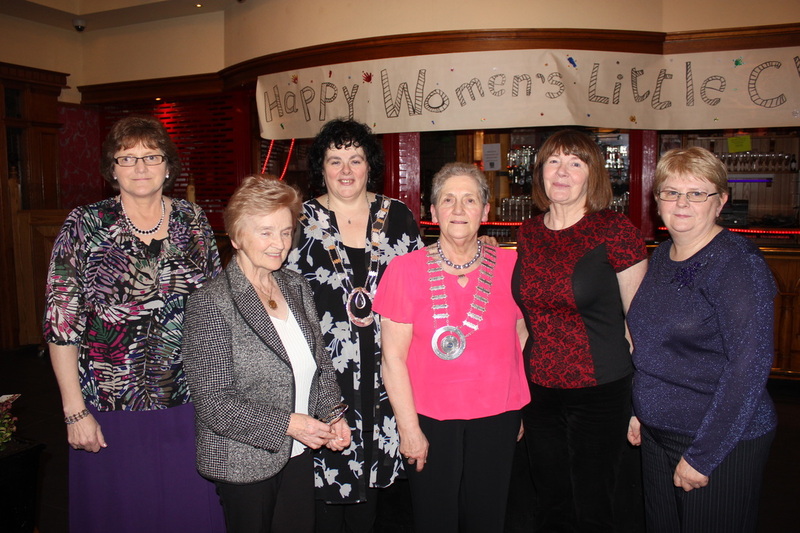 President Anna Rose McCormack; Kathleen McDonald, Leila Beattie and Tess Brady met with members of the Women's Institute for lunch in An Grianan. 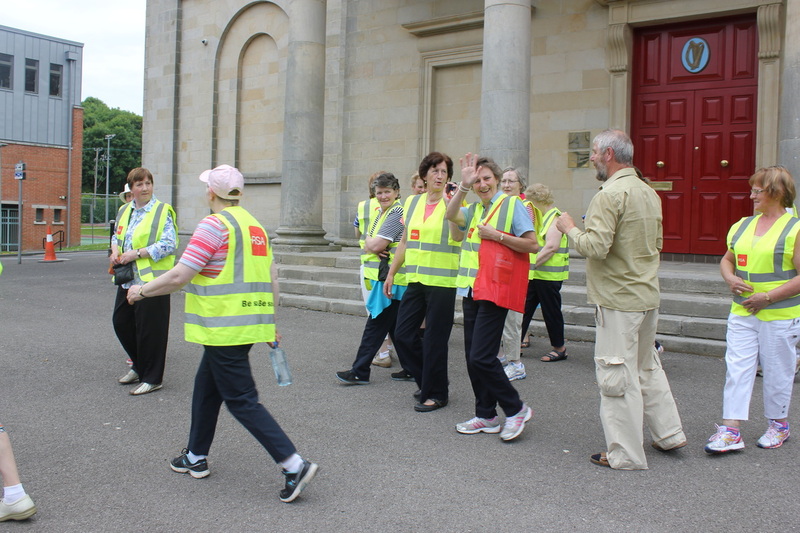 A group of 28 travelled on the Federation Outing to Castletown House Celbridge & Newbridge Centre on Saturday 25th July. Everyone enjoyed a brilliant day out. Dr Pixie McKenna and Dr Phil Kieran from the new RTE Show entitled 'You Should Really See a Doctor' are travelling the country and attending various events where they're going to diagnose members of the public. 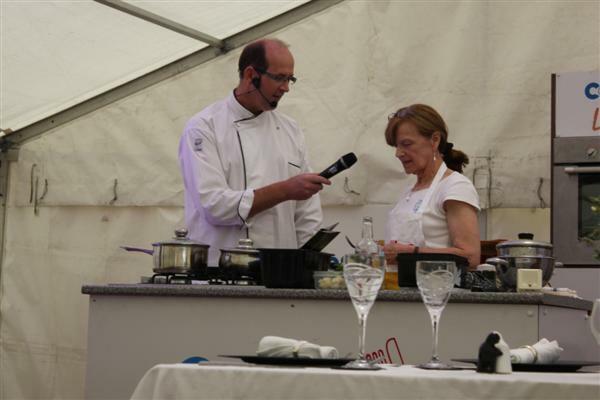 They will be filming in Cavan at the 'Taste of Cavan' event on Saturday 8th of August and are looking for participants who'd like a free consultation. 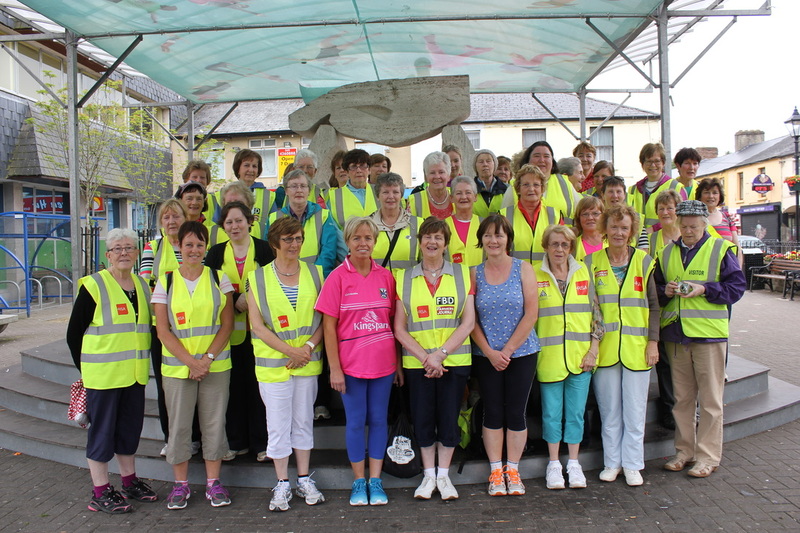 Forty six walkers took part in the Annual Charity Walk for Cavan Monaghan Palliative Care on Sunday 28th June. 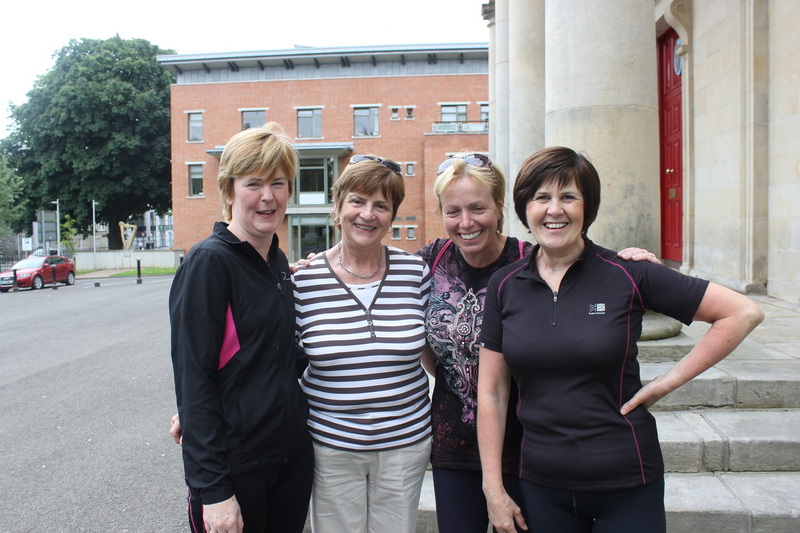 Weather was favourable and everyone enjoyed the new route which was organised by Anne Minehane, Sports Officer. Refreshments followed in the Farnham Arms Hotel very kindly sponsored by the hotel. 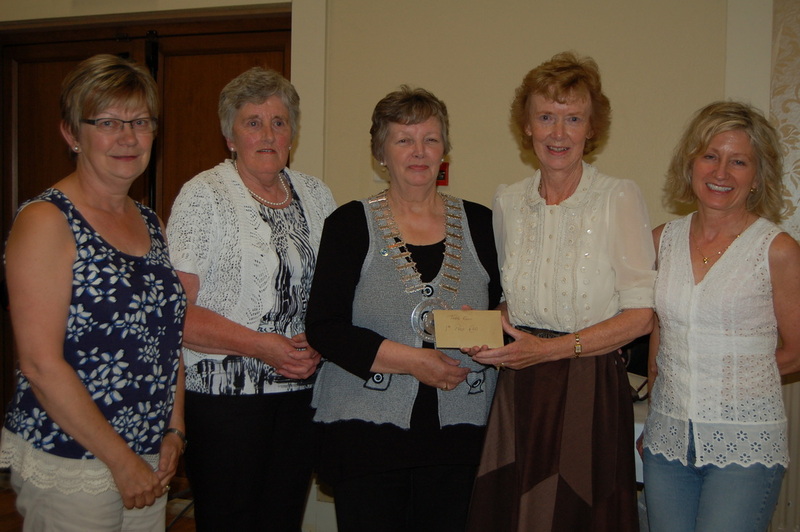 All sponsorship money to be sent to Federation Treasurer Marion Lyon, Fartagh, Lisduff, Virginia. Certificates will be presented on 7th September at Federation meeting in Hotel Kilmore and cheque will be presented to Jimmy O'Donnell also at the meeting. 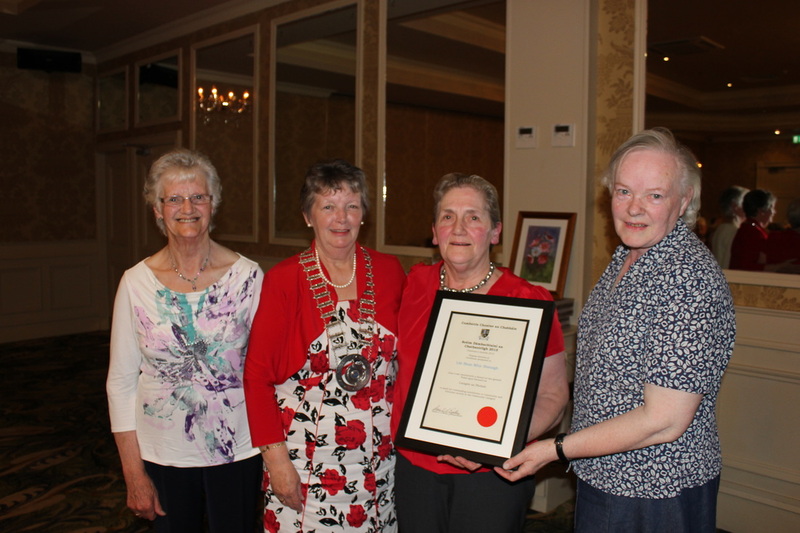 The Cathaoirleach's Awards scheme celebrating the work of volunteers in Co. Cavan took place in the Cavan Crystal Hotel, Cavan on June 12th. This scheme is now in it's 21st year. There are five categories - youth; social inclusion; community and active age. 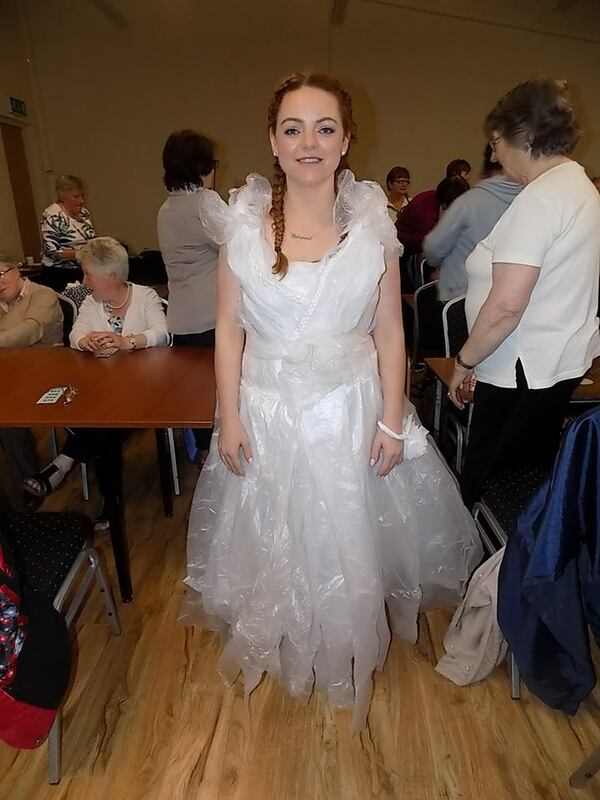 Leila Beattie, Bruskey Guild member was nominated by Tess Brady in the community section. 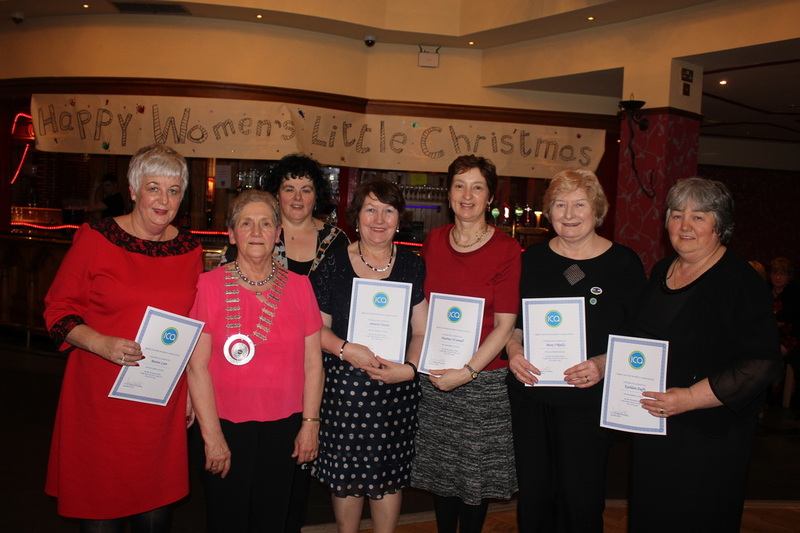 There were a total of twenty one nominations and each nominee received a framed certificate. 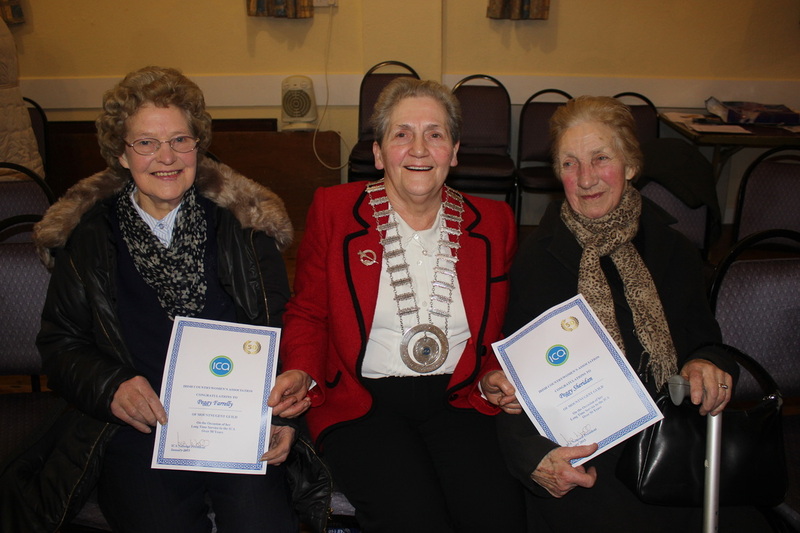 Leila was unable to attend the awards and her Certificate was accepted on her behalf by Tess Brady and Kathleen Coyle. 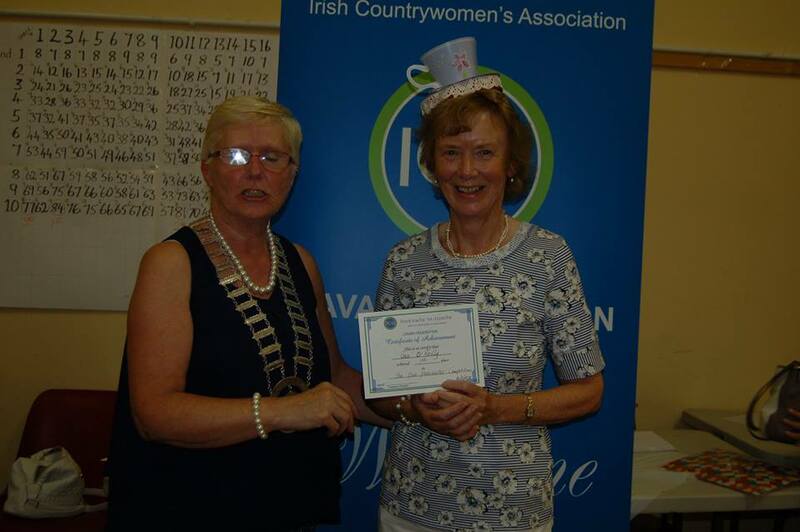 Photo shows Leila being presented with the Certificate by Federation President Anna Rose McCormack. 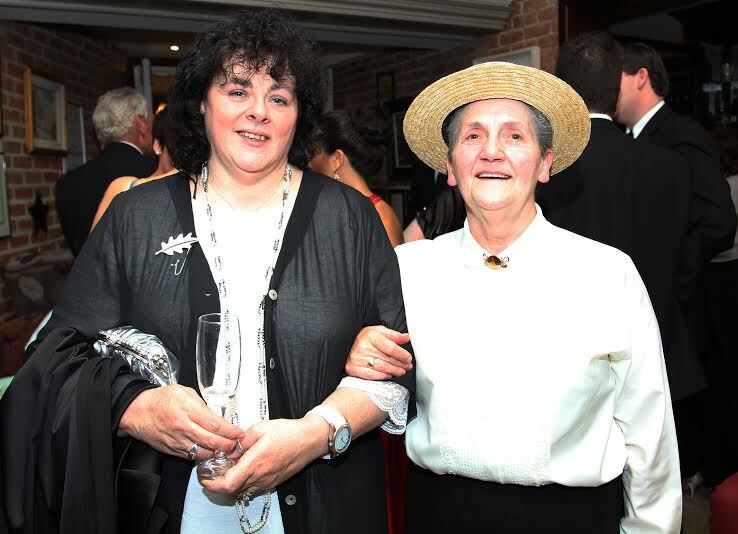 Also in the photo are Kathleen Coyle and Tess Brady. Well deserved Leila! 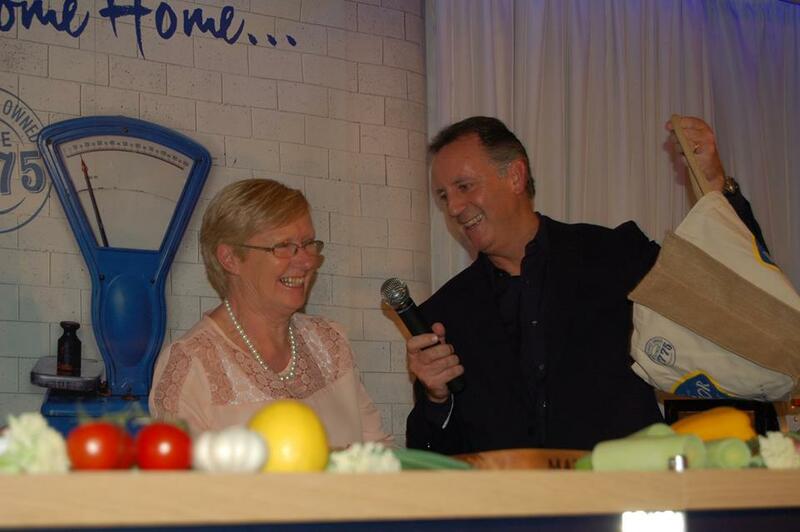 The Minister Heather Humphreys, Minister for Arts, Heritage and the Gaeltacht, officially launched "The Taste of Cavan 2015" on Wednesday 3rd of June in Fallon and Byrne Restaurant, Dublin. 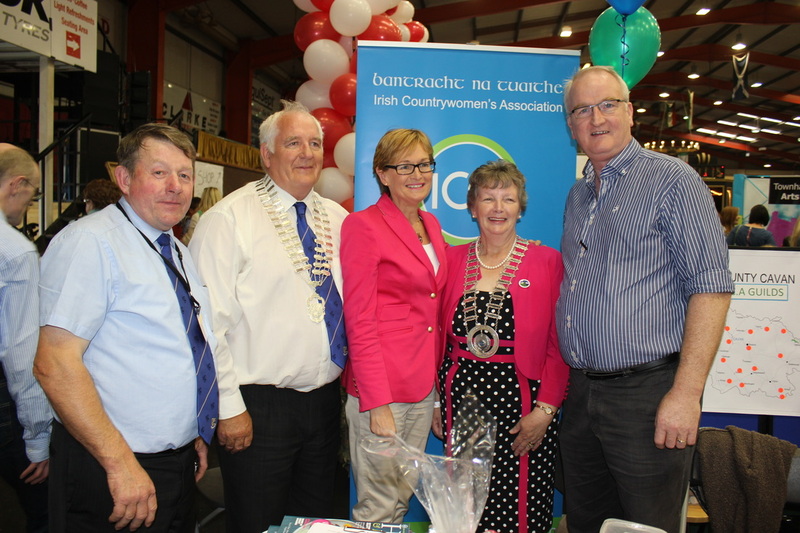 Marie O'Toole, newly elected National President of ICA, represented ICA at national level and was formally welcomed by Councillor Shane P. O'Reilly, Cathaoirleach (Chairperson) of Cavan County Council. 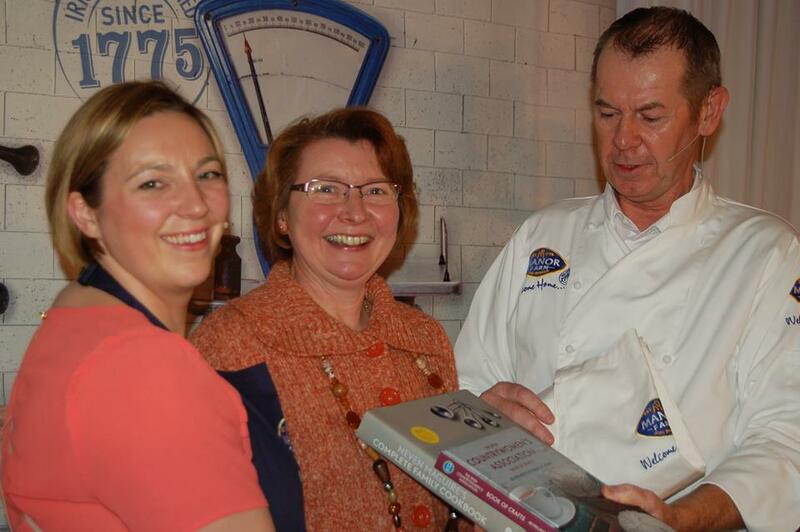 Councillor Winston Bennett, Chairperson of "The Taste of Cavan", cordially welcomed Our National President on her first official engagement. 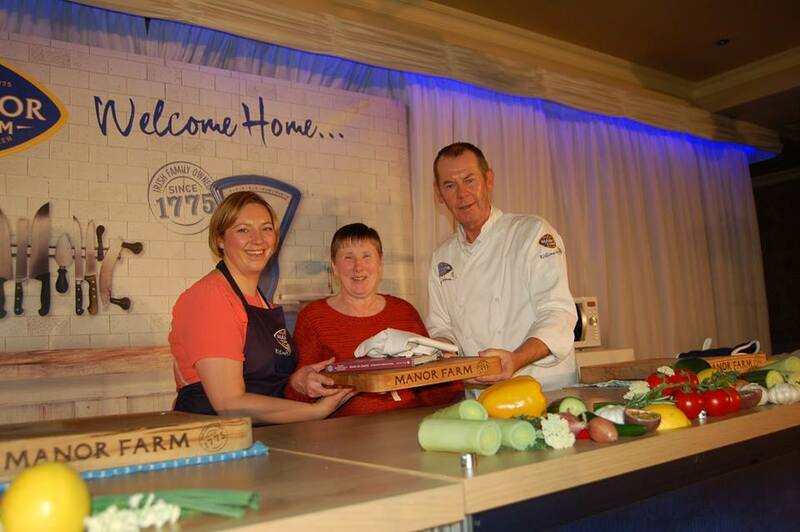 Marie enjoyed her cooked breakfast of foods all produced in Co. Cavan. 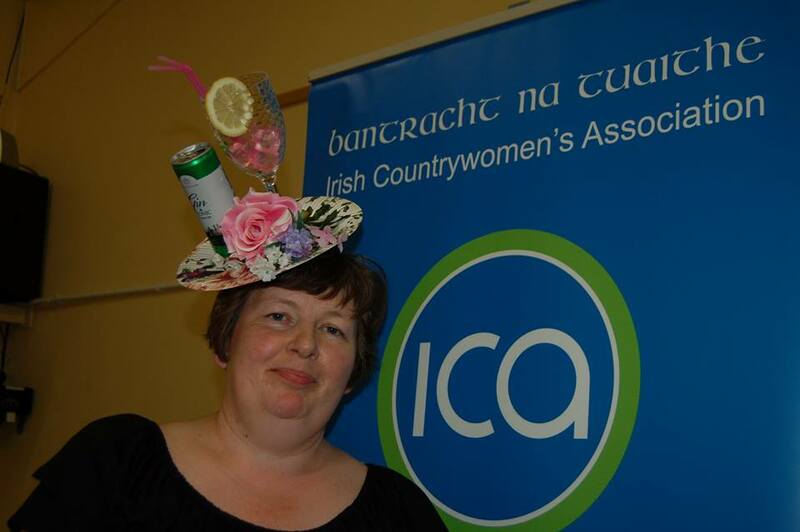 Also in attendance was Leila Beattie, Vice-President of Cavan Federation ICA. 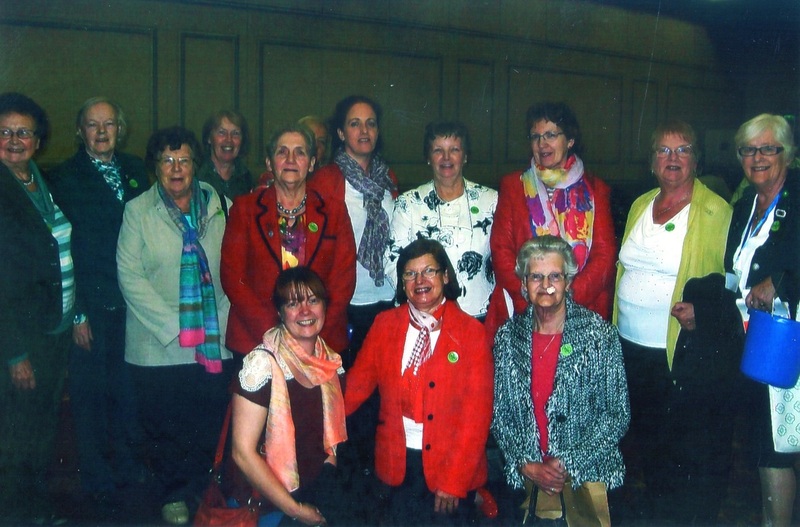 Federation President Anna Rose McCormack was unable to attend. 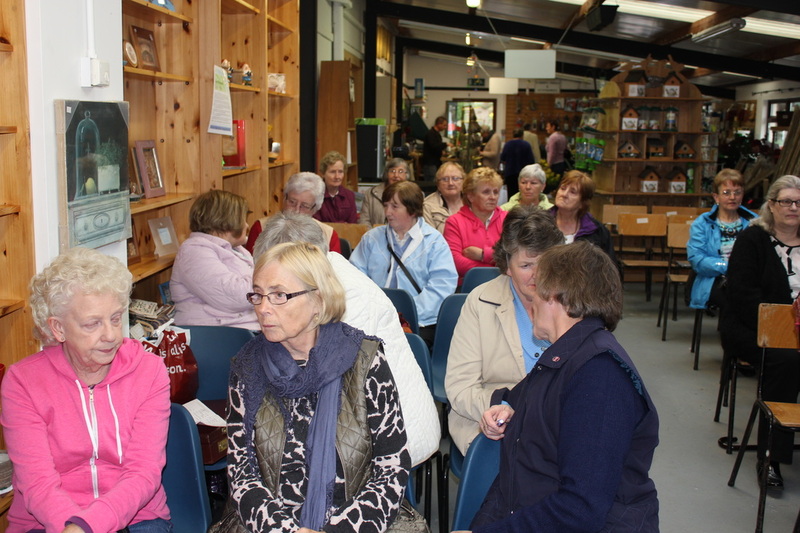 There was a large attendance at the Information Evening in Tullyvin Garden Centre on Tuesday 26th May. Bernie Tighe Produce Promoter welcomed everyone. 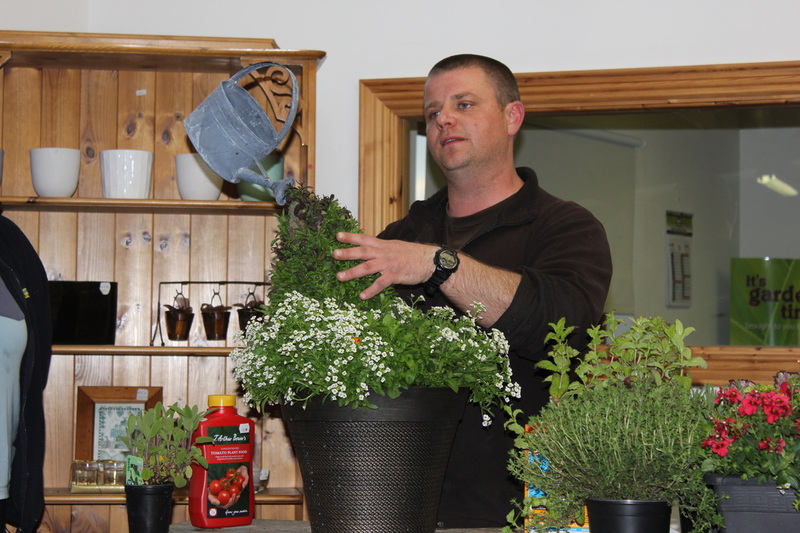 Roslyn and Niall gave a very informative talk on growing herbs and their uses; summer bedding in hanging baskets; different types of containers and answered many questions. 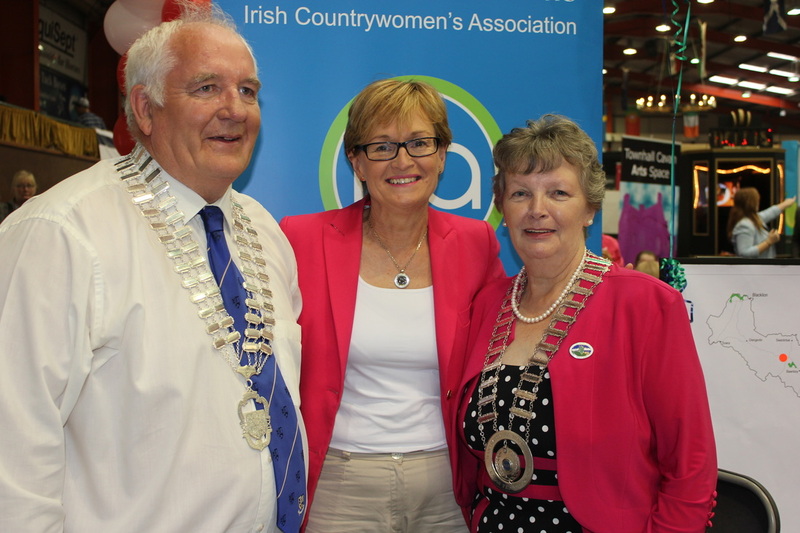 Federation President Anna Rose McCormack thanked Roslyn and Niall. 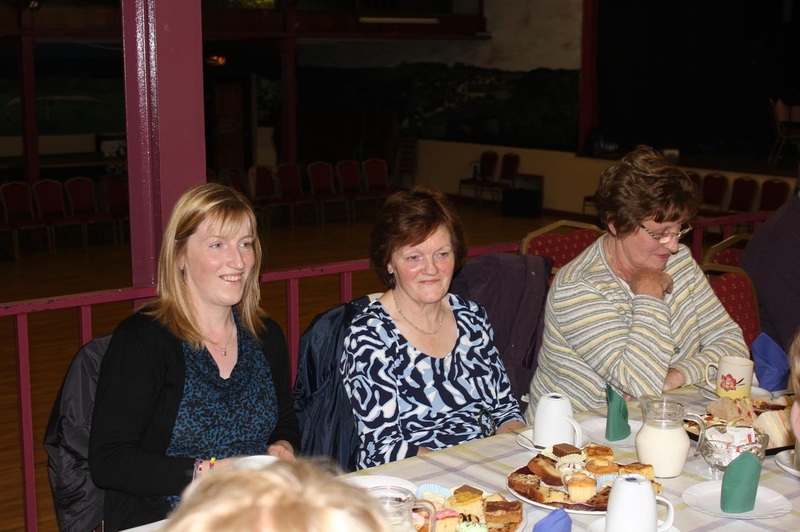 Everyone enjoyed a delicious supper followed by a raffle. 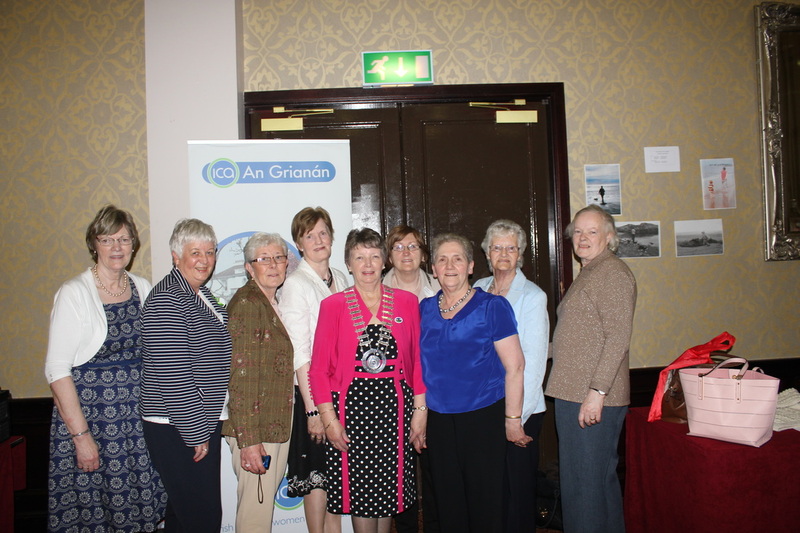 Ten members from Cavan Federation attended the National AGM in the Heritage Hotel in Portlaoise on Saturday 23rd May 2015. 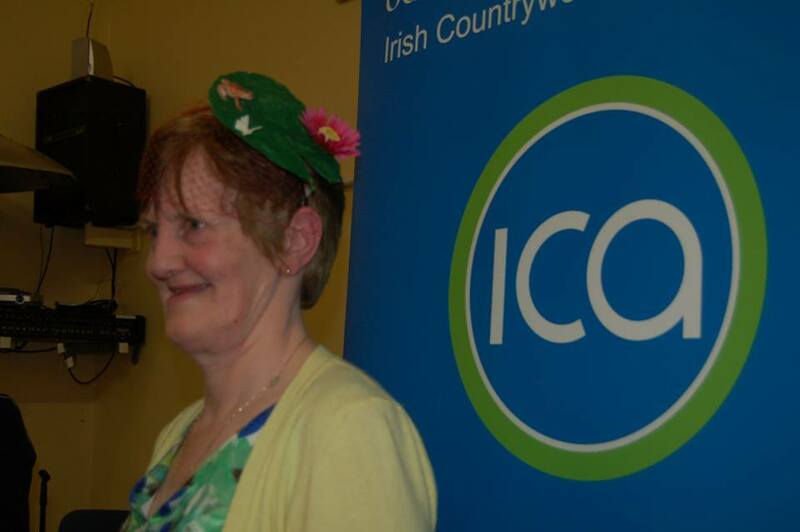 Outgoing President Liz Wall in her farewell Speech outlined all that has been achieved during her term as President. The new ICA magazine was launched and a copy is available for each member in the federation. 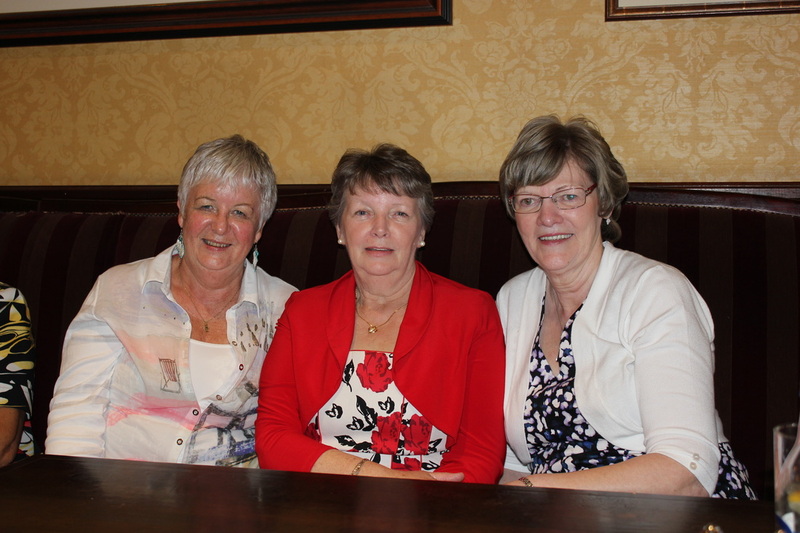 Marie O'Toole was elected President of the Association; Mary McNamara Treasurer and Shirley Power Secretary. Liz wished the new officers well. 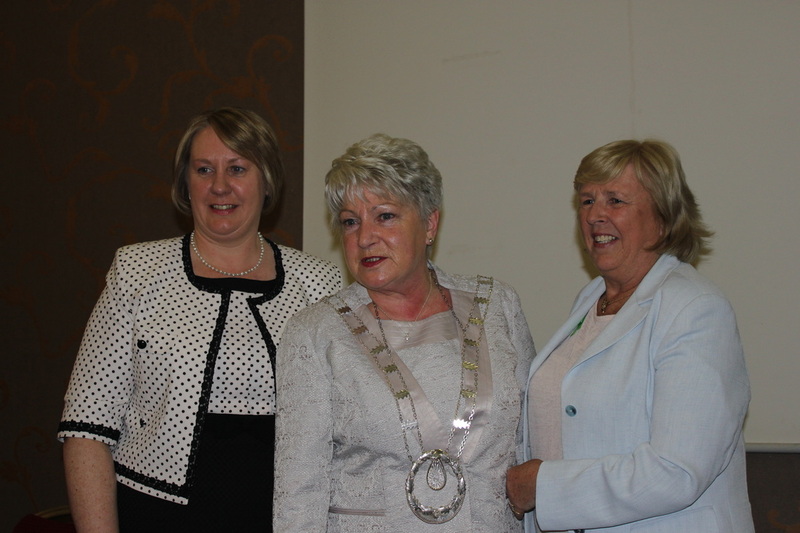 Marie O'Toole addressed the members and said she was honoured to be elected as president. 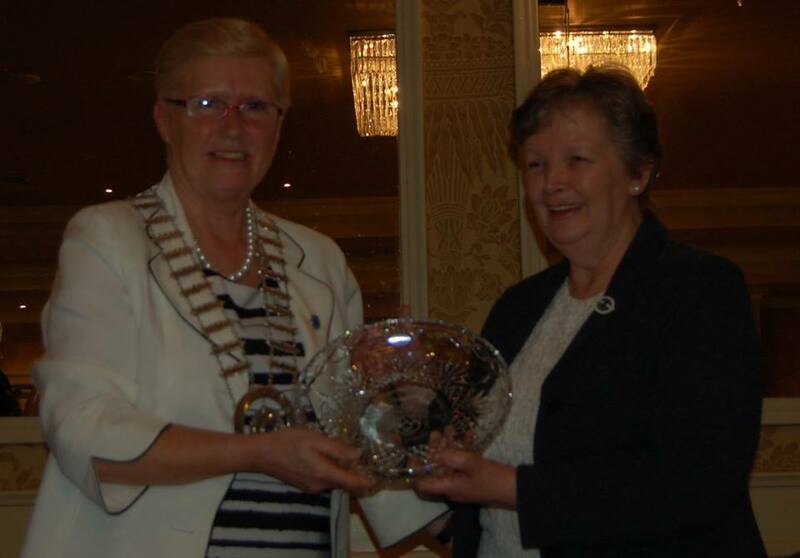 She is the first Dublin President in the history of the Association. 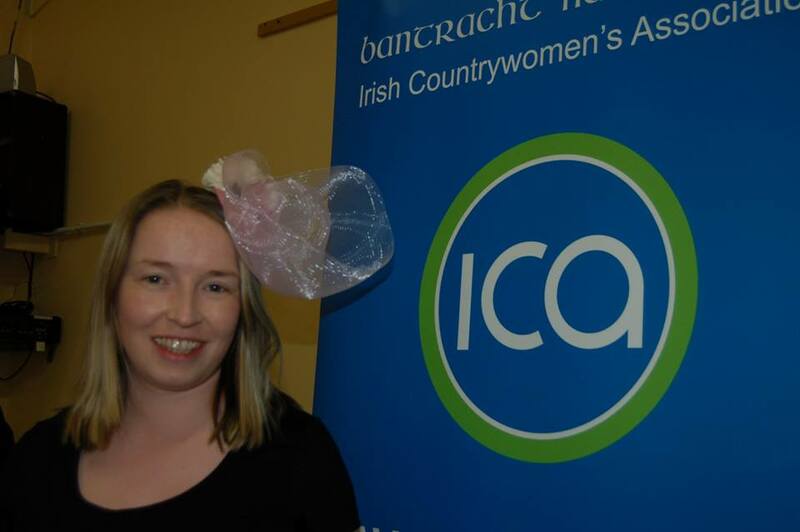 Anna Rose McCormack Cavan Federation President is now a member of the new ICA Board. 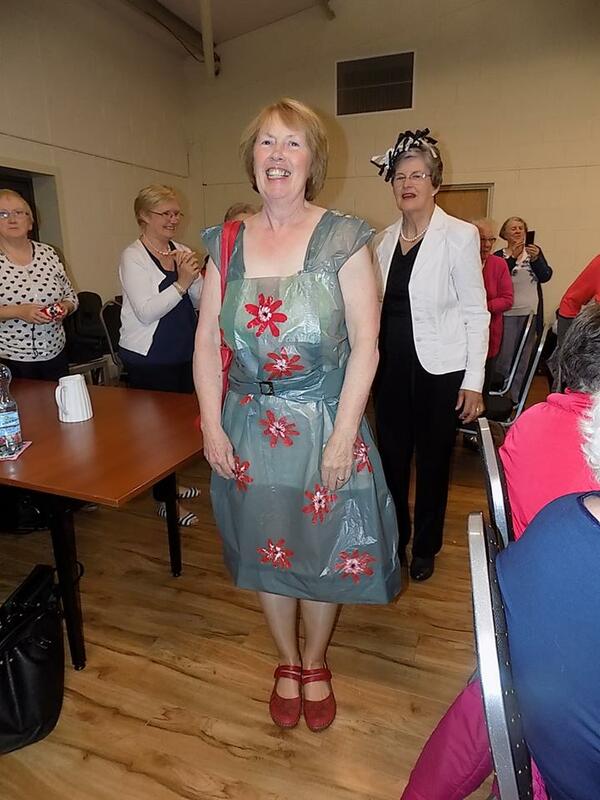 Margaret Smith Crosserlough Guild was presented with the Baumann Cup for Art for her beautiful painting of flowers. She also received a piece of pottery. 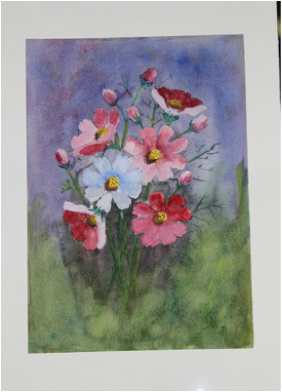 Congratulations Margaret, a beautiful piece of art work. 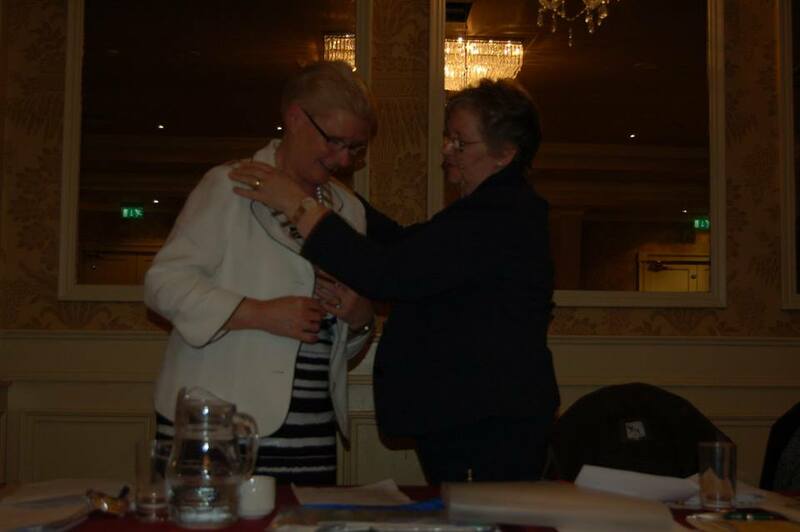 Newly Elected President Marie O'Toole received her chain of office from Liz Wall outgoing president. 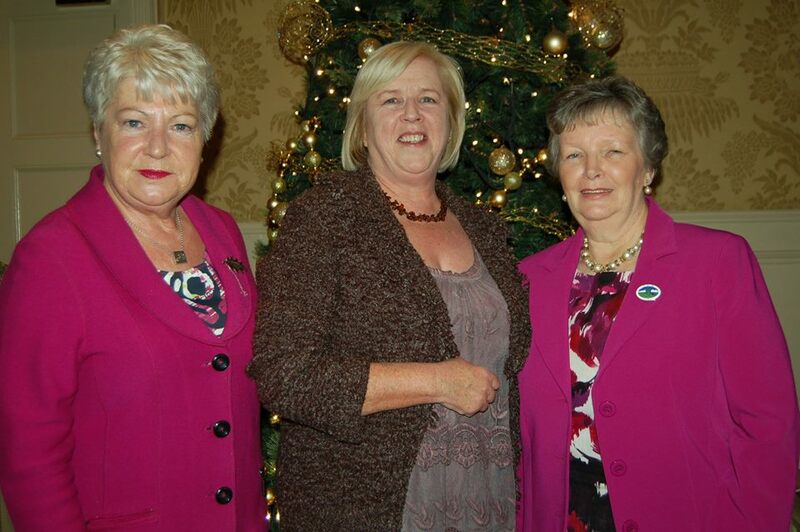 Shirley Power - National Secretary; Marie O'Toole National President and Mary McNamara National Treasurer. 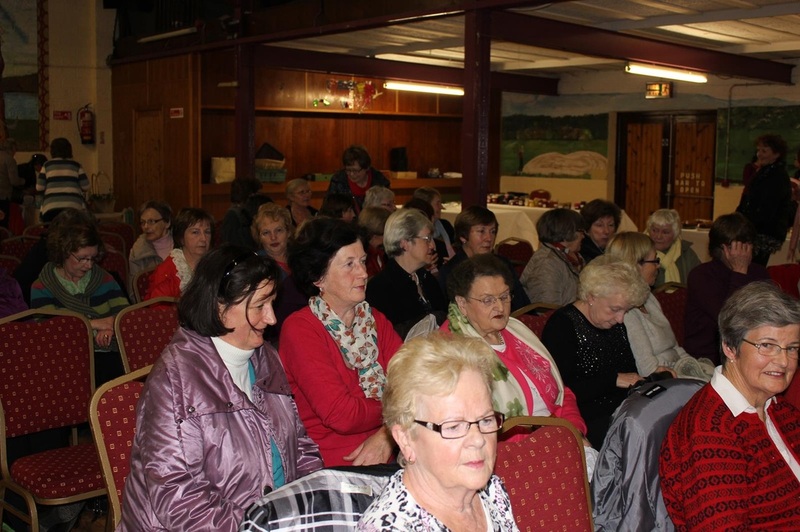 The AGM of Cavan Federation ICA was held in the Day Centre Cavan on Wednesday 29th April 2015 @ 8.00pm. 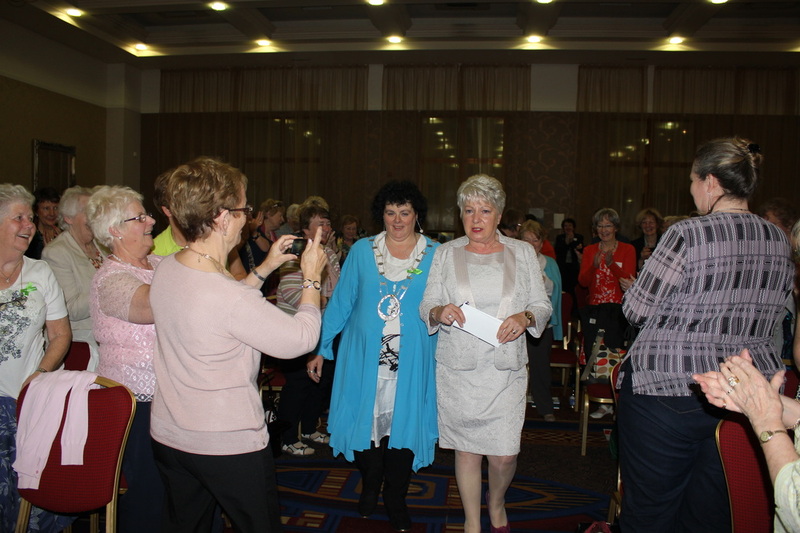 Concepta McGovern President of Cavan Guild gave a warm welcome to all present. Reports were given by Federation Secretary, Treasurer and Specialists. Guest Speaker Dr. Shameen Syed gave an interesting talk on making the most of your time when you visit your GP; Insomnia; Vertigo/Meniere's disease; mental health and the importance of good diet and exercise. 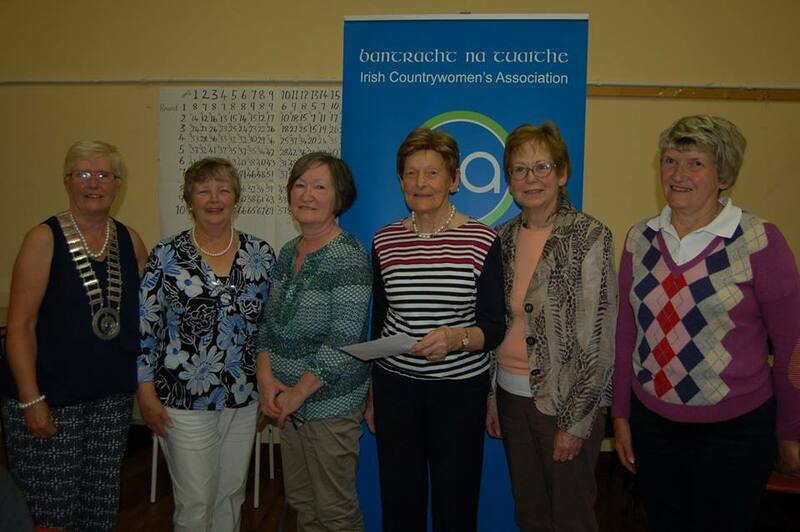 The draw took place for the Dorothy Smith Scholarships which this years takes the form of 4 x €100 vouchers. President Leila Beattie addressed the members and thanked the Officers and Committee for their support during her term of office. 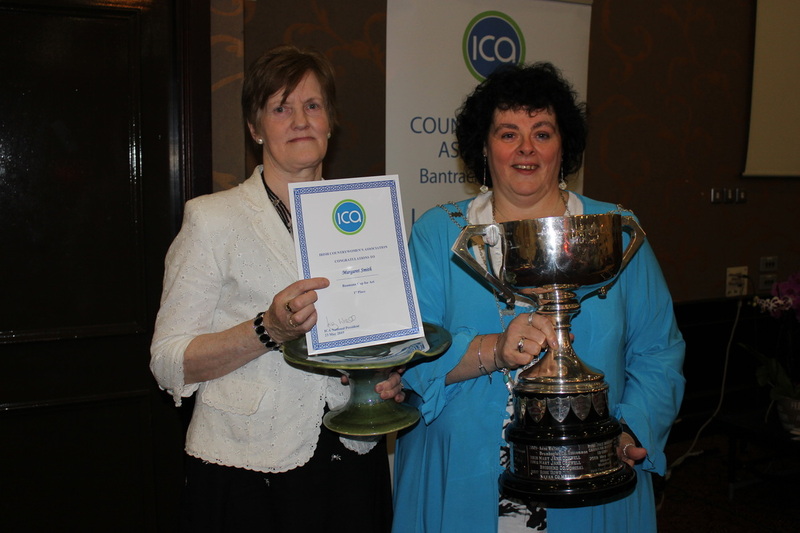 She thanked outgoing Treasurer Winifred Acheson for her meticulous accounting practice and also outgoing Competition Secretary Kathleen Coyle for all her work. 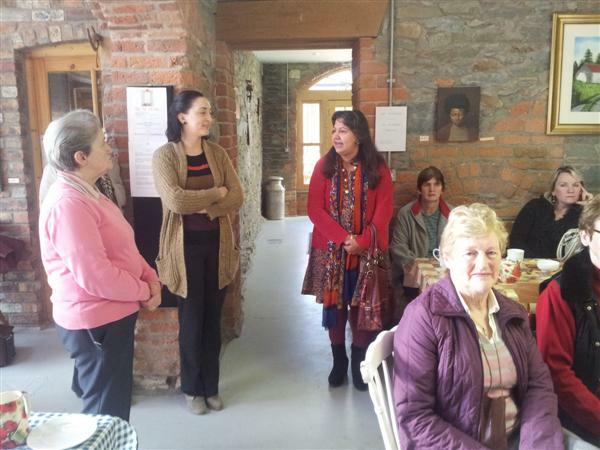 Leila went on to thank the members for their hospitality when visiting guilds and their support. 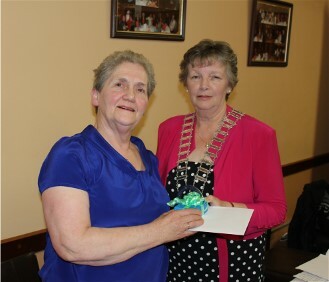 Leila wished the incoming President Anna Rose McCormack (member of Killeshandra Guild) well and thanked her for being so efficient during her term of Secretary. 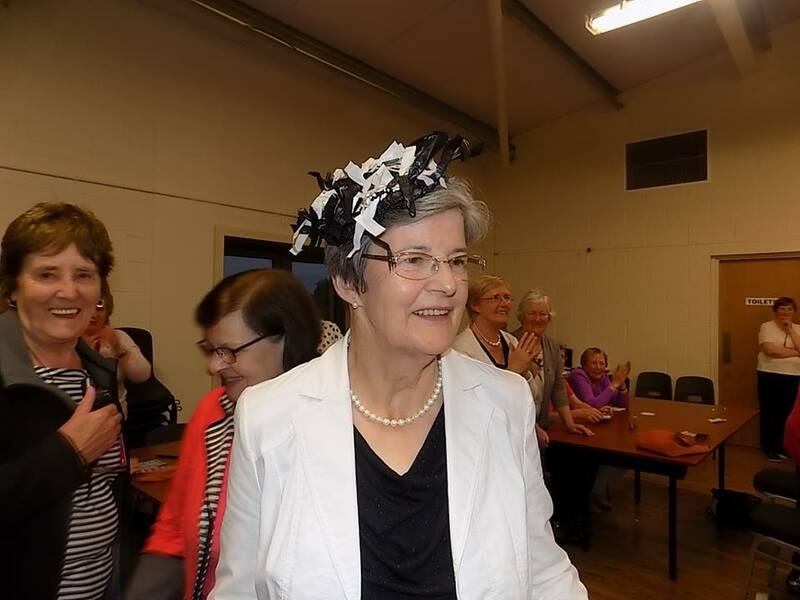 Mary Reilly President of Killeshandra Guild extended Congratulations on behalf of all the members in Killeshandra and wished Anna Rose every success and offered their support at all times. 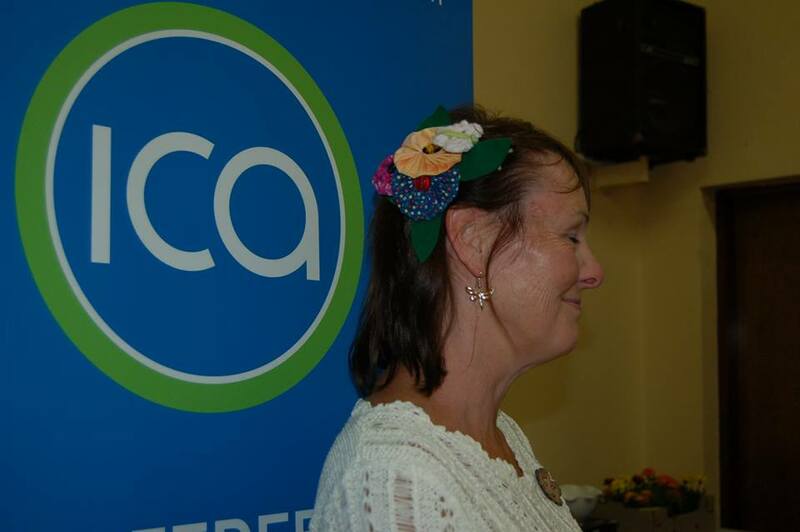 Anna Rose duly responded and said she looked forward to working with the new committee and said she would be totally committed to ICA during her term of office. 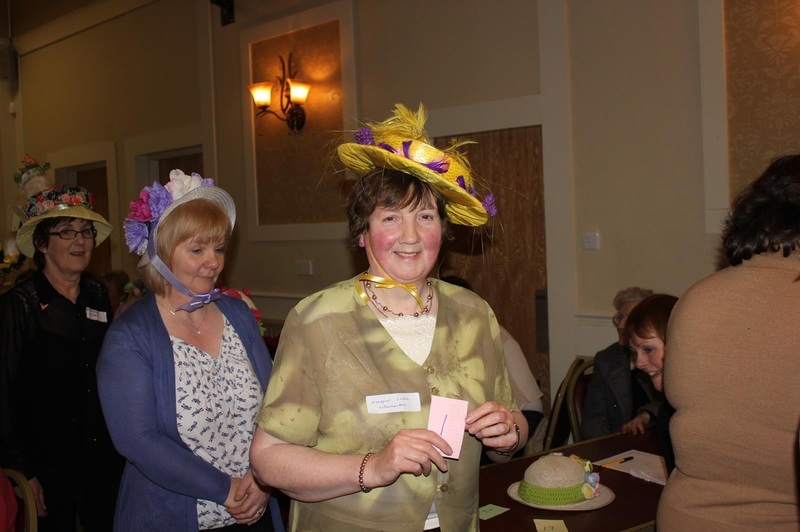 Anna Rose presented Leila with a beautiful brooch and card on behalf of all the members. The new officers and specialists for 2015 were introduced. 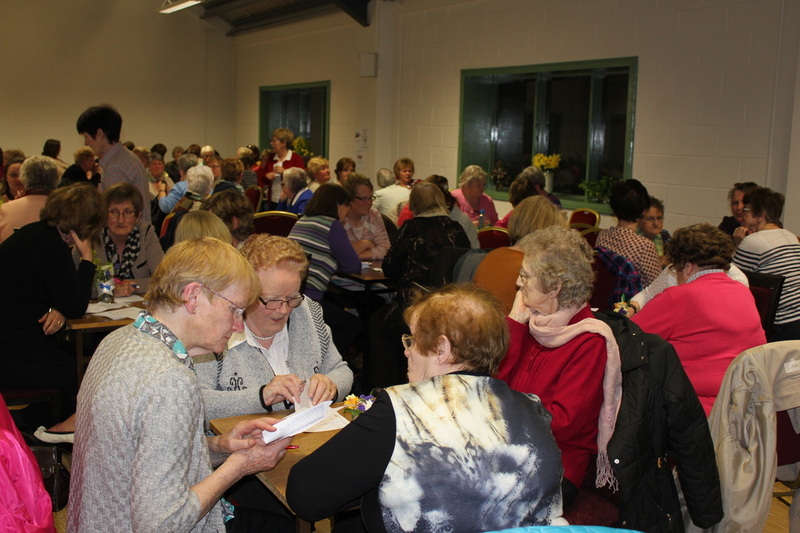 The Fun Quiz took place in the beautiful Virginia Show Centre on Tuesday 21st April 2015. hosted by Maghera Guild. 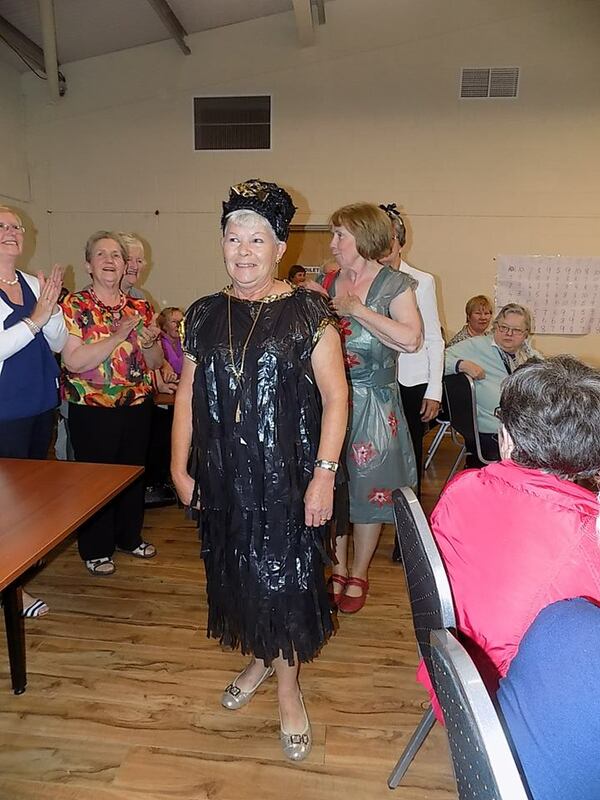 Annette Dunne President of Maghera Guild welcomed everyone. 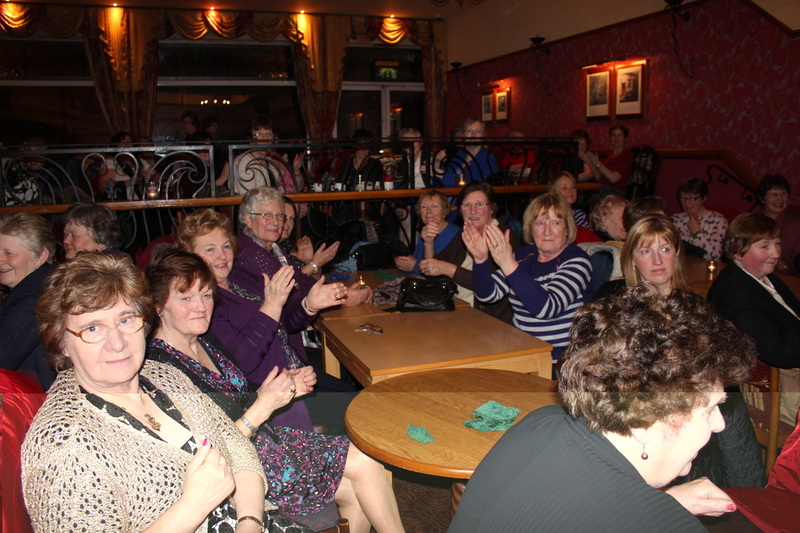 There were 24 tables and the Quiz Master was Larry McGinn. Maghera emerged as winners with Bruskey 2nd and Killeshandra & Mountnugent Joint 3rd. 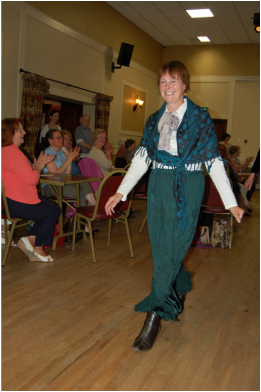 Following a delicious supper provided by Maghera members which was thoroughly enjoyed there was a competition for the most attractive and interesting way to wear a scarf. 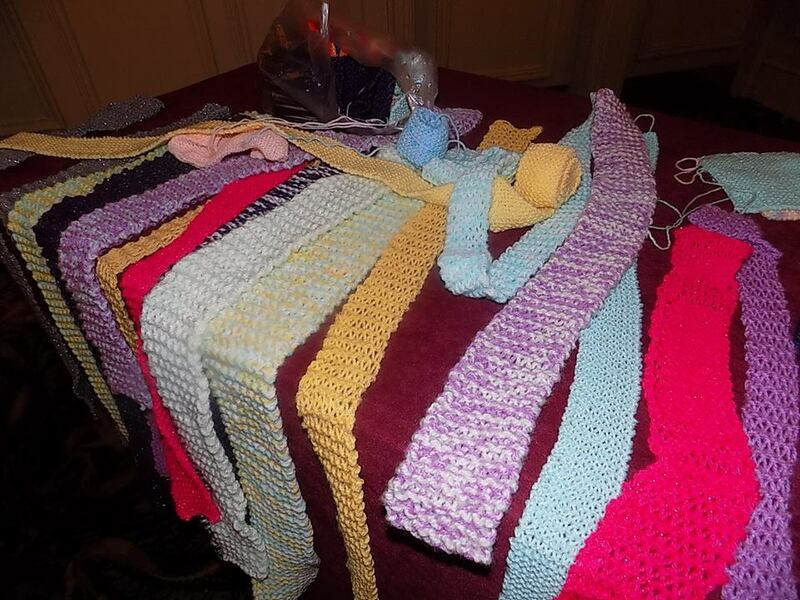 The majority of members participated and enjoyed seeing so many variations of scarves. 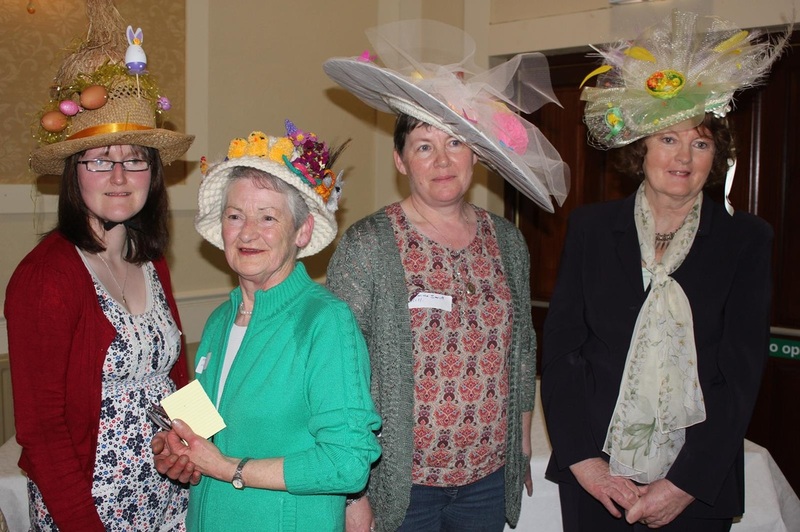 Sandra Bogan was the judge and the winner was Siobhan Hagan from Maghera Guild with Mona Hague from Butlersbridge Runner-up. 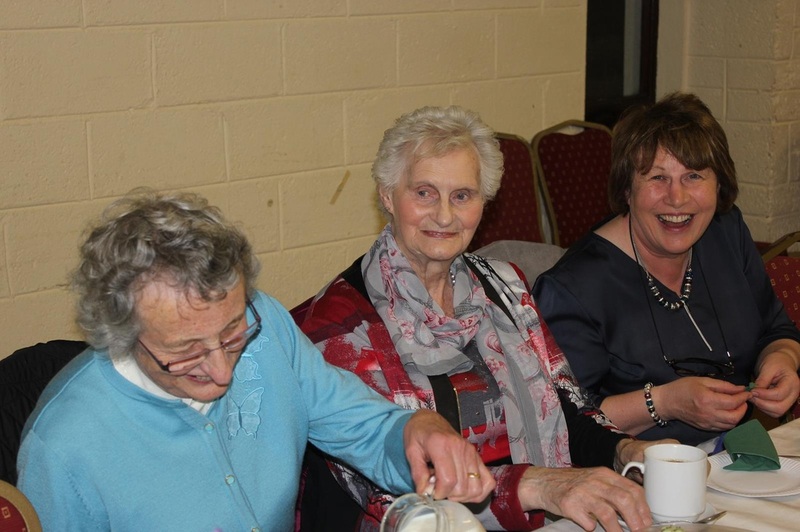 President Leila Beattie thanked Larry for being Quiz Master; everyone who participated in the Quiz; the ladies who provided the supper and prepared the hall. 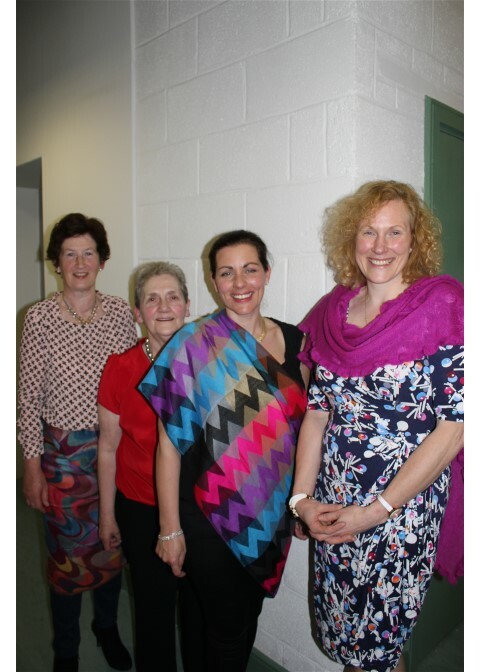 She also thanked Sandra for judging the scarves and everyone who participated in this fun competition. 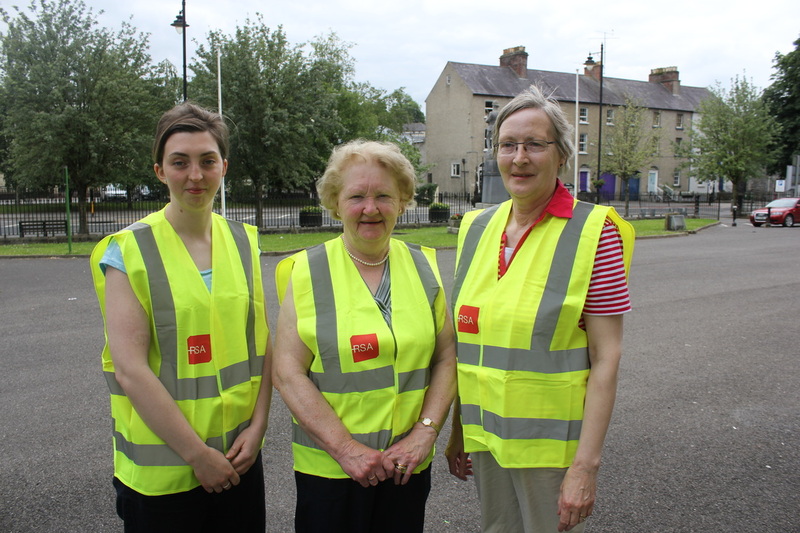 Left to Right: Mona Hague, Butlersbridge Guild Runner-up; Leila Beattie Federation President; Siobhan Hagan Maghera Guild Winner and Sandra Bogan Judge. 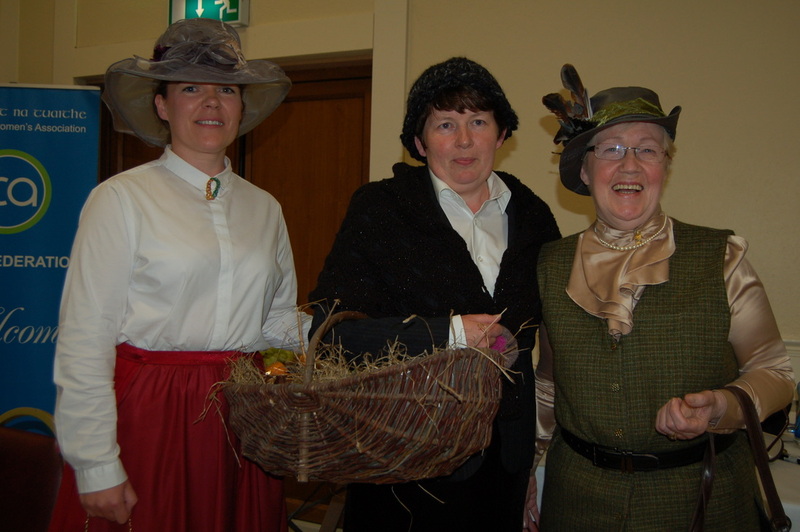 The Winning Team from Maghera (l to r) Annette Dunne; Maud Maxwell; Leila Beattie Fed. President; Bernie Lynch; Patricia Maxwell. 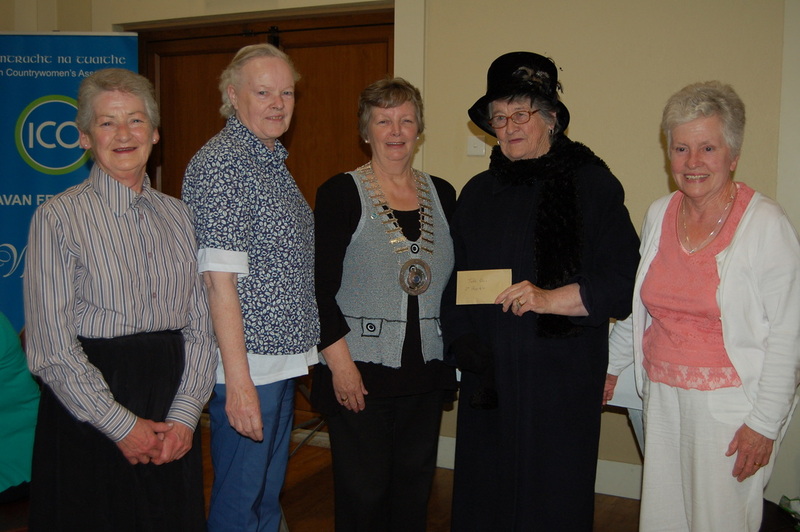 2nd Place Bruskey Team: (l to R) Bridie Smith; Rosemary Murphy; Leila Beattie Fed, President; Wilma Bennett; Anna May McDonnell. 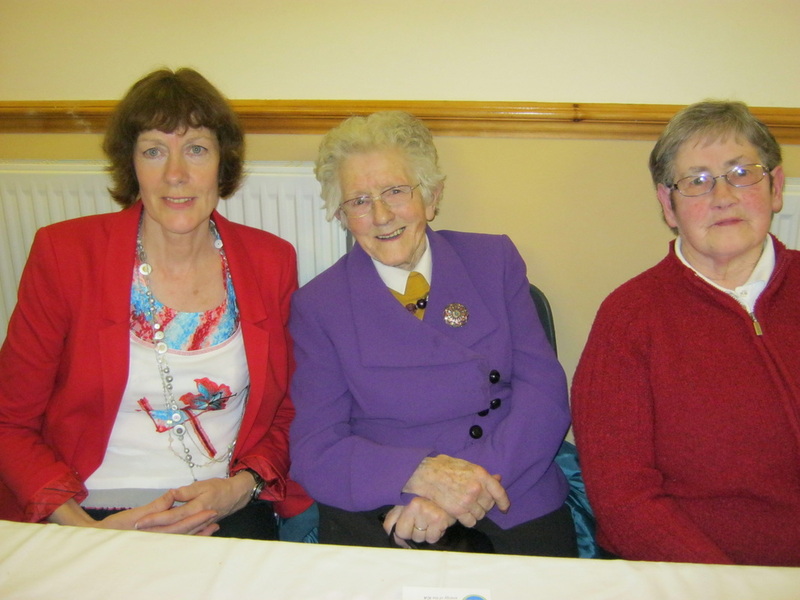 Joint 3rd Killeshandra: (l to R) Patricia Kivlehan; Mary O'Reilly; Leila Beattie Fed. 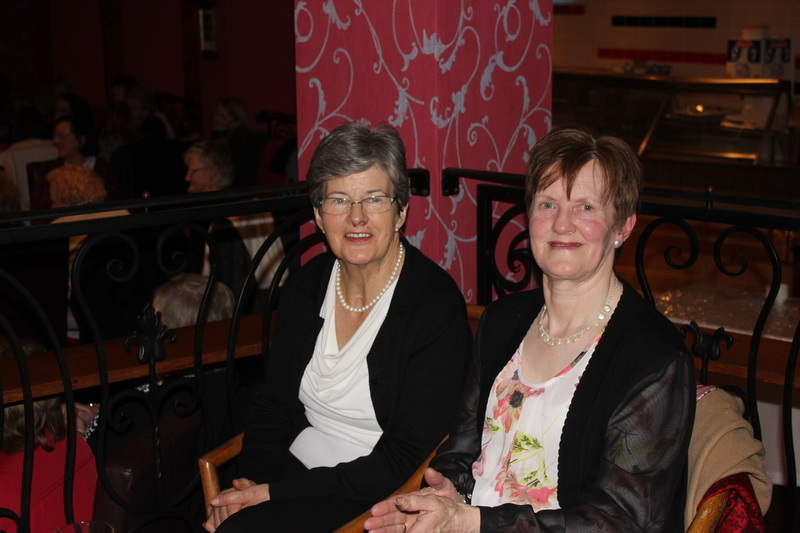 President; Margaret Hartin; Teresa McGibney. A Word in Your Ear celebrates national poetry day in Cavan in The Front Room in the Town Hall on Thursday 7 May between 6.30 and 8.30pm! Come and read a poem (yours or someone else’s), bring a favourite poet (or at least their poems), bring cake, tea, a comfy cushion and we’ll have an informal poetry party! Everyone welcome. Come and enjoy. Calling all Heart Heroes we need you this Happy Heart Weekend 2015! So ‘have a heart’ and come and join us in a local community near you, on May 7-9 (Thursday, Friday and Saturday). 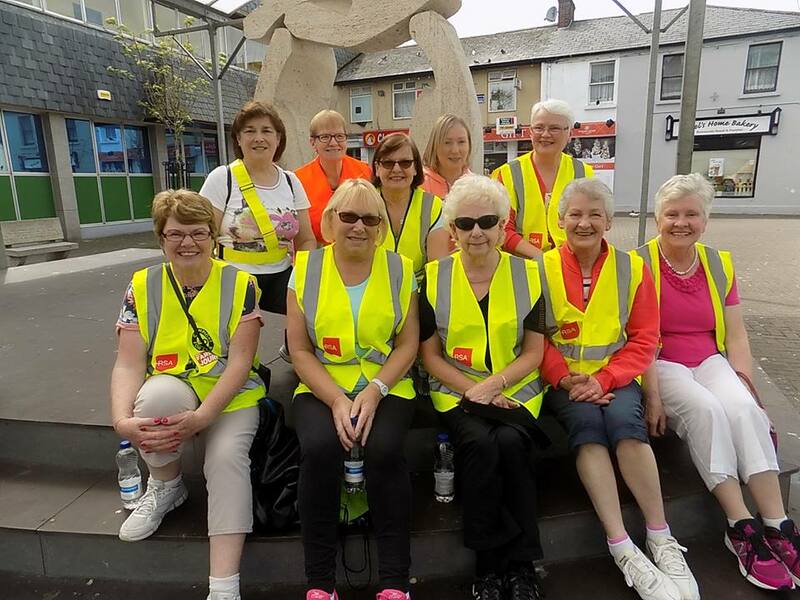 This Happy Heart Weekend we are looking for local Heart Heroes to donate an hour or two of their time to help us sell our Happy Heart pin badges in local communities across Ireland. 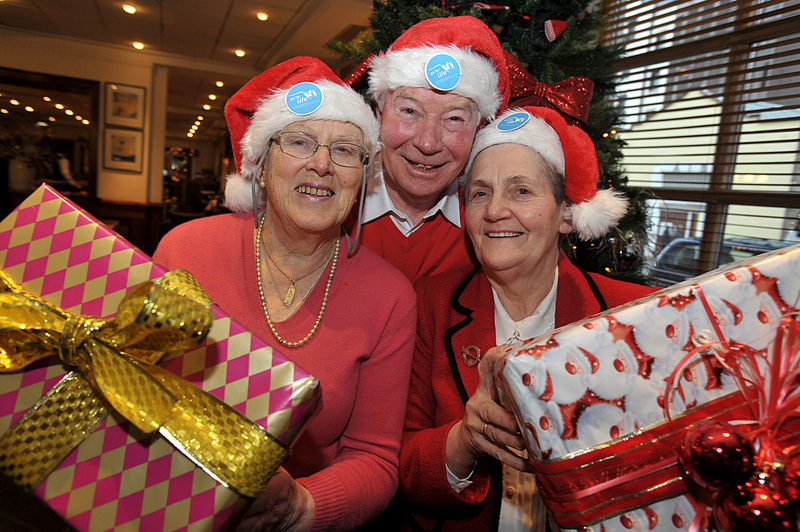 Every €2 will go towards helping Irish families fight heart disease and stroke through care, prevention and research. All we need… a couple of hours of your time, your smiling face and your Happy Heart! 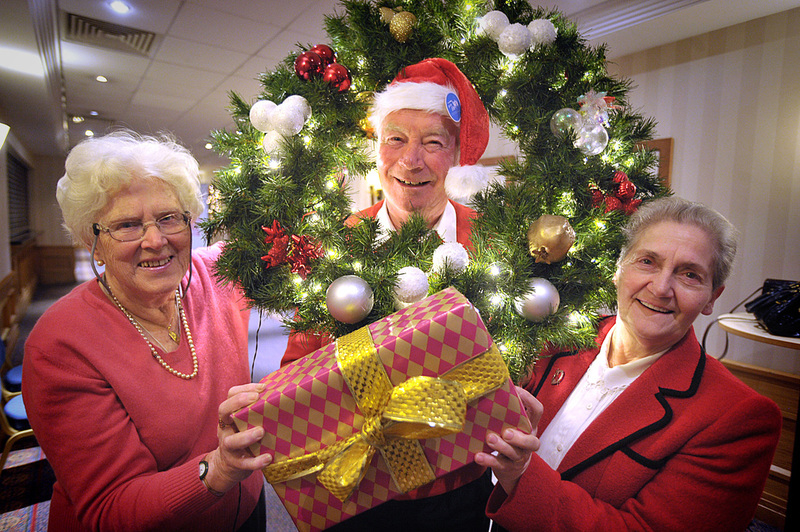 ‘IN A HEARTBEAT’ – CAN YOU DONATE AN HOUR OF YOUR TIME TO HELP KEEP HEARTS BEATING THIS HAPPY HEARTS WEEKEND 2015? 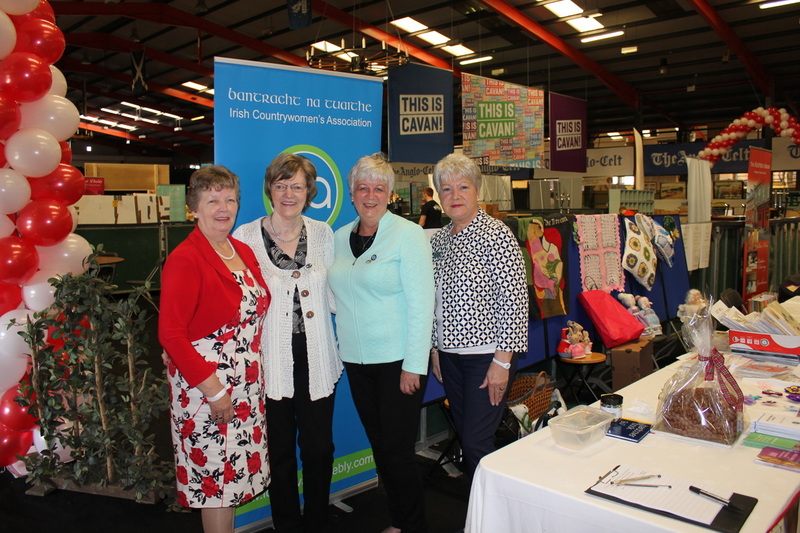 Cavan Women’s Network invites representatives from women’s groups in County Cavan to put forward a representative onto the Local Community and Development Committee (LCDC). Recently the women’s interest representative seat has been absented and so we invite expressions of interest to fill this role. 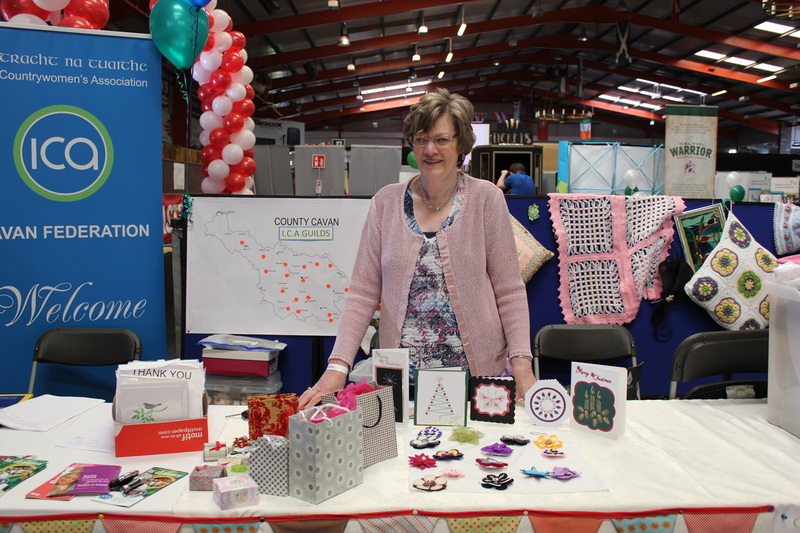 The LCDC is a development body for community and development in County Cavan and works closely with Cavan County Council, Public Participation Network and other agencies on a variety of sectors to positively affect people and groups within the county. 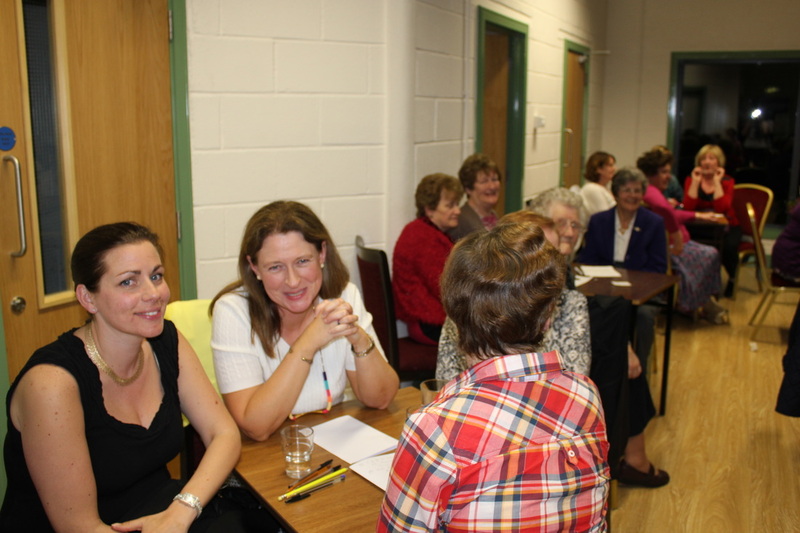 A representative from your group would need to be available for daytime meetings a handful of times during the year and to feed back material to network bodies from these meetings. An awareness of women’s issues in the county would be a crucial criteria for a representative and a proven ability to work with other groups in assessing and consulting on women’s issues they may have. 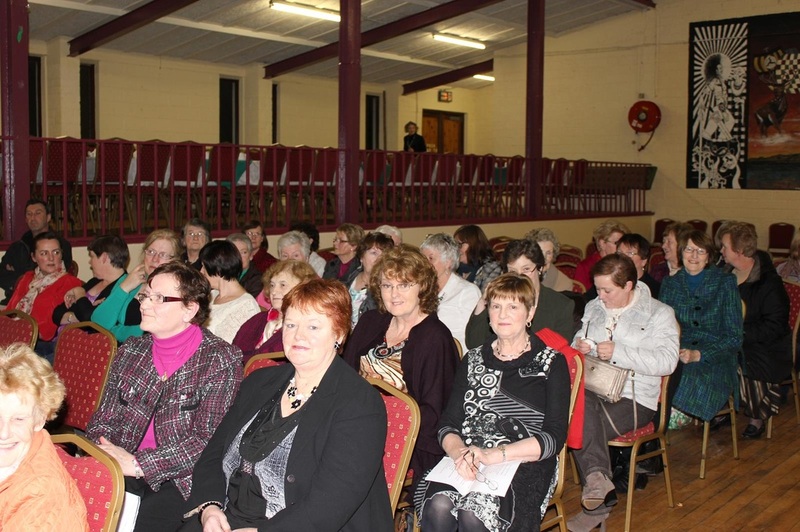 The election will be facilitated by Daniel Downey, Public Participation Network facilitator and afterwards there will be a Cavan Women’s Network event ‘Conversation in Cavan’ (7.30pm-9.00pm) to discuss how to get more women involved in running the country. 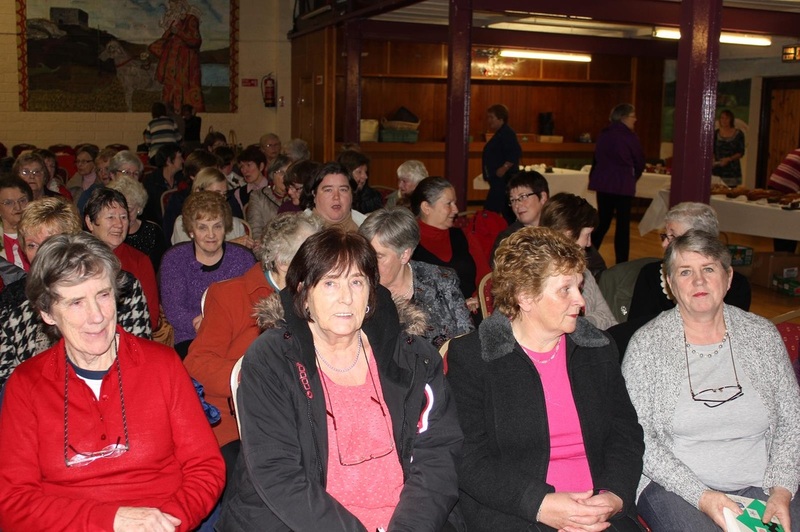 The Spring Federation meeting was held in Mountnugent Hall on Thursday February 12th hosted by Mountnugent Guild. Tess Brady, Guild President welcomed everyone. There were forty members present from eleven guilds. Reports were given by Officers and Specialists. 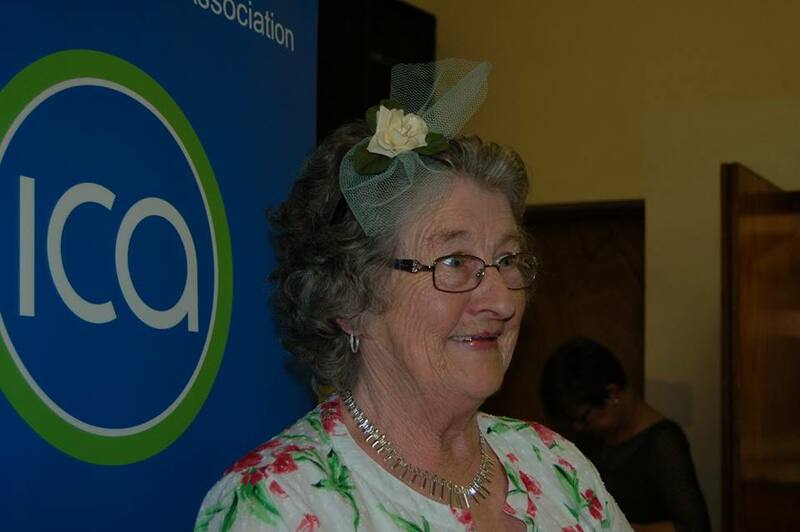 Phyllis McEvoy Mountnugent Guild Secretary also gave a report. 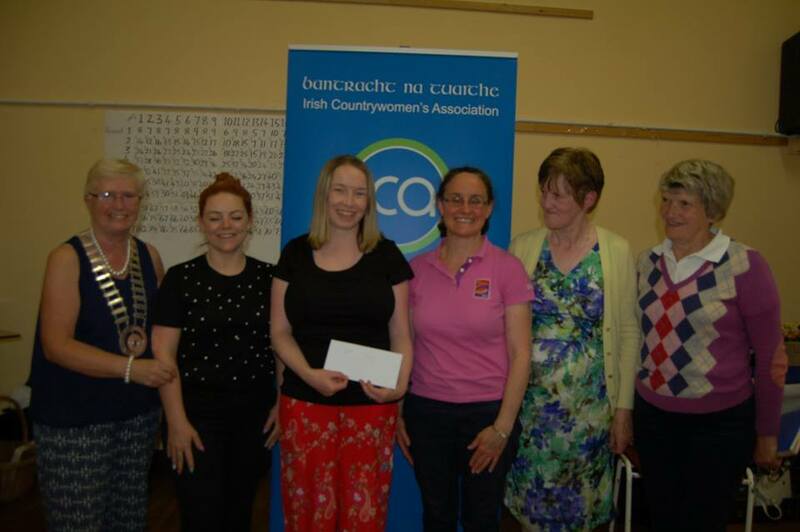 President Leila Beattie addressed the members and introduced Guest Speaker Martin McCabe from Breffni Insulation who gave a very informative talk on the various types of home insulations and grants available. 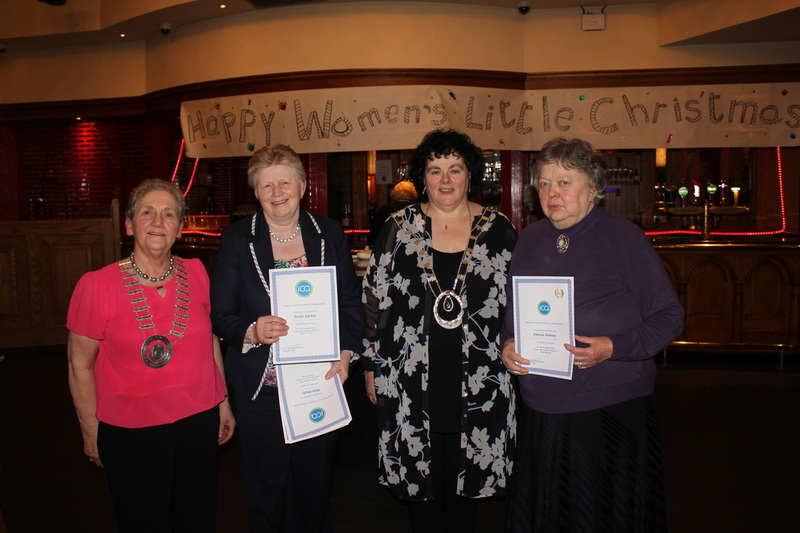 Leila presented Long Service Membership Certificates to Peggy Farrelly and Peggy Sheridan, Mountnugent Guild who have both been members for over fifty years. 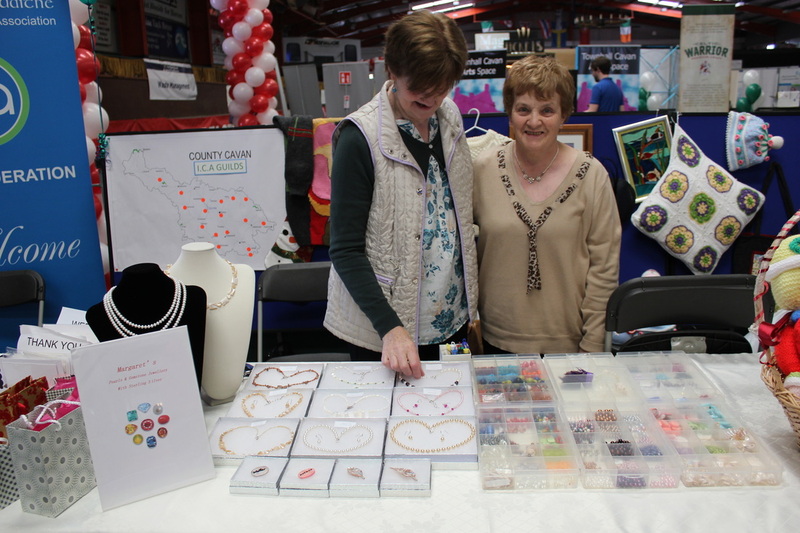 Details of the Fun Night to be held in the Show Centre, Virginia on 21st April were distributed. 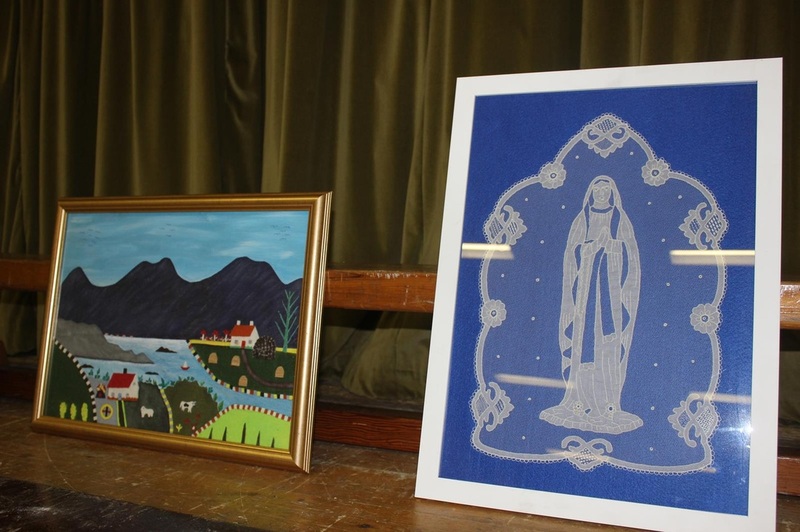 Photos below show some of the lovely crafts on display by Mountnugent members. 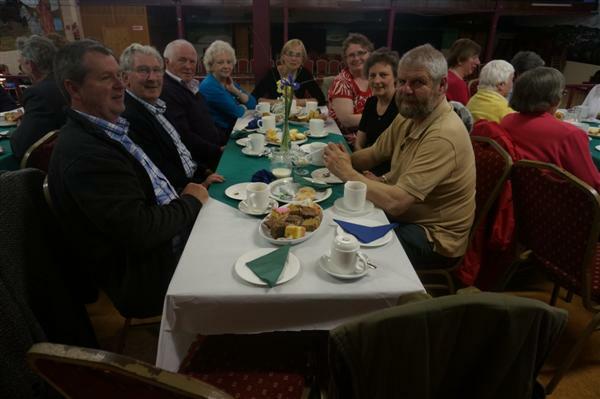 The meeting concluded with a delicious supper provided by Mountnugent Guild members. 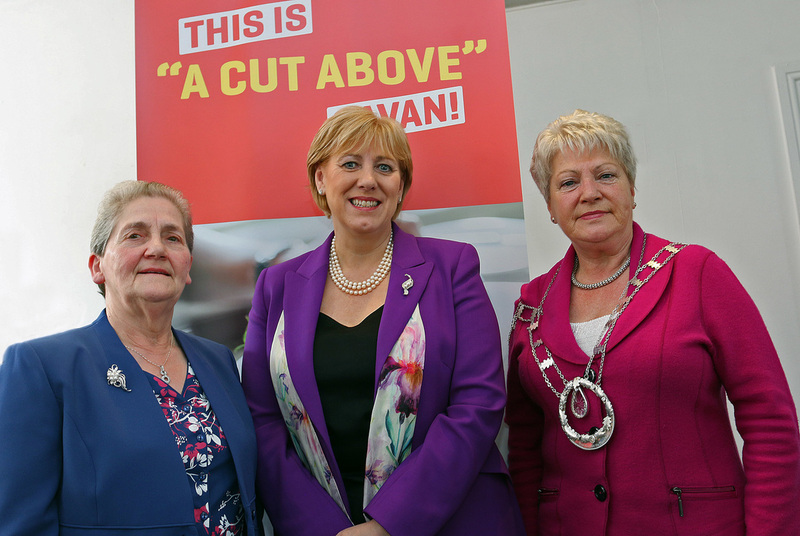 Cavan Women’s Network is organising a ‘Conversation in Cavan’ to discuss how to get more women involved in running the country on Thursday 26 February between 7.30pm and 9pm in the Cavan Crystal Hotel. Everyone is welcome. 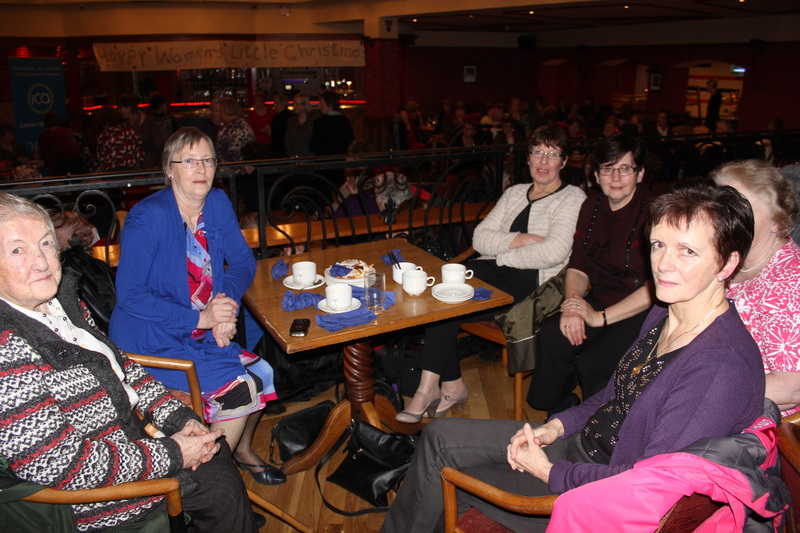 Cavan Women’s Network is concerned at the poor representation of women in government (local and national). We are keen to develop a supportive network/collective of women interested in getting women elected as representatives and on to Boards. We hope that people will come together to discuss the issues facing women in politics, discuss how to overcome these obstacles, the factors that deter women from standing and to look at what we can do, as individuals and together, to support female candidates, not just when they are running but also when they are in office. We want to provide encouragement, mentoring, engage in discussion, and training. We feel that if politics is to improve the lives of people, more women need to be involved, and we need to work together. If we want to be effective, we need to start work now, prior to the 2016 election. 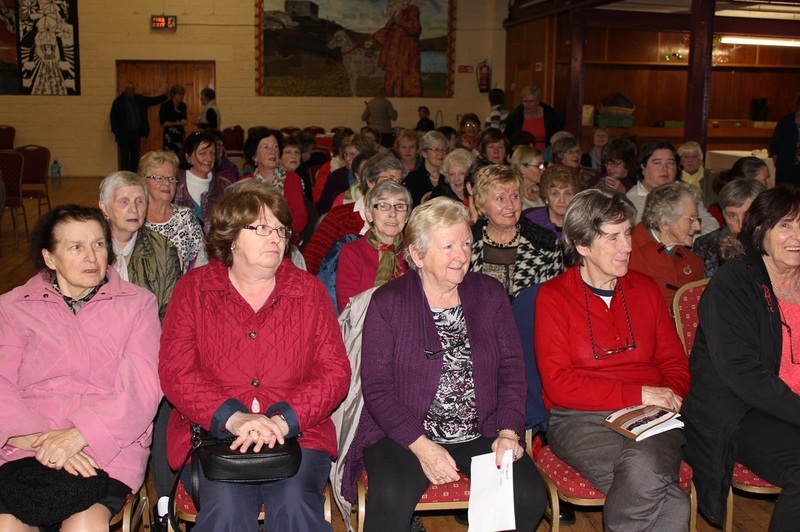 What is Nollaig na mBan? 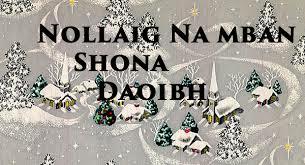 Little Christmas is also called Women's Christmas (Nollaig na mBan), and sometimes Women's Little Christmas. 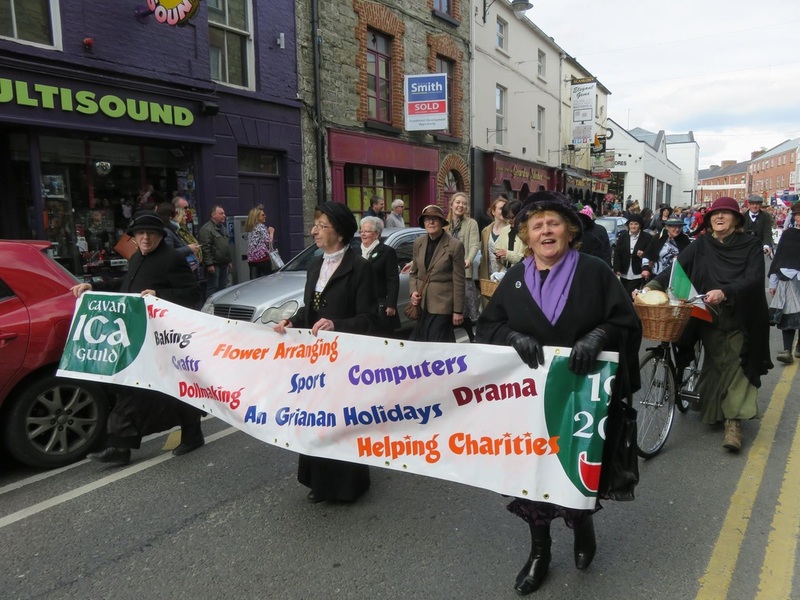 The tradition, still very strong in Cork and Kerry is so called because of the Irish men taking on all the household duties for the day. 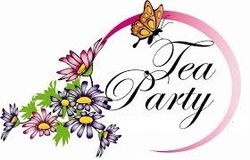 Most women hold parties or go out to celebrate the day with their friends, sisters, mothers, and aunts. 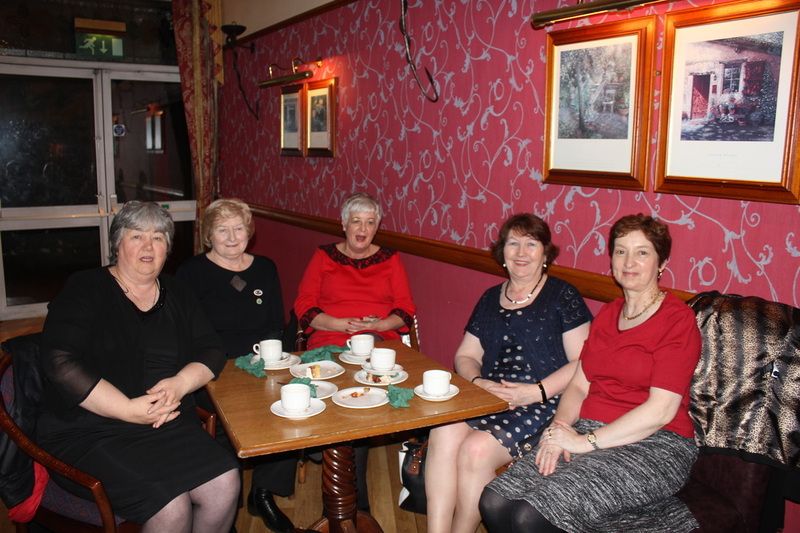 On Friday 9th January the members of Cavan Federation celebrated Nollaig na mBan with a Social Evening in the Farnham Arms Hotel, Cavan. 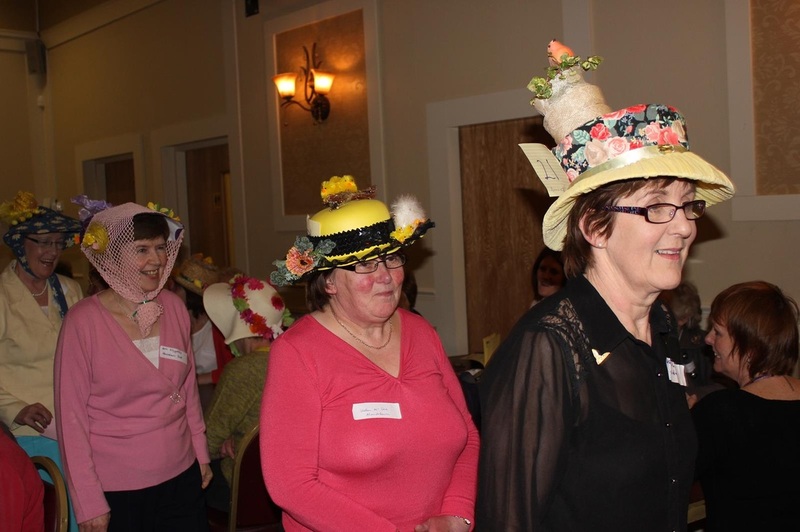 Over 140 members attended this wonderful social event. 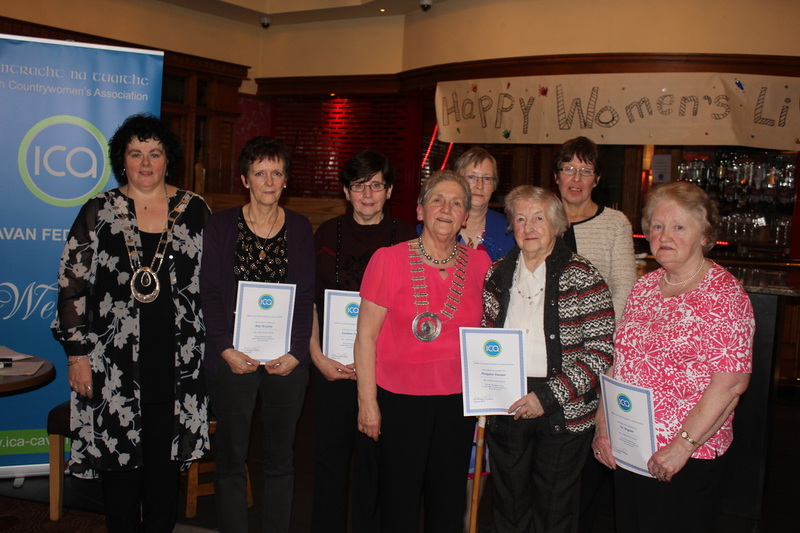 President Leila Beattie welcomed everyone with a special welcome to National President Ms Liz Wall who presented Long Service Certificates to members. 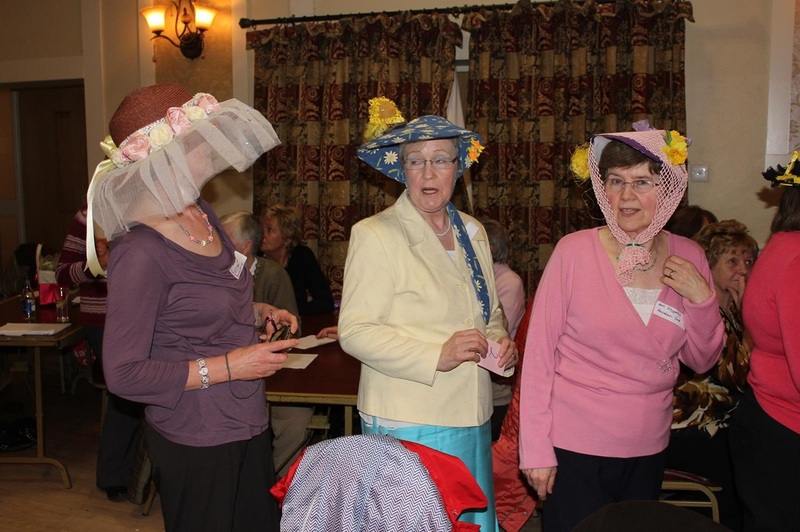 Following the delicious finger food members enjoyed the music and dancing. 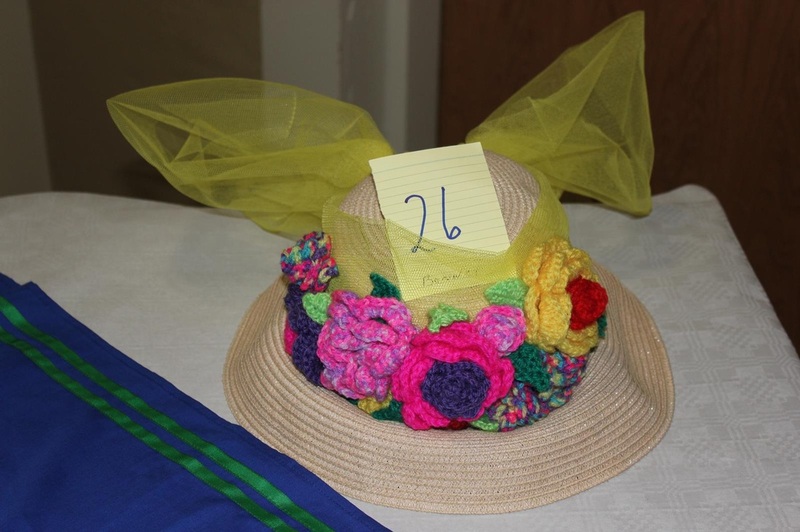 A raffle was held for numerous prizes. 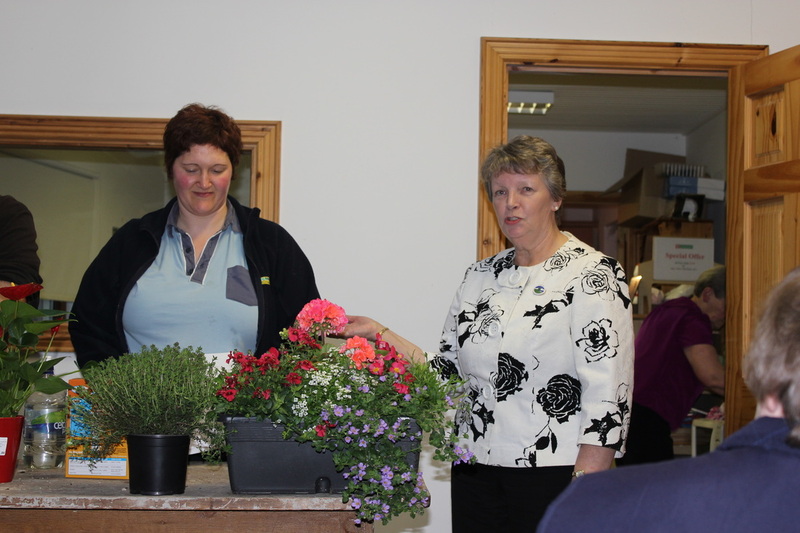 Leila presented Liz Wall with a beautiful potted shrub. Michael Ring TD, Minister of State at the Department of Transport, Tourism and Sport launched the Go for Life Grants in The Alexandra Hotel In Merrion, Dublin. Federation President Leila Beattie who is a member of Bruskey Guild was randomly selected to speak about the Grant and how it had benefitted Bruskey Guild. ICA members are invited to take part in new flagship current affairs television programme, ‘Claire Byrne Live’ on a Monday night. The launch programme will take place on Monday 19th of January and continue on subsequent Monday nights. The show is replacing the current Tuesday night Prime Time audience discussion programme and will incorporate some of the elements of previous shows such as The Frontline and Questions and Answers. There is no charge for attending the programme and we would invite you to choose a Monday night of your choice (excluding bank holiday Monday’s). Audience arrive at 9:15pm and the programme will go live at 10:30pm. All audience members must fill in the application form attached, to apply to attend the programme. The topic and issues have yet to be confirmed. It is an enjoyable evening, with a small drinks reception after the programme. 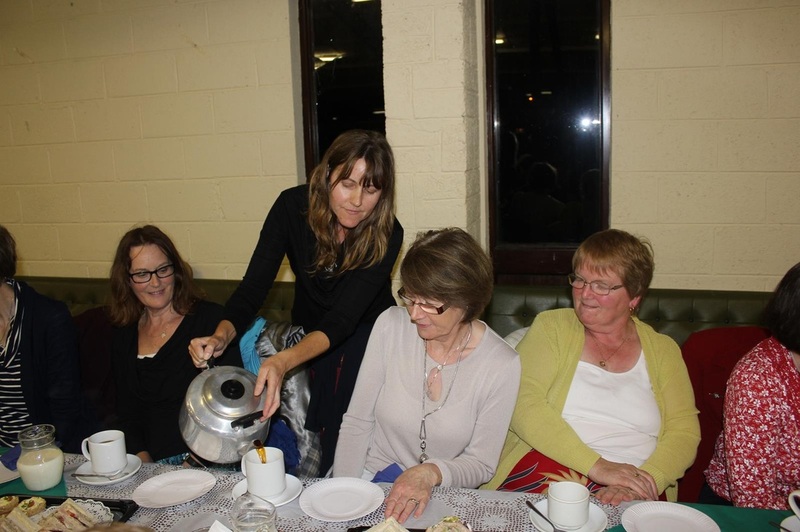 The fundraising tea party which was held in the Community Centre Ballinagh on Friday 17th October was a good success. 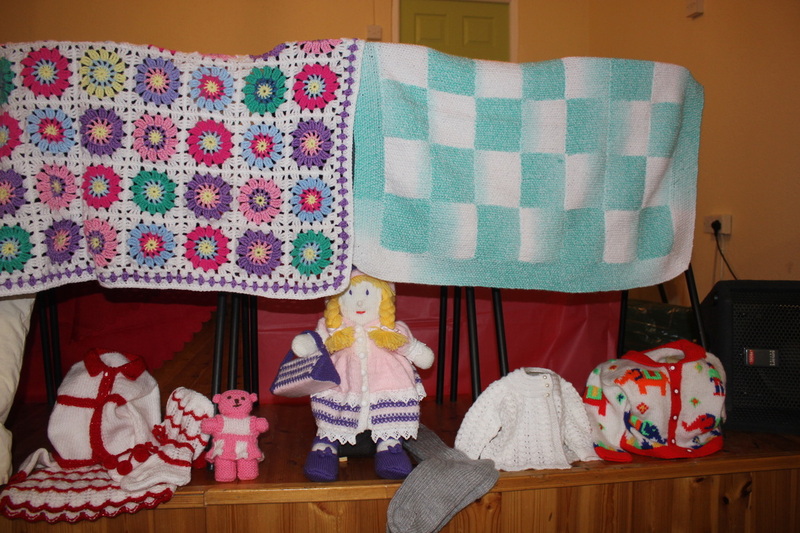 Proceeds are going towards the refurbishment of bedrooms in An Grianan. 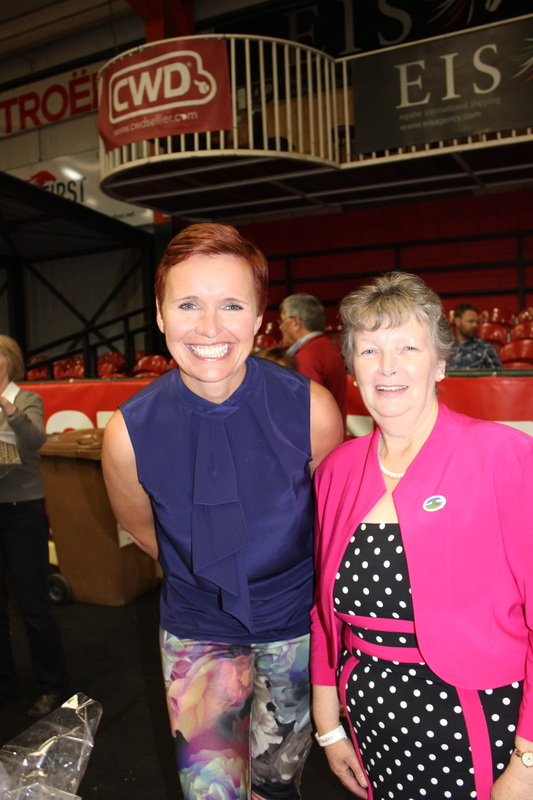 Leila Beattie Federation President gave a warm welcome and thanked everyone for their support. 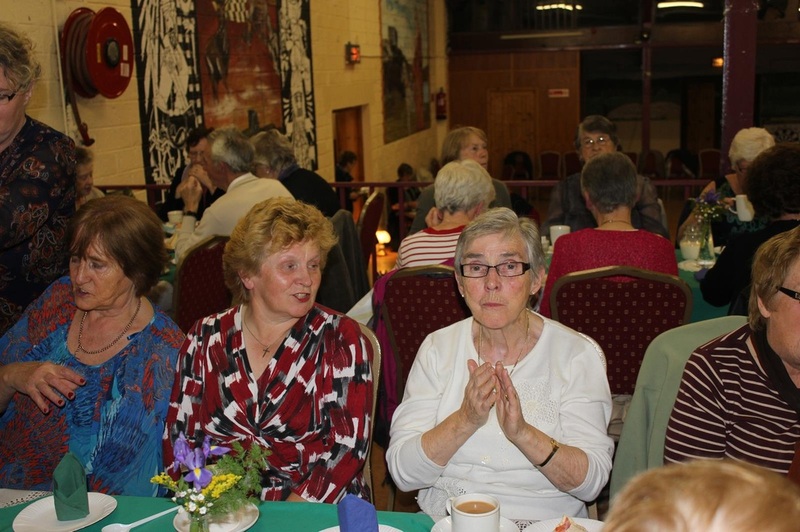 Everyone enjoyed the sumptuous supper and the dancing which followed. 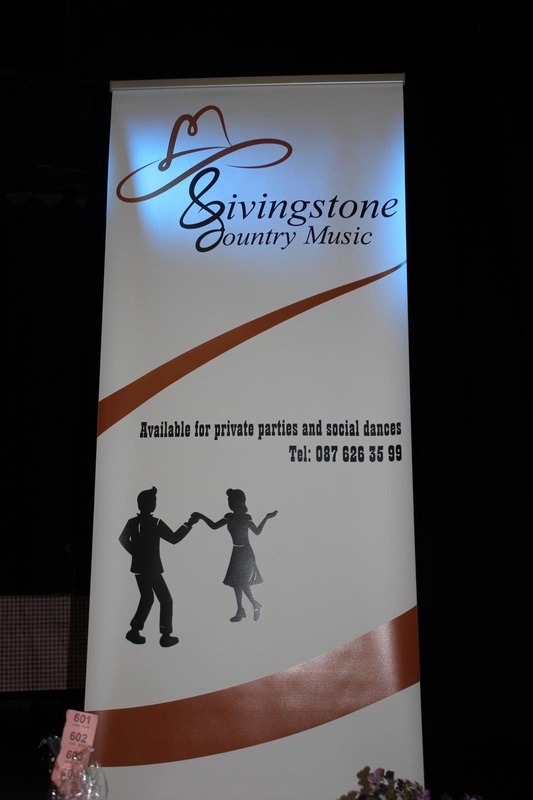 Music was provided by Nigel Livingstone "Livingstone Country Music". 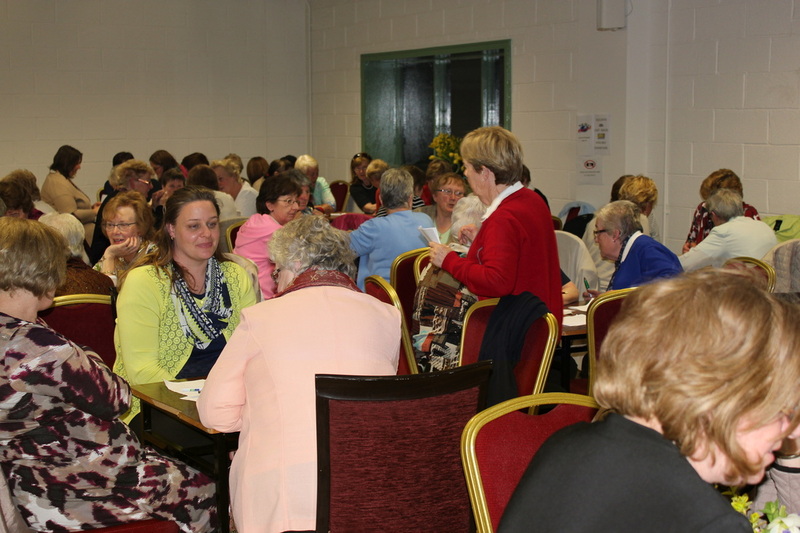 The autumn federation meeting was held on Wednesday 17th September in Tunnyduff Hall hosted by Knockbride West guild. 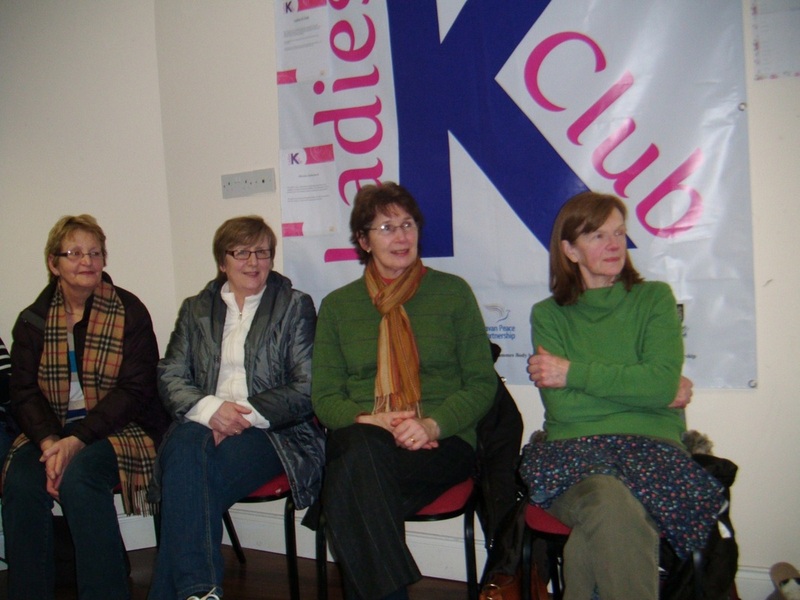 Representatives from all guilds were present. 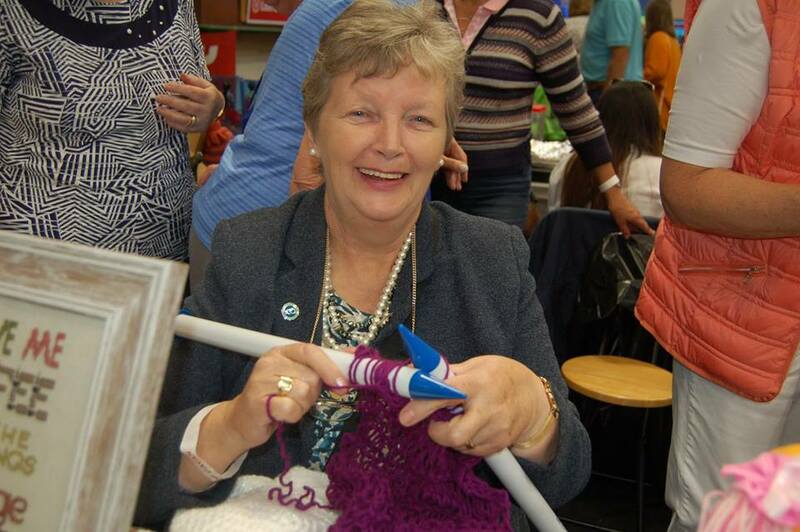 Breda Johnston, President of Knockbride West guild extended a warm welcome to all present. 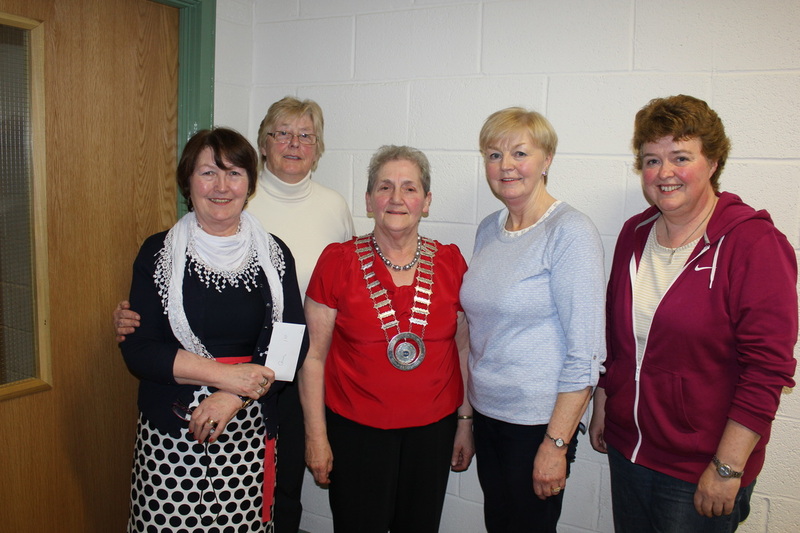 The meeting was chaired by President Leila Beattie who gave a special welcome to six new members in Drung Guild. Reports were given by the Officers and Specialists. 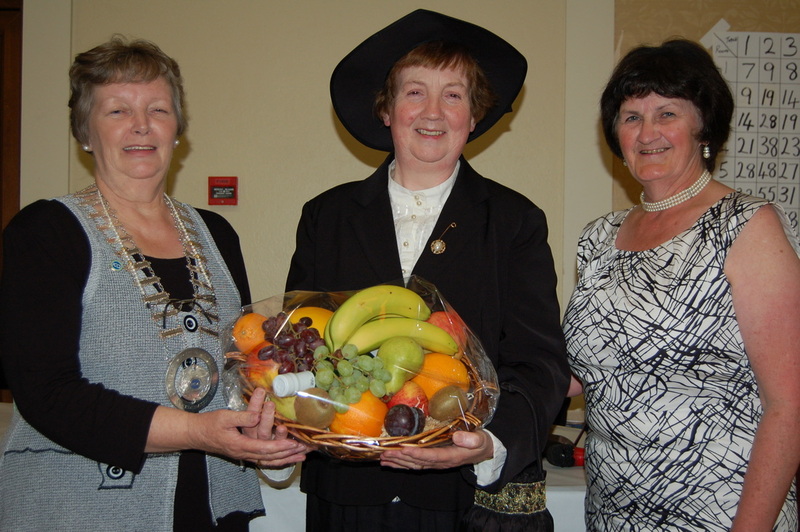 Members were encouraged to earnestly seek new officers and committee members for the next triennial. 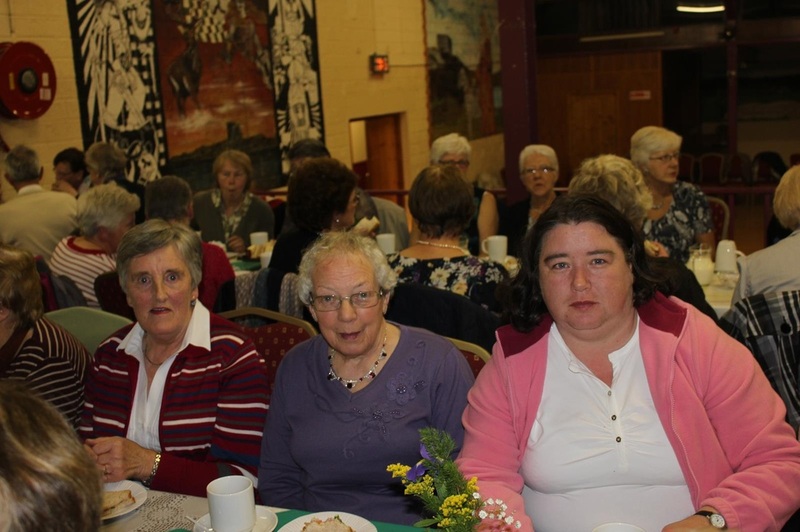 Competitions for Flower Arrangement and Tray of Vegetables took place (See Competitions for results).Everyone enjoyed the beautiful supper provided by members from Knockbride West. 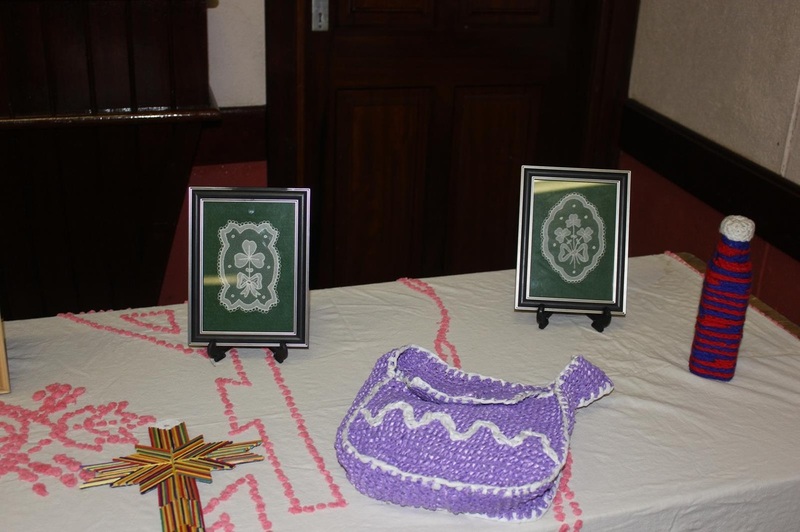 Photos below show some of the crafts which were displayed and made by the host guild. 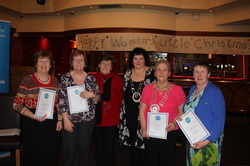 Maghera members being presented with their prize. 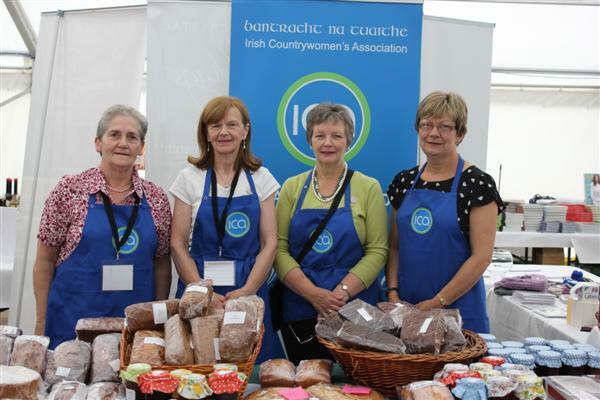 The ICA stand at the Taste of Cavan was very successful with a large selection of home-made cakes, bread, jams and chutney for sale. 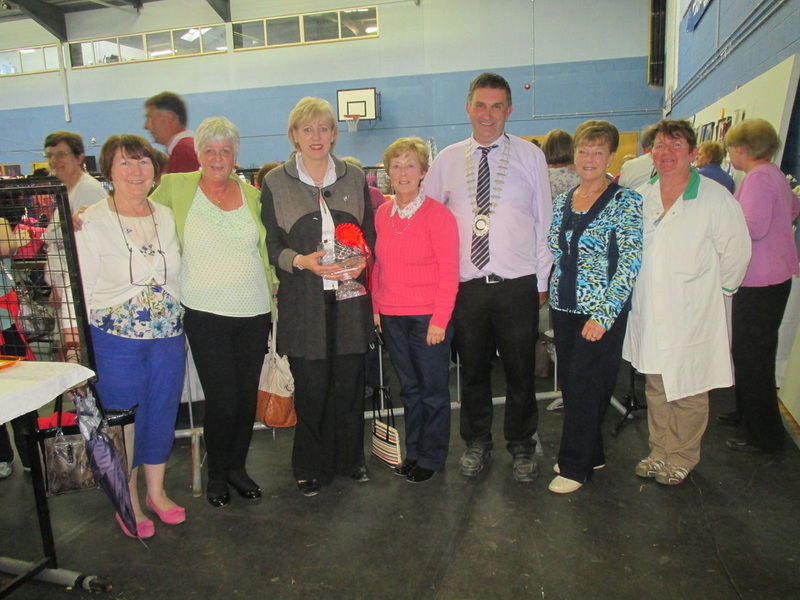 The Competition for best Jar of home-made Chutney was won by Ada Vance, Killeshandra Guild; 2nd Mary Ryan Kildallan and 3rd Rusemary Murphy, Bruskey. Congratulations Ada and to all who entered the competition. There were 9 entries. 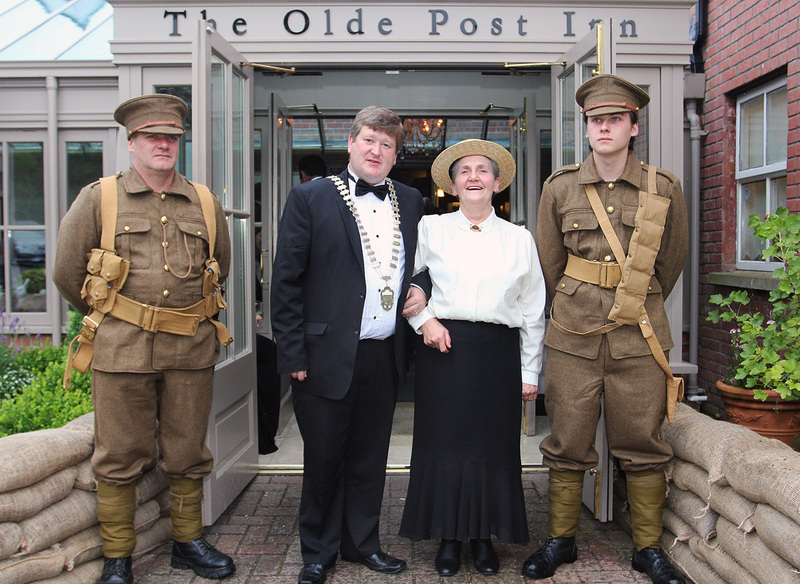 Cathaoirleach of Cavan Co. Council Shane P O'Reilly escorts Leila in her time appropriate costume into the Olde Post Inn for the 7 course Tasting Menu to commemorate World War 1. 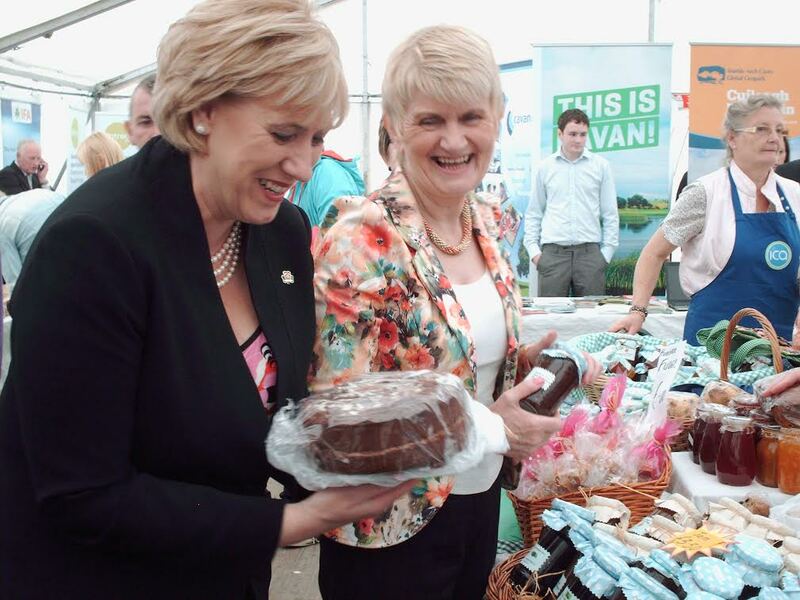 Heather Humphreys - Minister for Arts, Heritage and the Gaeltacht admiring the chocolate cake which she purchased from the ICA Stand. 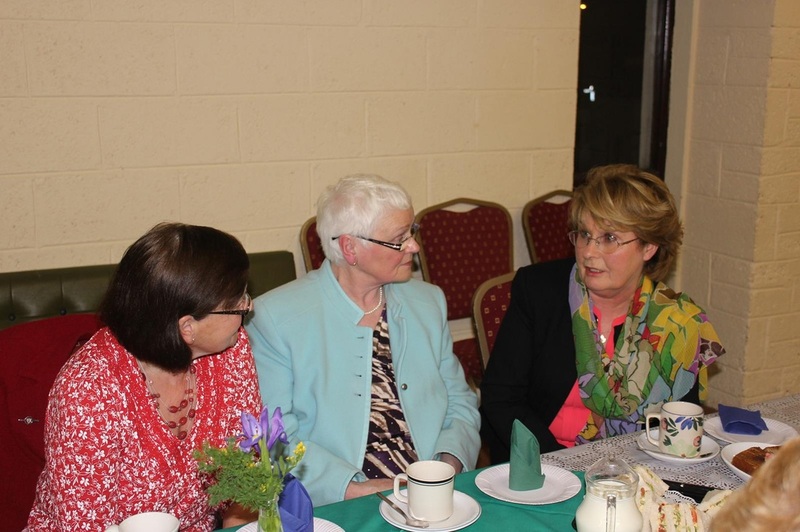 Looking on is Marian Harkin MEP. 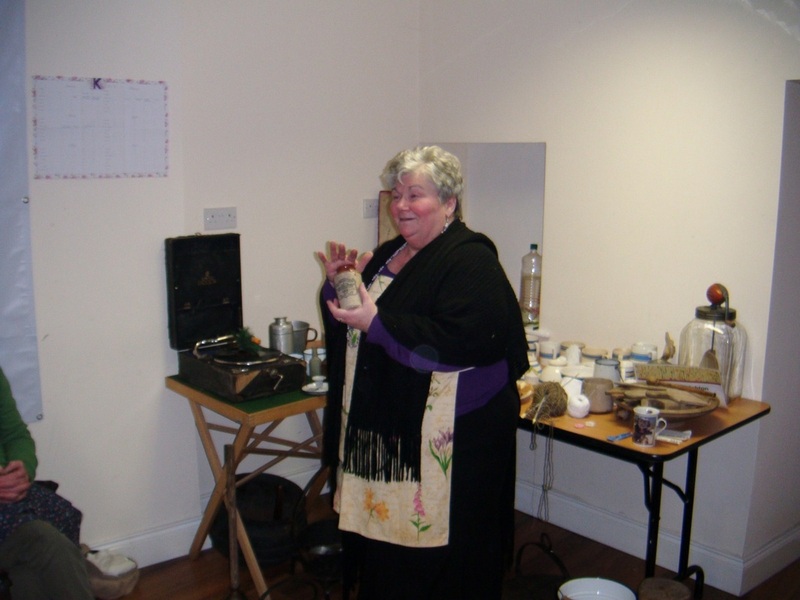 Maura Connolly Butter Maker looks on as volunteers have a go at churning. 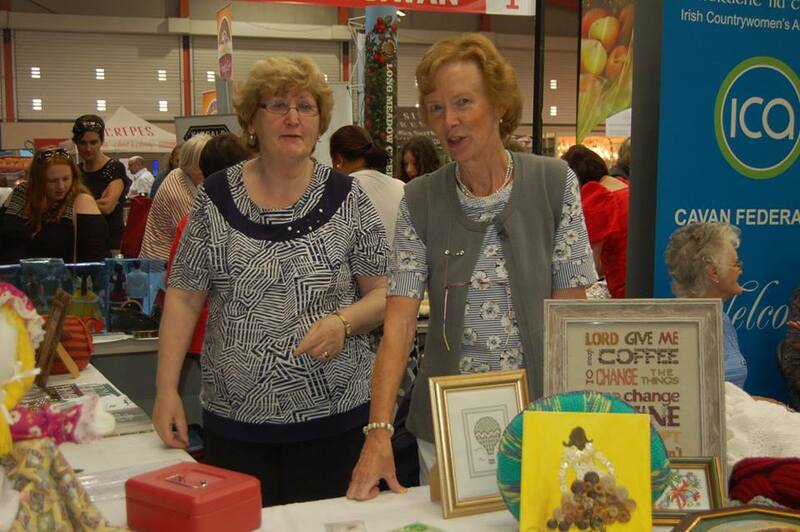 Hardworking ladies on the ICA Stand. 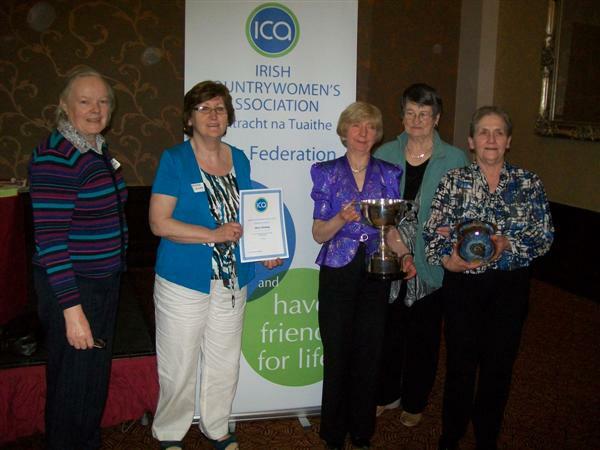 Ada Vance; Rosemary Murphy; Anna Rose McCormack and Leila Beattie, Federation President. 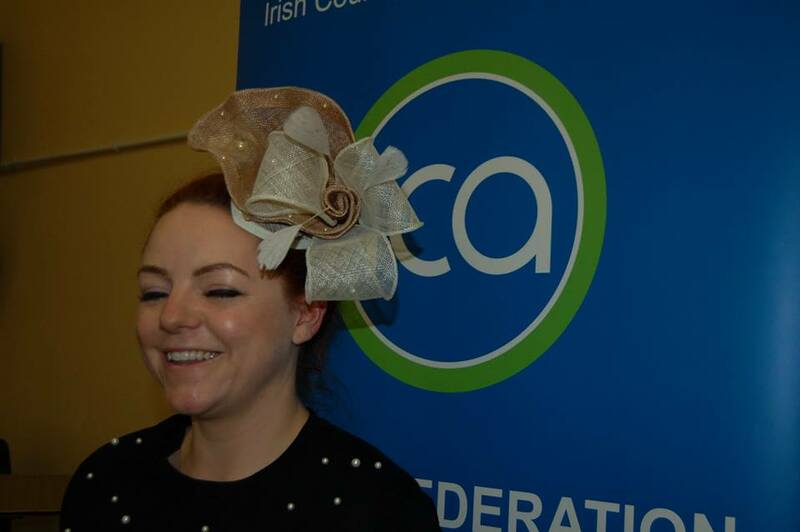 An exciting and dynamic Fashion course starts at Cavan Institute in Sept 2014. It may suit people who are returning to work or who are already working but would like a change of career. 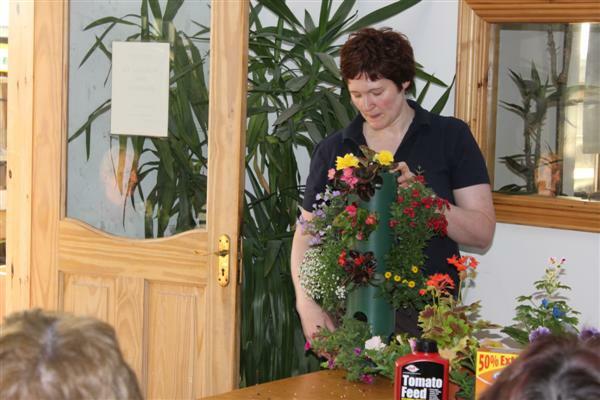 Cavan Institute embraces life-long learning and will support any learners who are balancing their home and work life. 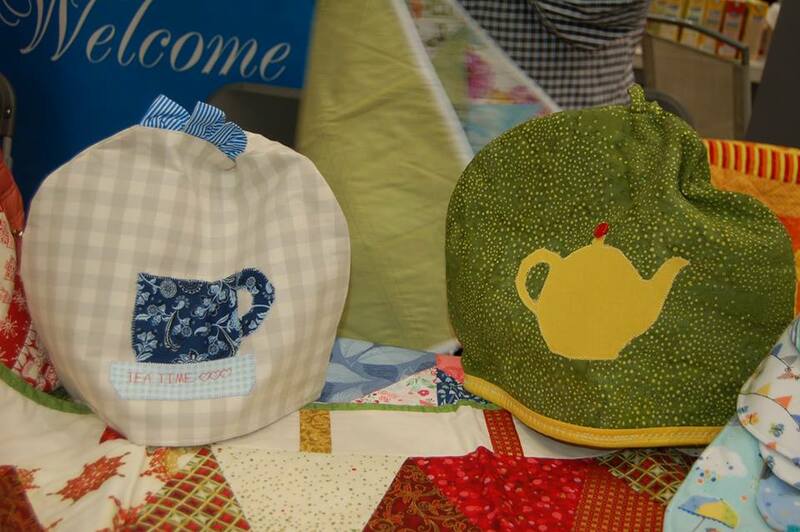 Whether your interest is design, craft or sewing, consider this year as a stepping stone to your new career. 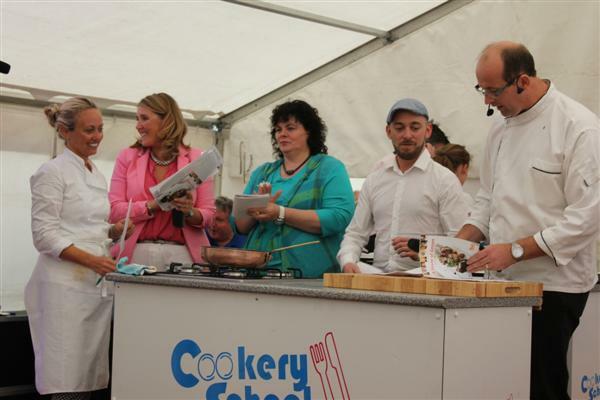 Whilst you may have completed part-time & evening courses, perhaps now is the time to consider day school. 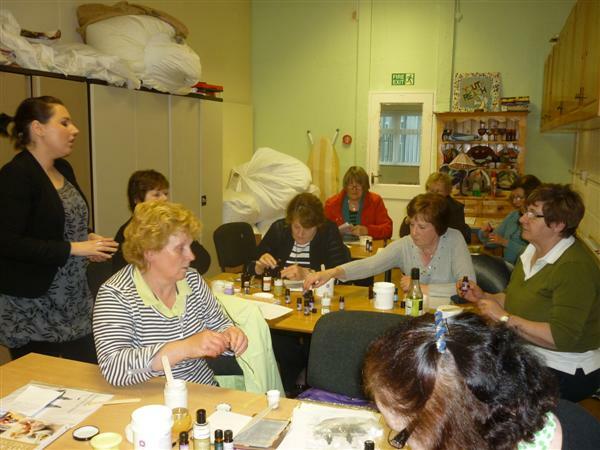 Class timetable can be flexible, and meet the needs of complete beginners or people with some creative skills that they would like to develop. 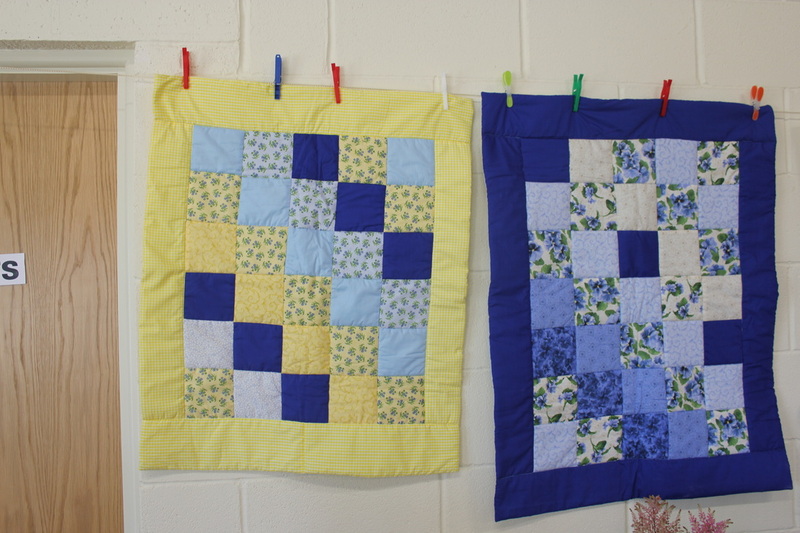 A creative experience for students wishing to develop or gain sewing skills and pattern making. 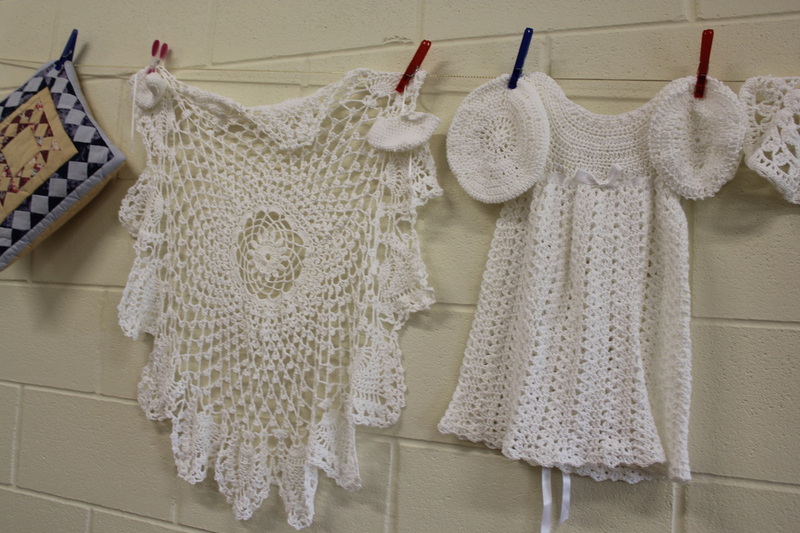 Ideal for students who have or would like to develop a craft or garment making ideas. Great for start your own business, developing creative skills to use within retail industry or fashion portfolio building. 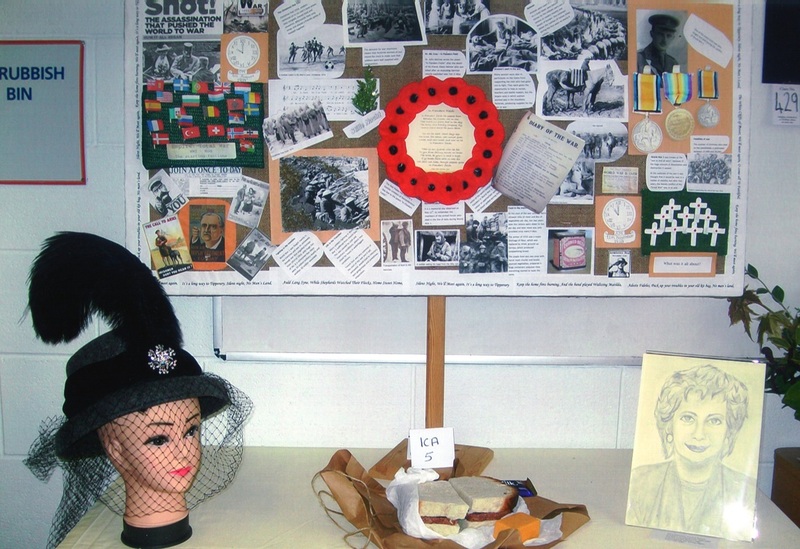 Flexible timetabling, hands on teaching with individual career guidance at learners own pace. Suitable for all career stages from beginners to mature learners. 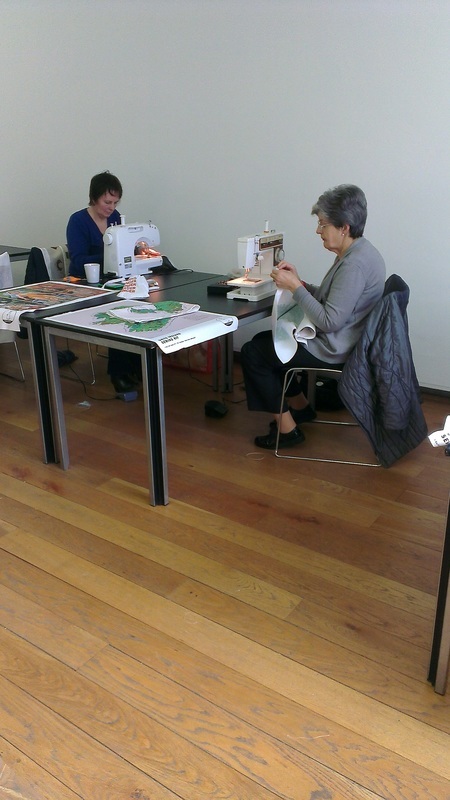 No previous fashion or sewing experience necessary however existing skills can be developed and advanced. 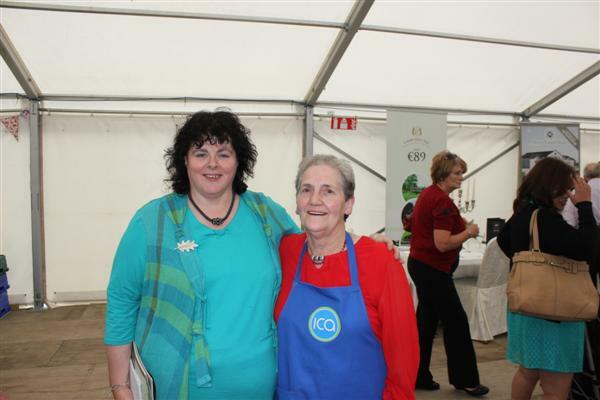 Leila Beattie Federation President and Liz Wall National President of ICA joined An Taoiseach Enda Kenny TD at the launch of the 3rd Taste of Cavan at Fallon and Byrne, one of Dublin’s finest food outlets on Wednesday 2nd July. 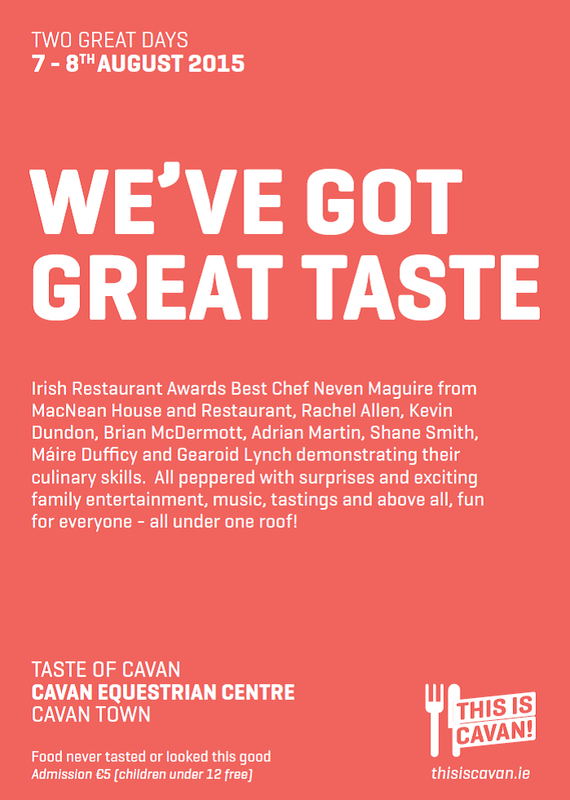 Joining An Taoiseach was celebrity chefs Neven Maguire, winner of the 2014 Irish Restaurant Best Chef Award, Maire Dufficy, Bord Bia, Clodagh McKenna, Brian McDermott, Adrian Martin and Shane Smith from Fallon and Byrne. 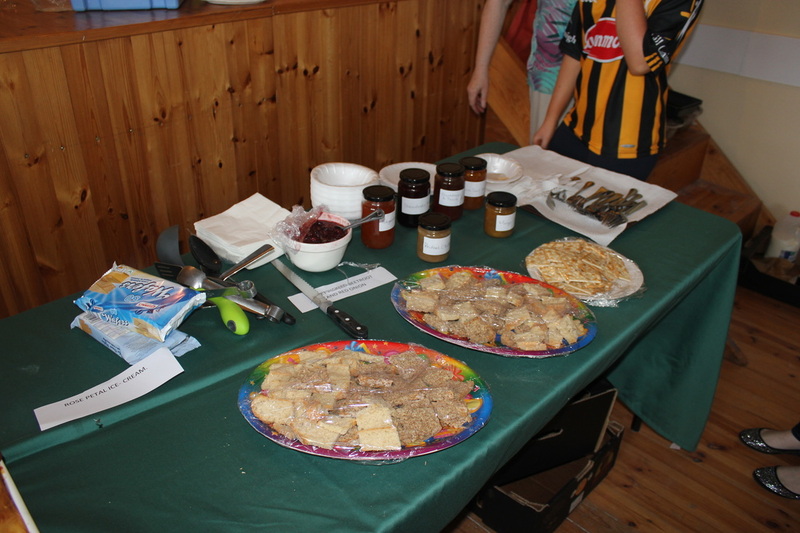 On Monday 23rd June 64 members/friends attended the Information Evening on Preserving; Freezing and jam Making. 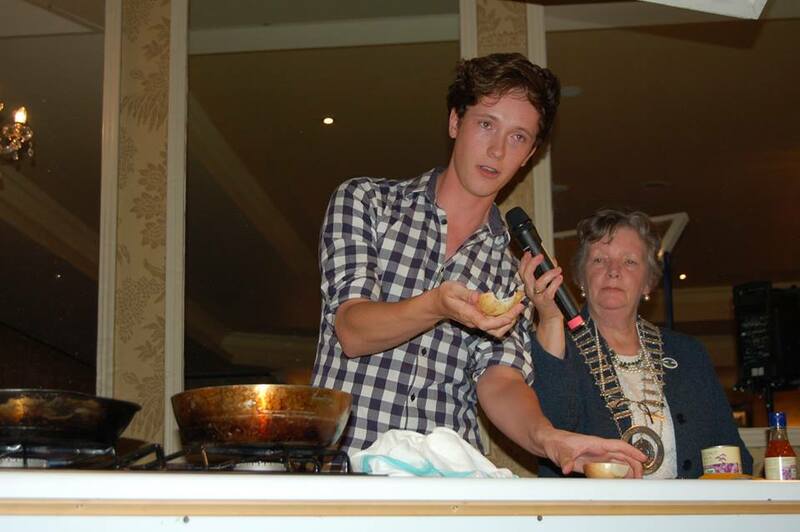 This event was hosted by Mountnugent Guild and Una Hole gave the demonstration. Tess Brady, Produce Promoter welcomed everyone. (Our Federation President was unavoidably absent). 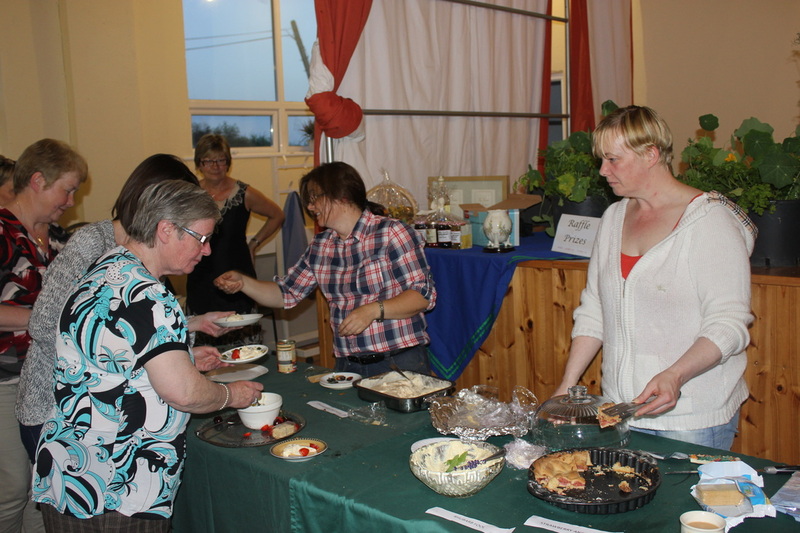 Una had a wonderful selection of foods prepared for tasting i.e. 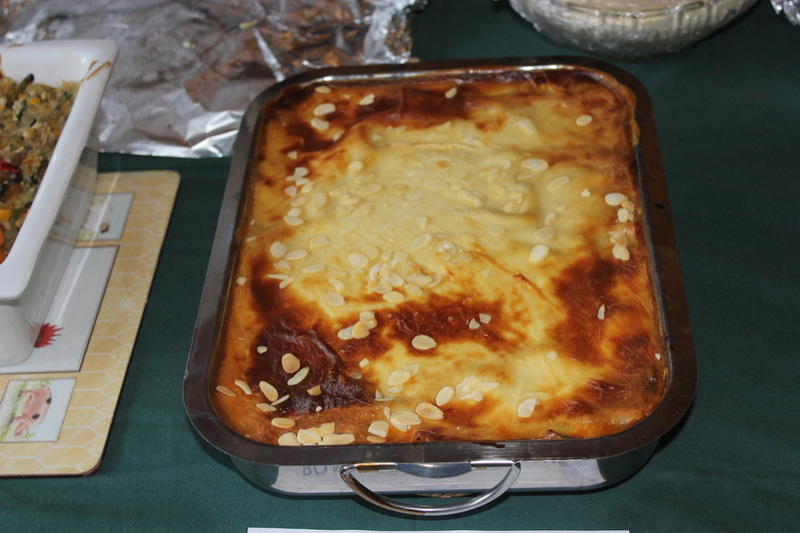 vegetable lasagne; vegetable risotto; roasted vegetables relish; jam; marmalade; home made rose blossom ice cream and strawberry and apple pie to name but a few. 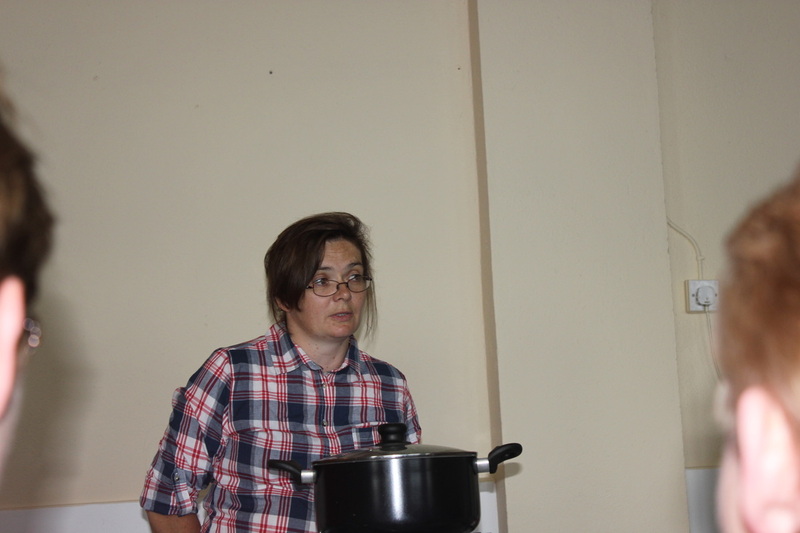 Una gave very useful tips on preparing fruit/vegetables/herbs for freezing. 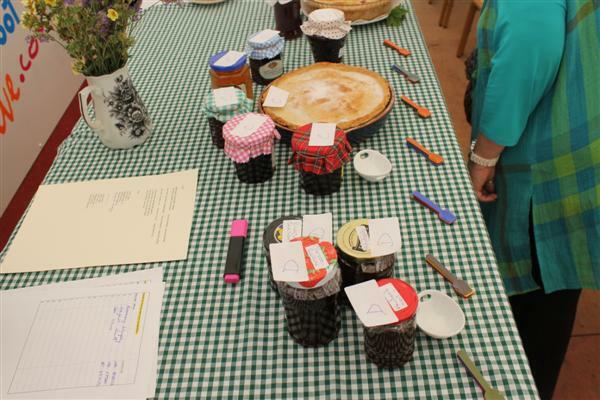 She also made delicious Raspberry Jam and gave very practical advice on jam making. 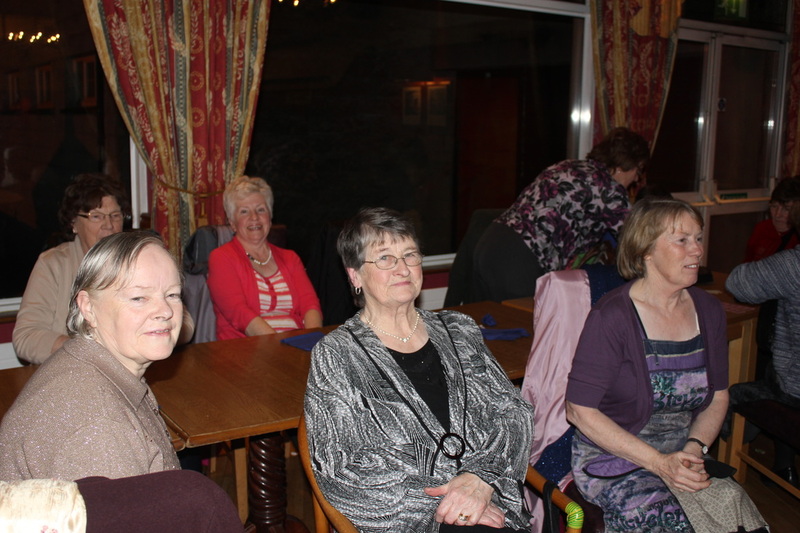 Following the demonstration we enjoyed a lovely supper provided by Mountnugent members. 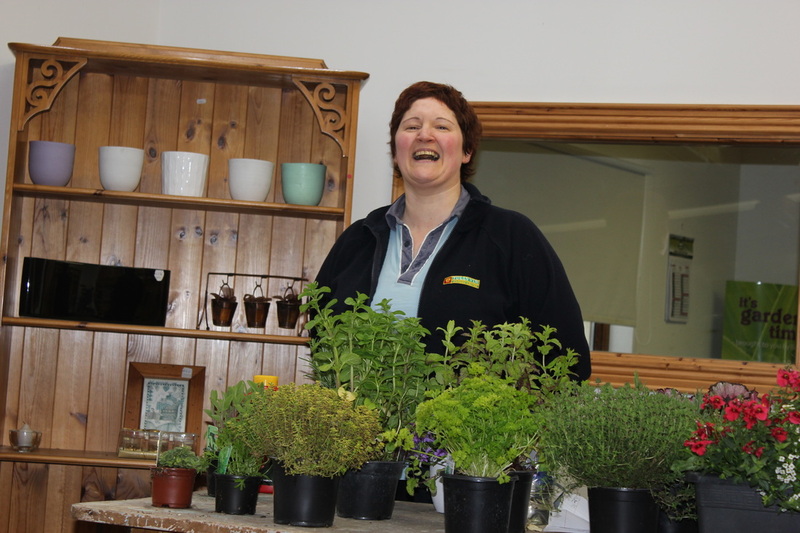 We say a big "Thank You" to Una for the wonderful demonstration and for her generosity in providing so much food for sampling and all the plants and vegetables for the raffle. 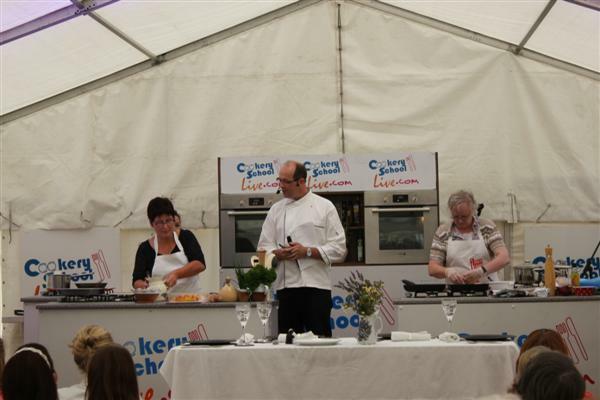 This was a wonderful evening and thoroughly enjoyed by all. 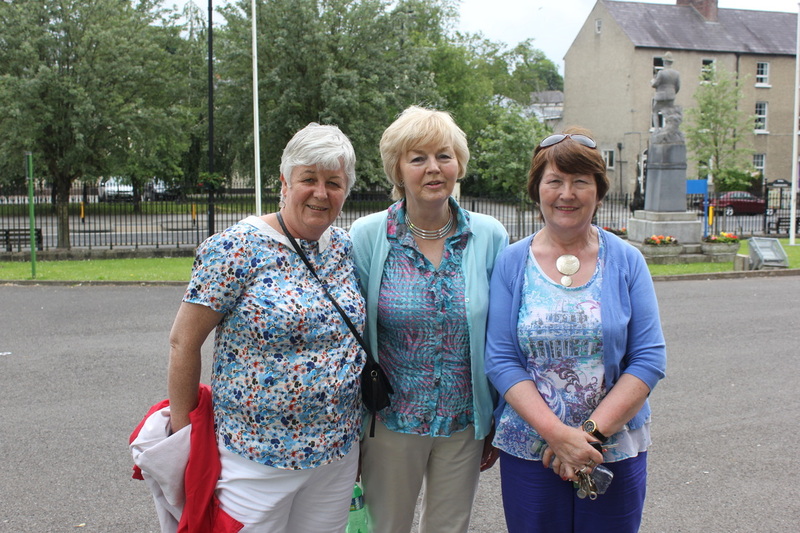 On Sunday 22nd June 43 members and friends assembled at the Courthouse in Cavan for the start of the 7th Annual Walk for Cavan/Monaghan Palliative Care. 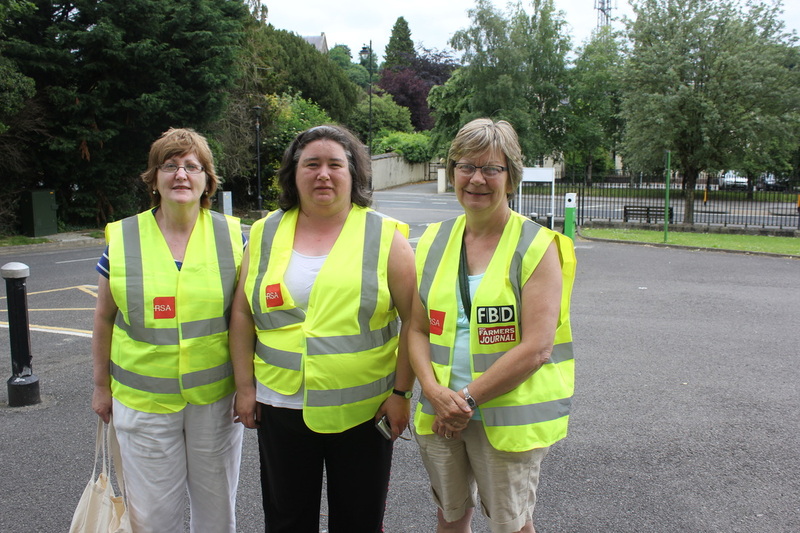 Ann Minehane Sports Promoter looked after the registration and the walkers left at 3.00pm in ideal weather conditions. Supplies of water which was sponsored by Dunnes Stores were available en route and David Mulligan also provided minerals and sweets. At the conclusion of the walk we enjoyed refreshments which was very kindly sponsored by the Farnham Arms Hotel. We say a sincere "thank you" to Dunnes Stores; Farnham Arms Hotel and David Mulligan for their very generous sponsorship. The walk was thoroughly enjoyed by all.. Photos below show some of the participants before the start of the walk. Venue: Castle Saunderson International Scout Centre. 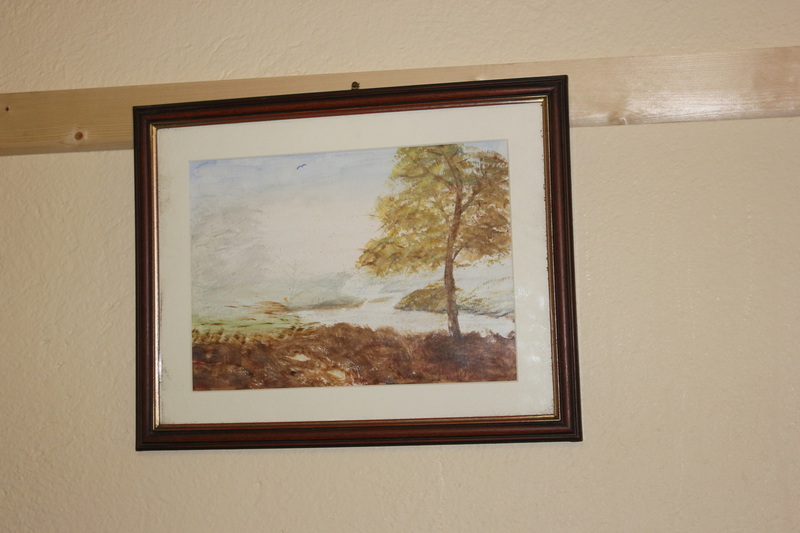 Belturbet. Directions: Take N3 signposted Enniskillen, (Belturbet,Monaghan N54) Turn left at Bultersbridge. Follow N54 Clones/Monaghan. And continue straight (6miles approx.) Sign for Castle Saunderson on the left hand side. Ph. No. 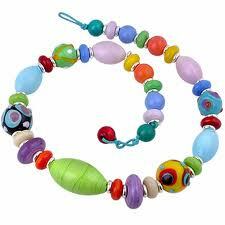 085 778 4444 Places on a first come basis. 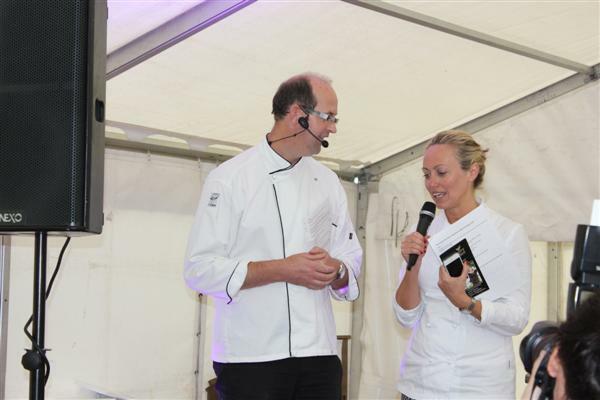 Please register asap as we need numbers for our caterers and any dietary requirements. 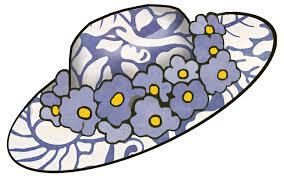 Remember you must register for evening meal on 16th. 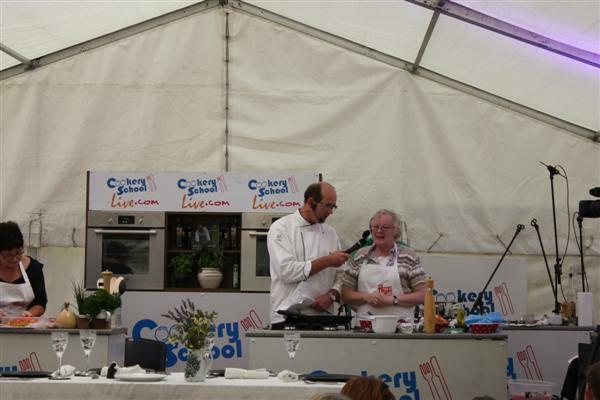 TWO WORKSHOPS will take place at the Taste of Cavan which is being held at the Cavan Institute, Cathedral Road, Cavan. 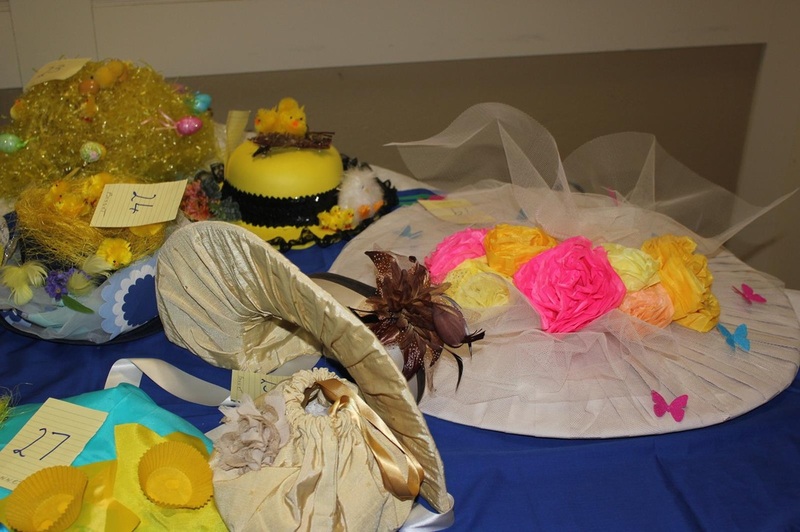 "BRING YOUR OWN CAKE AND DECORATE IT" by Shane Smith on Friday 8th @ 2.00 -3.00pm and 4.00 - 5.00pm. 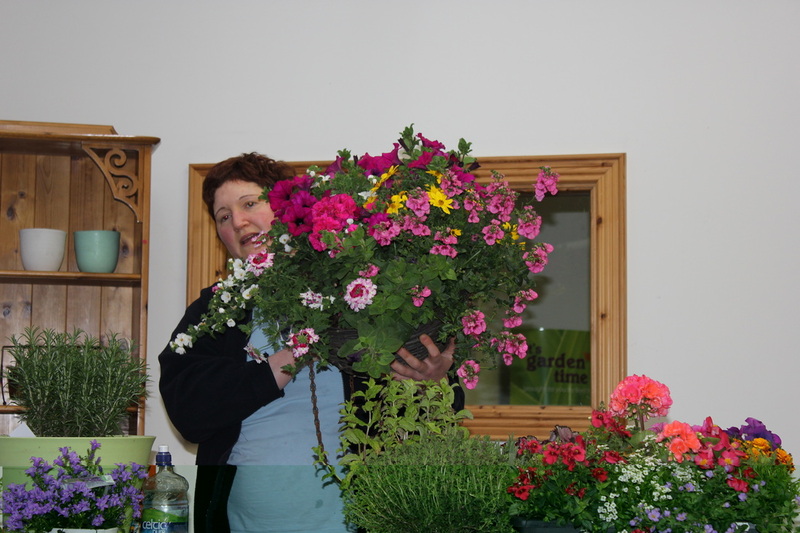 This workshop is free and booking is essential to mmcdermott@cavancoco.ie or 049 4378627. You bring your own cake/cupcake and piping bag, all the other ingredients will be provided. "BEAR ESSENTIALS" - BUILD YOUR OWN BEAR/ANIMAL. Under “Back to Education scheme” it is possible to do FETAC Level 4, 5 and 6, but it would take till Spring to set up. AT the moment courses are ongoing in Healthcare, Childcare and Youth Work. Individual members of ICA can join or we can wait and form a group, Think about tourism, rural development, food etc. Under “Community Education” there is a small budget and only the tutor is supported, all other costs are for participants. 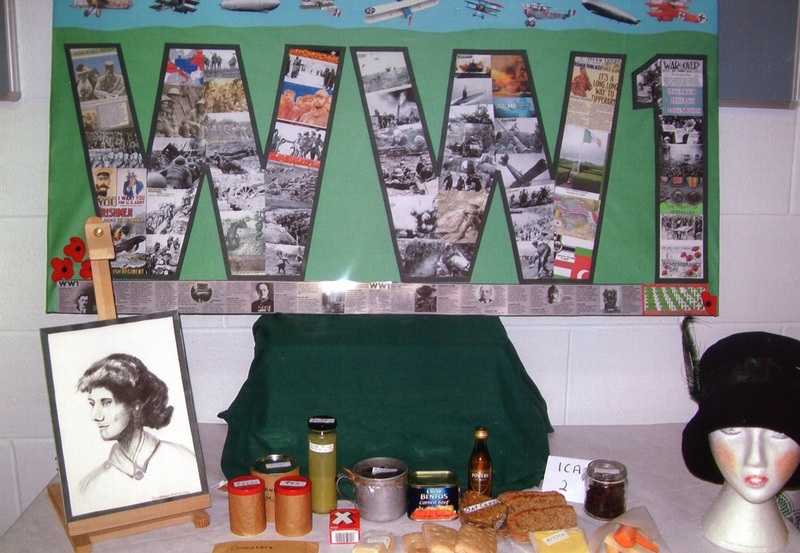 Examples of the most popular of these at present are First Aid, Safe pass, Cookery, Pilates etc. There is funding coming on stream in 2015 from PEACE IV, LEADER etc. for specific projects but could tie into guild plans, I will let you know when this information is available. No harm to be thinking about it now. 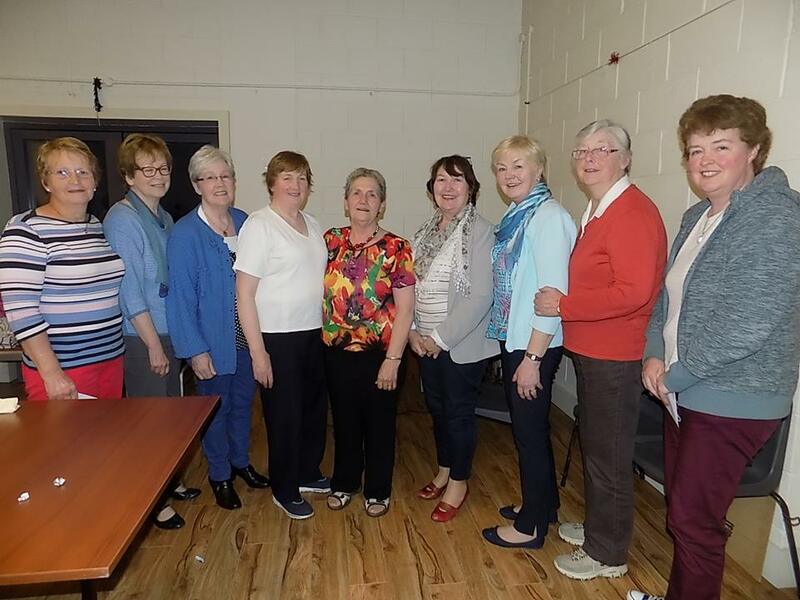 The Summer federation meeting was held on Wednesday 8th June in Castlerahan Community Centre. 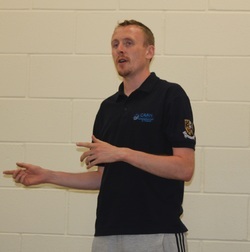 The guest speaker was Dean McElroy from Cavan Sports Partnership who demonstrated some of the games available through the 'Go for Life' Programme. Dean also outlined some of the activities which can be organised for groups i.e. swimming; pilates; aqua-aerobics; tai chi. A Sports Feist will be held in Stradone Community Centre on Tuesday 30th September. For more information contact Dean on 087 2623956. 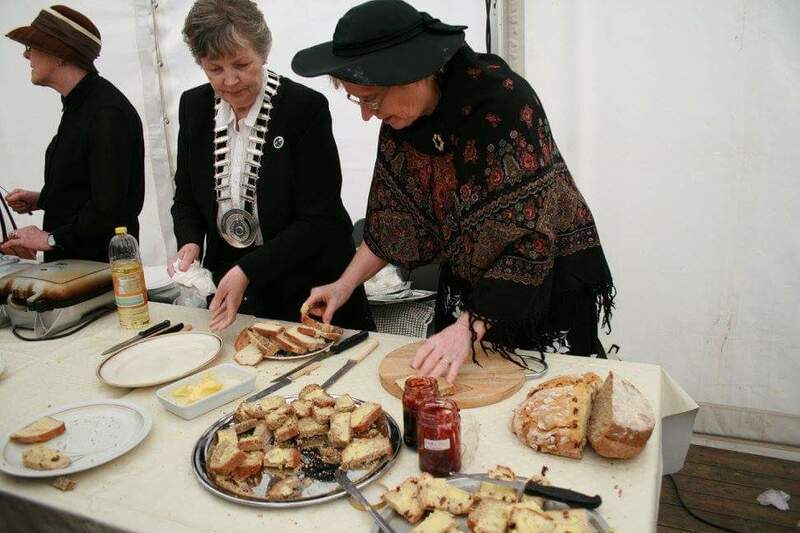 Judging of the brown bread competition took place,. 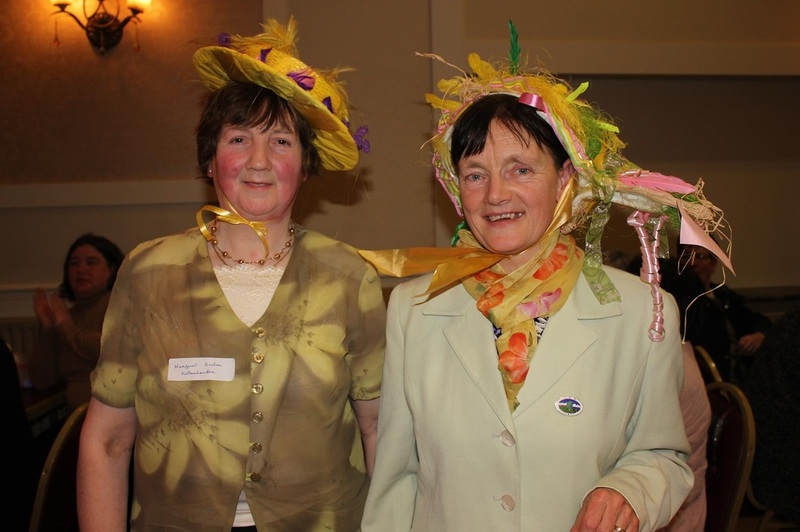 The winner is Imelda McCabe from Bruskey Guild and Kathleen Fay from Kill Guild 2nd. 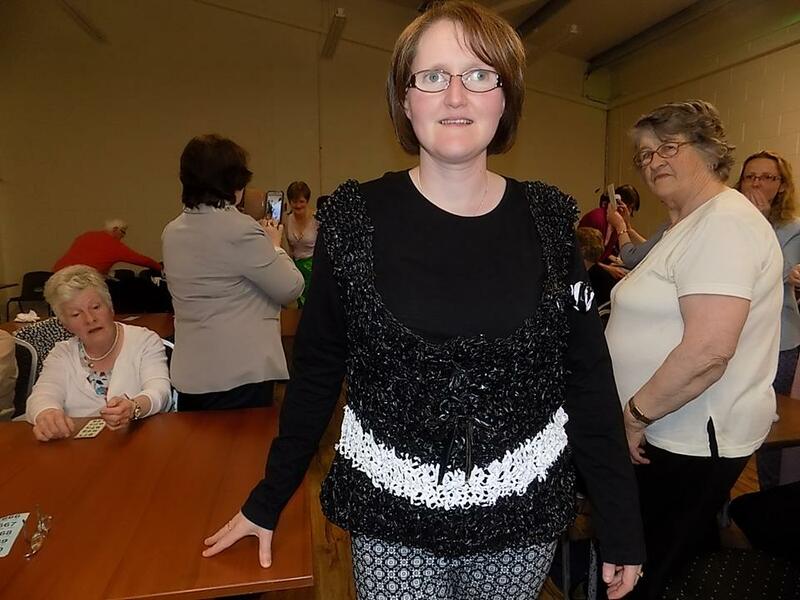 Congratulations Imelda and good luck in the Regional Final which is being held in An Grianan on 14th August. 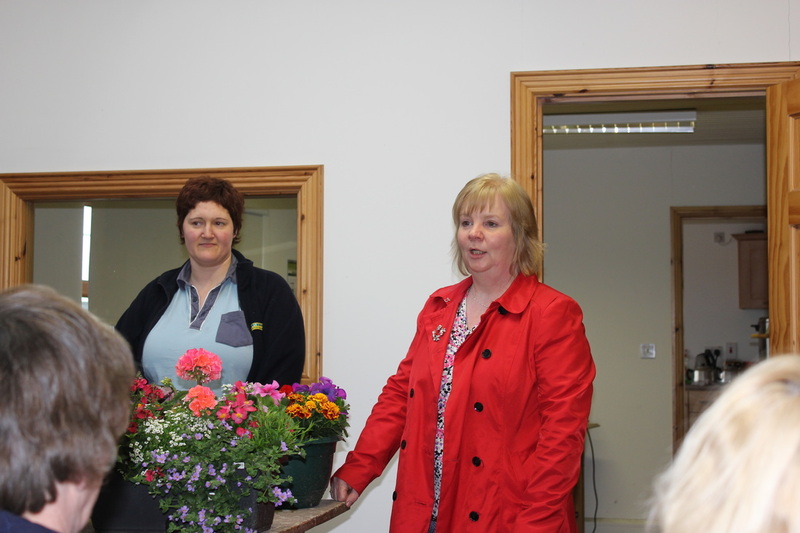 An Information evening with Niall and Roslyn proprietors of Tullyvin Garden Centre took place on Wednesday 28h May. 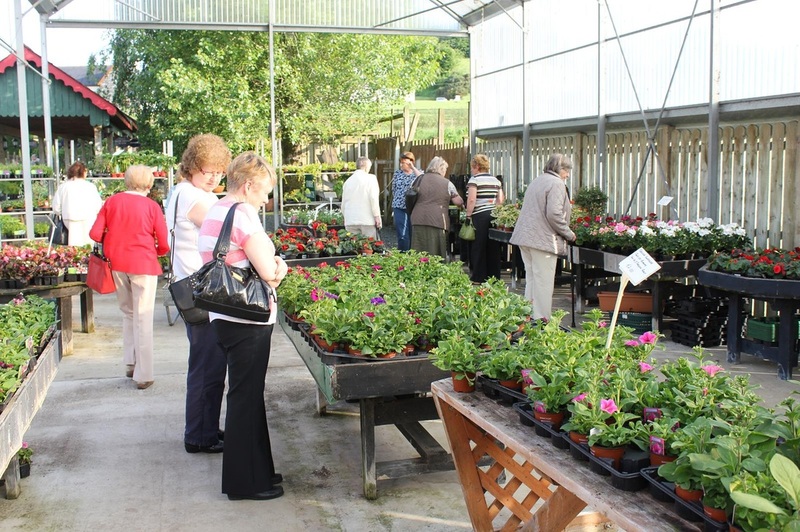 Members had an opportunity to view and purchase some of the large selection of shrubs and flowers which are available in the garden centre. 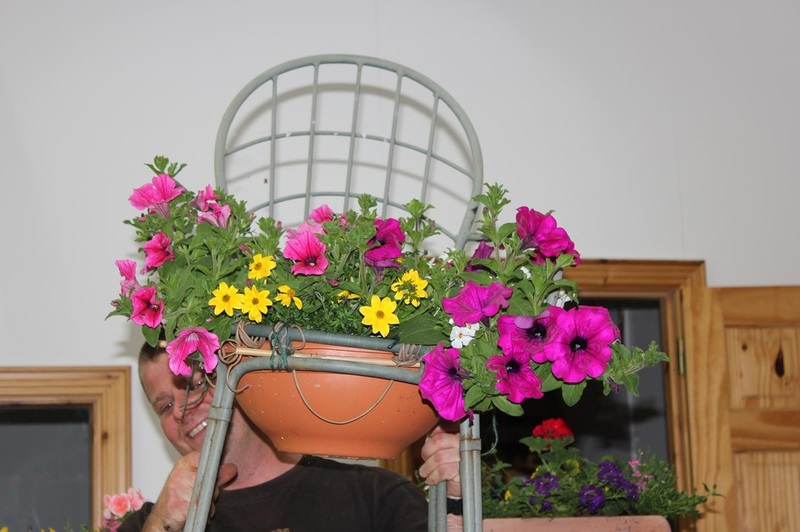 Both Niall and Roslyn spoke about planting up baskets/tubs etc., and outlined some of the plants which are suitable to use in containers. 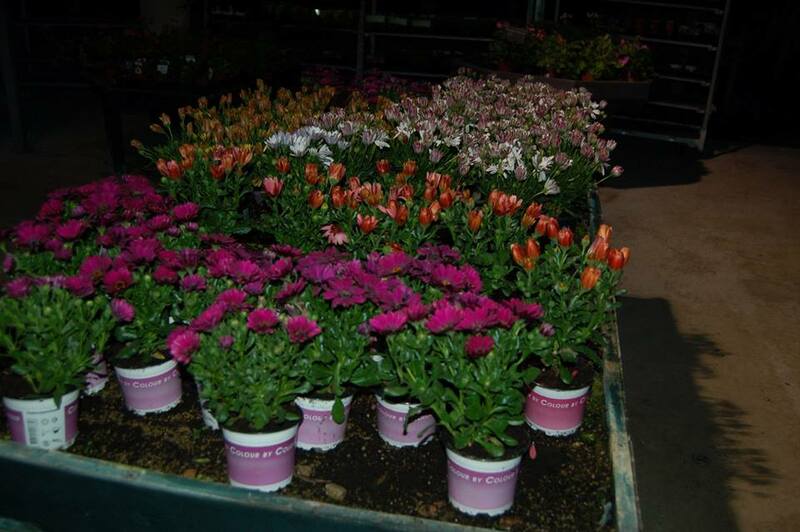 They also displayed other novel ideas of displaying summer bedding plants/herbs etc., They answered many queries and gave helpful tips and advice. 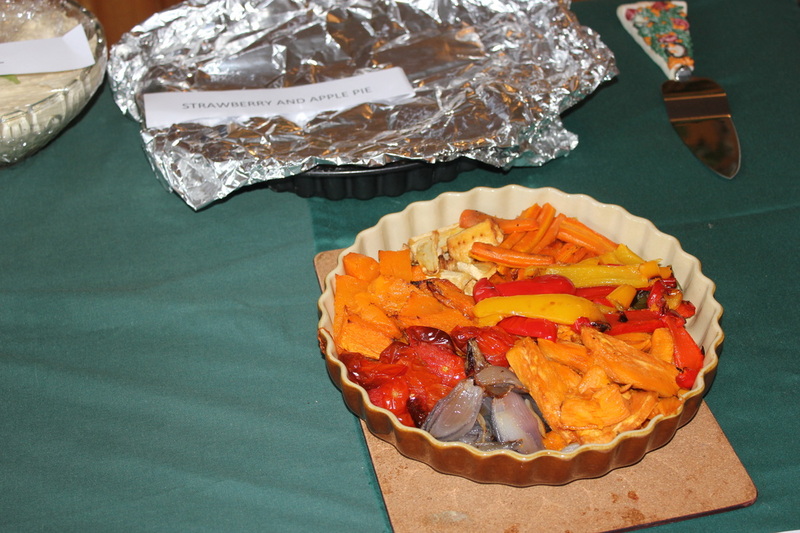 We enjoyed a beautiful supper and a raffle was held. Roslyn and Niall gave two tickets for Bloom in the Park for the raffle. 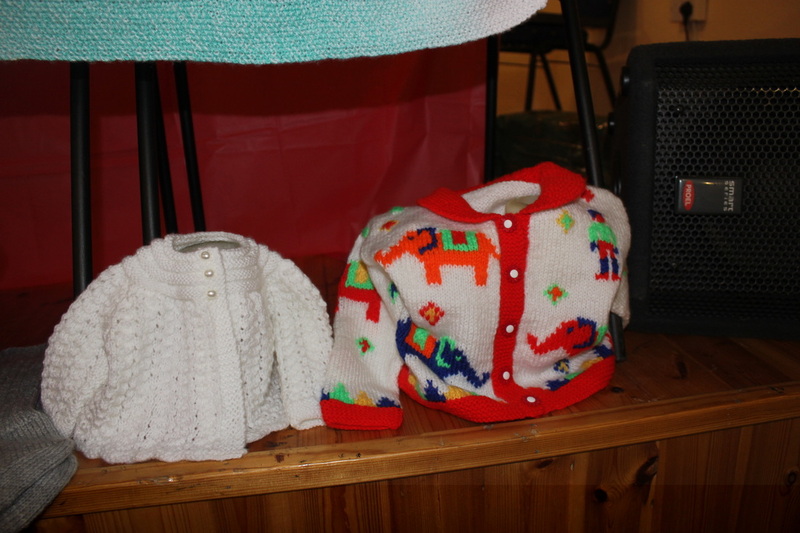 These were won by Nan Smith, Crosserlough Guild. 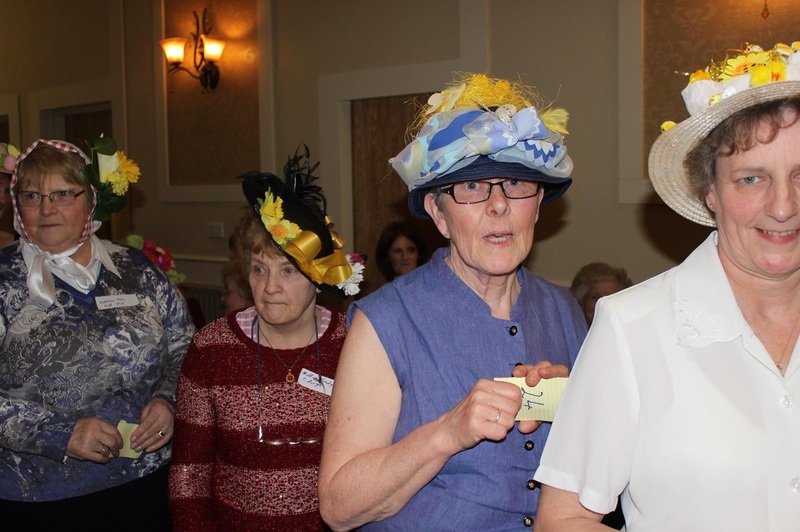 Photo shows Nan receiving the tickets. 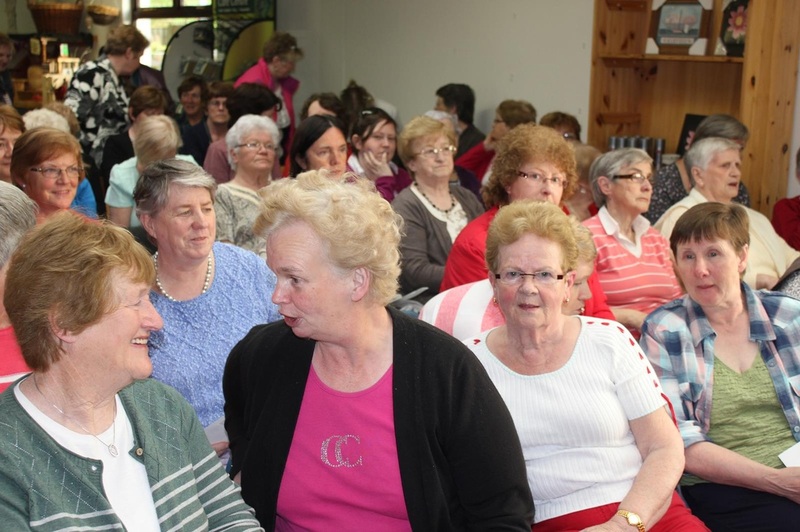 Federation Information Evening in Mountnugent Community Centre on Monday 23rd June @ 8:00pm. 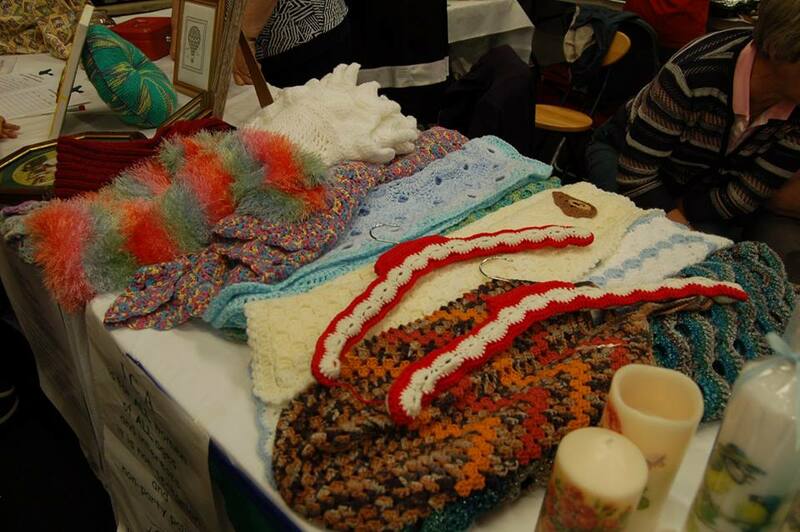 of these events and share you time and talents, also sharing skills like knitting and stitching. Please call her first. 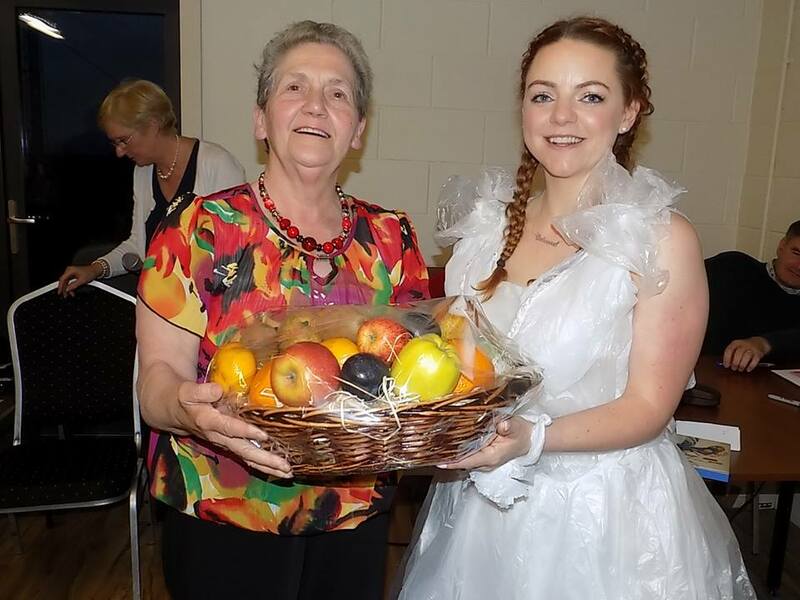 For the second day, you could share how your spent your First Communion, picking fruit for jam making, a day on the bog, baking with your mother/granny. Get out the old photos and bring them along with you. Description You are invited to an intergenerational talents workshop where school children and older people share their gifts and abilities to sing, dance, recite and make music. 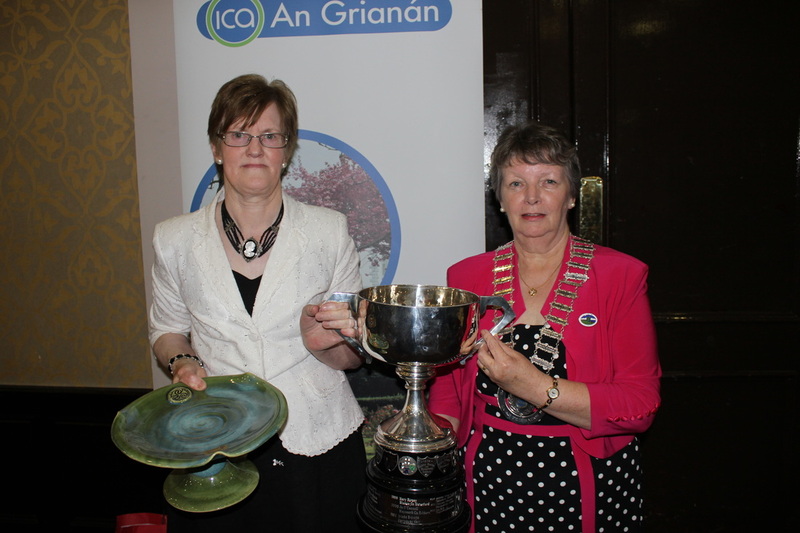 The draw took place at the federation AGM on Monday 28th April 2014 for two half scholarships to An Grianan. 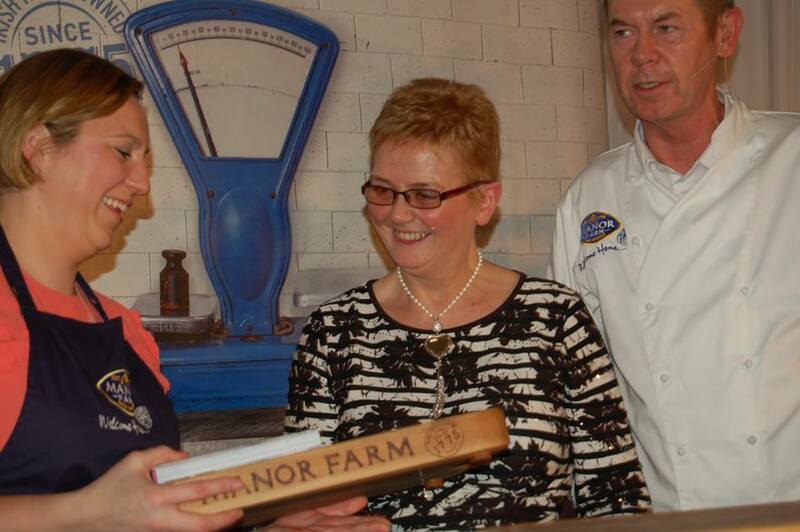 The winners are: Bruskey - Reserve - Kildallan and Sheelin with Reserve - Killeshandra. Proof of booking must be made within six months from date of draw. on Saturday 31st May 2014. 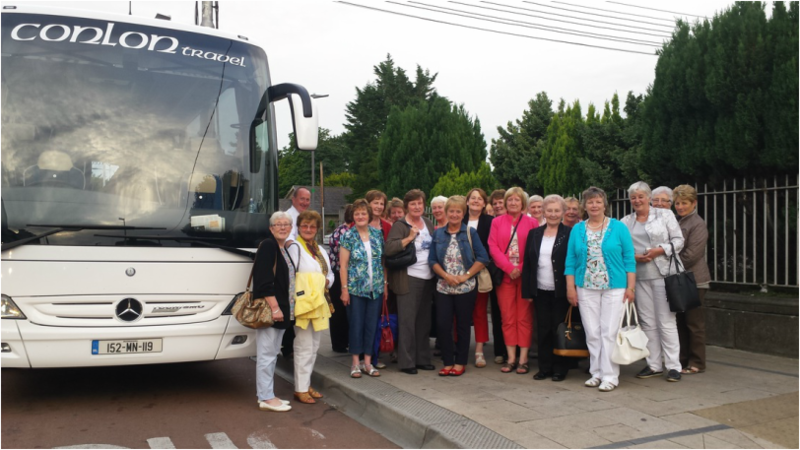 Coach departing from Butlersbridge at 8:30am; Cavan Bus Stop at Liberty Insurance Dublin Road @ 8:45am. 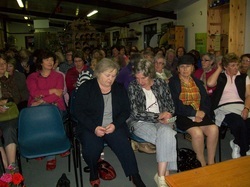 To book you place call Margaret on 0494332038. Everyone welcome. The use of chemicals i.e. the control of slugs, caterpillars. 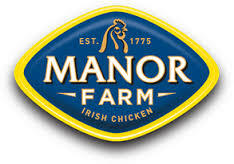 For catering purposes it is very important that guild secretaries let produce promoter Tess Brady Pollakeel, Mountnugent, 0498540030 / 0872052861/ tw_brady@yahoo.co.uk .know numbers attending by Monday 26th May. 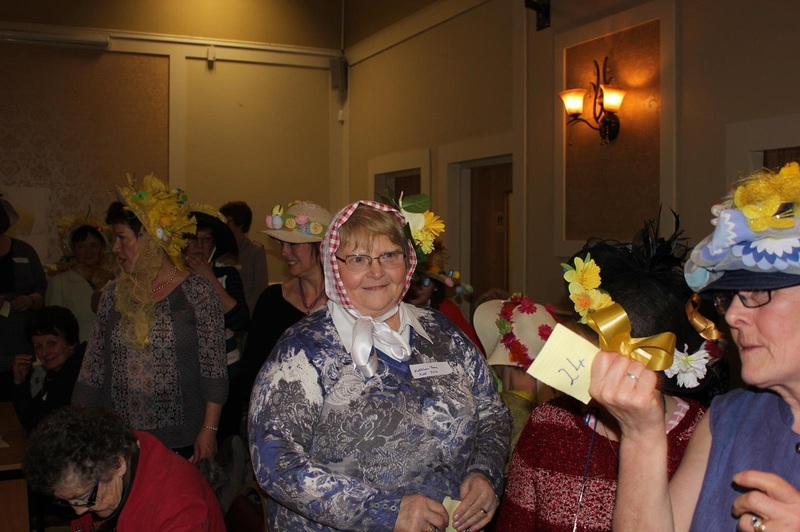 What a wonderful evening of fun and friendship we enjoyed in Gallonray House, Maudabawn on Wednesday 9th April for a Federation Fun Quiz and Easter Bonnet Competition. 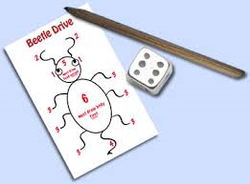 Unfortunately time did not permit us to have the beetle drive. This Fun Event was hosted by Maudabawn Guild. 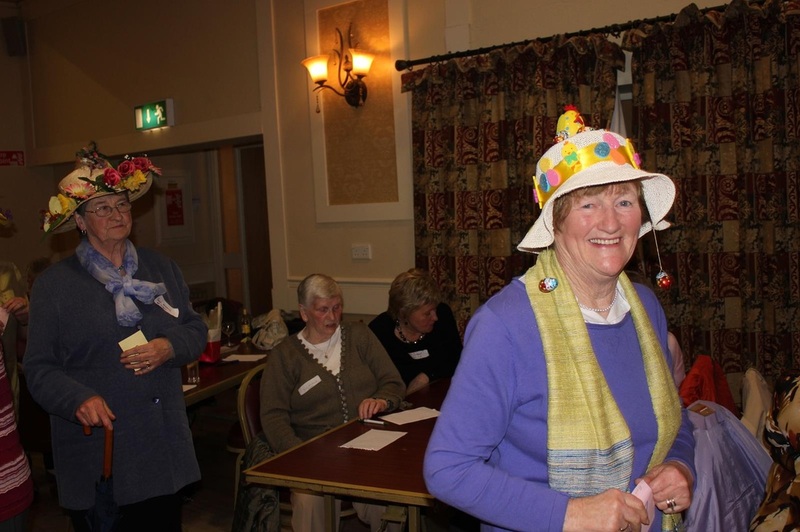 The Quiz was a huge success with 27 tables and lots of fun and laughter. 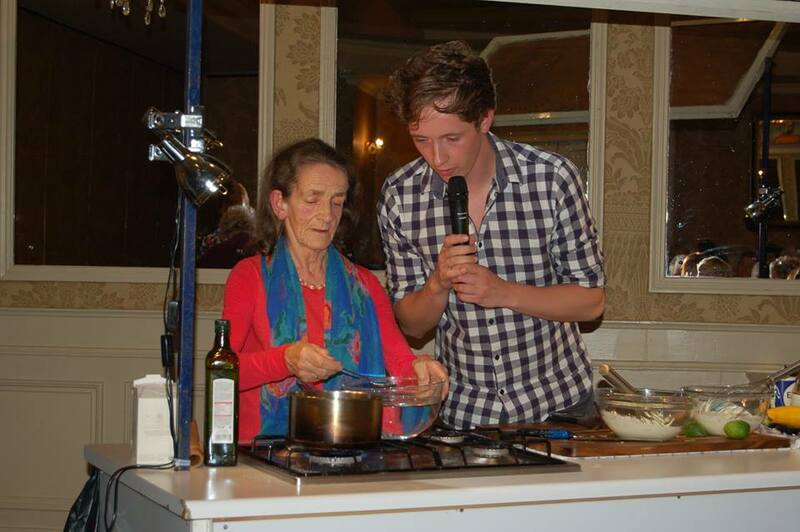 John McGinn was a very competent Quizmaster. Mountnugent Guild emerged the winners with Maghera 2nd and Bruskey 3rd. 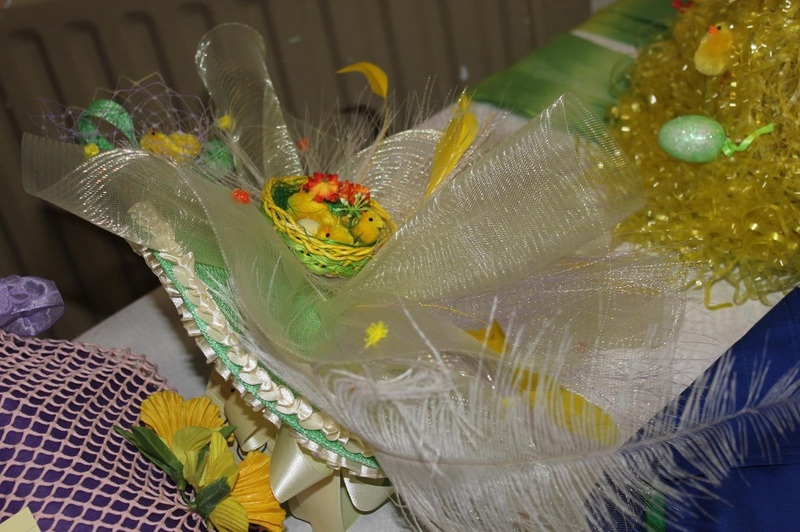 The Easter Bonnet Competiton showcased the talent of our members. 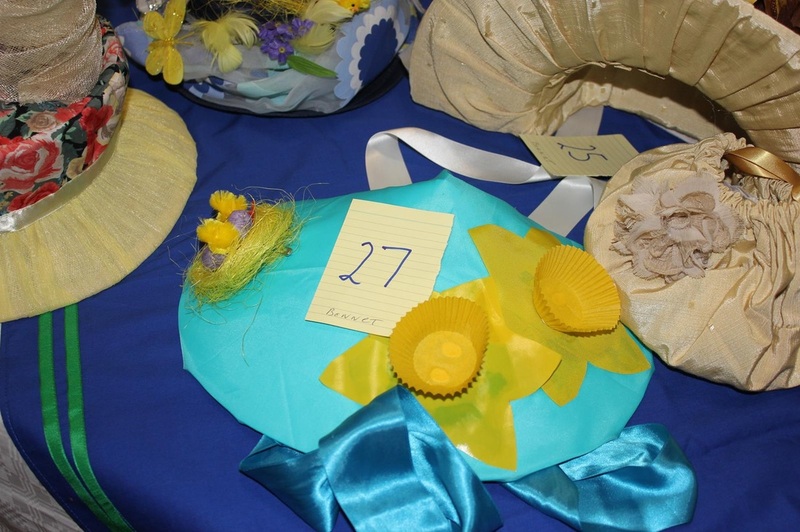 There were 29 bonnets on display and each one very creative. 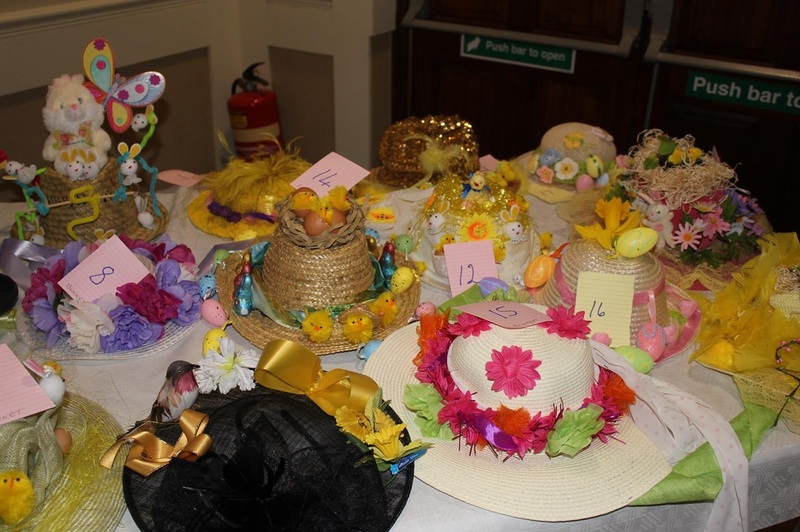 Congratulations to all the winners and to everyone who participated in the Quiz and the Easter Bonnet Competition. 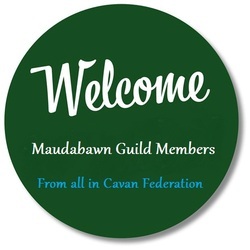 A big "Thank You" to Maudabawn members for their hospitality - the beautiful supper and their imput into organising the event. 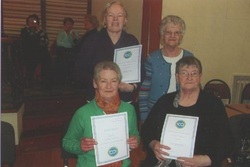 Left to Right: 2nd Roisin Keenan, Maudabawn; 1st May Lynch Mountnugent; Joint 3rd Catherine Smith Kill & Eileen Brady Kill. 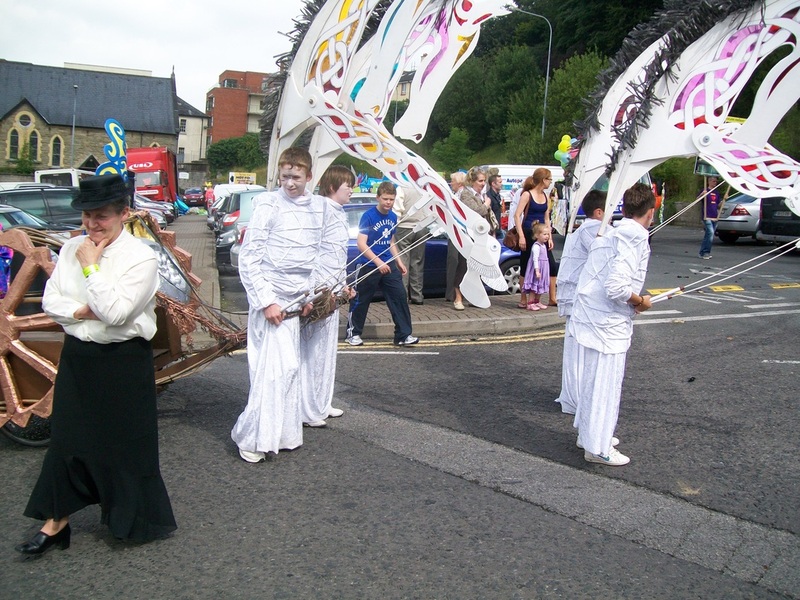 and finally the parade . . . . . . . . . .
Congratulations to Emma O'Reilly, Maudabawn Guild whose short story has been shortlisted for the National Creative Writing Awards. 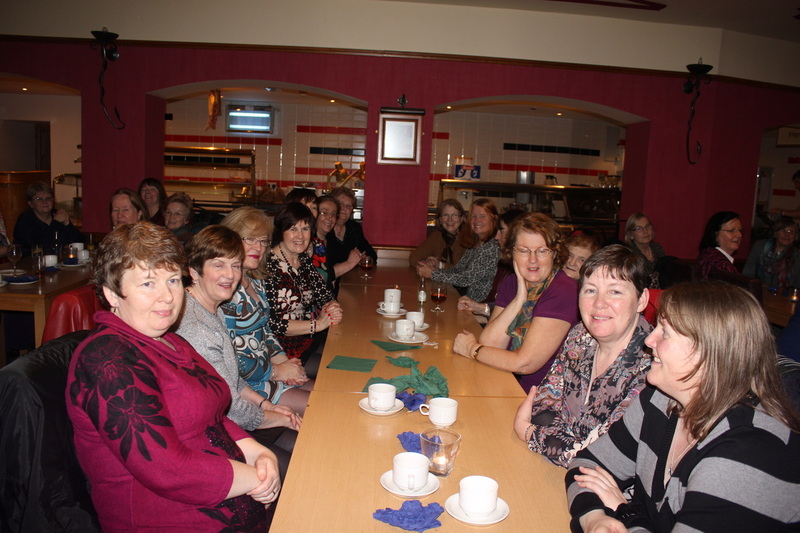 Aim: The “International Women’s Breakfast” is an opportunity for women to come together in an informal and friendly atmosphere to meet old friends and make new ones. 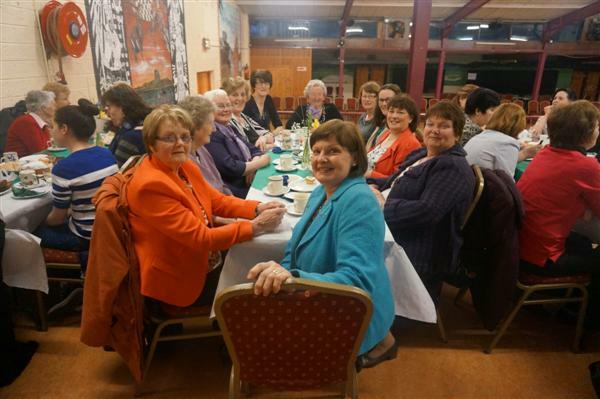 Issues raised will be taken on board and form a policy document that the Breffni Belles Cavan Women’s Network will produce in September. 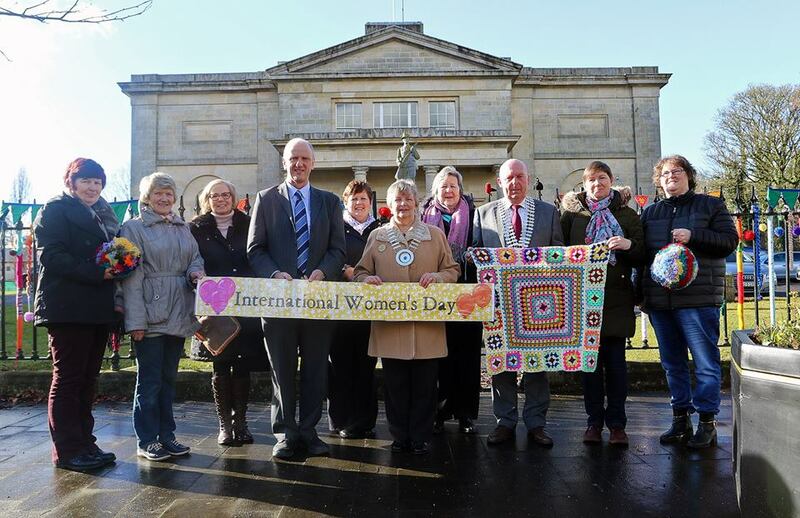 strengthen the Voices of Women from Cavan to enable them to support each other in a spirit of friendship and co-operation as well as acknowledging the important roles women play in their communities. 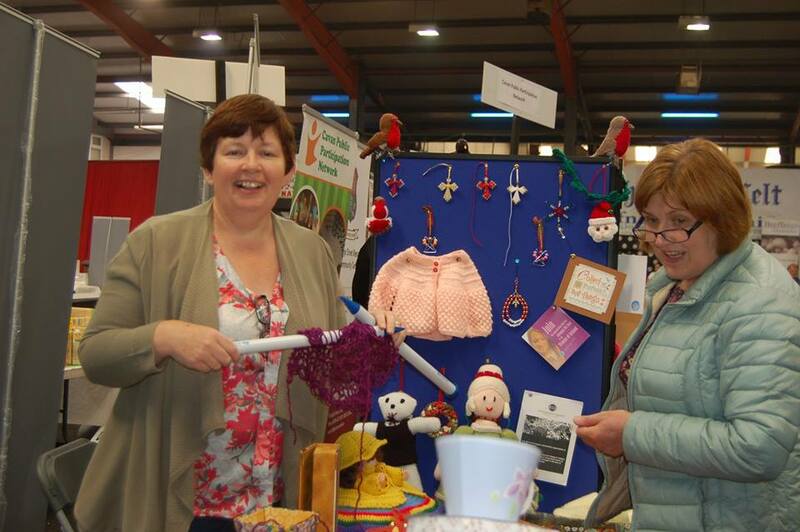 Photo shows Marion Lyon, VP and Arts Officer and Mary McNamara Friends of an Grianan Treasurer at the Spring Conference in An Grianan, on Saturday 01st March. 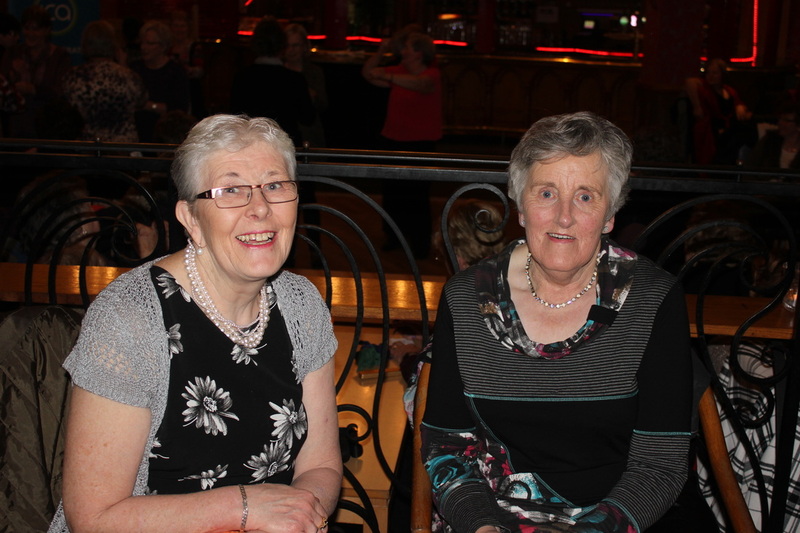 Marion and Mary knew each other as girls growing up in Palmerstown. 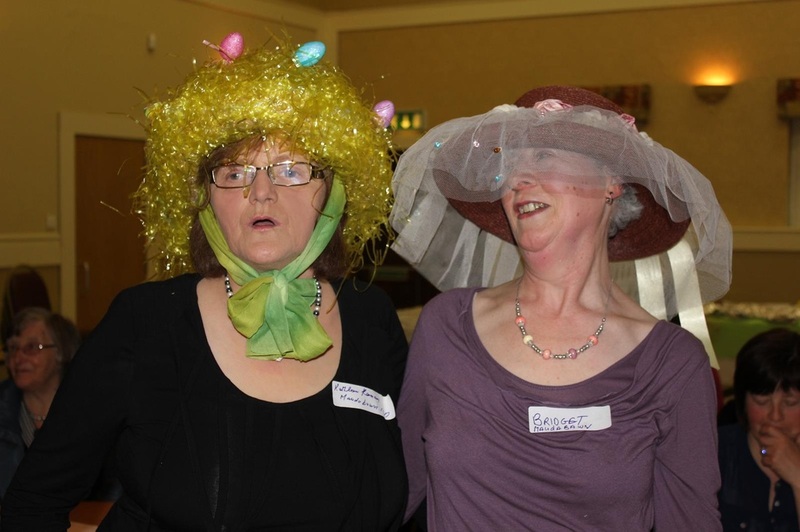 ICA brought them together again at Information Training some years ago. 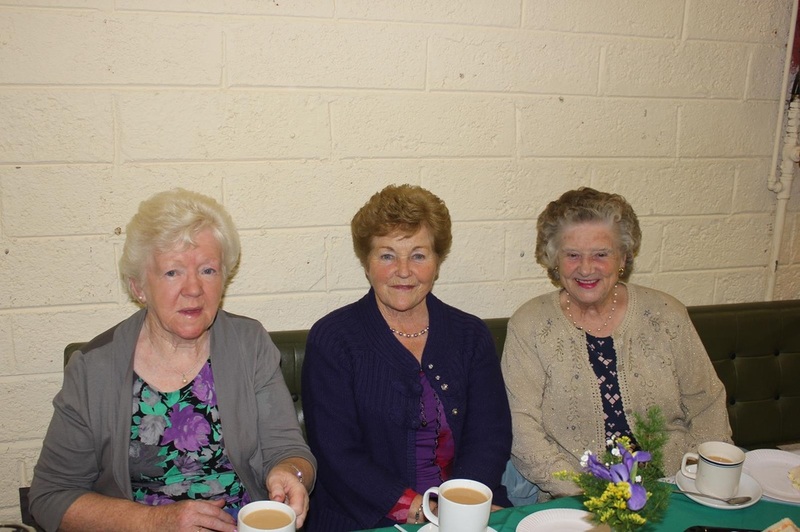 Enjoying lunch at Spring Council are (left to right) member from Kildare Federation; Chrissie Murray; Tess Brady Mountnugent and Rosemary Murphy Bruskey. 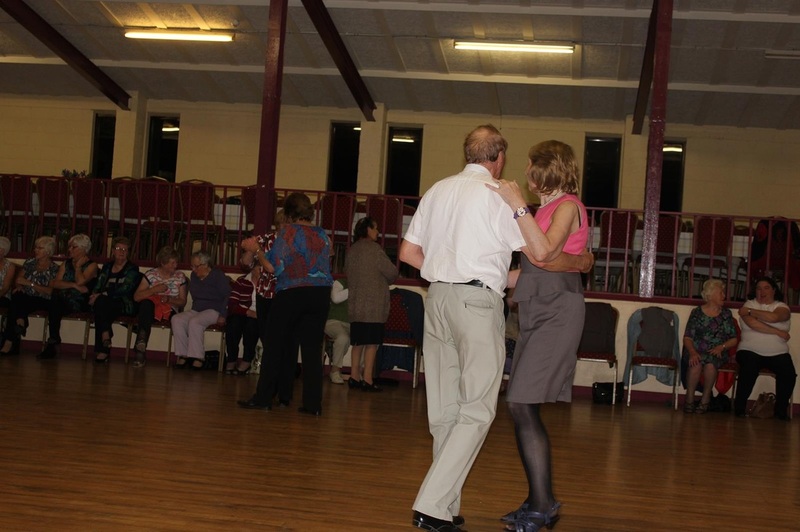 This class will cost €10 and all funds go towards An Grianán. Kits will be available on the day at a cost of €11 but if you want to bring along your own that is fine. Everybody will need to bring along a scissors regardless of bringing your own kit or not. 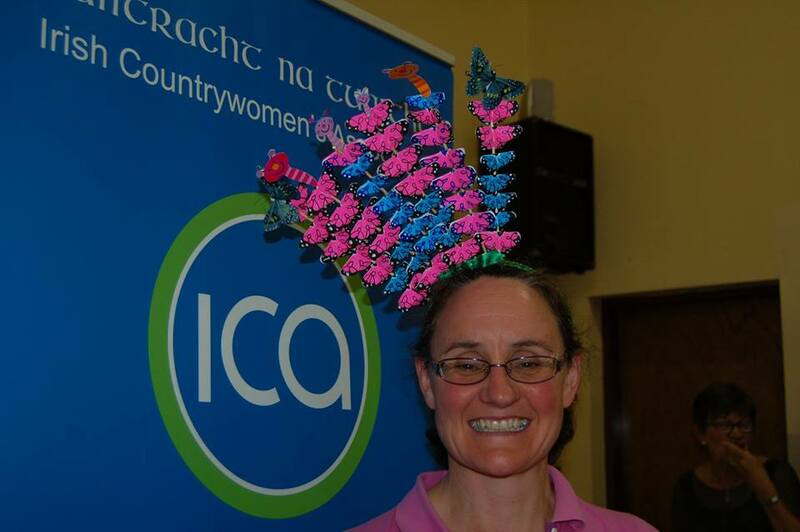 Please contact Joanne in Central Office on admin@ica.ie or 01-6680002 to book your place on this course. 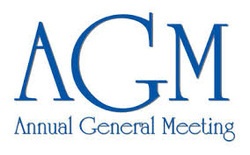 The Annual General Meeting will take place on Monday 28th April @ 8:00pm in the Day Care Centre, Cathedral Road Cavan. 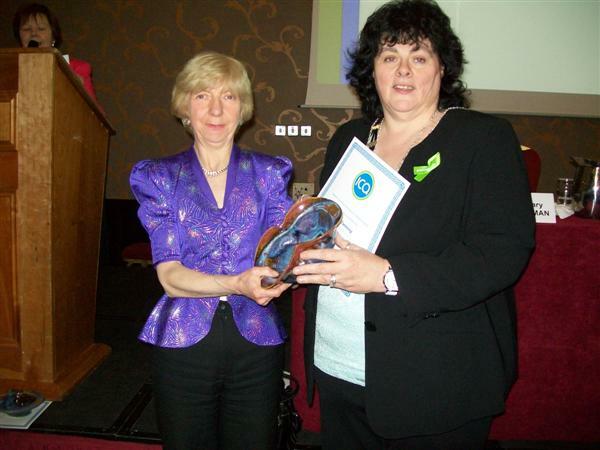 Guest Speaker: Dr. Aine Sullivan on Women's Health. Nomination Paper has been circulated to all guilds for the positions of Teachta; International Officer; Adult Education Officer; Arts Promoter & Crafts Promoter. 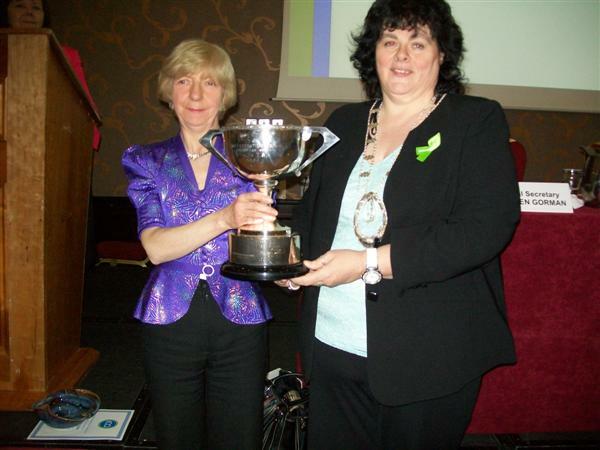 Please discuss in your guilds and return your nominations to Secretary, Ann Rose McCormack, Drumgoon, Killeshandra on or before March 10th. If you wish to find out more about any of these positions you can contact your Information Officer. Please check the list below for details of Information Officer allocated to your guild. 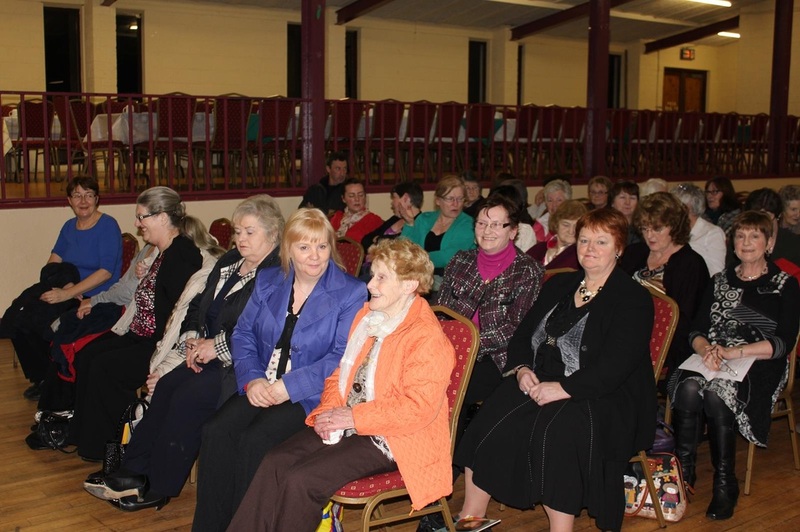 Discussion on "Women’s Role in the Community "
The Spring Conference of the ICA will take place in An Grianán on Saturday 1st March 2014. The conference will be held in the Hughes Hall and will begin at 10.30 and will finish around 4pm. 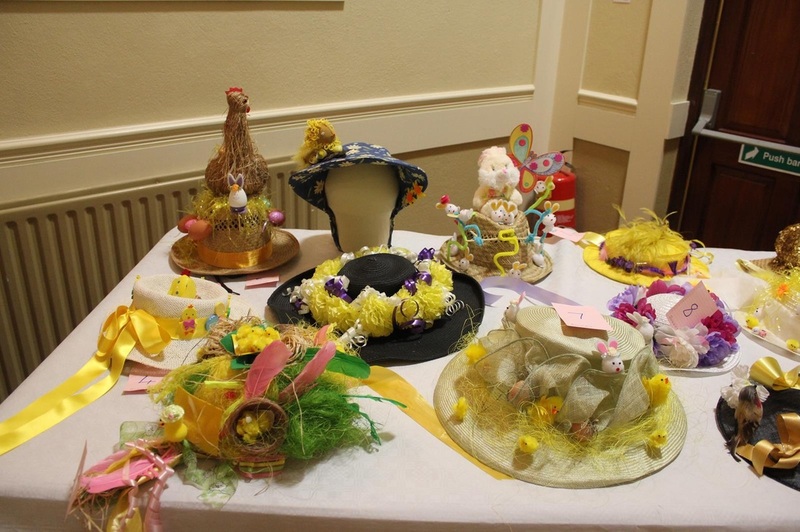 A Fun Night of a Table Quiz, Beetle Drive and Easter Bonnet Competition will be held on 09th April @ 8.00pm in Gallonray House, Maudabawn, Cootehill. You can buy the Book of Home & Family for €18 or three books for €50. Send your cheque made payable to ICA to Central Office. It costs €22.50 for one book including postage and packing and it costs €60 for three books including postage and packing. 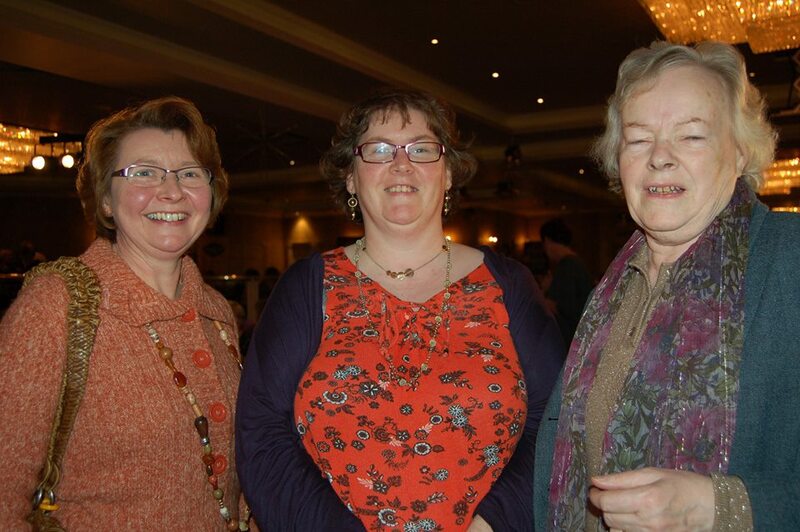 Photo shows Sophia Whyte and Kathleen Farrelly Kildallan Guild and Rosemary Murphy and President Leila Beattie Bruskey Guild who attended the Regional Conference in the Sligo Park Hotel on Saturday 19th October. One Day Tickets are now available to ICA Members at a discounted price of €11 (normal price €16). Please post in orders and payment to Central Office. These tickets can be used on any day of the show. Please include contact name, number and postal address with ticket order. Today kicks off Simon Week, our annual national awareness campaign. This year we are urging people to sign our petition asking the government not to cut the homeless budget. While homelessness is on the increase and homeless services are at breaking point, the Government is set to cut funding for crucial services. Meanwhile, it says it wants to end long-term homelessness by 2016. Cutting funding for homeless services is not just wrong - it’s cruel and it hurts the most vulnerable in our society. Thousands are just one pay cheque, one social welfare payment, one family problem, one health diagnosis, one mortgage repayment away from becoming homeless. Homeless services are a vital lifeline for people when they are at their most vulnerable. We can't let them down. In the run up to October's Budget announcement we're calling on the Government to live up to their commitments, maintain homeless services, and make sure that in Ireland everyone can have a home for good. 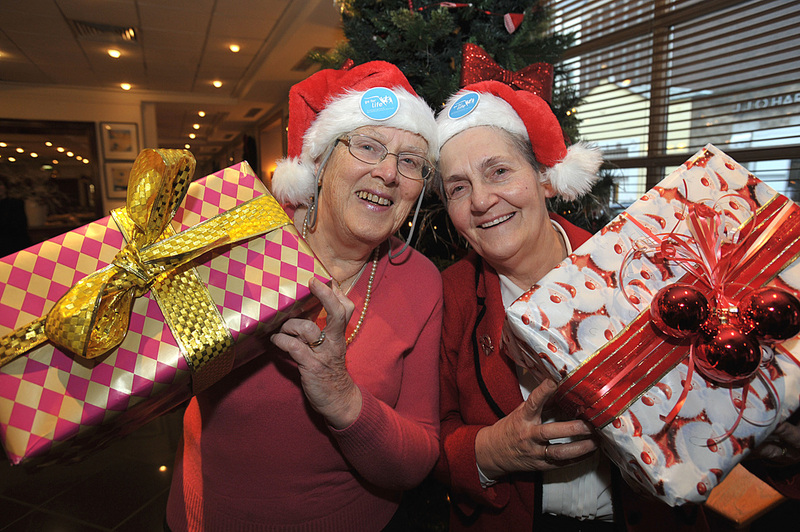 Please sign our Home for Good petition now (http://www.homeforgood.ie/actnow). The tour resumes after the summer break with a seminar hosted by the Wexford Federation on Thursday, October 3, 8pm at the Ferrycarrig Hotel, Wexford Town. This free seminar is open to all ICA members and to the wider community who are cordially invited to bring along a daughter, granddaughter, favourite niece or godchild: Jill’s seminar addresses both their age-relevant personal finance needs, but also their inter generational issues, like health care and housing, inheritance and debt. 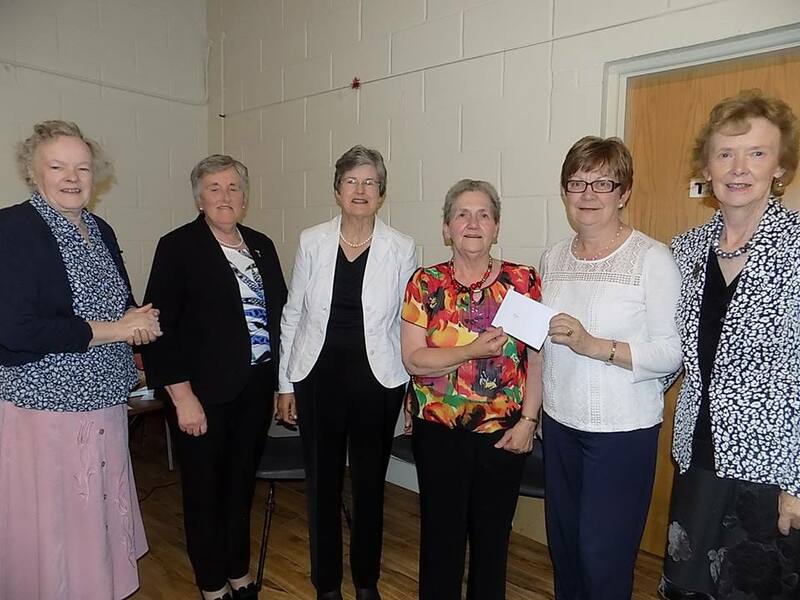 A cheque for €3788 was presented to Jimmy O'Donnell Cavan Monaghan Palliative Care at a meeting of the federation on Wednesday 18th September 2013. 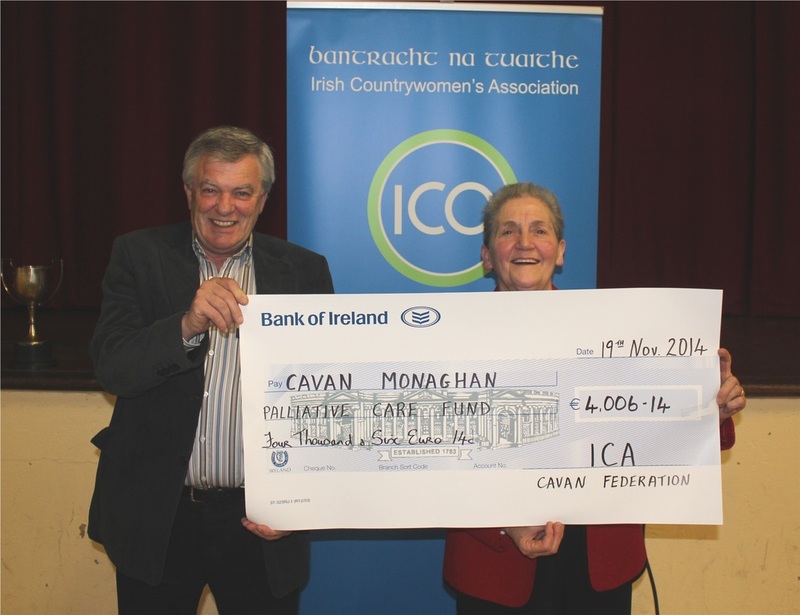 Jimmy gave a brief outline of how the funds are used to help cancer patients in the Cavan Monaghan area. He also thanked everyone who contributed to the fund. 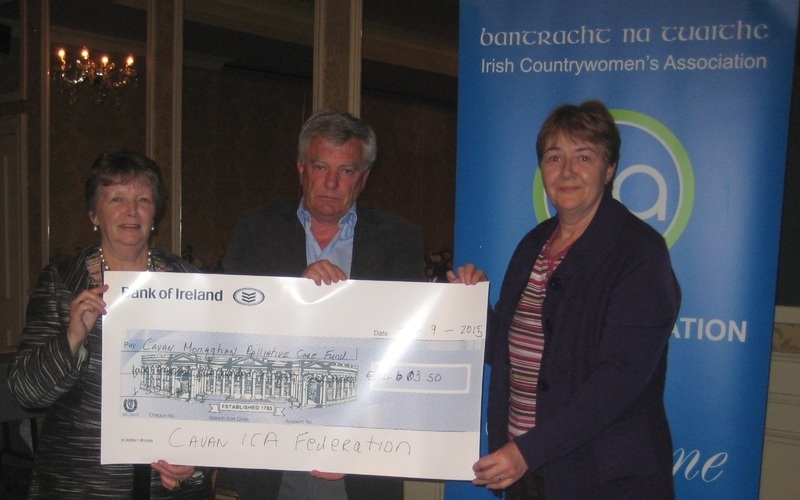 Photo shows Federation President Leila Beattie presenting the cheque to Jimmy O'Donnell. The closing date for applications is Friday, 27 September 2013. Application forms are available on the Age & Opportunity website www.ageandopportunity.ie or from the Go for Life office on 01 805 7733. 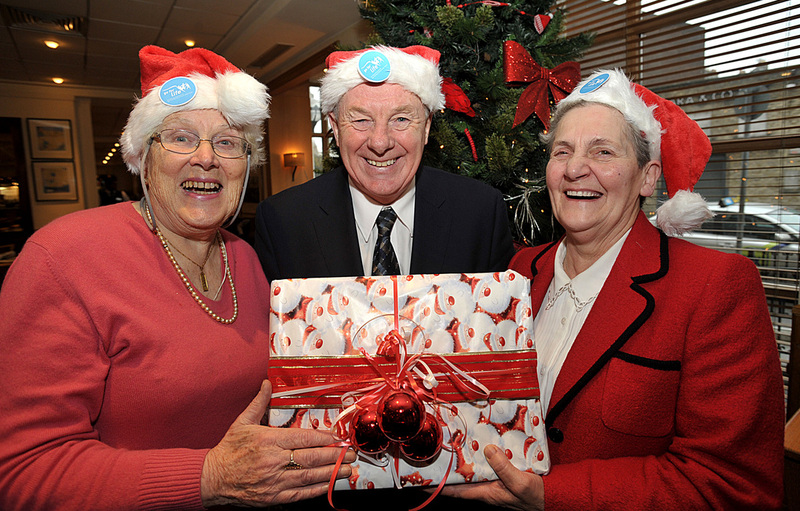 Go for Life is the national programme for sport and physical activity for older people. 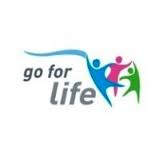 Go for Life is an Age & Opportunity initiative which is funded by the Irish Sports Council. 2009. 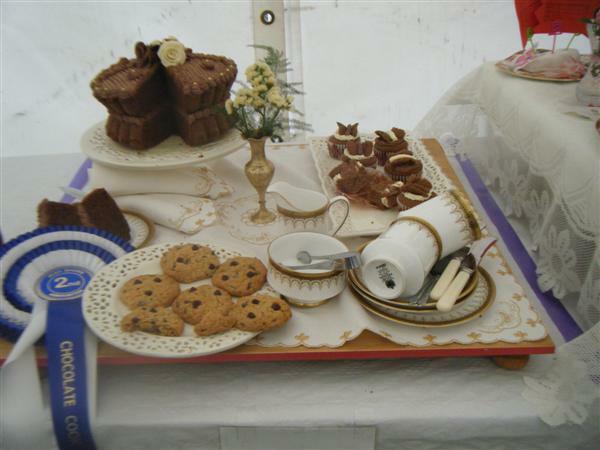 Leila also came 2nd in the Pastry Food Tray Competition at Virginia Show on 21st August. 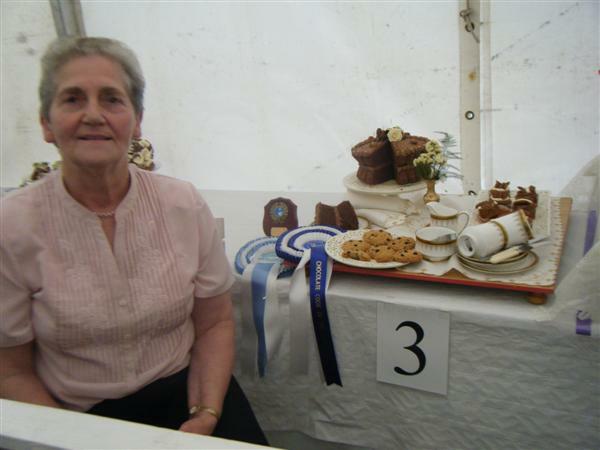 Congratulations to all members who entered and those who won prizes at various shows throughout the Summer. President ICA. 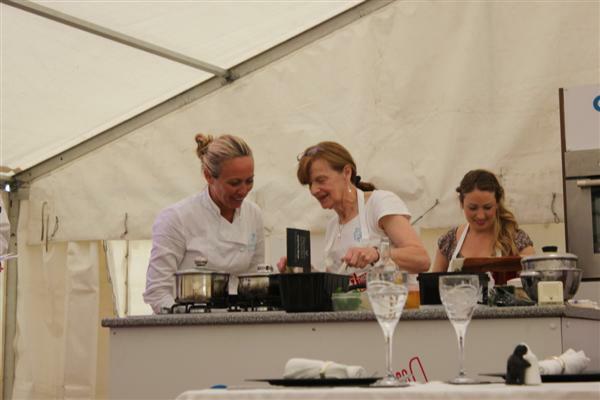 The judges also interacted with the competitors when they were cooking. 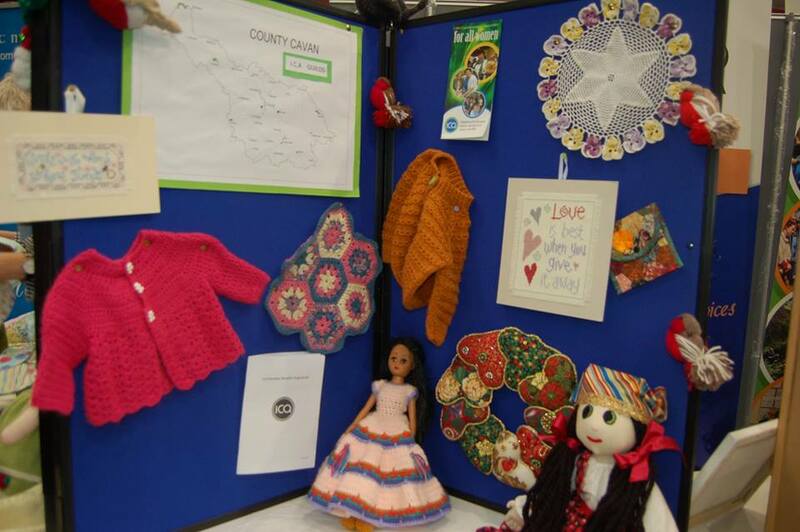 There were 8 competitors and Nan Smith Crosserlough Guild was placed 2nd. 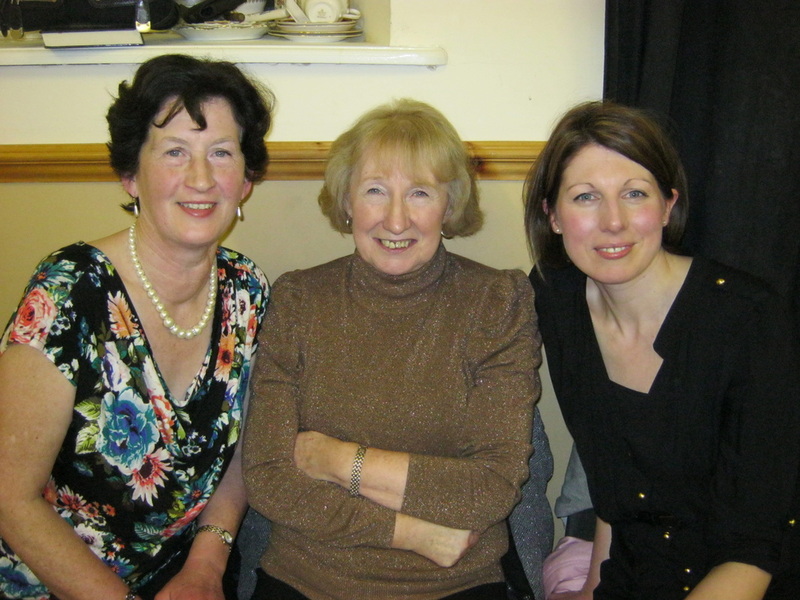 Congratulations Nan and Ada and Tess are to be complimented on taking part. 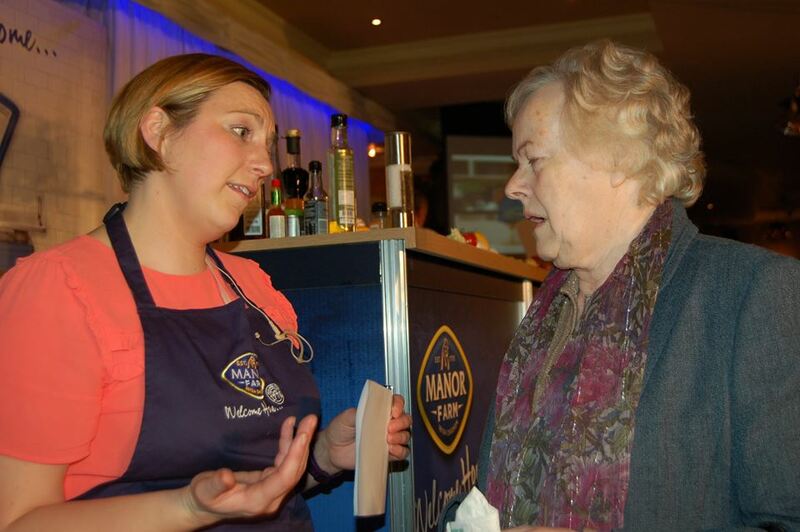 Photo shows Nan receiving a Certificate from Celebrity Chef Clodagh McKenna. 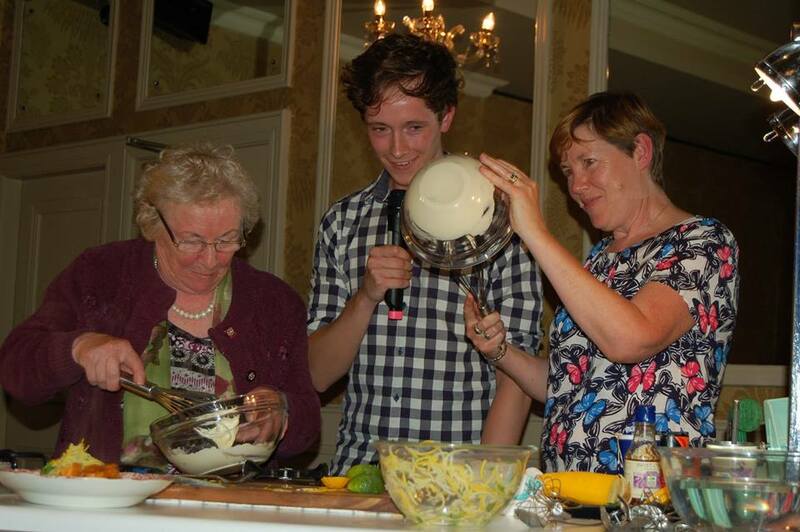 Nan also receives a "Day's Cooking" in Clodagh's Restaurant. 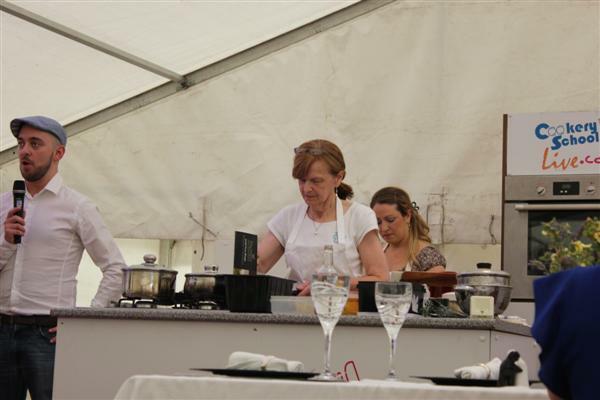 Photos below show the competitors cooking and being interviewed by Brian McDermott Community Chef, Donegal and the Judges. 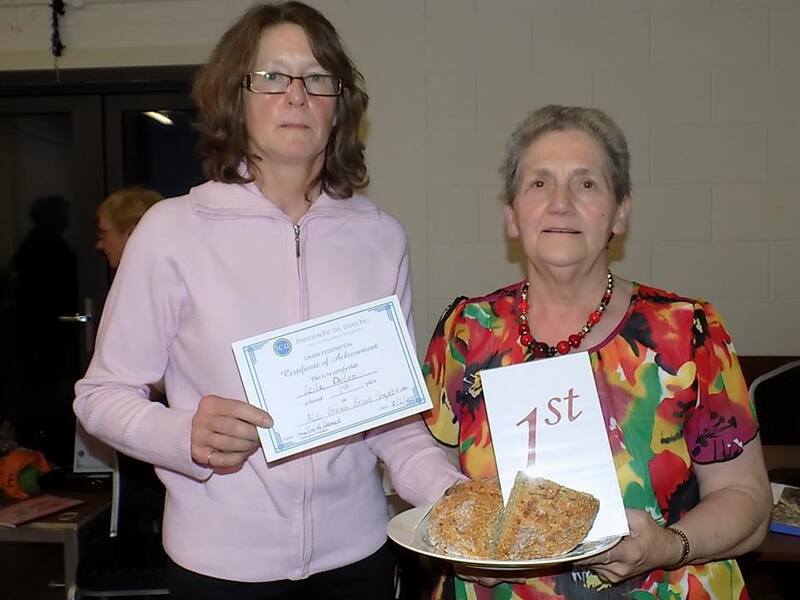 Margaret Smith Crosserlough Guild emerged the winner of the Jam Competition at the Taste of Cavan Event on 11th August 2013. 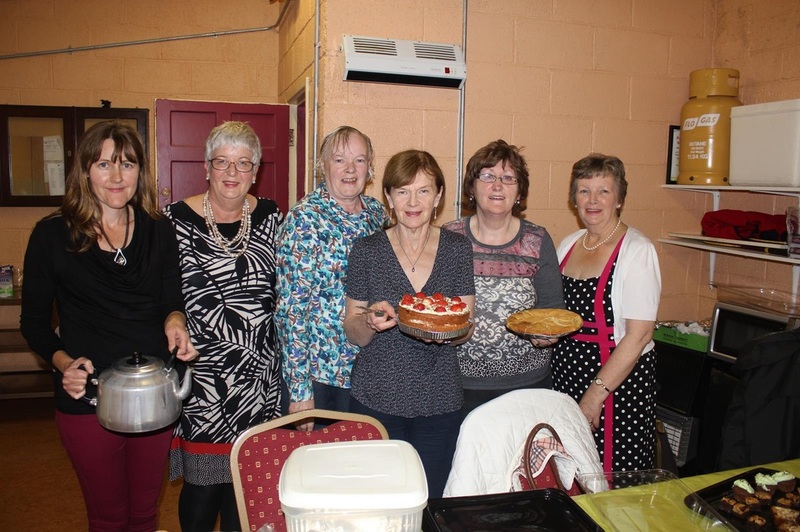 Congratulations to Margaret Smith, Crosserlough Guild on winning the Summer Berry Pie Competition at the Taste of Cavan Event on 11th August 2013. 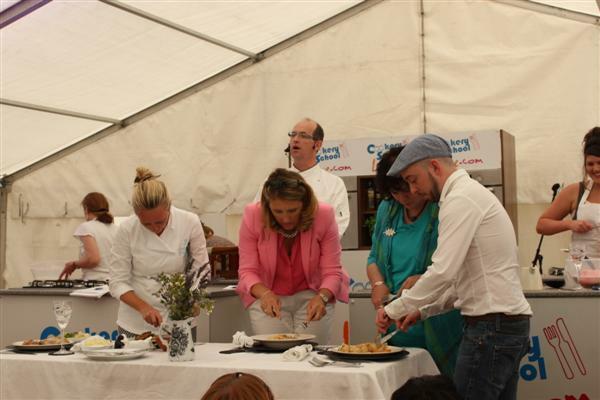 The competition was judged by Celebrity Chef and Restaurateur Clodagh McKenna; Liz Wall National President and Shane Smith - Fallon & Byrne Restaurant Dublin. 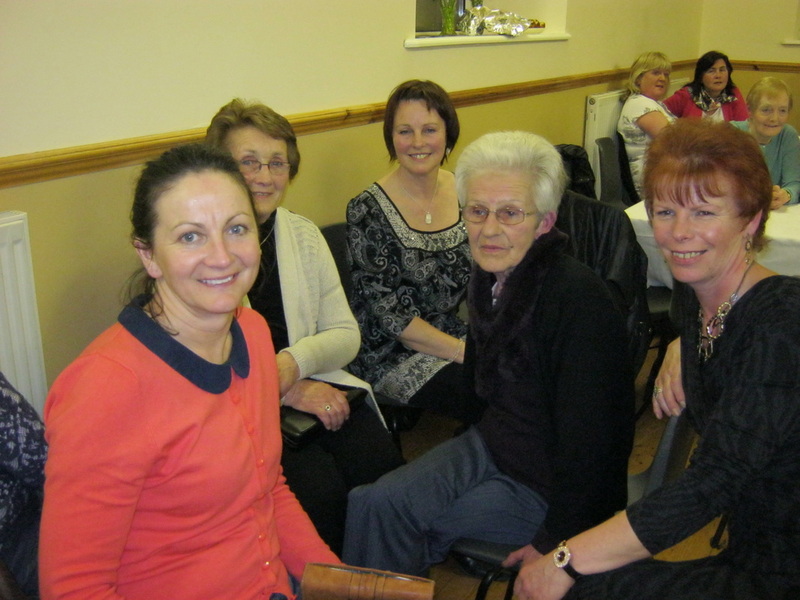 Photo (l to r) Clodagh McKenna; Margaret Smith; Liz Wall & Shane Smith. 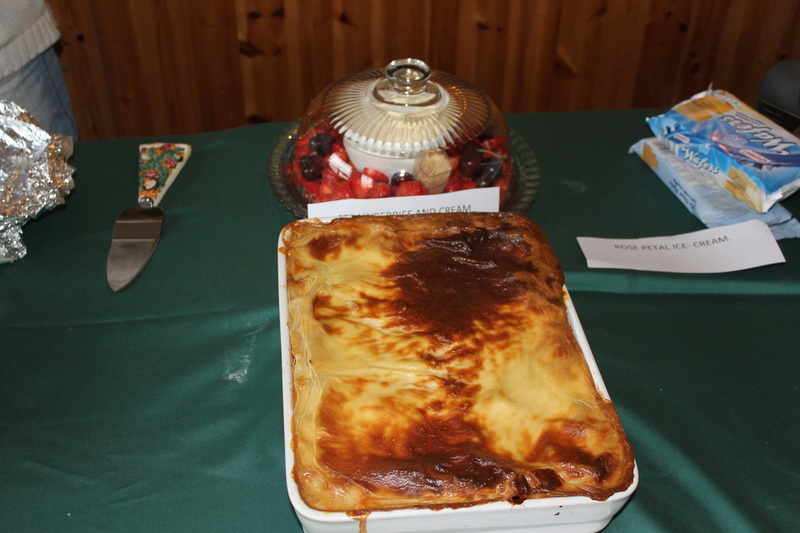 Pictured below are the pies and jams. 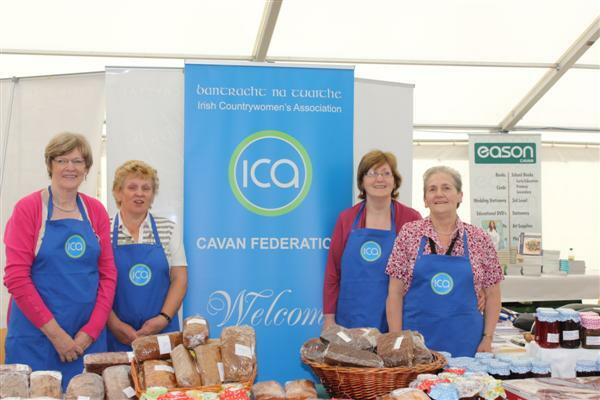 FEDERATION STAND AT "TASTE OF CAVAN EVENT"
The Taste of Cavan Event which was held over two days was a wonderful opportunity to showcase ICA. 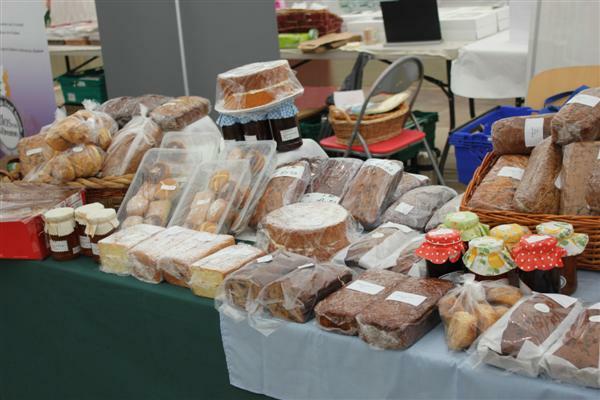 The stand was packed with home made cakes, bread, apple tarts, scones, jams, marmalade, crafts and jewellery. 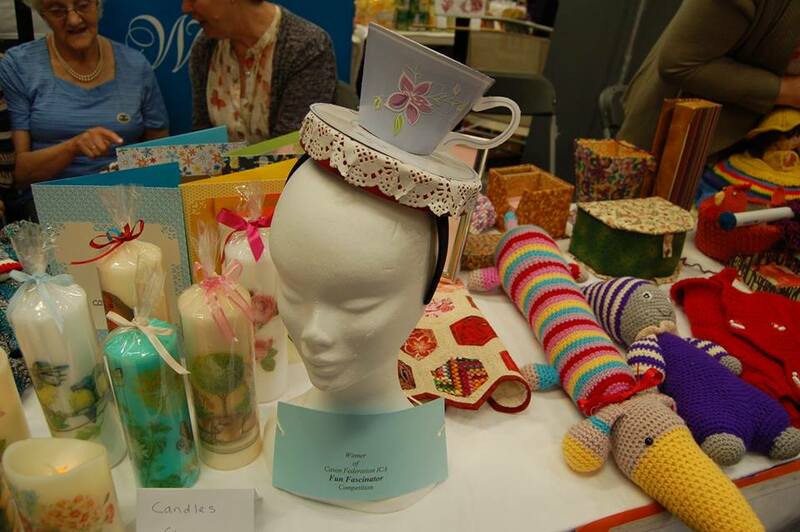 By Sunday evening there was very little left on the Stand which proves there is a demand for good quality home produced goods. 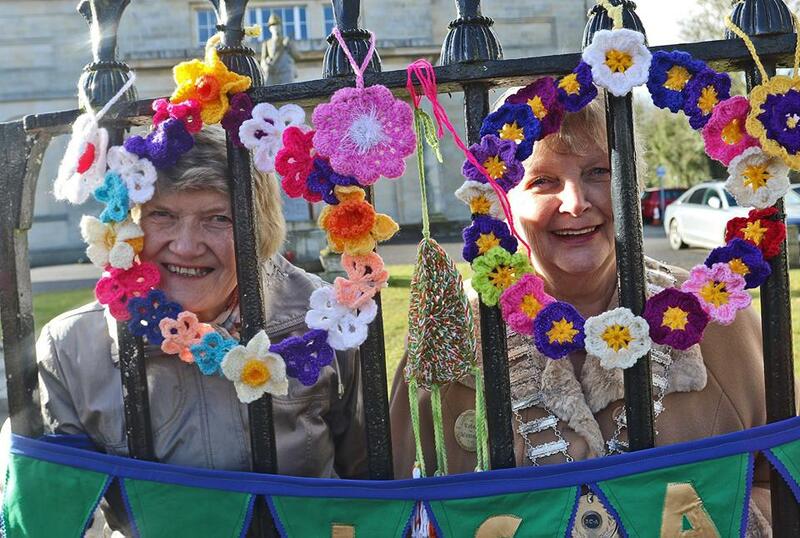 Members of Mountnugent Guild displayed some of their crafts and demonstrated how to make pom-poms. 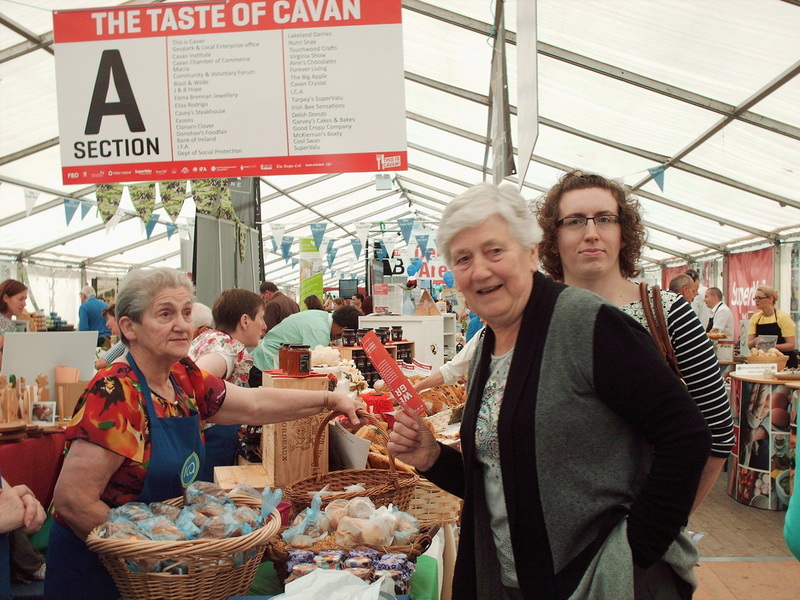 The Taste of Cavan Event takes places on Saturday 10th August & Sunday 11th August 2013 @ The Food Hall Marquee, Cavan Institute. 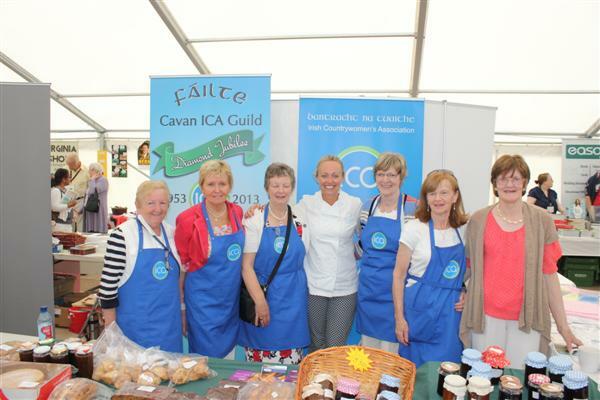 Cavan Co. Council invites ICA members to compete in The Chef of Cavan Competition on Sunday 11th August 11.45am - 2.00pm. 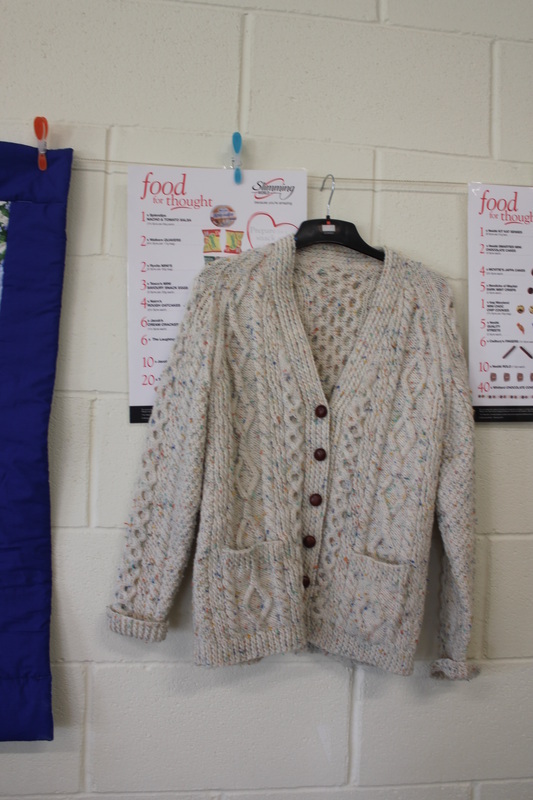 in Cavan Institute. The purpose of this event is to promote ICA and showcase our skills. Competition details. 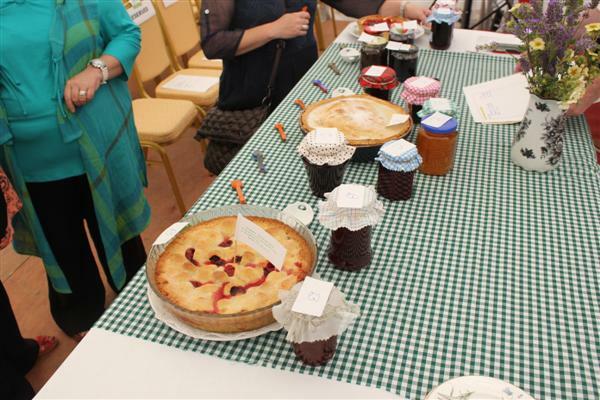 BEST POT OF HOMEMADE JAM COMPETITION - Judging takes place on Sunday 11th August between 11.00am - 11.30am. Certificates will be presented on the day. 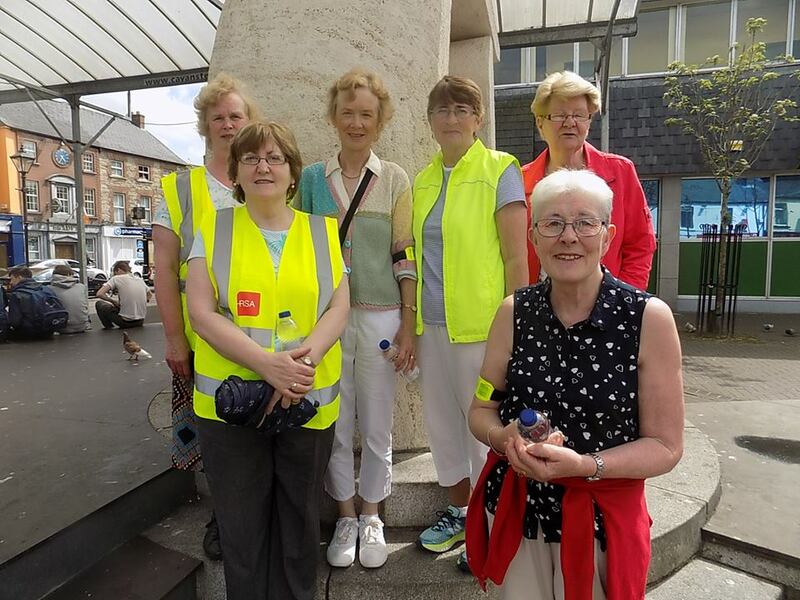 44 walkers took part in the annual Charity Walk for Cavan/Monaghan Palliative Care on Sunday 30th June commencing at the Courthouse in Cavan. 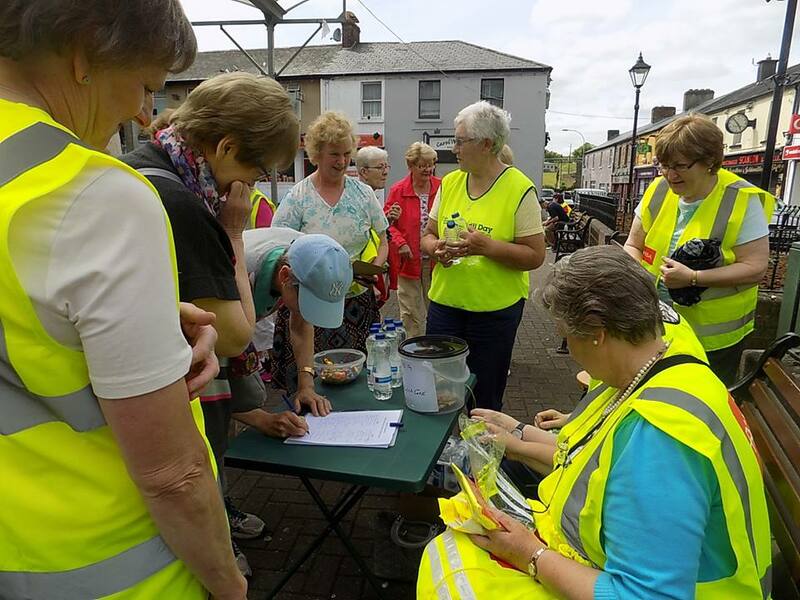 Refreshments along the route were provided by Federation President Leila Beattie and David Mulligan. 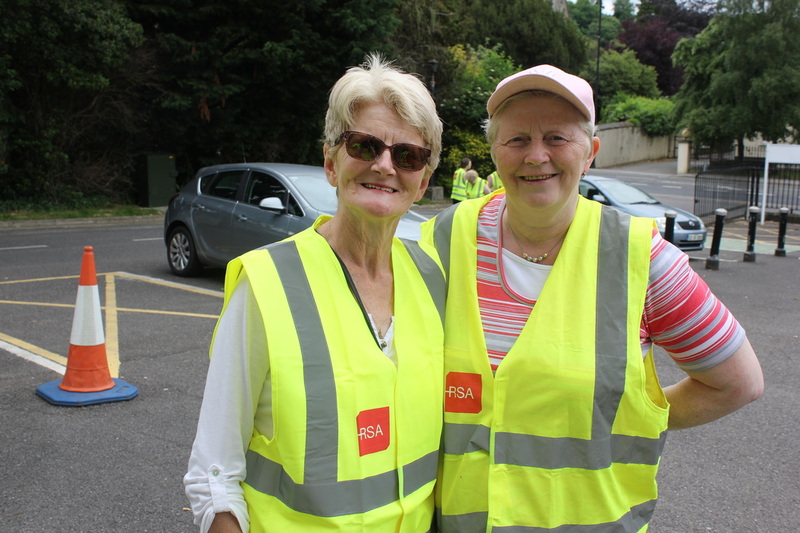 Everyone enjoyed the welcome cup of tea/coffee and biscuits at the conclusion of the walk courtesy of Mr. & Mrs. Oliver Sheils in the Farnham Hotel in Cavan. 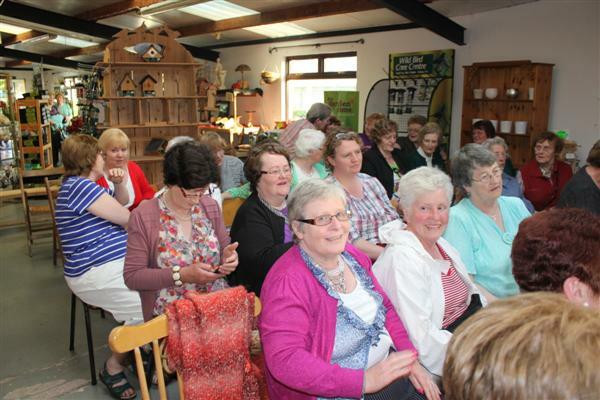 The annual visit to Tullyvin Garden Centre was held on 5th June 2013. 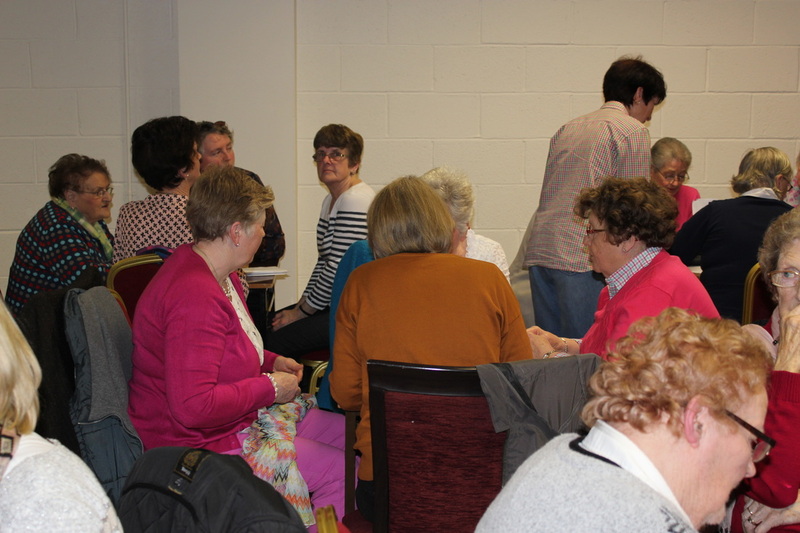 The room was packed with the large numbers who attended from many different guilds for this information evening hosted by Roslyn and Neil. 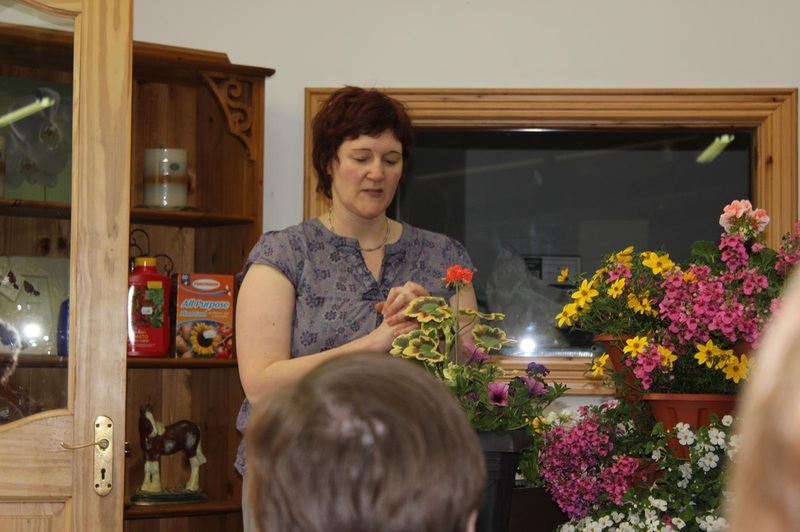 Roslyn demonstrated container planting giving useful advice and tips on the variety of plants and containers available. 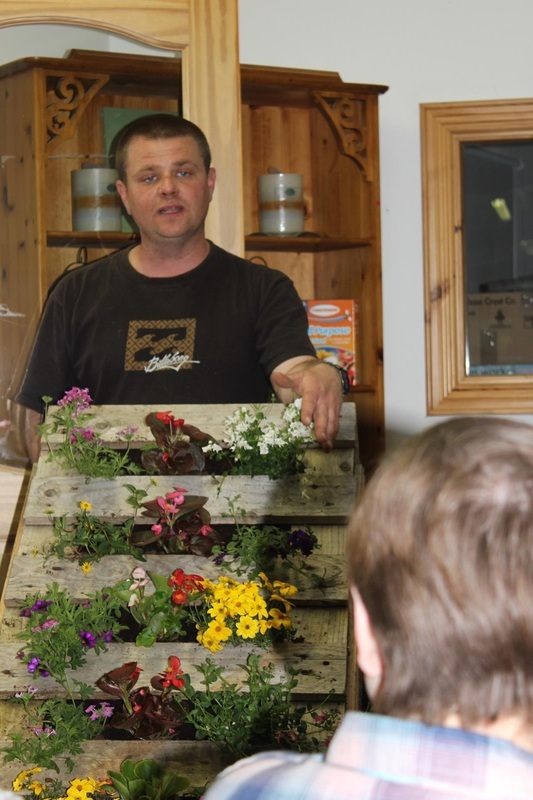 Topics covered by Neil were: making raised beds; vegetable growing and pest and fungus control. There was also a very lively question and answer session. 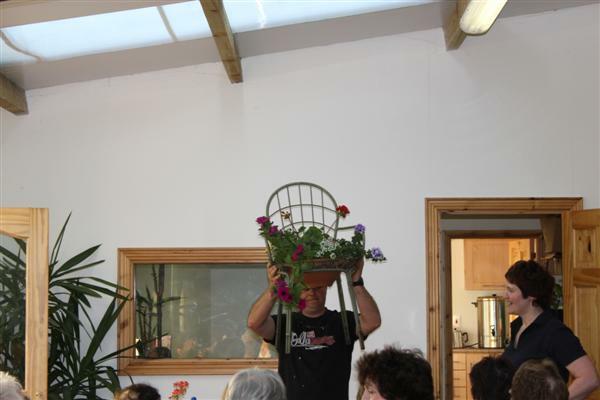 Everyone enjoyed the beautiful supper and had time to view the huge array of beautiful plants for sale. 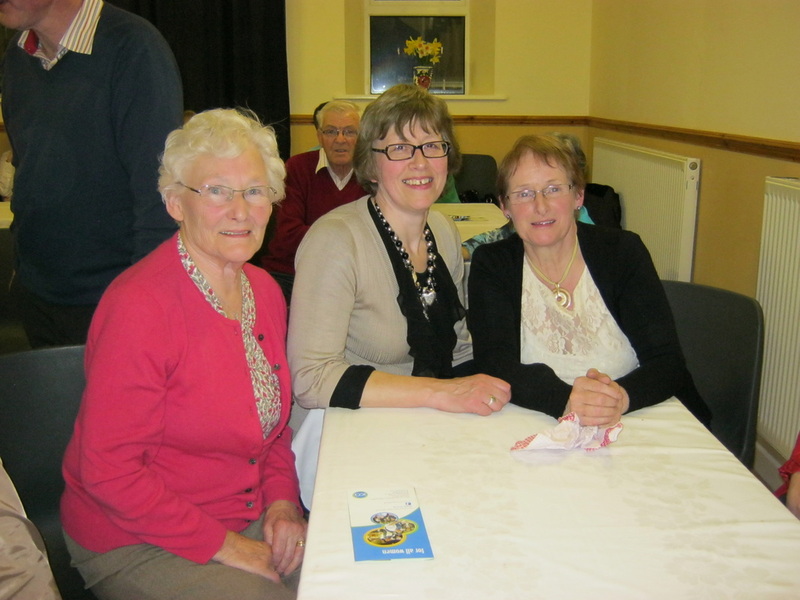 The evening concluded with a Raffle with the proceeds going to funding the Kitchen Garden Competition. 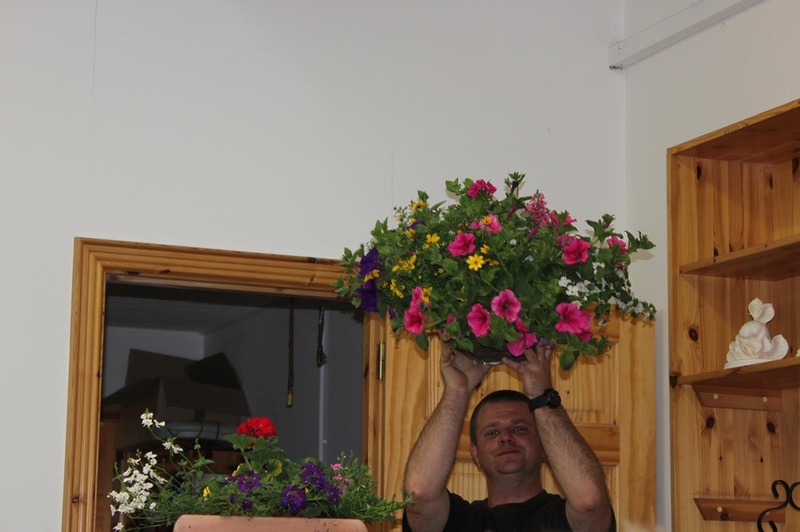 Photos below show some of the members who attended and also Roslyn and Neil demonstrating container planting. 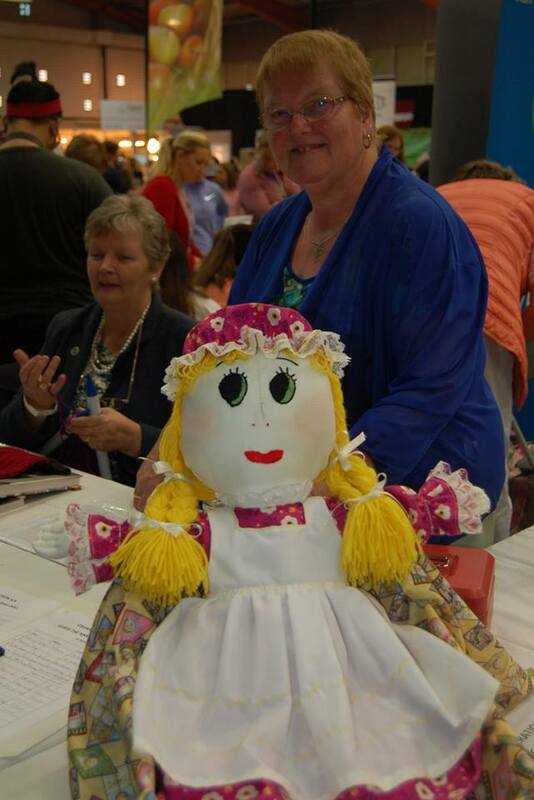 Isobel Reilly Butlersbridge Guild was the winner of the Ticket to Bloom Garden Festival sponsored by Farmers to Market. 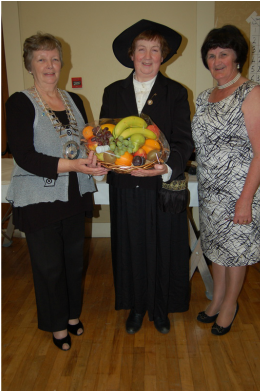 Photo shows Isobel receiving her prize from Leila Beattie Federation President. 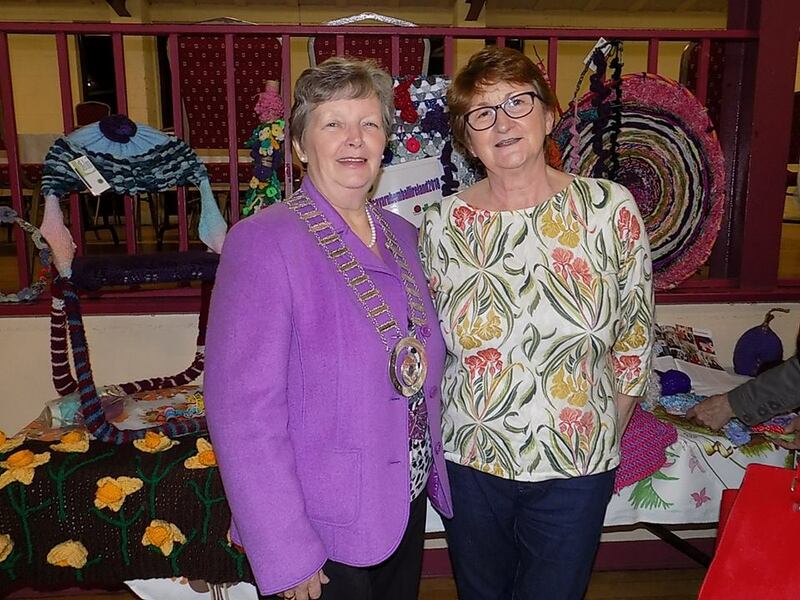 At the AGM held in Portlaoise on Saturday 25th May the Inter-federation Cup for Crafts was presented to Betty Denning Cross Guild who was the national winner in the competition. 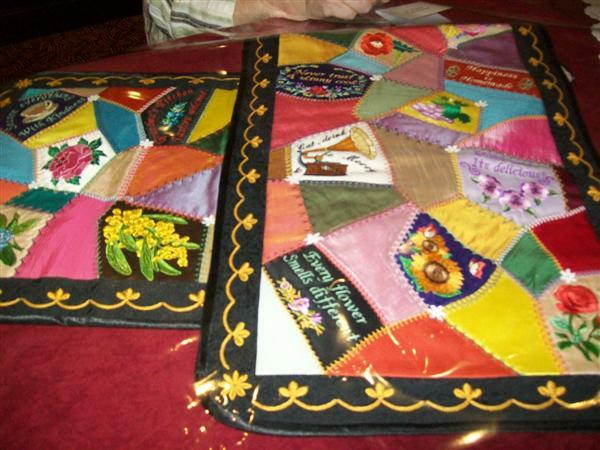 Betty won the competition with her Crazy Patchwork Table Runner. 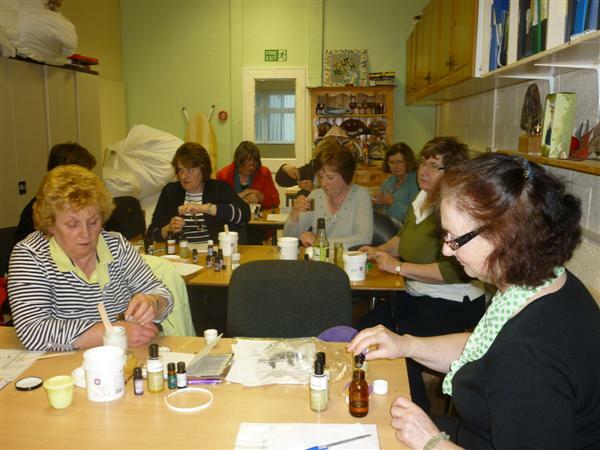 An Aromatherapy Class was held at the Youth Reach Centre Moynehall, Cavan in April/May 2013. 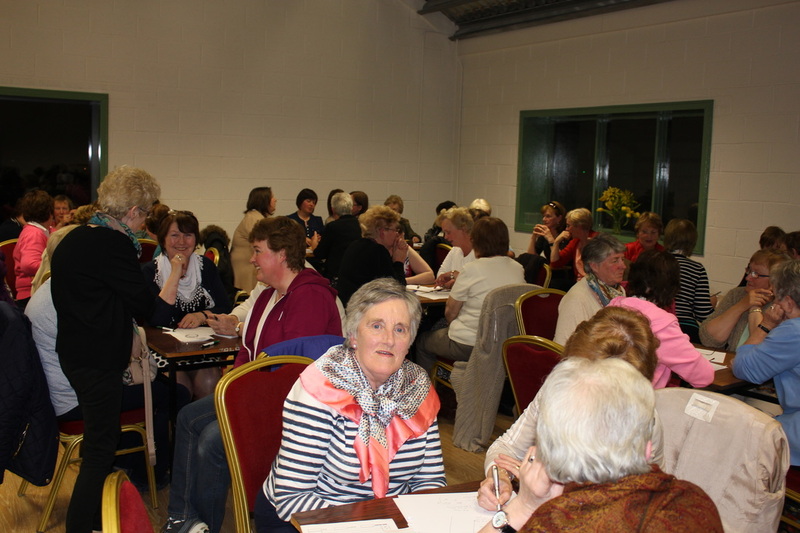 Participants were from Cavan and Clifferna Guilds. 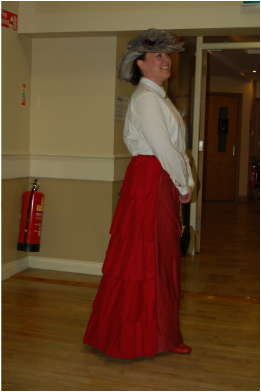 The tutor was Michelle Leggett. 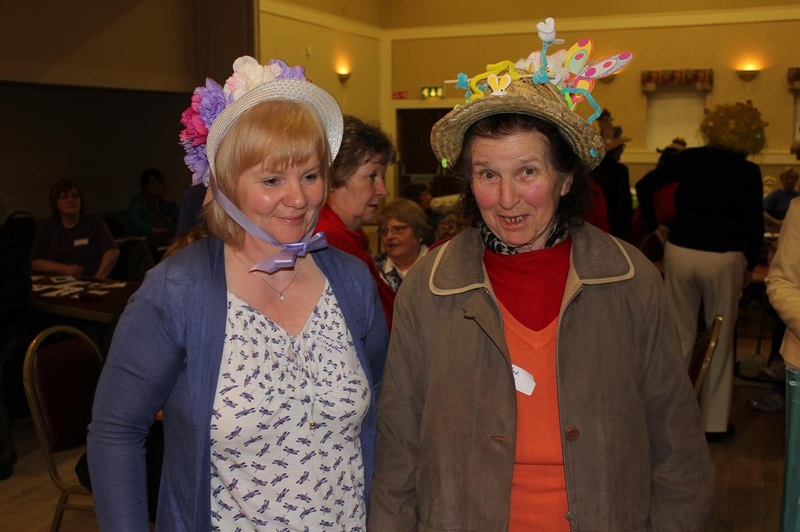 Over 100 people attended the Tea Party in Ballinagh Community Centre on Friday 3rd May. 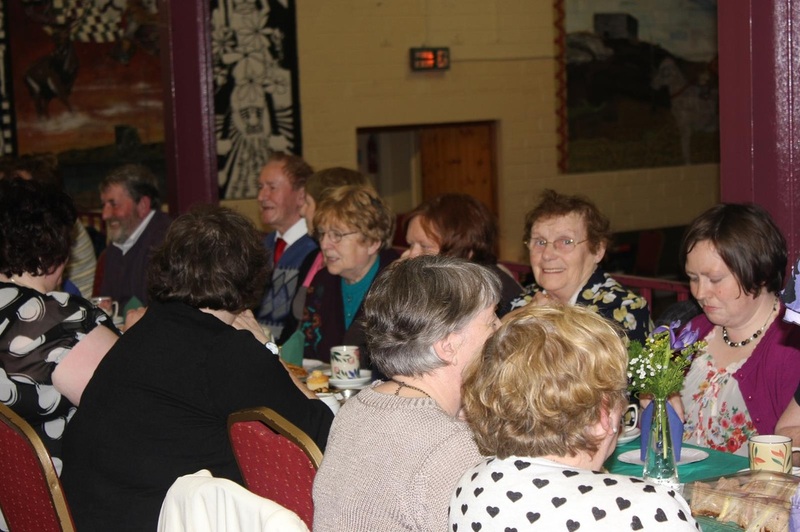 The party was hosted by Bruskey, Castlerahan, Butlersbridge, Cavan and Drung Guilds. A great night of food and dancing. Music was provided by Ian Livingstone. More photos in Photo Gallery. 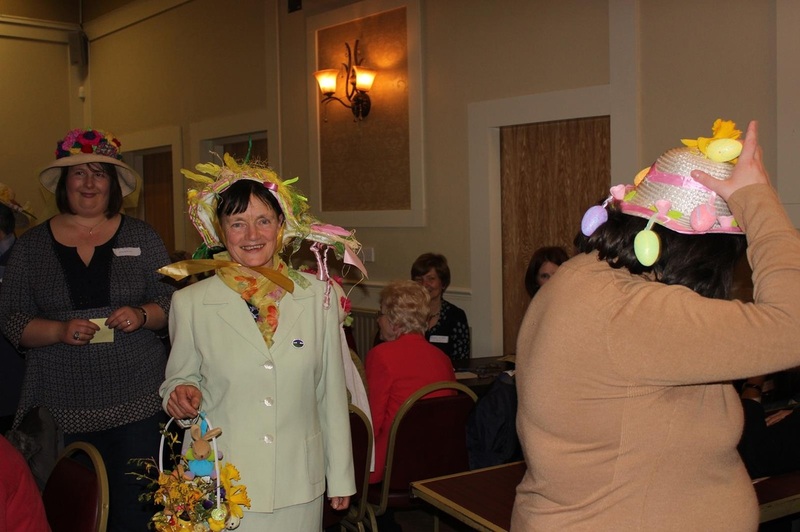 Photos below show Members and friends enjoying the fundraising Tea Party which took place on 19th April. These enthusastic members are a great encouragement to their fellow members and to the federtation. 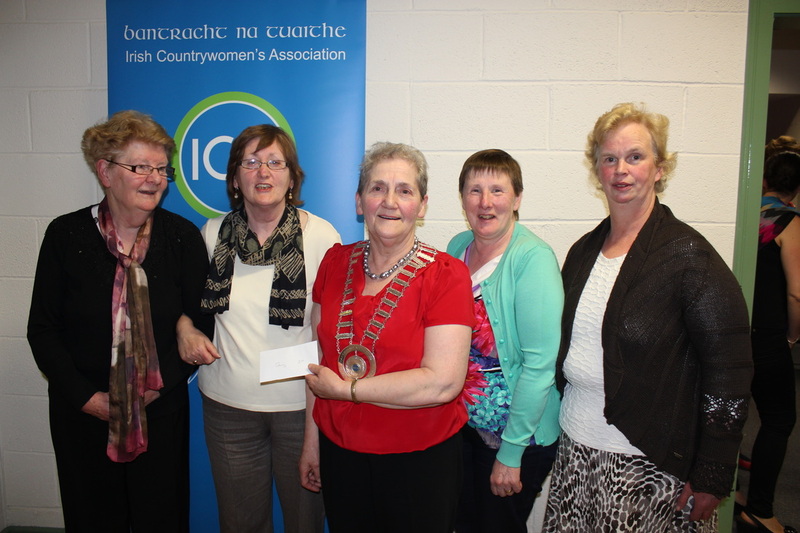 Two half scholarships for An Grianan were drawn at the Federation Meeting in Cavan on Wednesday 24th April. 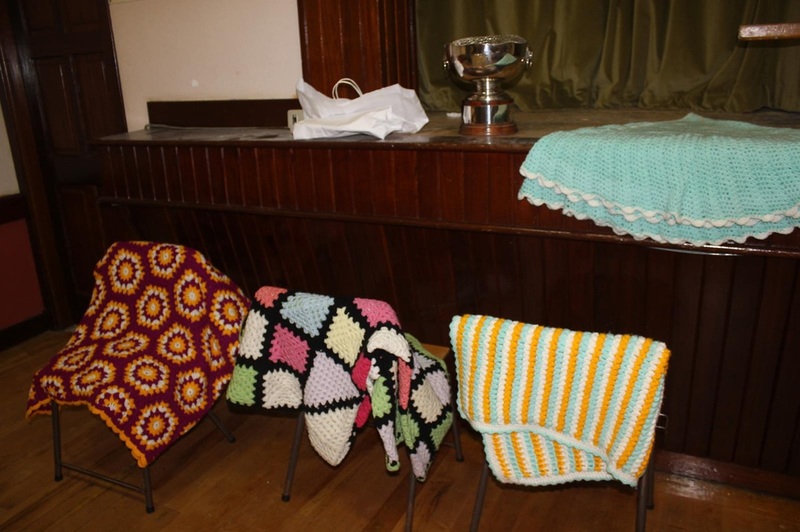 The winners were: 1st Bruskey Reserve - Kildallan 2nd Knockbride West Reserve Killeshandra. Learn Positive Strategies to Improve your health, happiness and resilioence in these challenging times in Lakeside Manor, Virginia on Monday 20th May at 8.00pm. Cost €5.00 Presentation by psychologist Shane Martin. 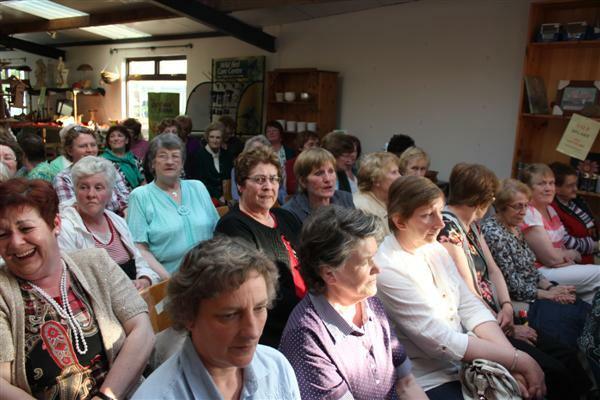 'Moodwatchers' self-help course. Open to men and women over 16 years. 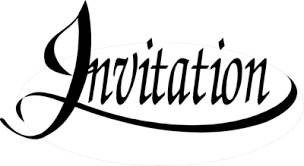 Text Mood your name to 0861689142, call 046 9245580 or RSVP: marionblyon@gmail.com if you wish to attend. Shane Martin Reg. Psychol., Ps. S.I. is a psychologist dedicated to teaching the very best self helf psychology to help people enhance the quality of their lives. 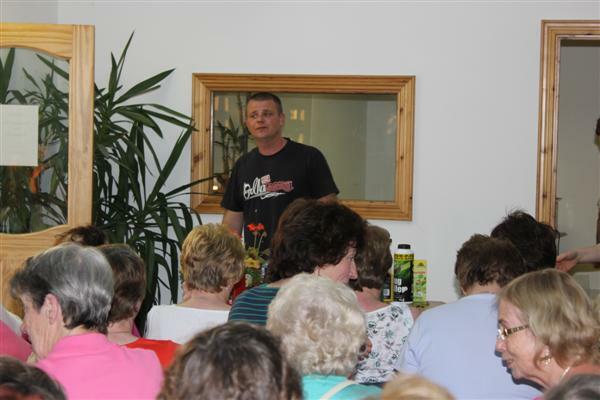 His "Moodwatchers" self-help course has been delivered at community ventures throughout the length and breadth of Ireland. He has been a keynote speaker at numerous national and international conferences, promoting health, happiness and resilience. Sponsored by Maghera ICA Guild. 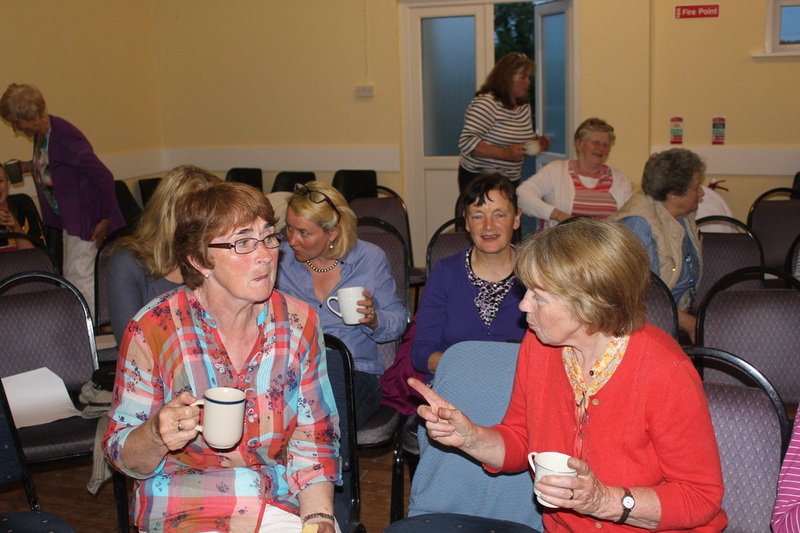 The tea party which was hosted by Kildallan, Killeshandra and Corlough Guilds was a good success. 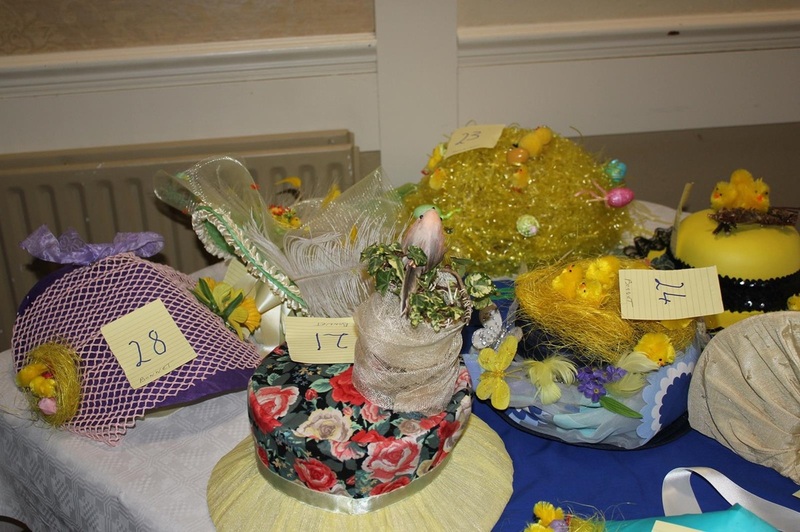 The tables were decorated in the ICA colours with lovely primroses adorning each table. Federation President Leila Beattie gave a warm welcome to all. Food was splendid and there was plenty of chat. Following the meal we were entertained by Paul Corrigan who played Country and Western Songs which took us back a year or two. 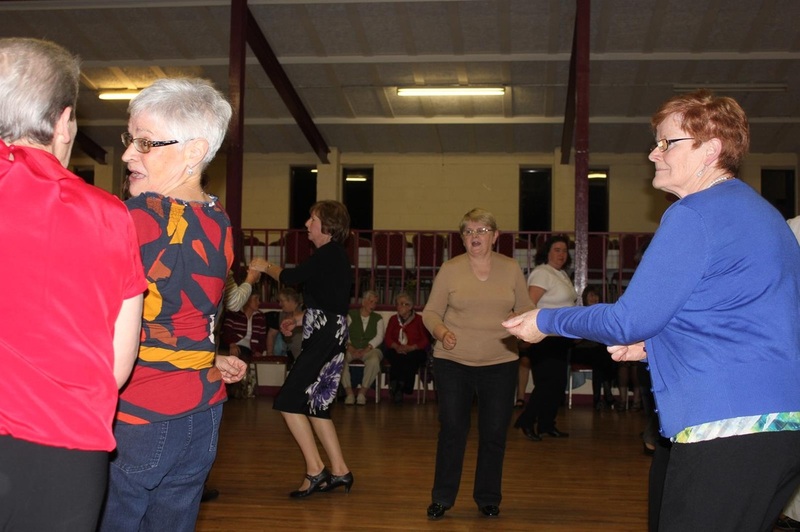 The dance floor was full at all times and everyone enjoyed the event. 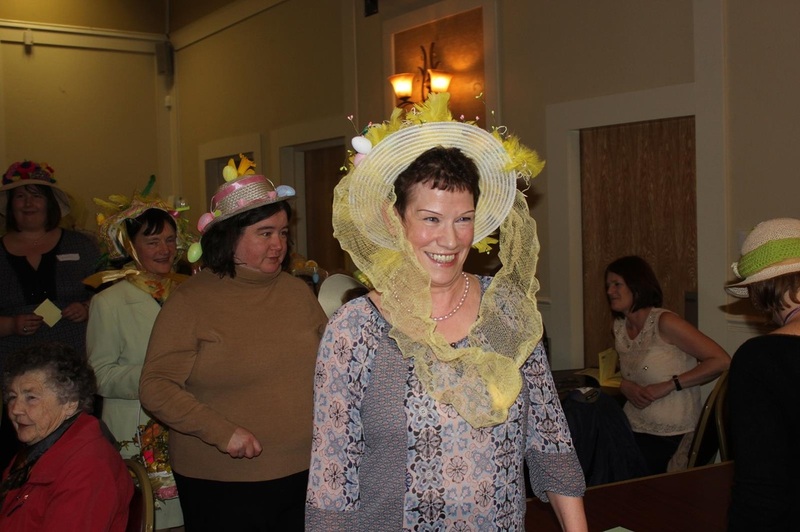 A raffle was held. Bernie Tighe Kildallan Guild President thanked everyone for their support. More photos available in The Photo Gallery. 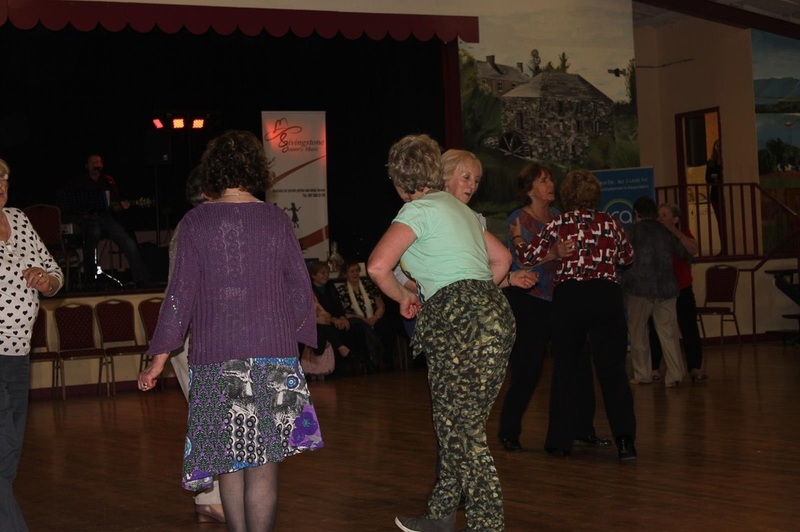 12th April Kildallan Community Centre @ 8.00pm hosted by Kildallan, Killeshandra & Corlough Guilds. Dancing 9.30-11.30pm. 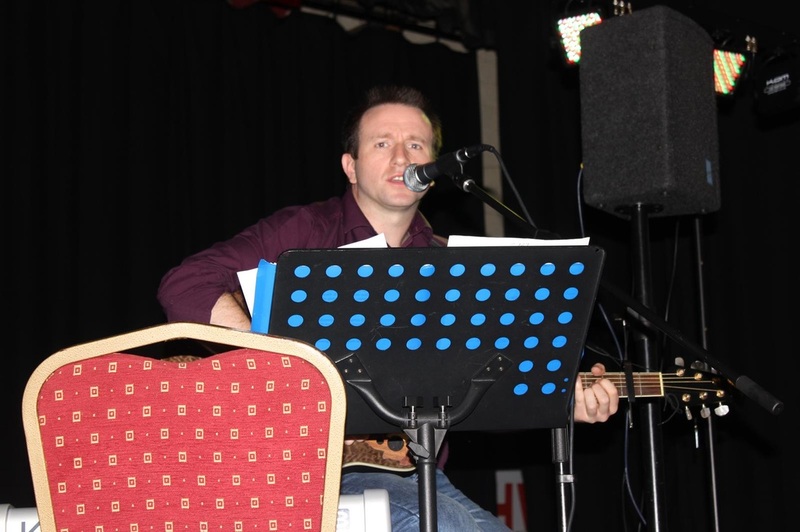 Music by Paul Corrigan. 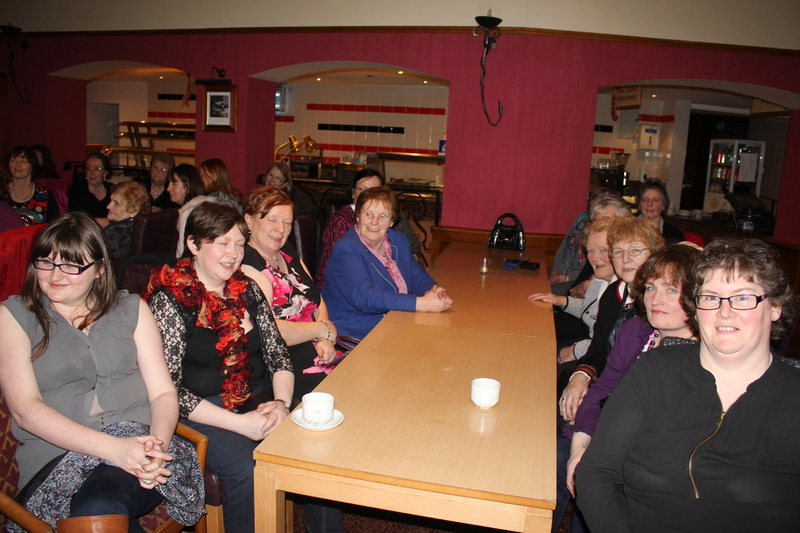 12th April Knockbride Hall - hosted by Knockbride West & Clifferna Guilds. 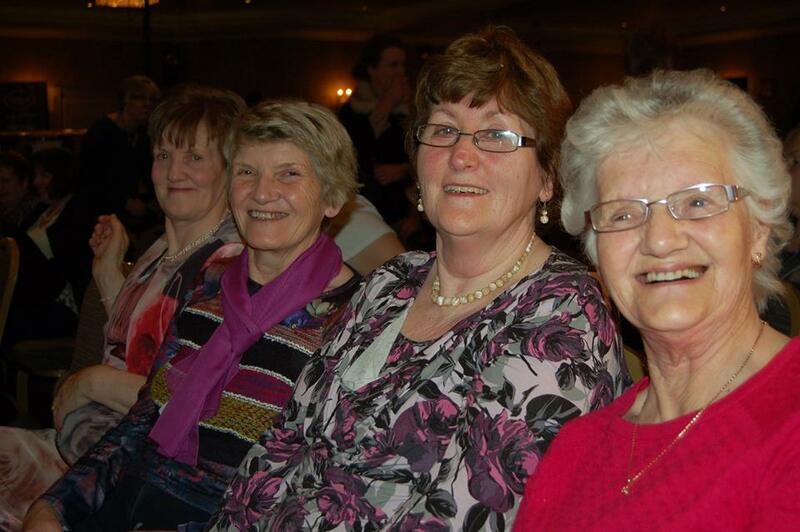 19th April Crosserlough Old School @ 8.30pm hosted by Crosserlough, Mountnugent & Sheelin Guilds. 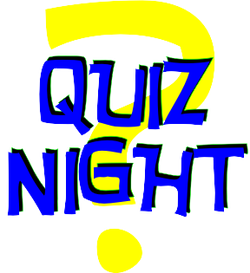 03rd May Ballinagh Community Centre @ 8.00pm hosted by Bruskey, Castlerahan, Butlersbridge & Cavan Guilds. Music by Ian Livingstone. Any other guild members who wish to attend will be very welcome! 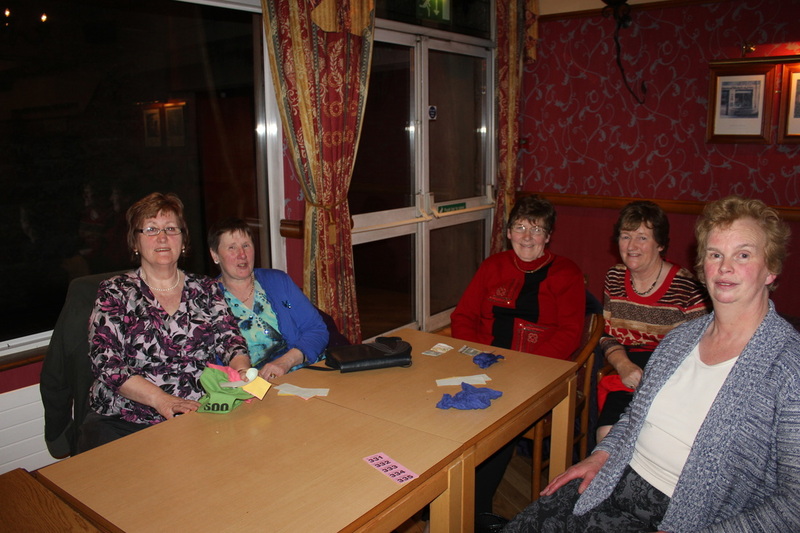 Pictured on the left are the members of Mountnugent Guild who won the federation final of the Table Quiz. 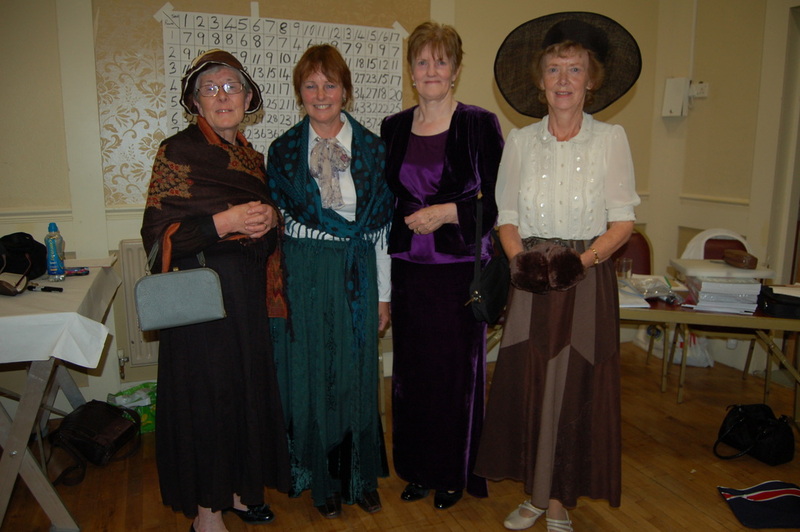 Front left to right: May Lynch; Chrissie Murray; Tess Brady & Kathleen Coyle Competition Secretary. 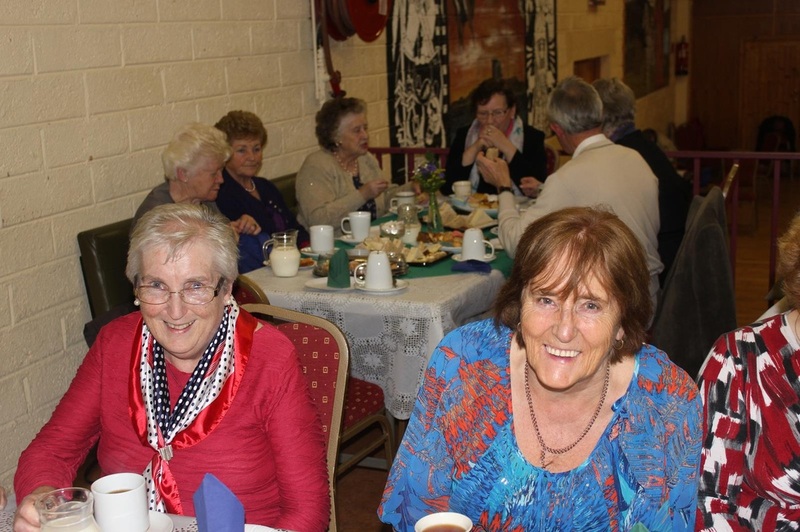 Loretto McDermott, Adult Education Officer has organised a six weeks Reminiscence Class in the Focus Centre Killeshandra. 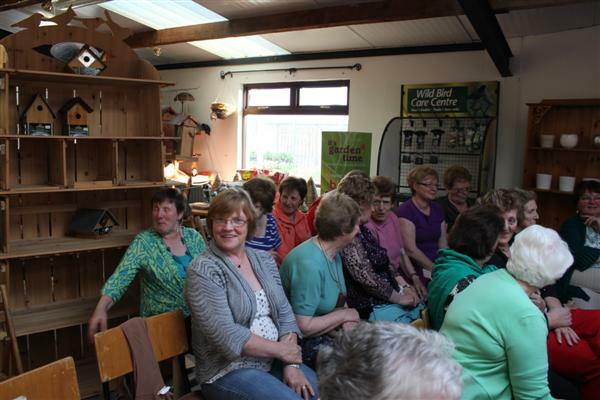 This class commenced on Tuesday 12th March. 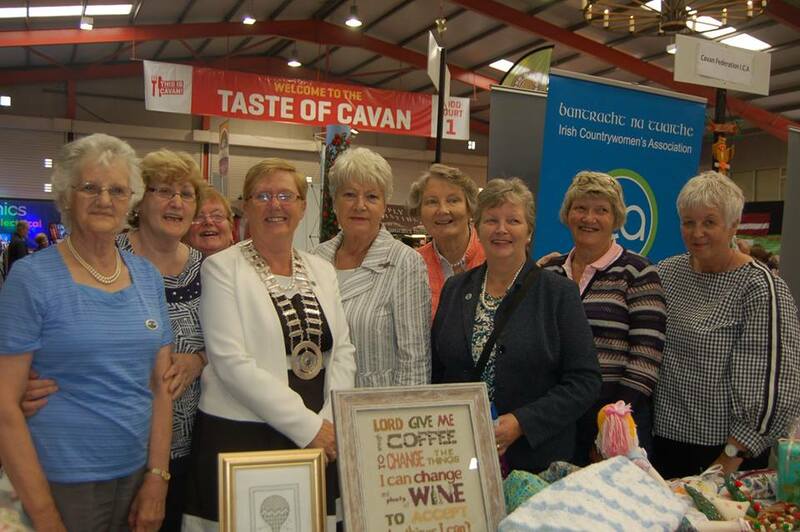 The class is funded by Cavan VEC. 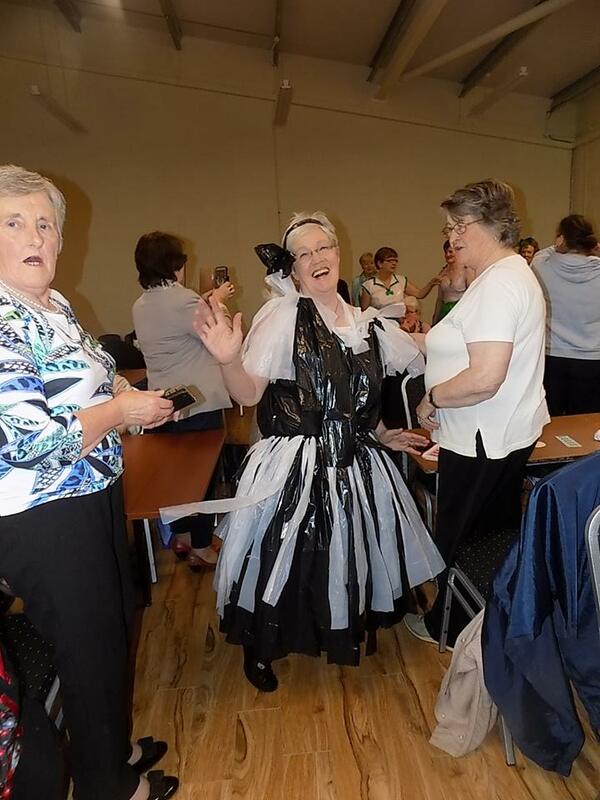 Photos below show Florence Creighton entertaining the participants with stories of times past. 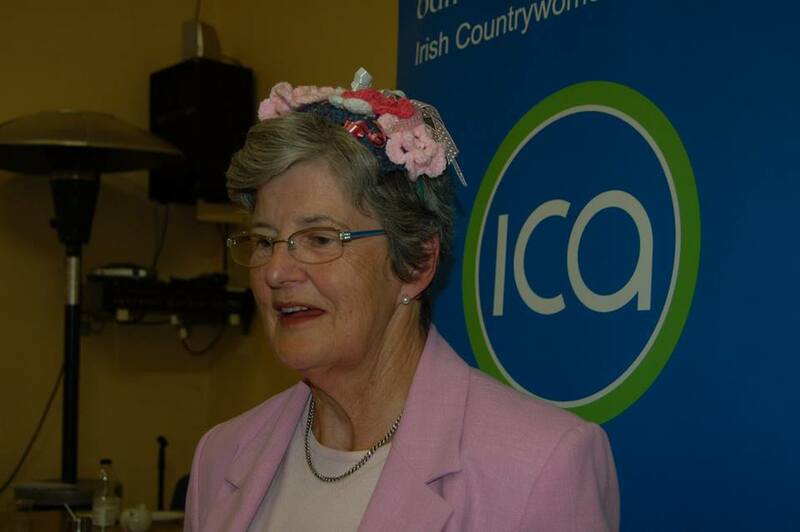 The ICA responds to Senator McAleese’s report on the Magdalene Laundries. 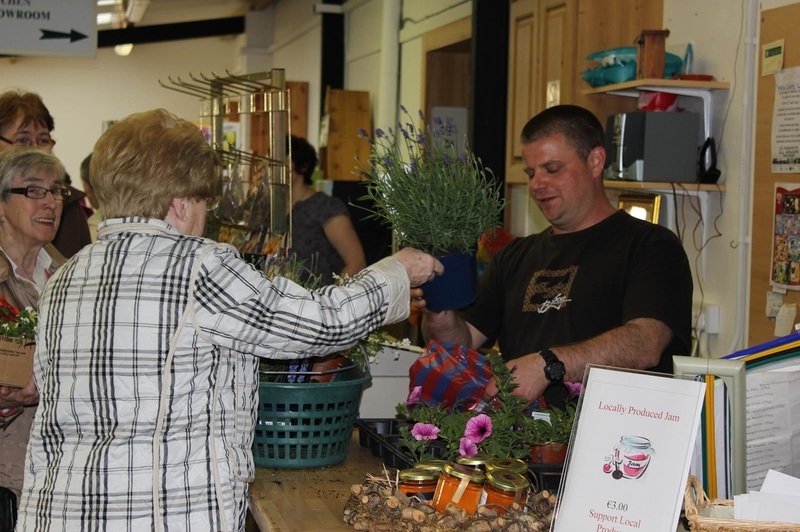 A number of new businesses have been added to the Member Benefits Programme. See Membership Page for updated list of Sponsors. 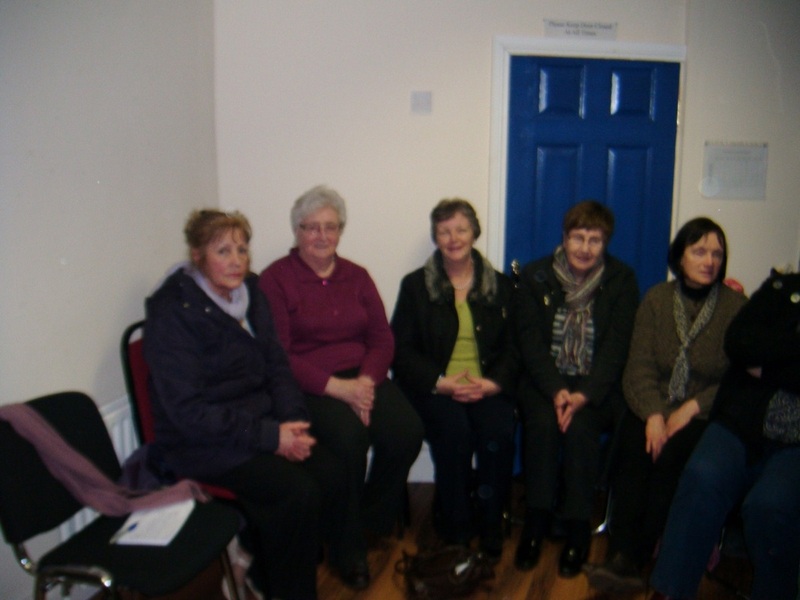 Photo below shows some of the members who attended the meeting in Tullyvin Community Centre on Monday 19th November. 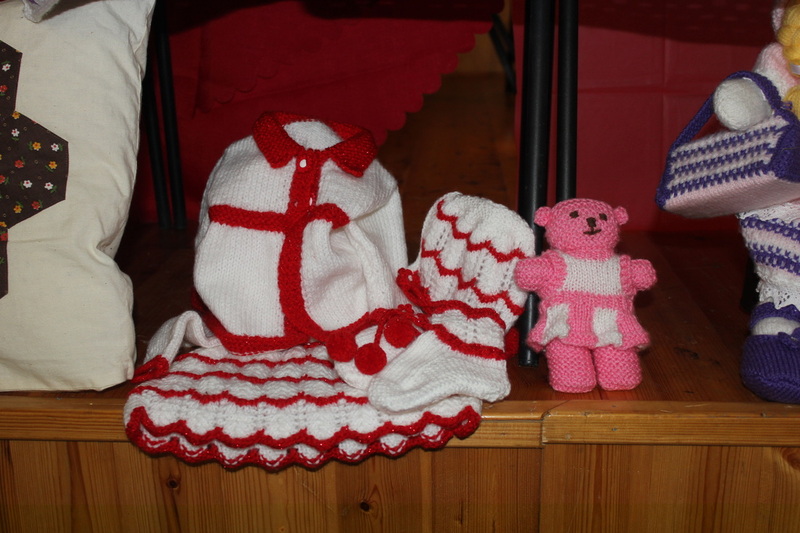 Kill Guild members had a wonderful display of crafts shown below. 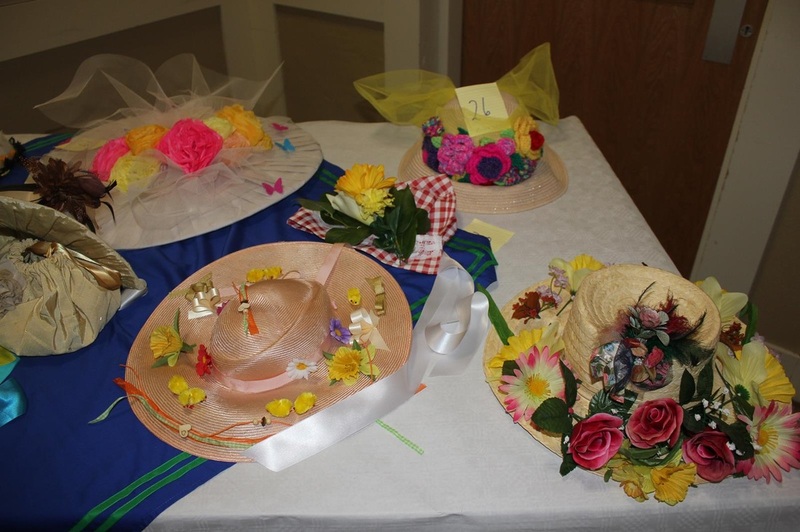 Results of Competitions and photos on Competition Page and larger photos in Photo Gallery. 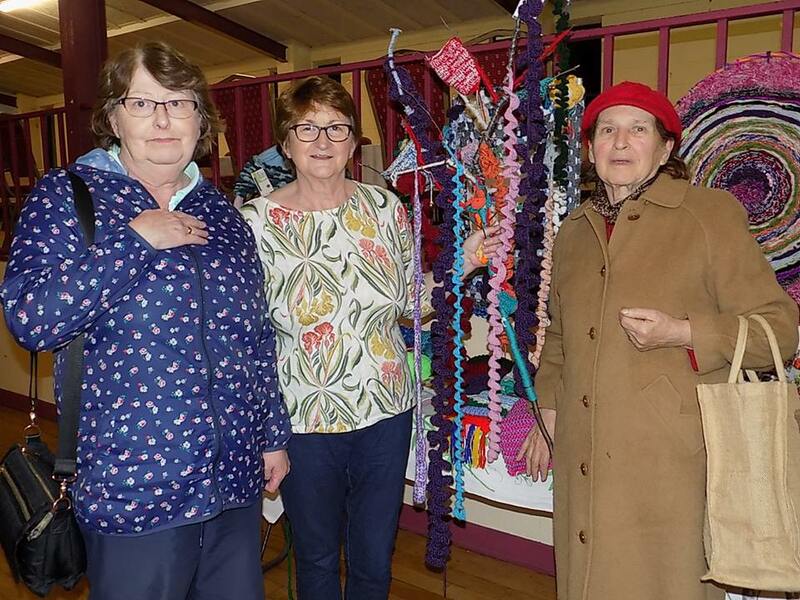 Nine members from Crosserlough Guild and Ada Vance Killeshandra Guild participated in the 'Preparation Day' for Craft Fair on Sat 17 November in the County Museum, Ballyjamesduff. 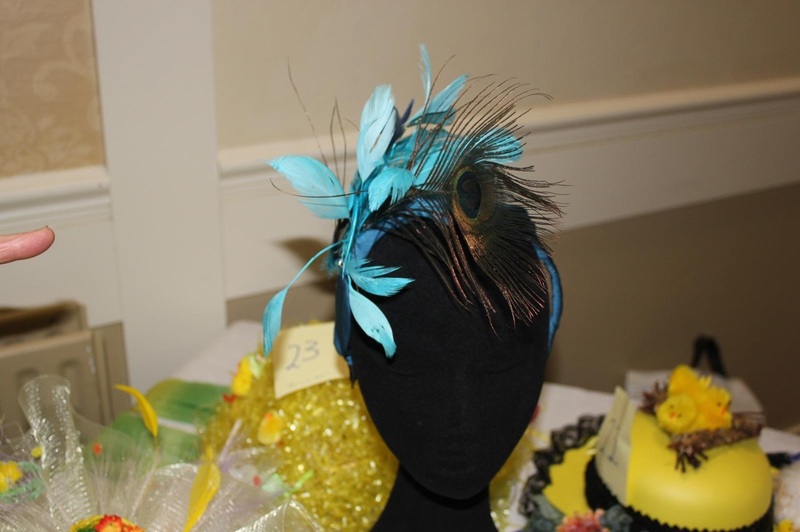 This event was part of Social Inclusion Week and organised by CAPS. 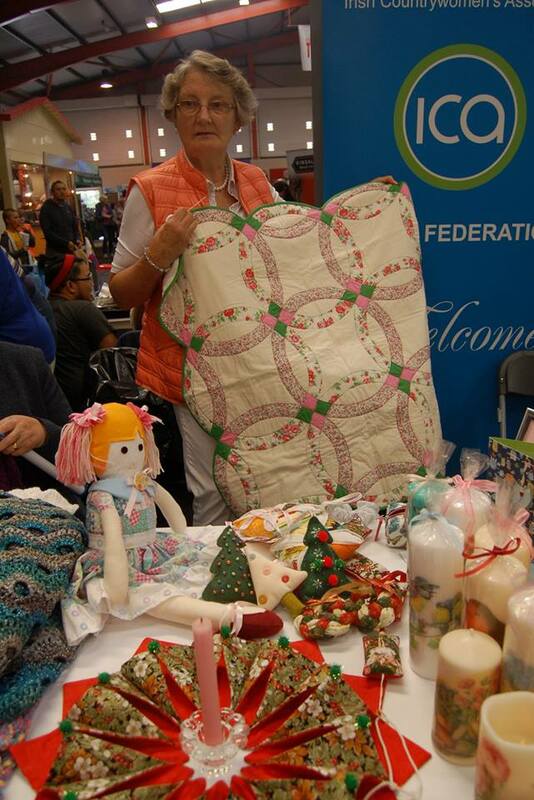 The ICA ladies and students assisted the young people who have autism with packing Christmas cards and making Christmas logs Marian Harkin MEP also attended the event and spoke about the importance of Volunteering. Photo on the left shows students working with the children. Larger photos in Photo Gallery. ICA members assisting with packing Christmas Cards. 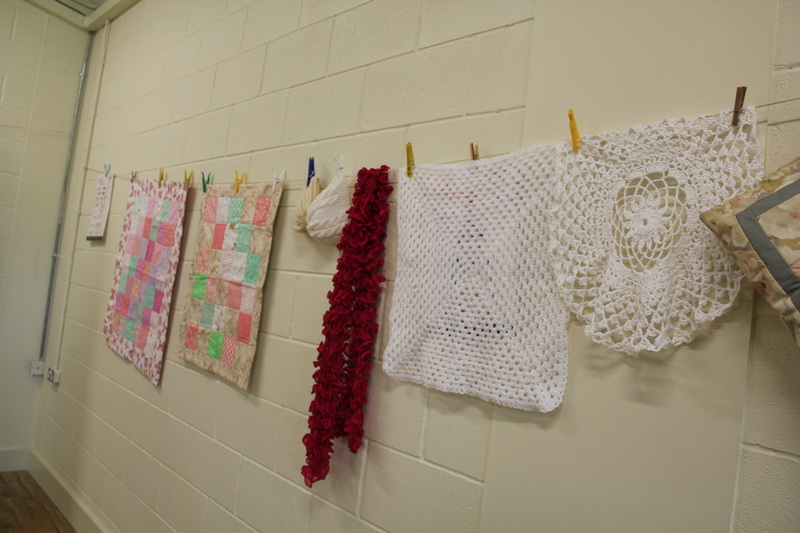 Some of the logs made by the children with the help of ICA ladies and students. 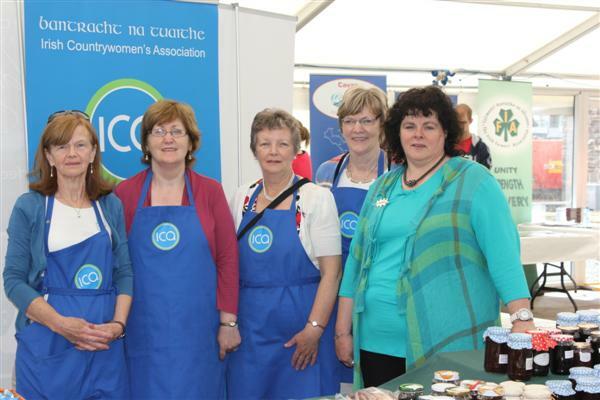 The ICA ladies are pictured with Marian Harkin in the County Museum. 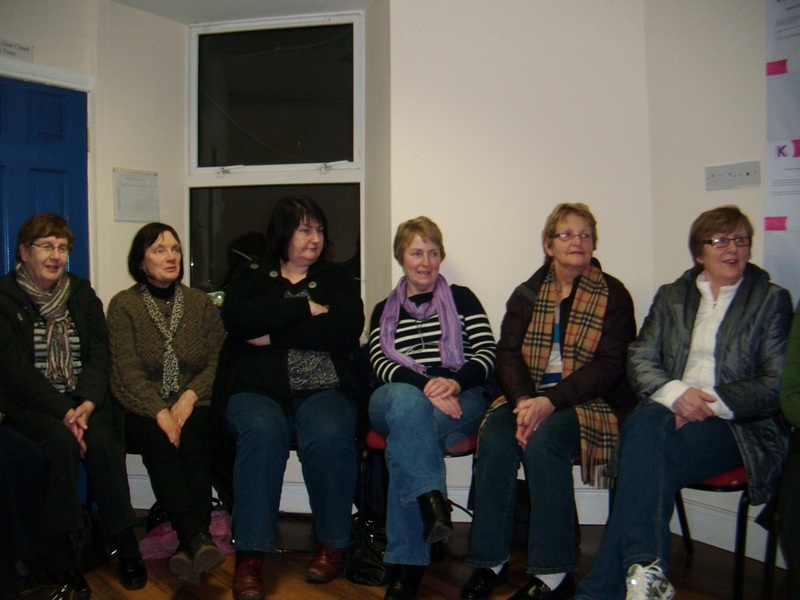 A six week course of Computer classes were held in the Adult Education Centre in Ballyjamesduff. 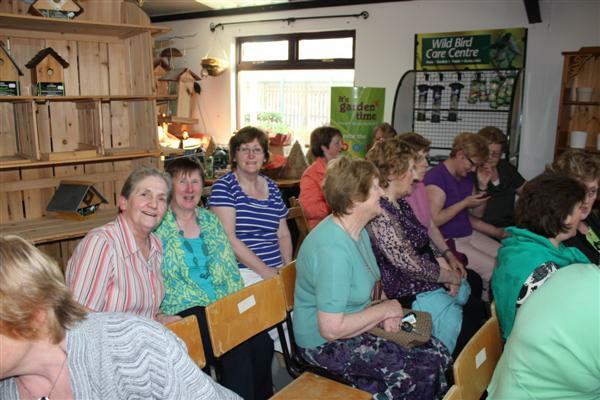 Photo shows some of the participants in the class along with Course Tutor Aisling Clarke. 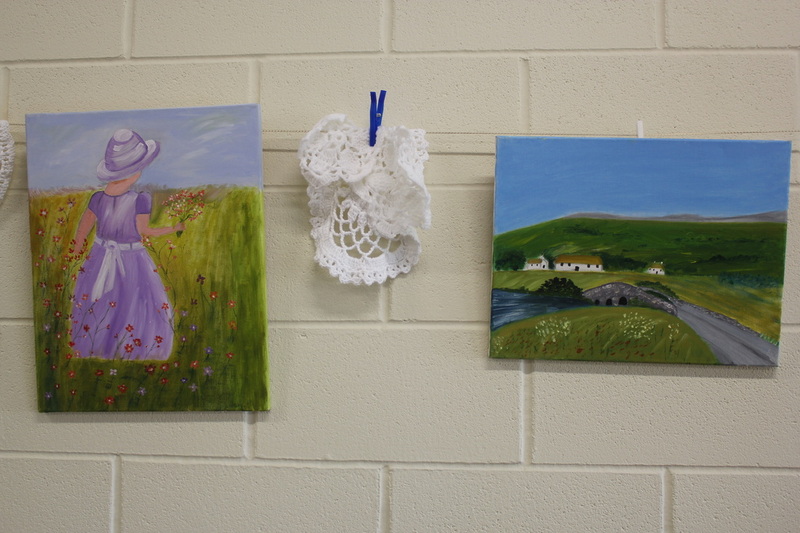 A six week course of painting classes were held in Cavan Youthreach Centre Moynehall. 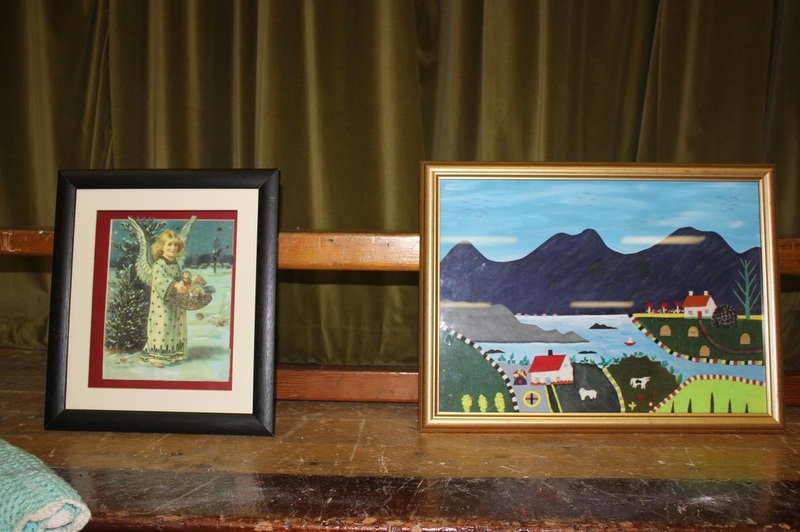 On the left is a beautiful display of the finished paintings. Three of the participants.are missing from photo below (right). 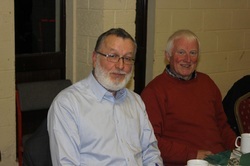 Below left is Course Tutor Ray Savage, Cootehill. 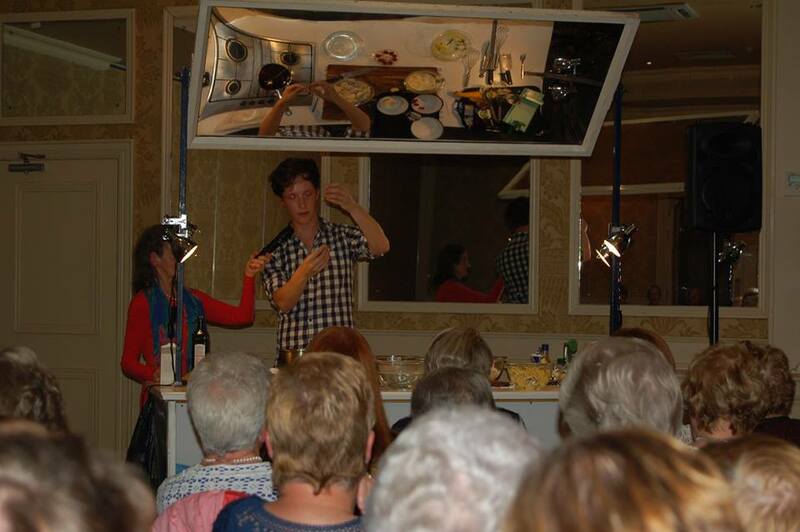 "The Taste of Cavan" Food Event which took place in the Hotel Kilmore, Cavan on 1st November with over 50 Exhibition Stands was a great success. 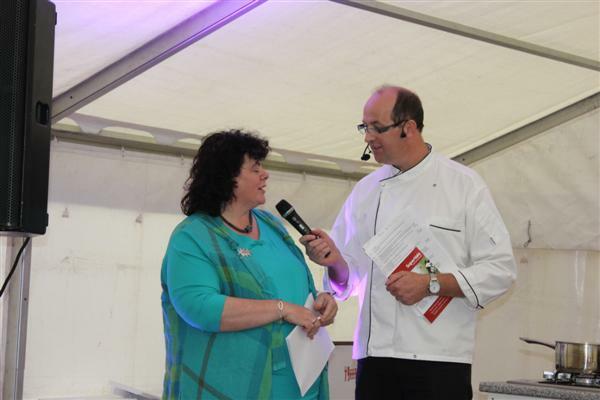 Liz Wall, National President was part of the Judging Panel for the "The Young Chef of Cavan Cook Off". The CEO John Callaghan was also in attendance. 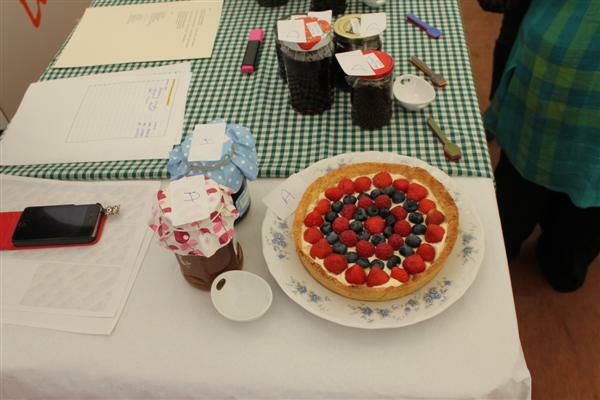 Our federation had a wonderful display of food, arts and crafts with samples of various breads, cakes and jams made by the members. 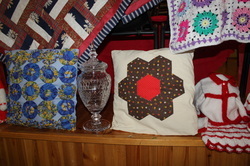 Betty Denning with her prize-winning crazy patchwork quilt. 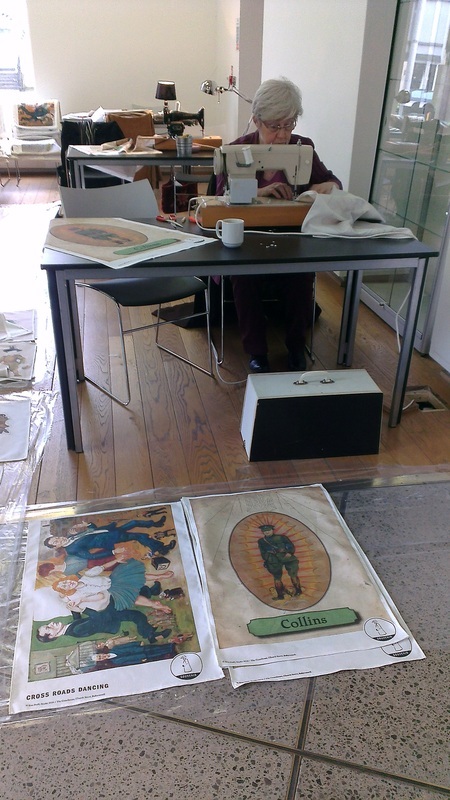 Marion Lyon & Leila Beattie hard at work! 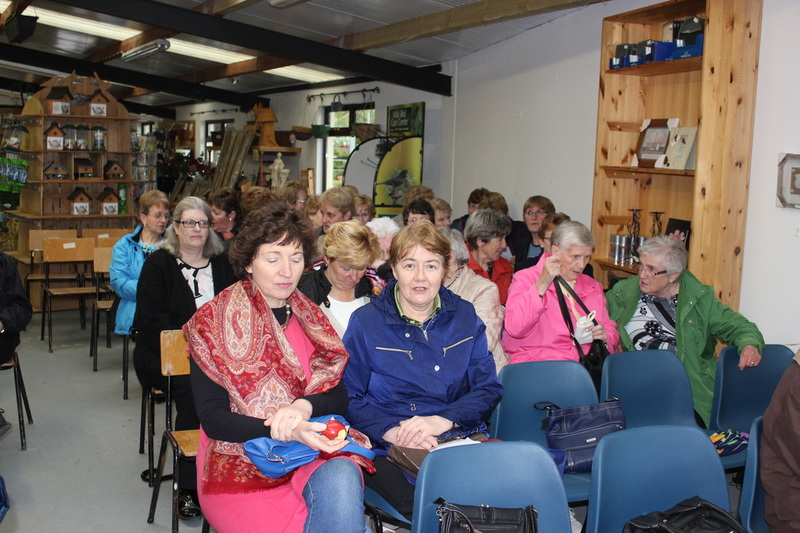 On Tuesday 16th October Women of the World from Enniskillen, Co. Fermanagh and members of Bruskey, Sheelin and Maghera ICA guilds met in the Backyard, Moynehall, Cavan. 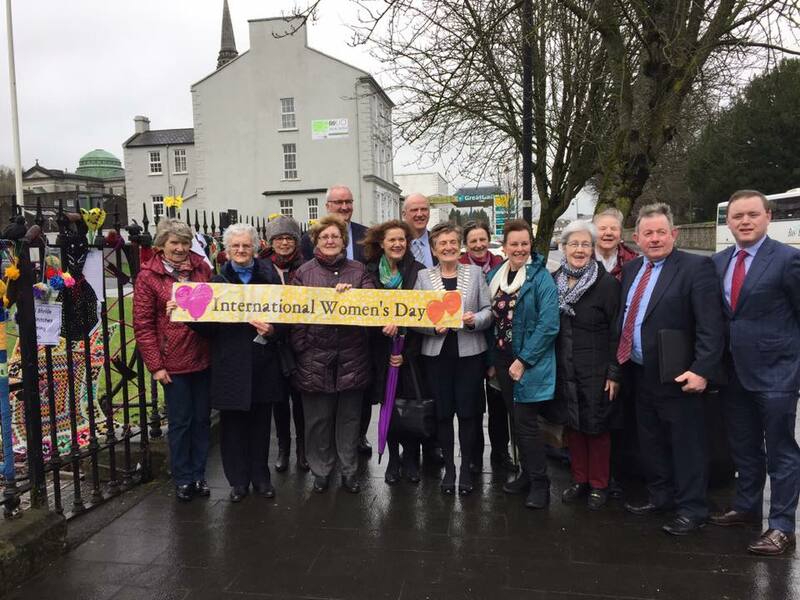 Women of the World is a worldwide organisation based in Enniskillen. 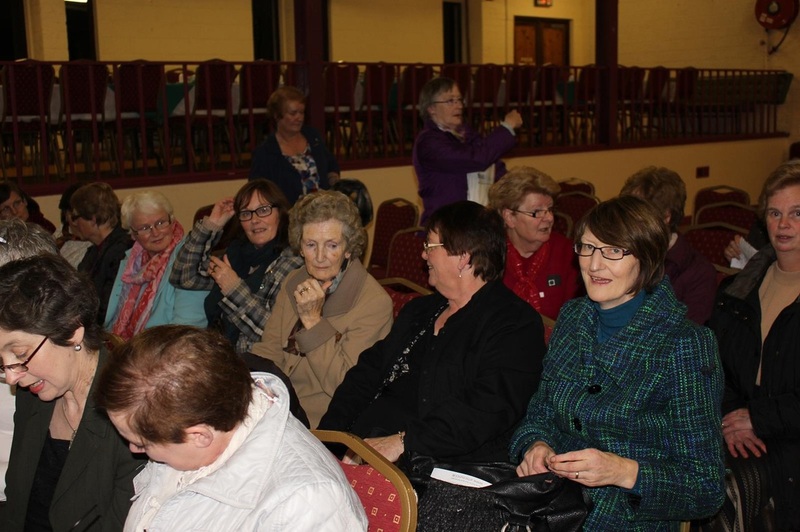 Members come from different cultures including Northern Ireland and Rebublic of Ireland and WOW has representatives all over the world. Their aim is to support and celebrate the ethnic and cultural diversity of women and to break down social barriers and reduce prejudices. 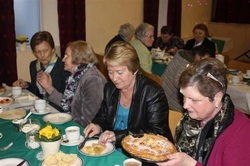 With these aims in view the purpose of this "Gathering" was to share "Fun, Friendship and Food". The fun consisted of dressing up in Indian costumes and dance orchestrated by Rani Ranteke, a native of India and two-hand dances e.g. 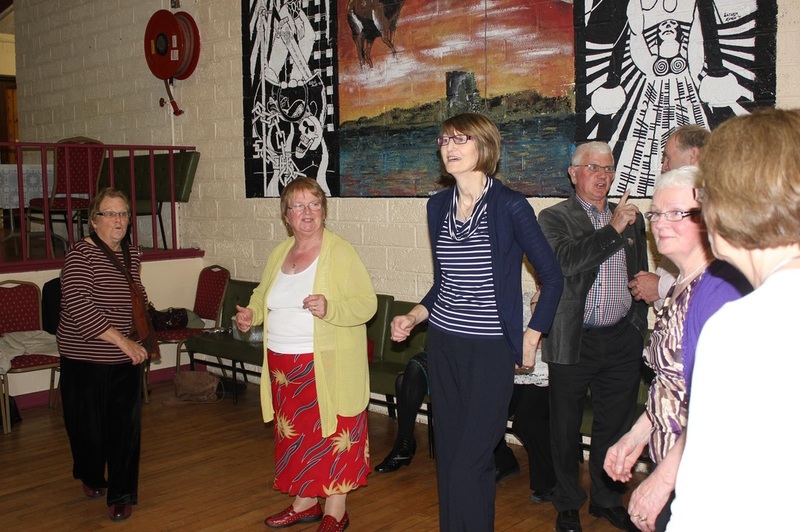 Staicin Eorna (Stack of Barley) from Ireland, German Clap Dance and Polish Shoemaker Dance led by Leila Beattie. This proved to be hilarious and earned many laughs. 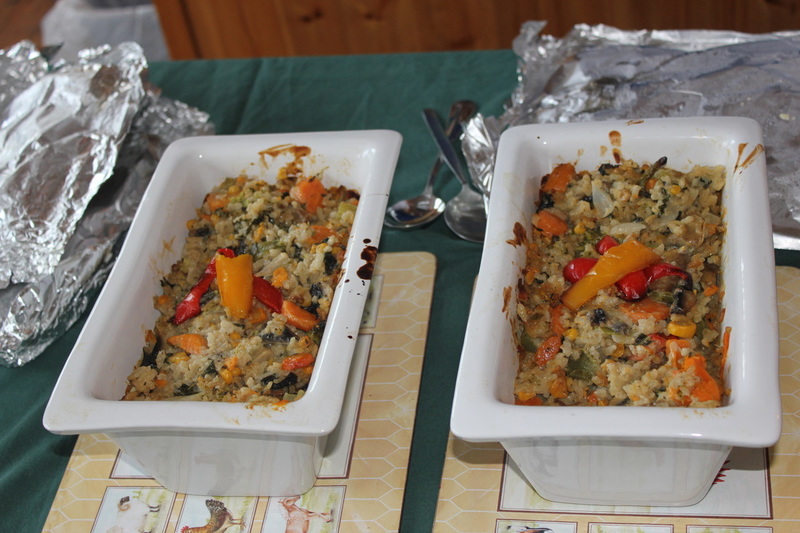 Food consisted of Indian curry, rice, pasta, currant soda bread, scones, gingerbread and apple tart. 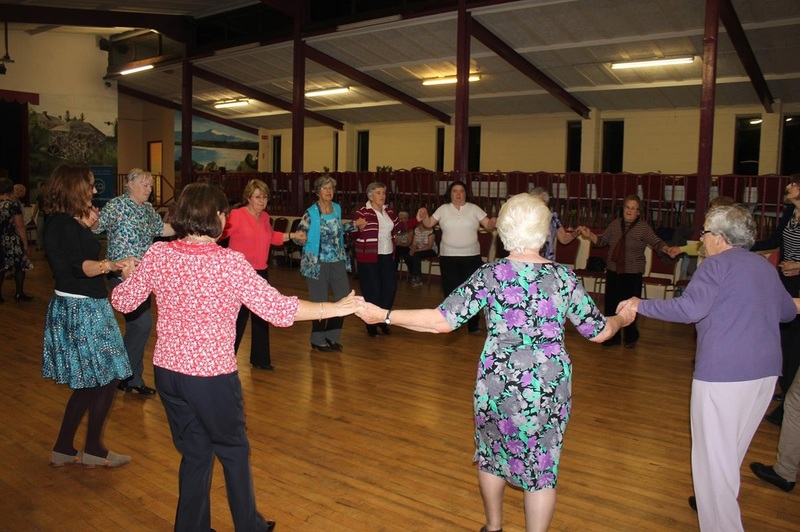 The friendship and fellowship were remarkable during both dance and meal. 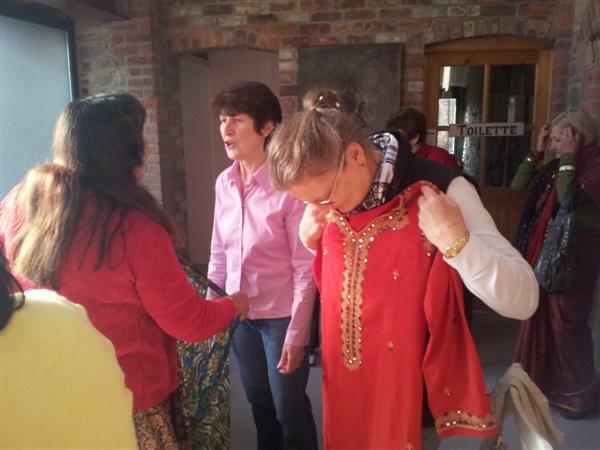 Rani and her fellow country woman, Anita invite more ICA ladies to share more with WOW in the New Year. 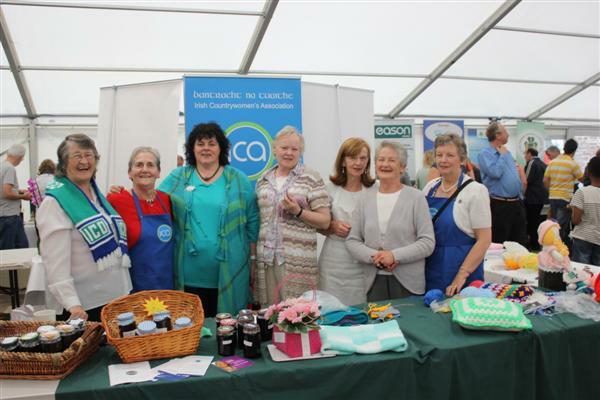 Photos below show the ICA and WOW ladies enjoying the event. 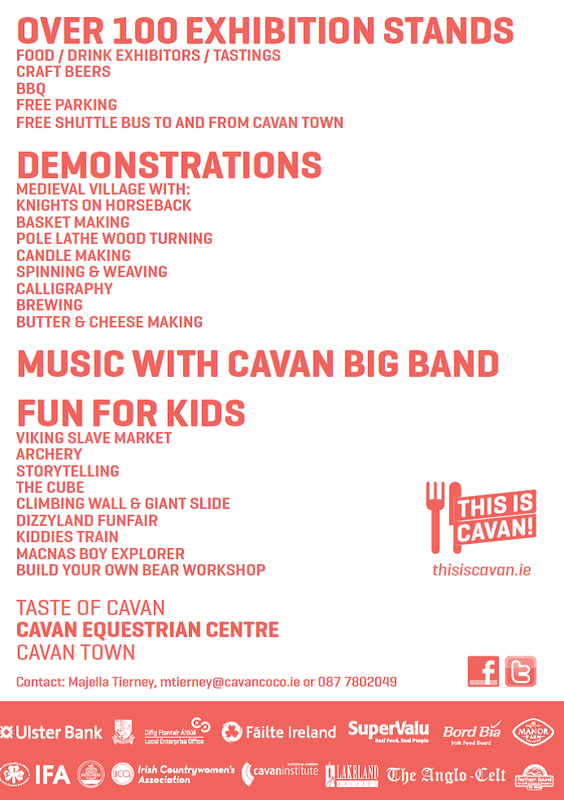 The Community Guide reports on upcoming community events in and around Cavan town. 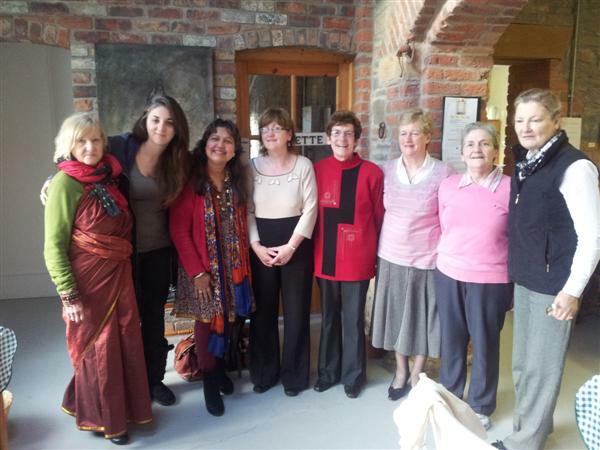 A Bollywood theme on the Community focus program this week the program features a cross border visit organised by Cavan Community Radio which took place last week at the Backyard Moynehall Cavan. 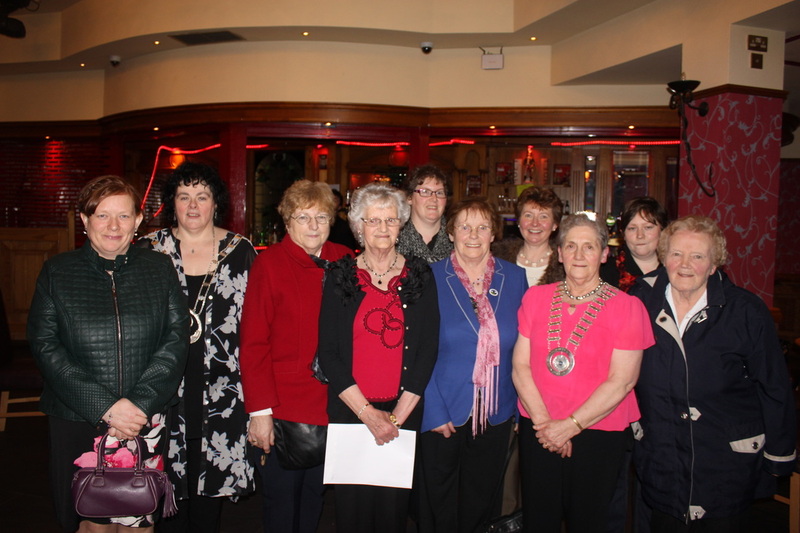 The two groups involved where members of the Bruskey I.C.A group and Women of World Enniskillen. 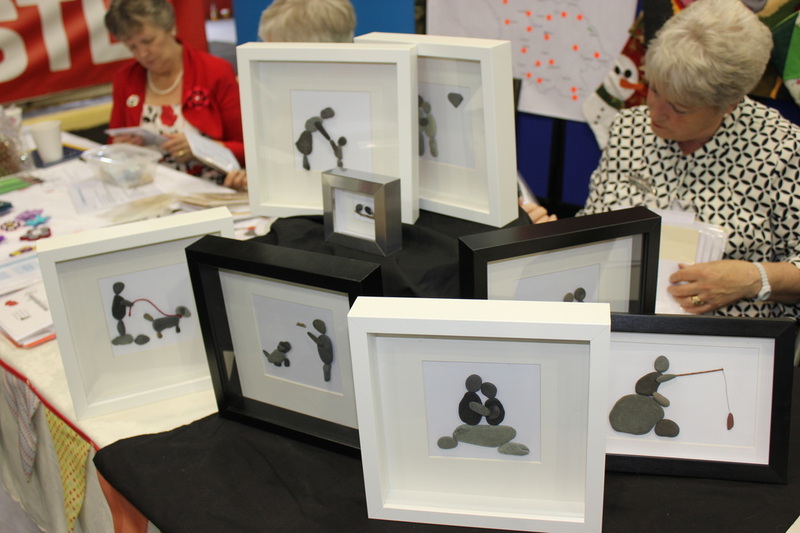 Also on the Community Focus Program we visited the Workability open morning at the Rehab Care Centre Drumalee. 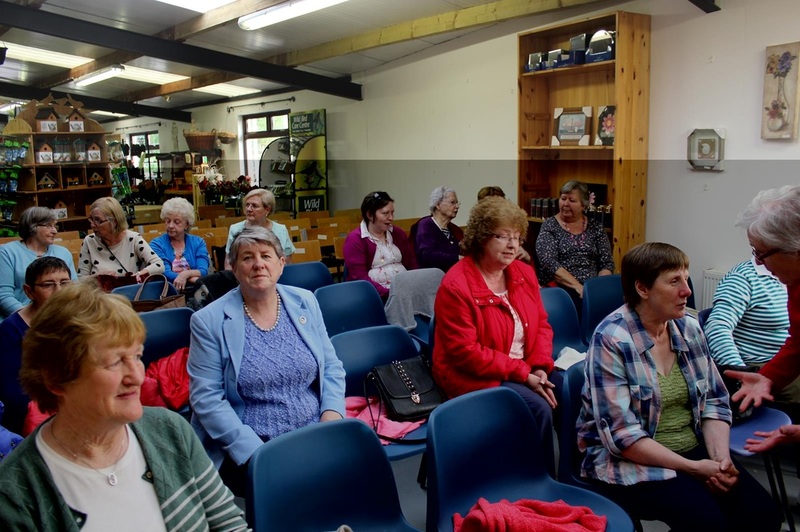 Resilience Radio features Cavan Community and Voluntary Forums Peace III funded community road show in Blacklion which is an opportunity for groups and community members to showcase their work and discuss the areas issues and solutions. 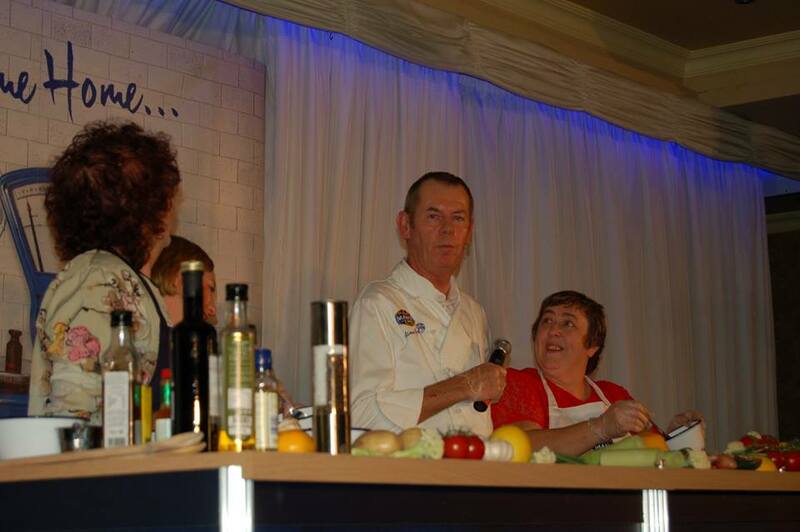 "The Taste of Cavan" Food Event is taking place in the Hotel Kilmore, Cavan on 1st November from 10.00am. 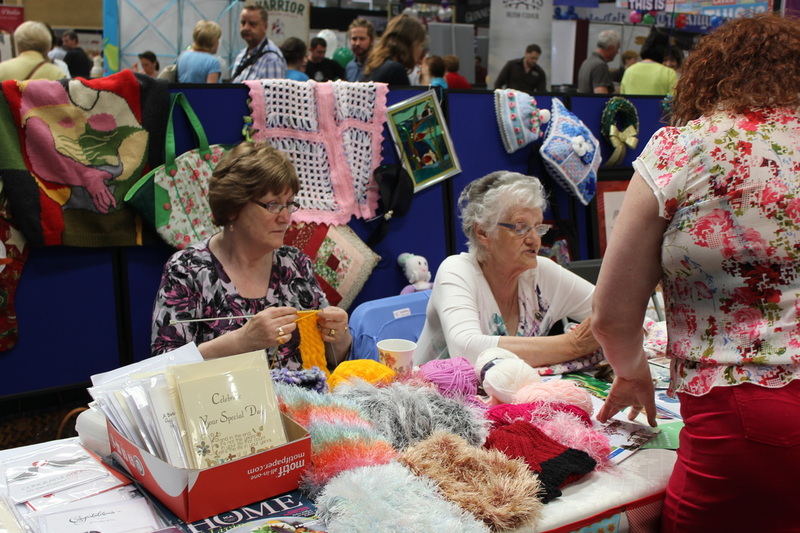 There are over 50 Exhibition Stands. 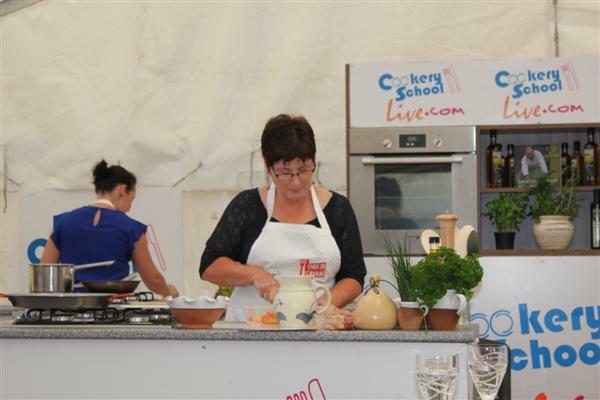 Liz Wall, National President is part of the Judging Panel for the "The Young Chef of Cavan Cook Off" between 1:30 - 4:30pm. 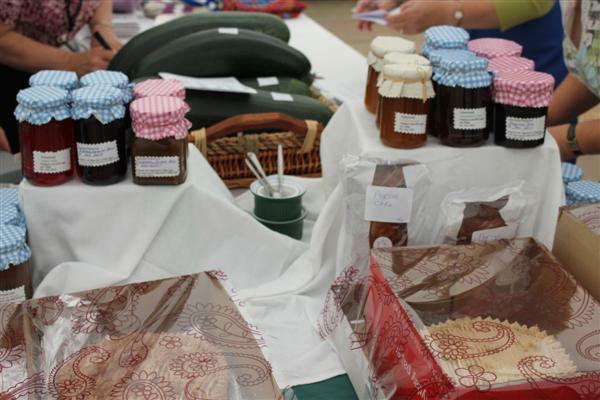 Our federation will have a display of food, arts and crafts from 2:00pm - 9.00pm. 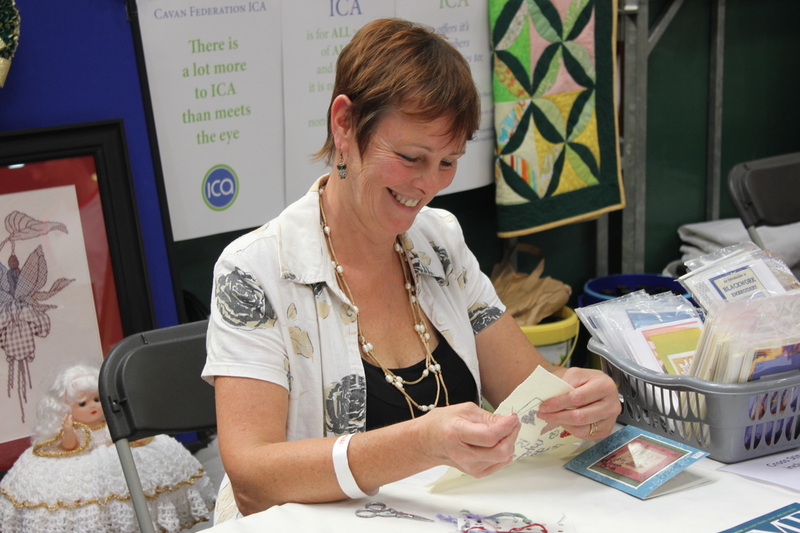 There will also be leaflets available for those wishing to learn more about ICA or are interested in joining a guild in Cavan. Entry is free. Full Programme of the Event. 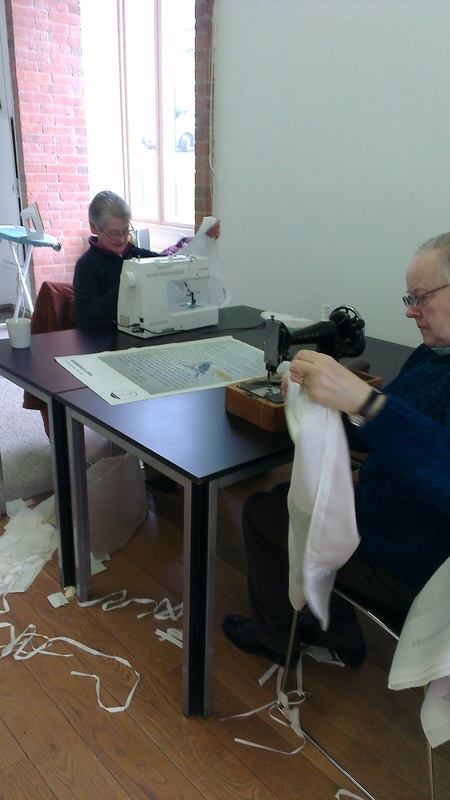 Bridge Street Centre Every Monday from 12th Nov 2012 to 10th December 2012 Time: 6:30pm – 9:30 pm Every Wednesday from 7th Nov 2012 to 5th December 2012 Time: 10:0 0 am – 1:00pm Great opportunity to try a new skill ‘One of my joys is to enable people of all ages to find their voice and tell their stories – and have these stories heard by others’. 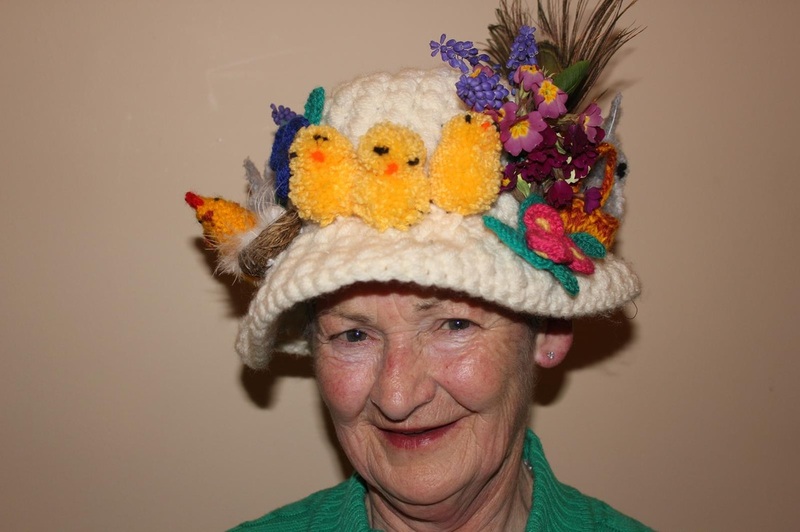 Susie Minto Workshop Facilitator Further information contact Ann O’Reilly, Project Co-ordinator, Culture Cavan on 049 4378629 or email annoreilly@cavancoco.ie or on www.cavanarts.ie. 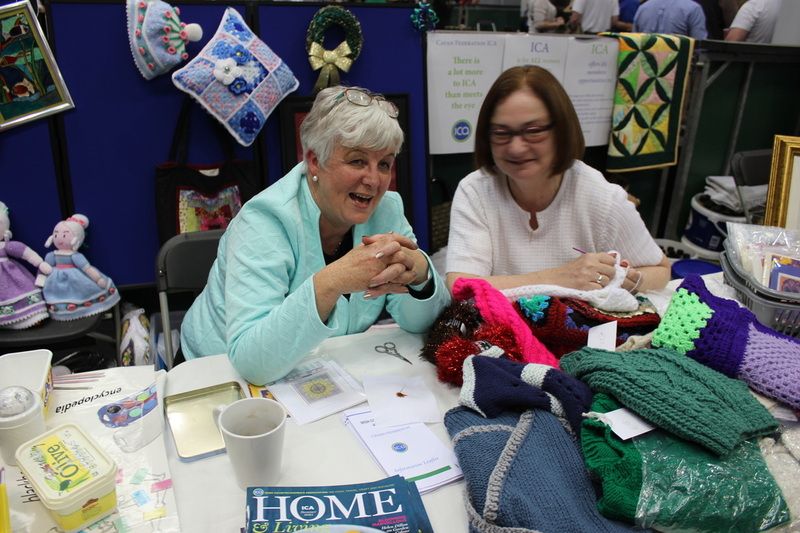 At the federatin meeting on 26th September a decision was taken to adopt the Older and Bolder Charter “Make Home Work” which is the right to age well at home, the charter hopes to learn from the past and improve the future. 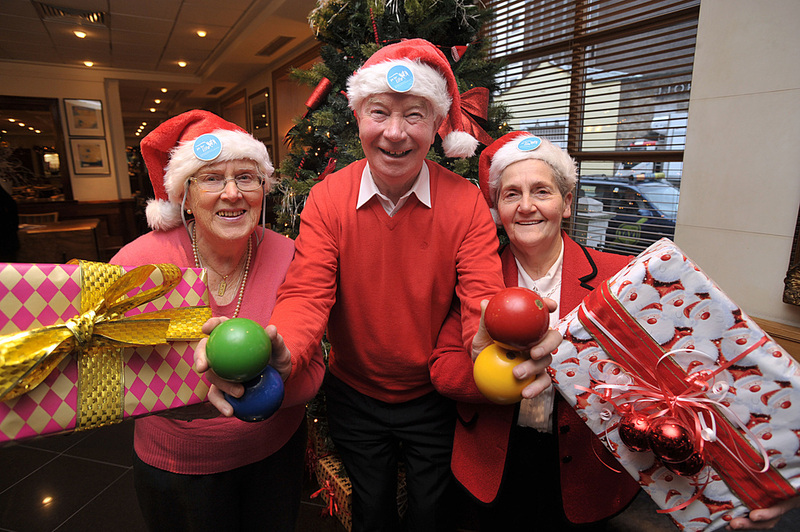 Please have a look at the website www.olderandbolder.ie where you will see the charter and more information about the campaign. You can participate in the campaign by signing the petition that you will see on their website. 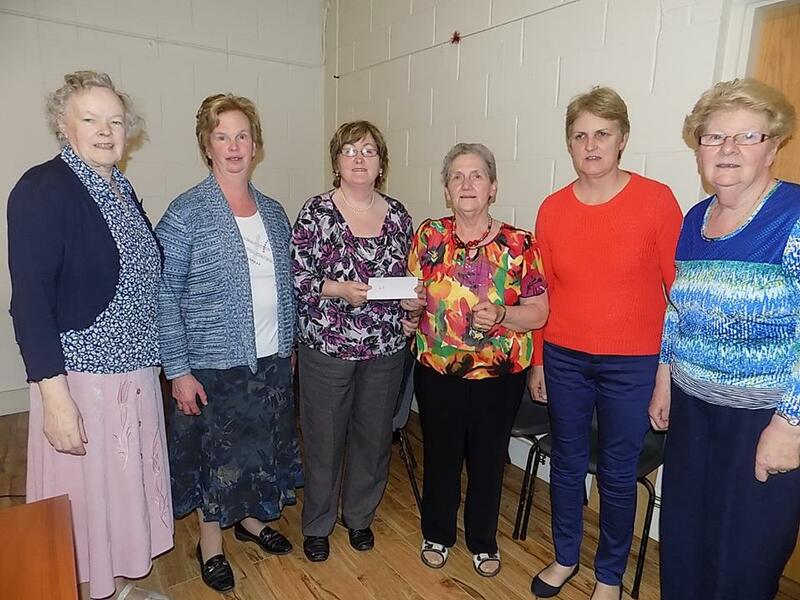 A cheque for €4107.50 was presented to Jimmy O'Donnell Cancer Homecare at a meeting of Cavan Federation in Killeshandra on Wednesday 26th September. The money was raised from a Charity Walk. We want to hear from all would be writers…have you a poem or new song you would like to express in public? 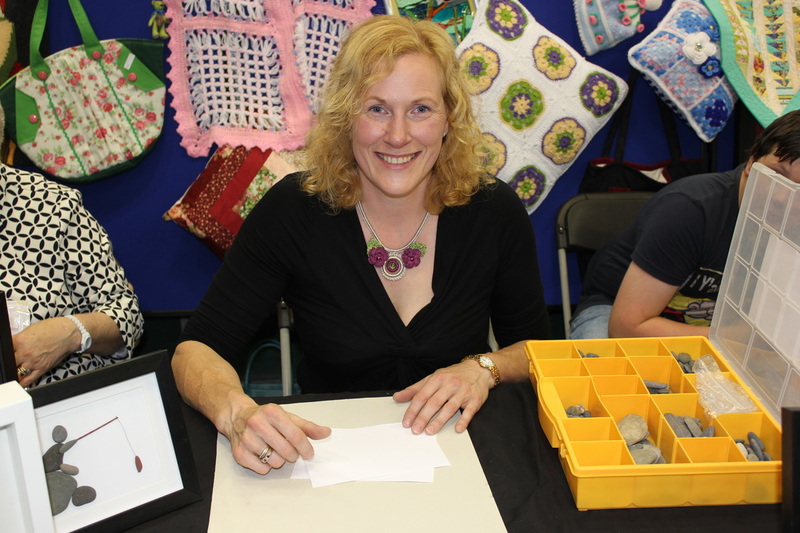 Heather Brett, poet and Windows editor will host an open mic session from between 1pm and 2pm for all who have written and want to engage with an audience. She will also read her own work. As an editor she wants to hear new voices, if you have a new poem or song please come along and share it. Call Heather Brett 087 0534737 heatherbrett22@hotmail.com. to let her know you are coming. 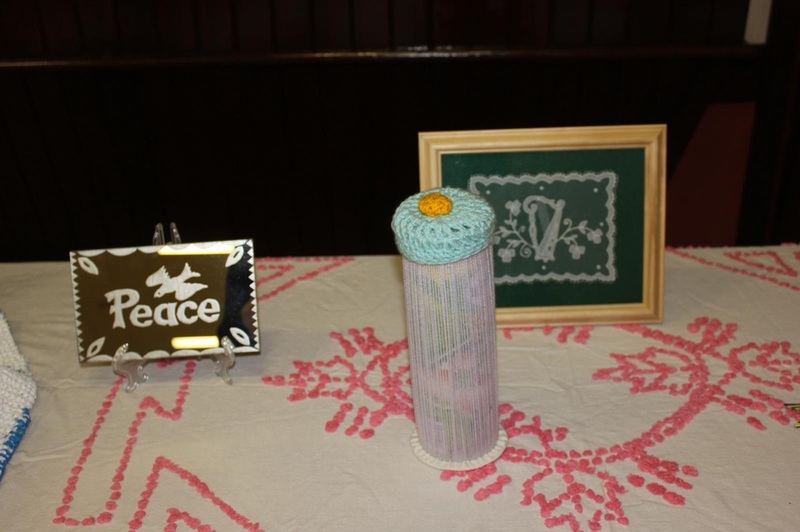 Contemporary art work and poetry banners from the Connecting People - A Cross Border Peace Initiative from students in Cavan and Northern Ireland commissioned by Cavan County Museum will be on display. 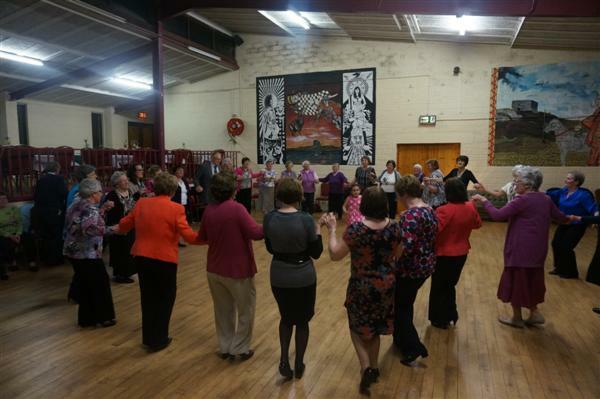 A dance workshop for Physical Activity Leaders was held in Corcaghan Community Centre on Thursday 20th September from 10:00 am to 4:00pm. 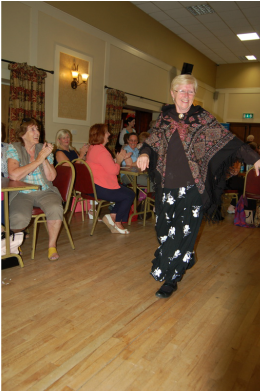 The tutors demonstrated a number of different dance excercises and everyone received a free music DVD and Instruction Sheet. 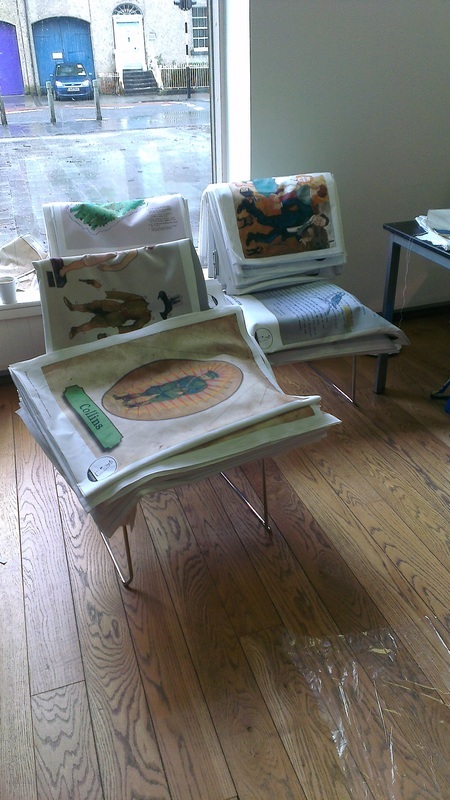 It was a most enjoyable learning experience as well as a fun day. 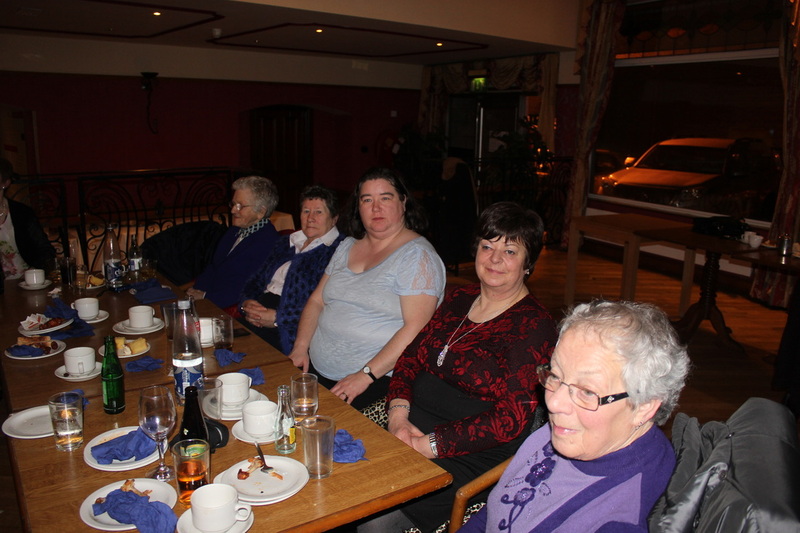 It was attended by members of Active Retirement Groups and ICA guilds from Cavan and Monaghan. The Heritage Council is pleased to announce that the Co. Cavan leg of its 'Heritage as an Engine of Economic Growth', workshop series. 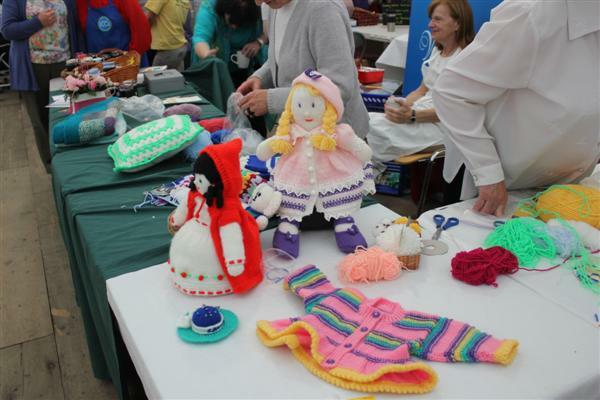 The event will take place in the Cavan County Museum, Ballyjamesduff, Co. Cavan on Friday 21st September, from 9.00am to 1.30pm. 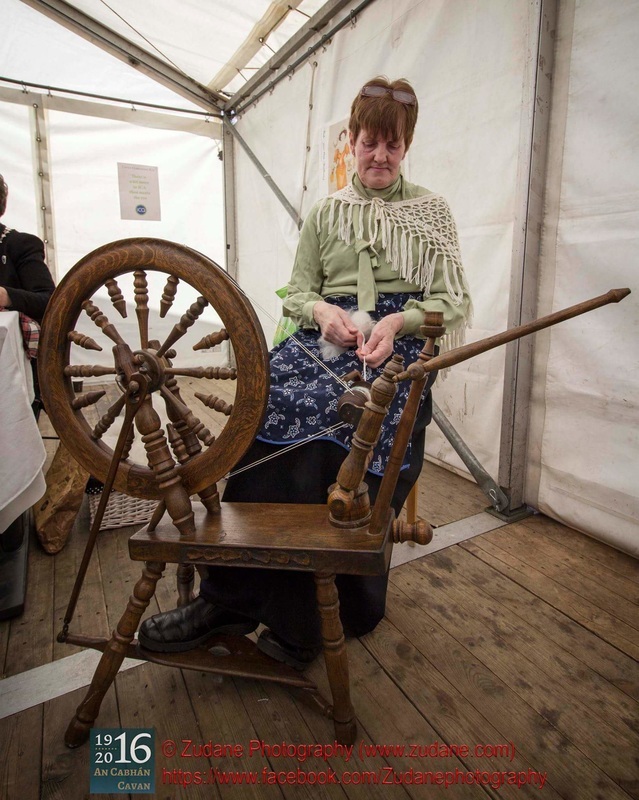 This workshop will bring together heritage practitioners, business people, entrepreneurs and State agencies to explore the potential of the heritage sector as a driver of economic growth and development in Cavan. 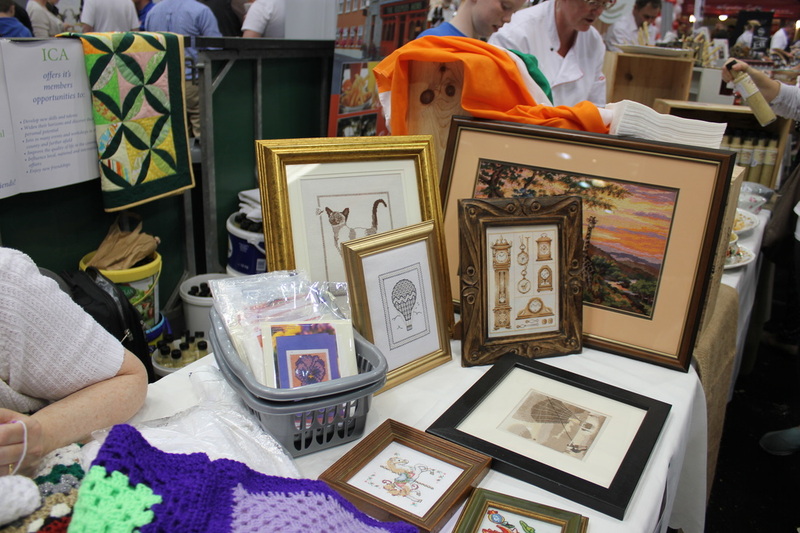 Showcasing some of the many local enterprises operating in the Irish heritage sector, the event will generate an awareness of the opportunities for enterprise and business development based on Cavan’s unique heritage. 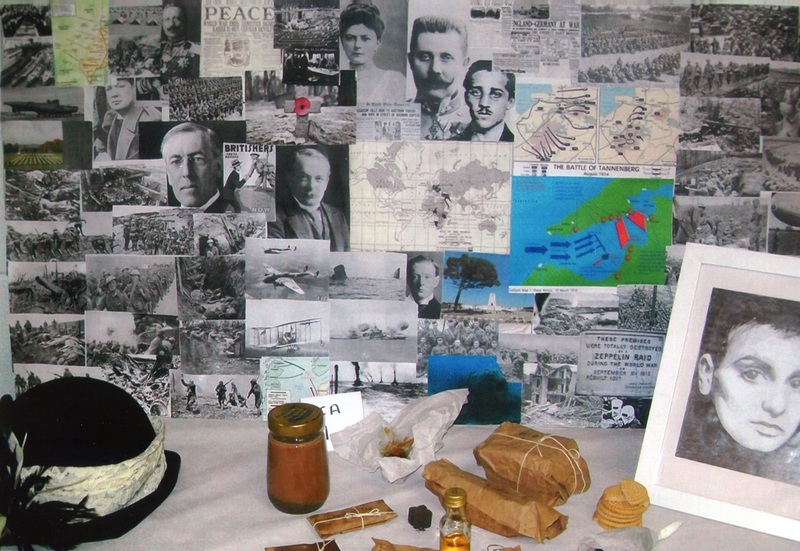 The Cavan workshop will encourage open participation among those attending through the use of an ‘Think In’ which will focus on identifying circumstances for future development within the local heritage sector in the county. 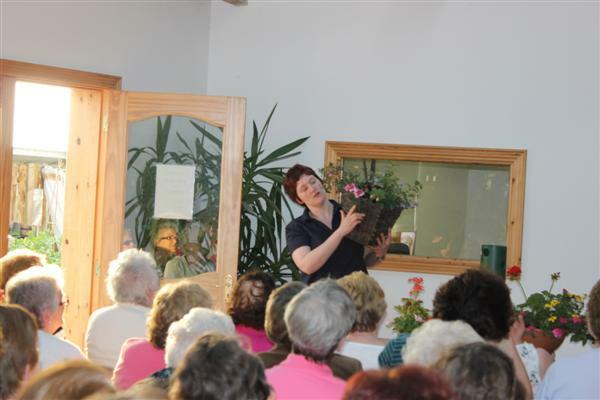 Fiona Duffy local historian / Cavan library services who whould be happy to give a guided tour of the new Green Lough Eco Park, giving information on the folklore, flora and fauna of the area, during Social Inclusion Week 22-28th Oct. 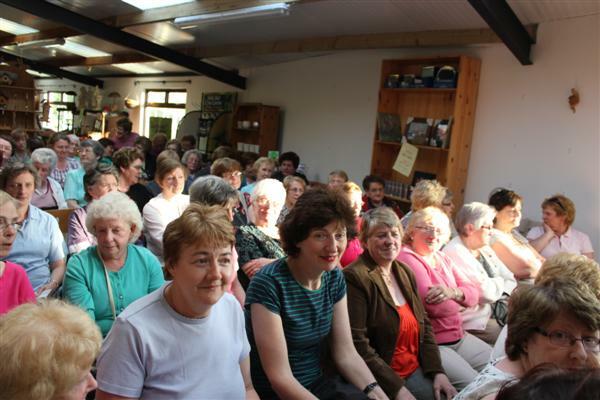 If you have a few members interested you can call Fiona on 087 1517931 or Marion Lyon on 046 9245580 so that we can get a group together. 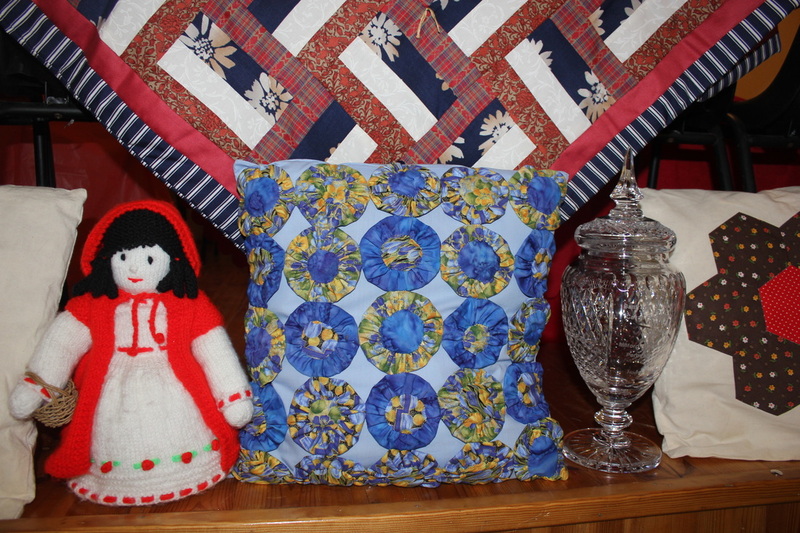 This would be something members and their children or grandchildren might enjoy. 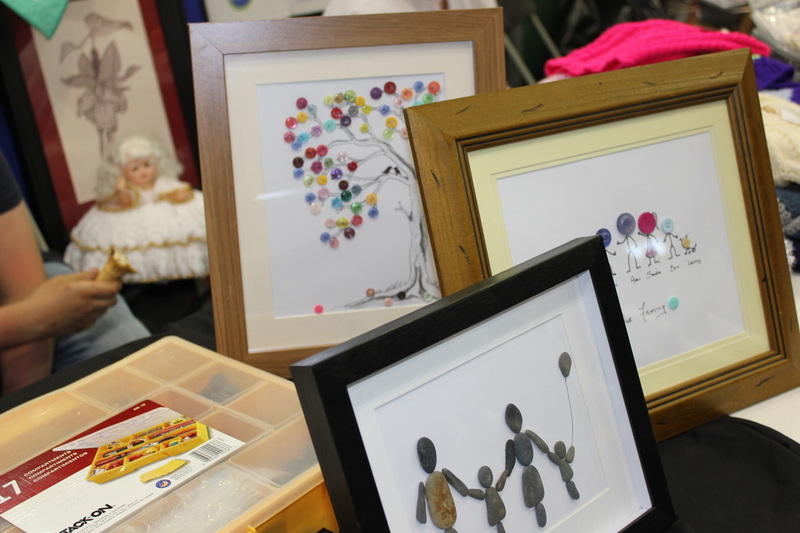 Cavan Autism Parents Support (CAPS) group is holding a 'Preparation Day' for Craft Fair on Sat 17 November in the County Museum, Ballyjamesduff, from 12 to 4 pm. 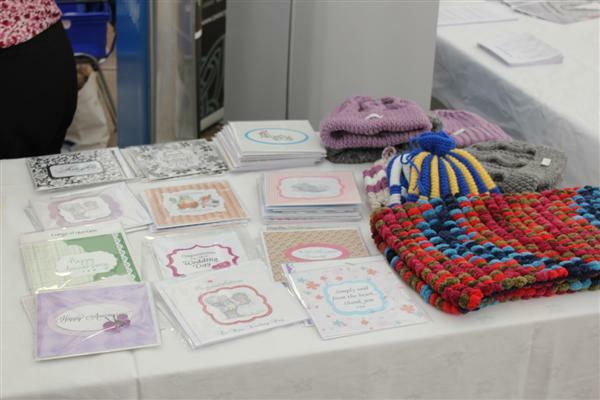 The young people, who have autism, will be packing Christmas cards for sale and making Christmas logs and would value help on the day. The group would like to have an intergenerational slant to this day and are looking for older adults to volunteer to help out on the day. If you are interested in helping please contact Ada at 049 433 5235. 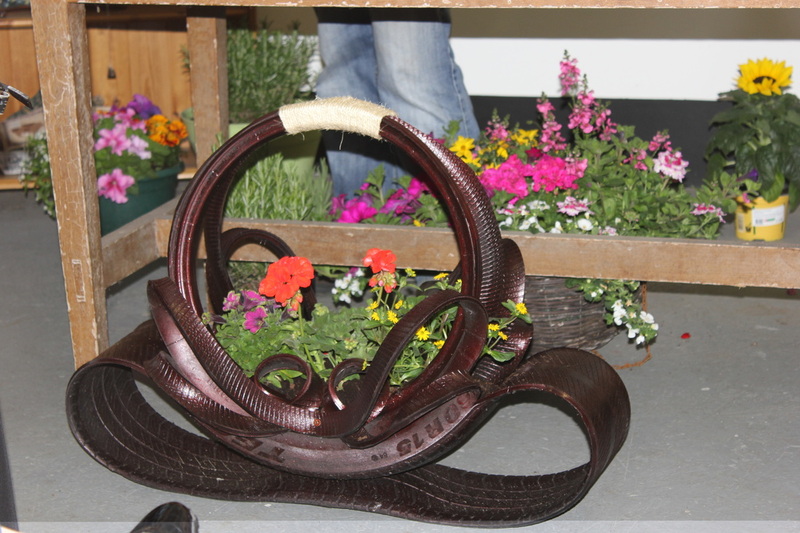 Corlough Guild 3rd in the Skills of the Year Competition at Virginia Show on Wednesday 22nd August. 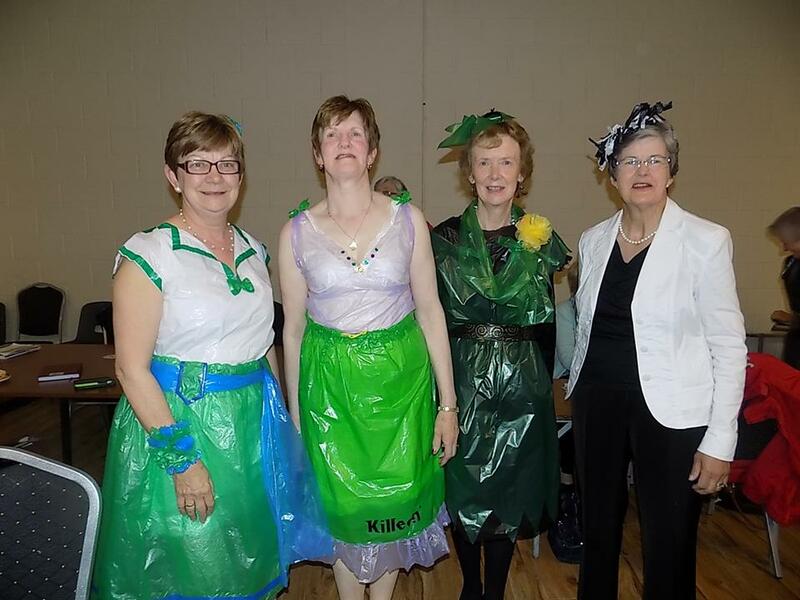 President Leila Beatty (second from left) with May Lynch, Chris Murray, Rose Connell & Tess Brady - Mountnugent Guild members before the start of the parade in Cavan. 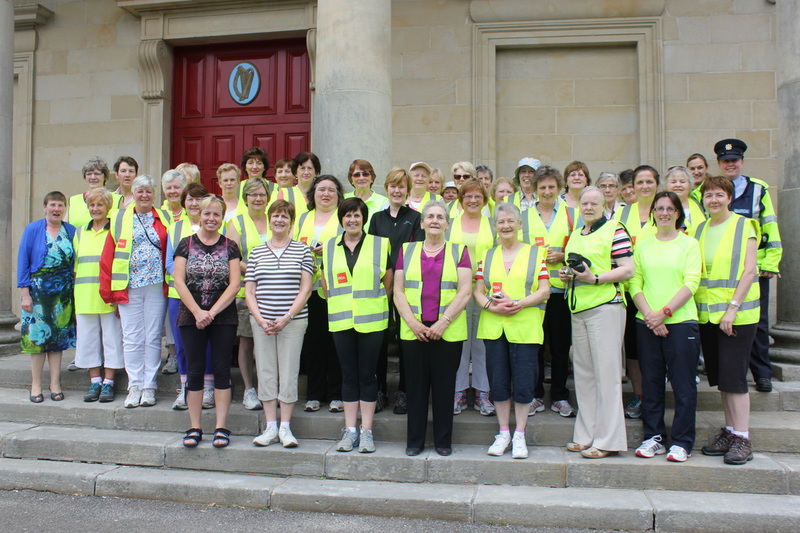 Pictured at the start of the walk from the Courthouse in Cavan on Sunday 24th June. 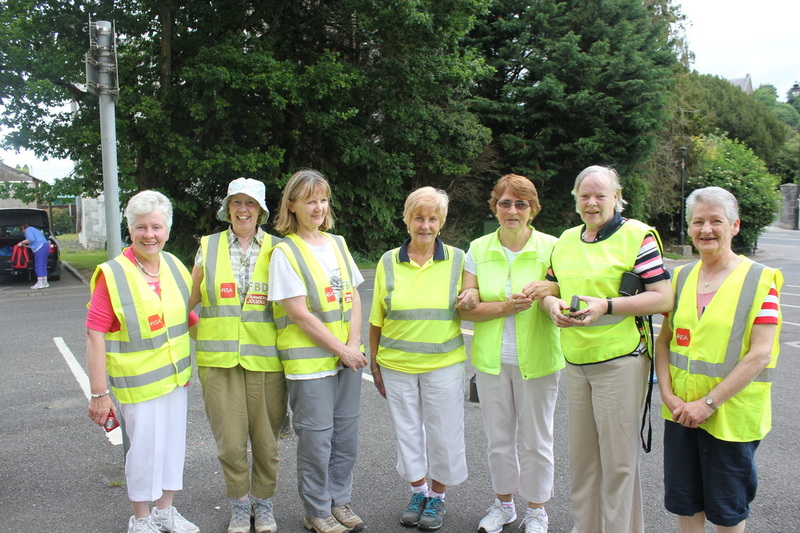 Over fifty members took part and enjoyed this annual fun walk for charity. Thank you to everyone who participated and to everyone who subscribed to funds for Cancer Homecare. All Sponsorship Cards and money to be returned as soon as possible. 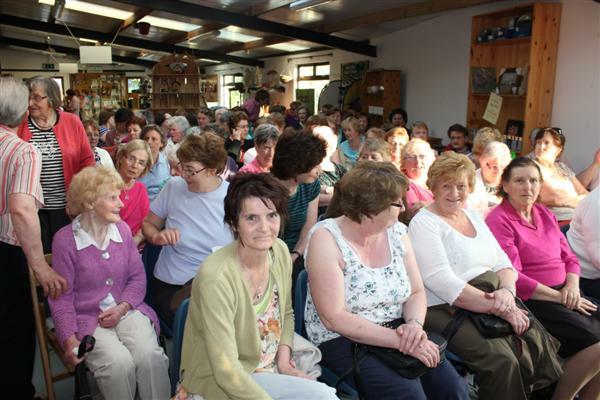 A cheque will be presented to Jimmy O'Donnell - Cancer Homecare at Federation Meeting in Killeshandra on 26th September. Washer woman demonstration: Hand washing 1950s style.